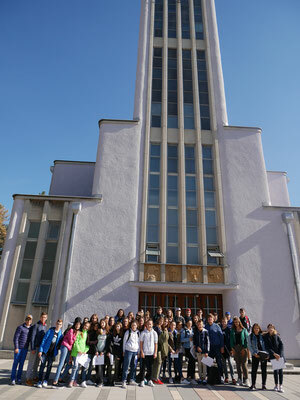 Italian students & LTTA in Partizanske, Slovacchia - Site de proerasmus ! 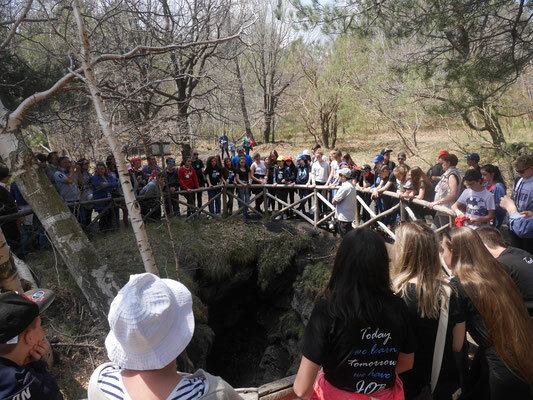 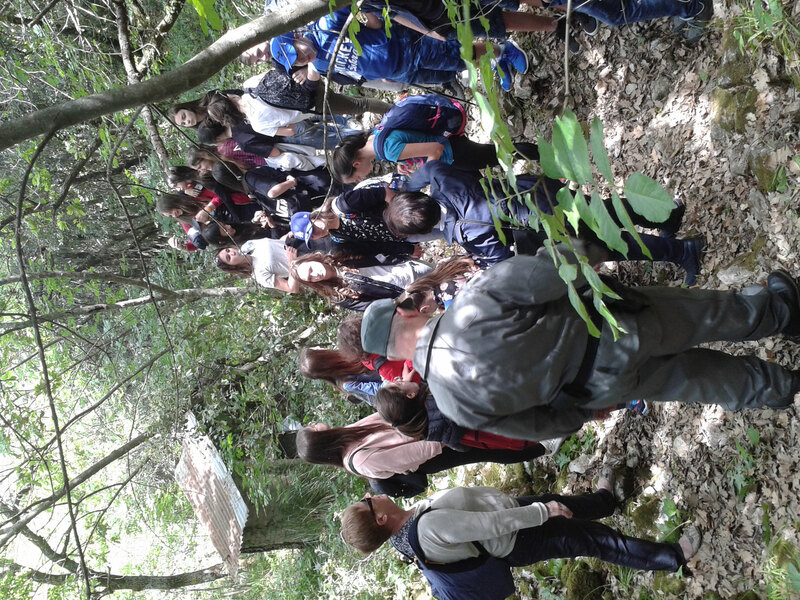 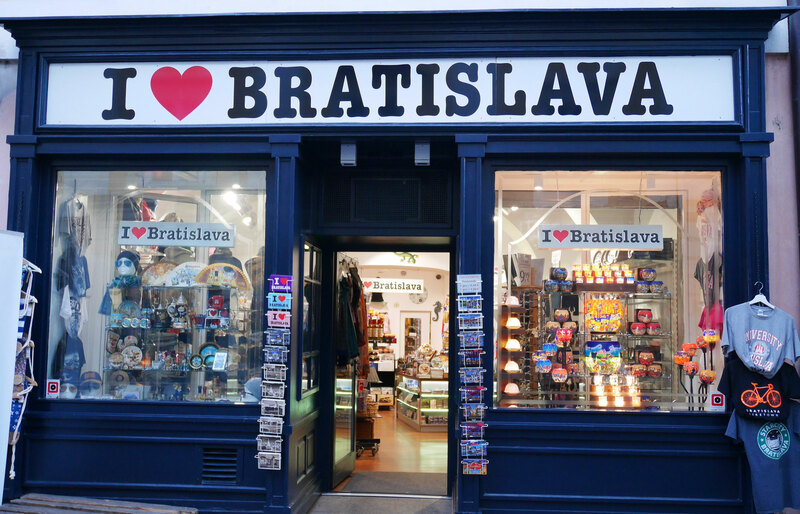 Erasmus+ students had a fantastic experience in Partizanske. 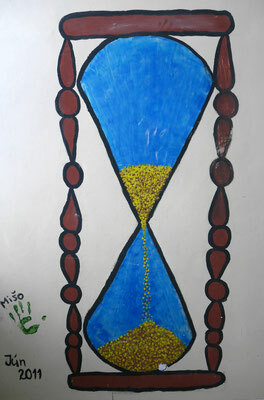 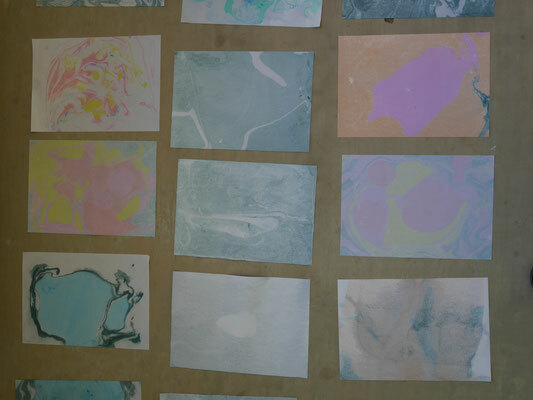 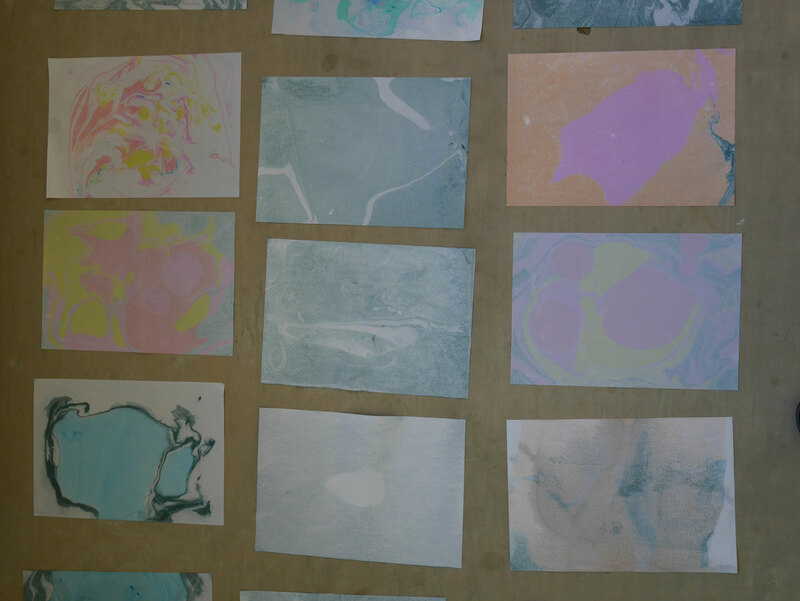 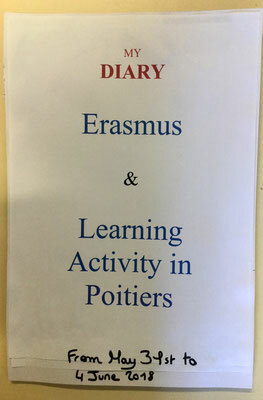 The learning activity our students had there was very interesting. 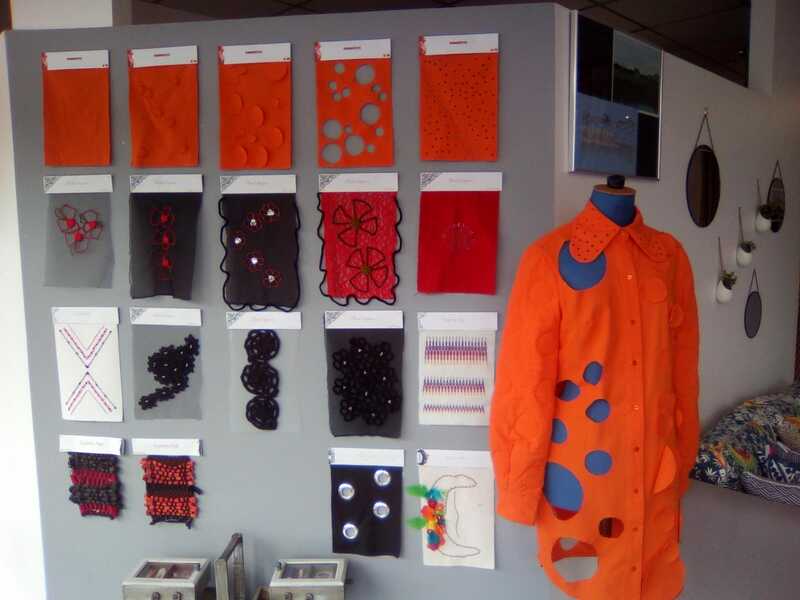 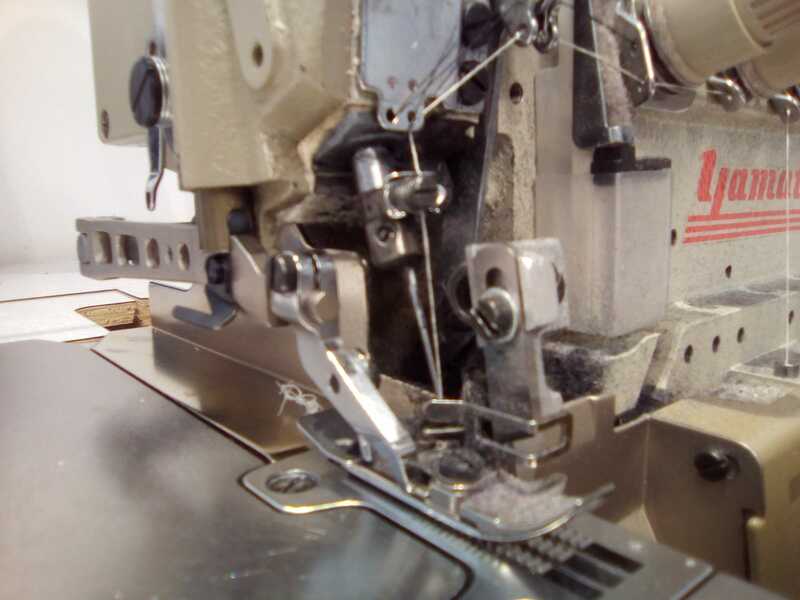 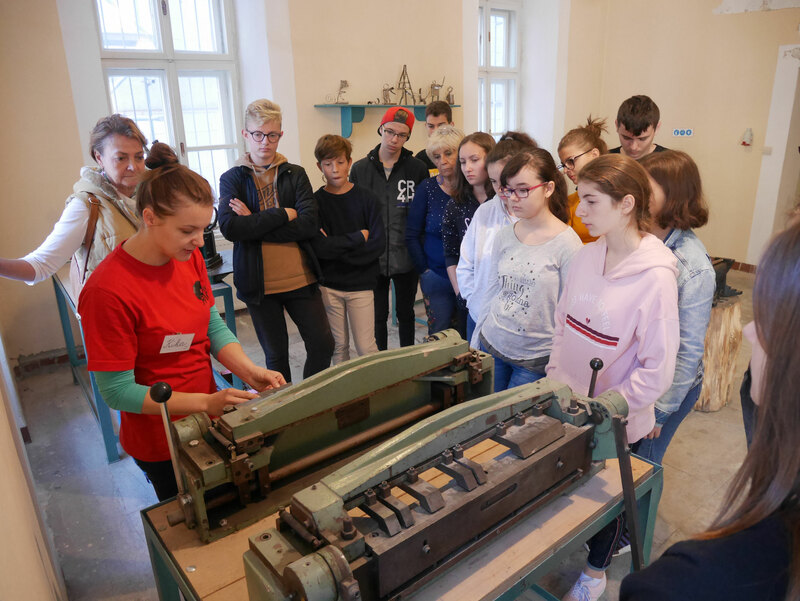 They could have practical demonstrations of different types of jobs in the various firms and during the workshops organised at school. 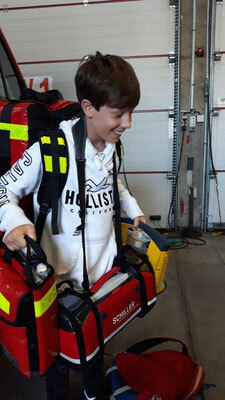 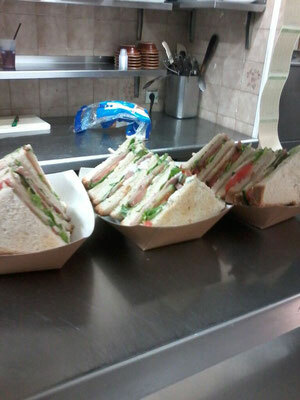 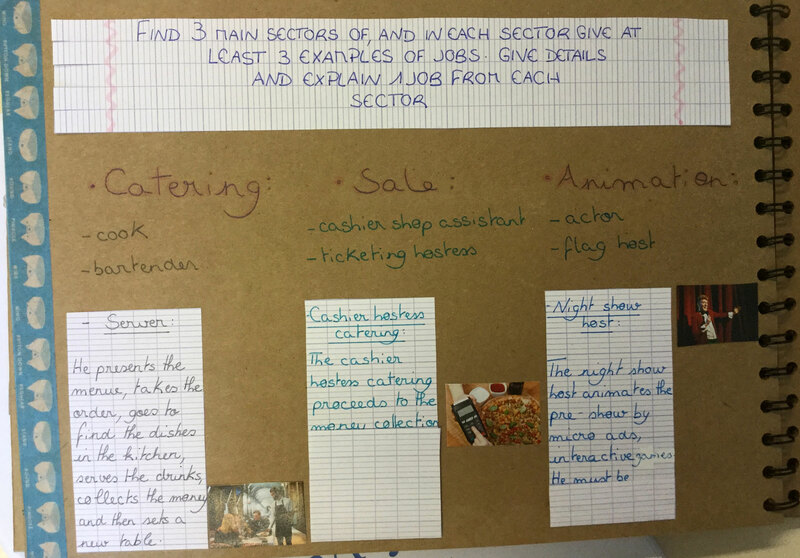 Students were happy to try and help in the work and at the same time they had great tips about the ways to do the job. Then, there was the question and answer session and a lot of the students were keen to consider the job they liked as a future career! 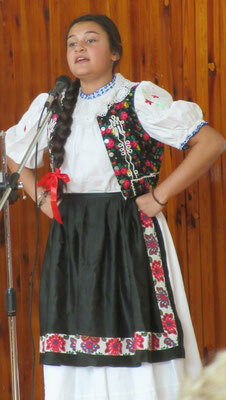 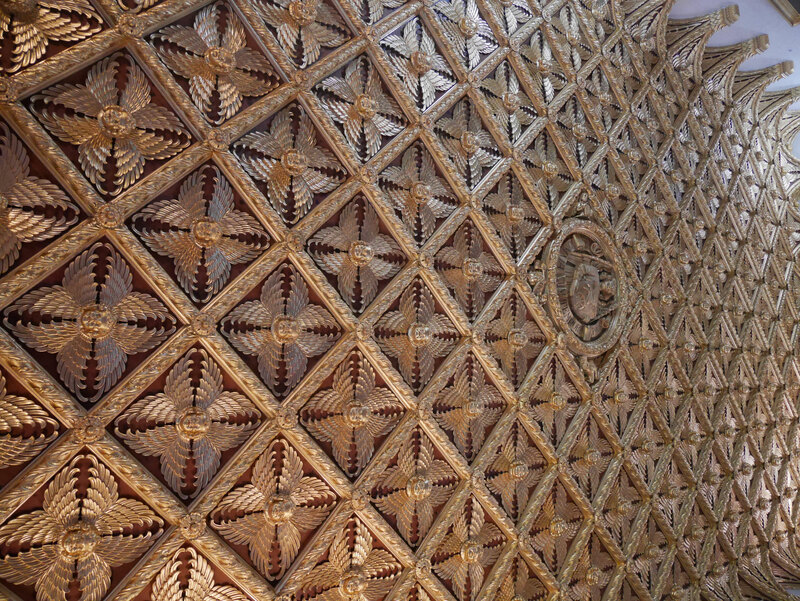 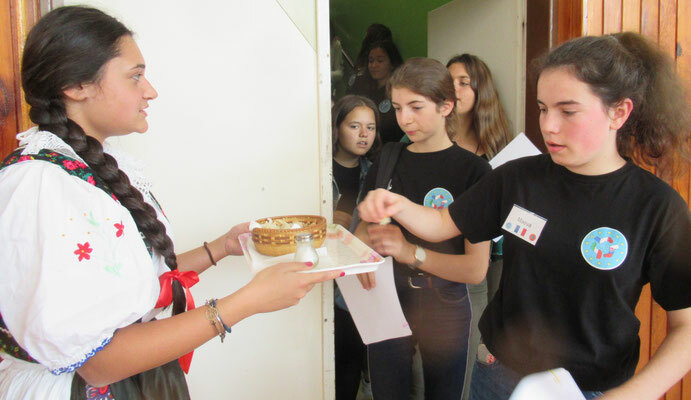 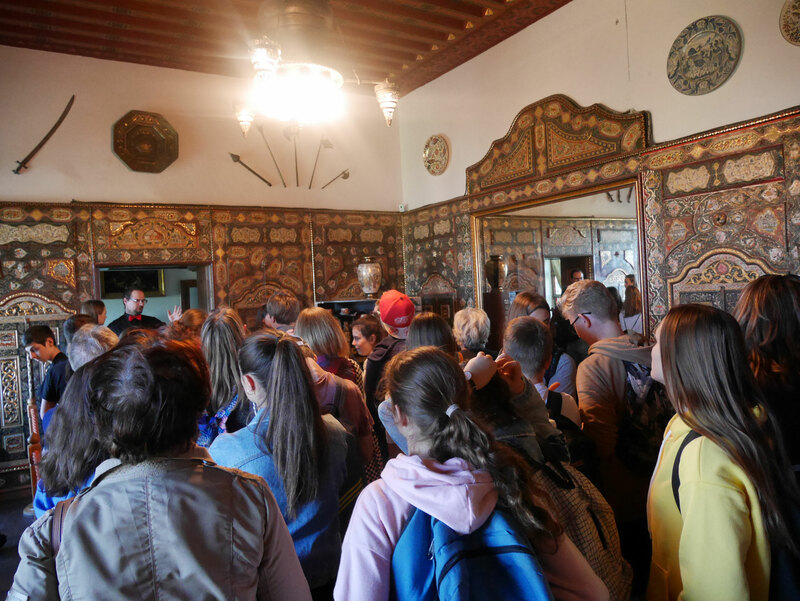 All the group learned a lot about the host country in terms of culture, customs and traditions as well. 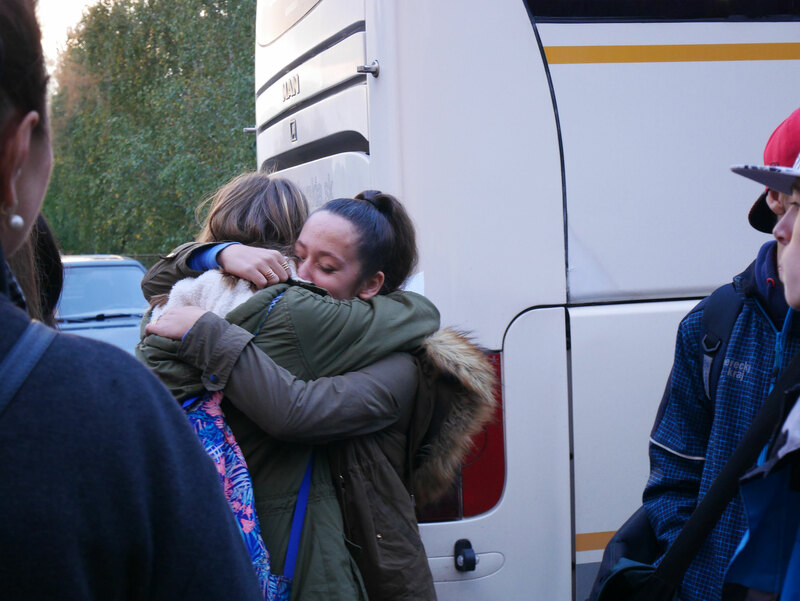 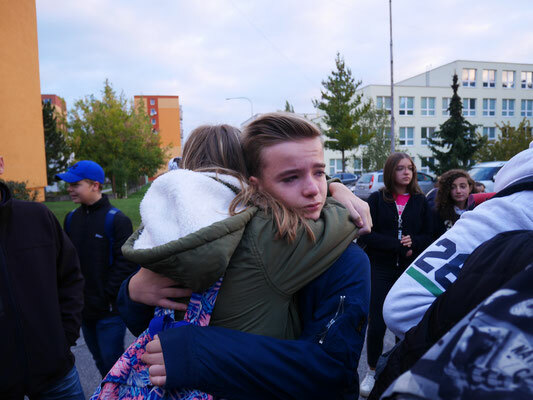 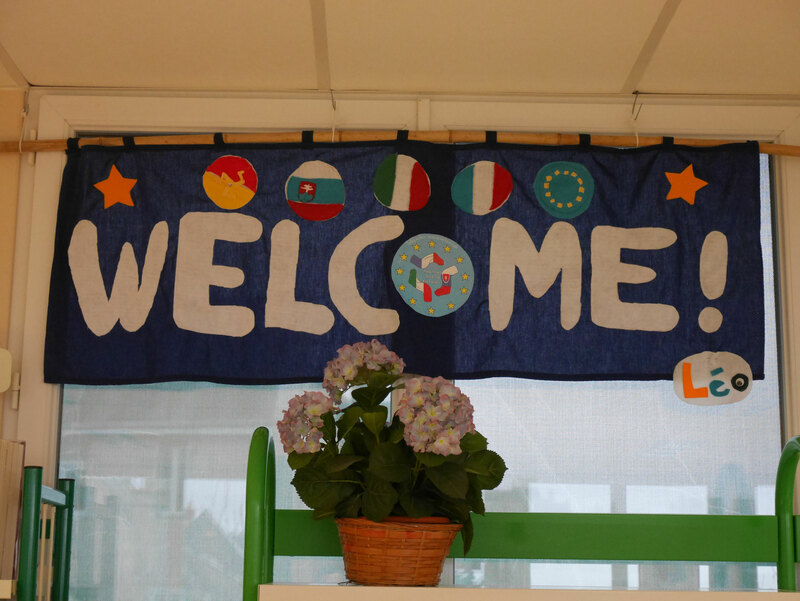 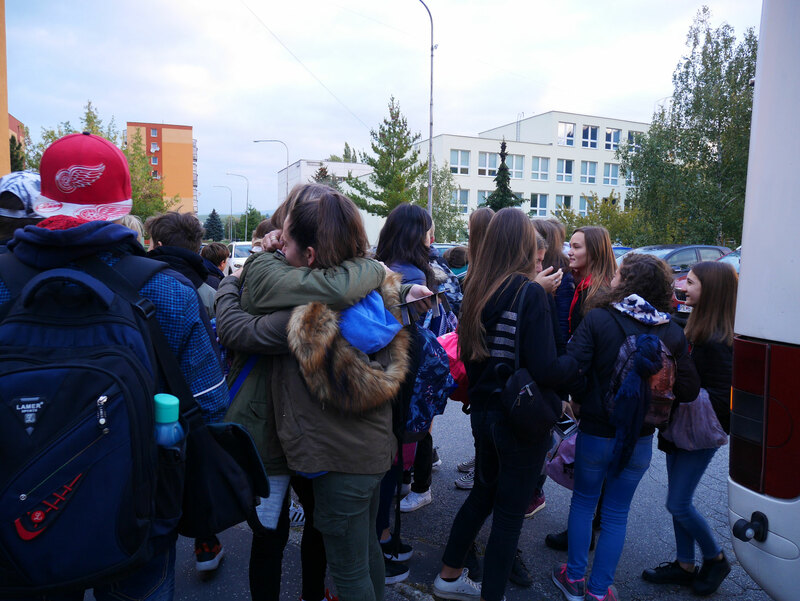 Students and teachers received a warm welcome by our partners and had a good time together. 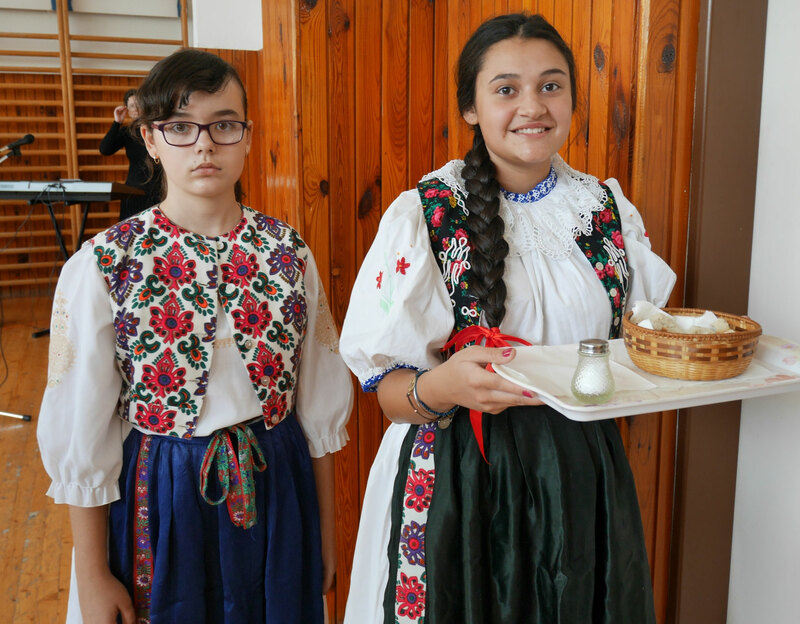 We had a traditional and warm welcome at school, pupils wearing traditional dresses offered bread, symbol of life and salt, symbol of health. 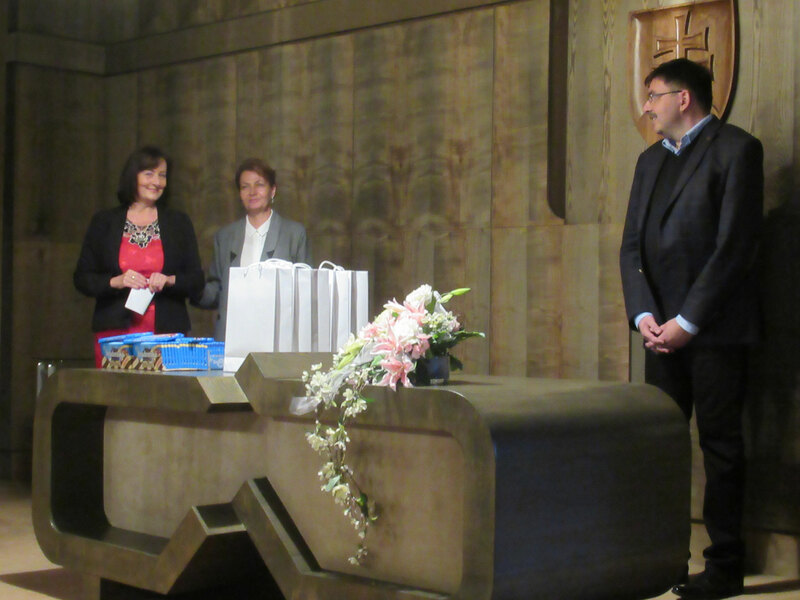 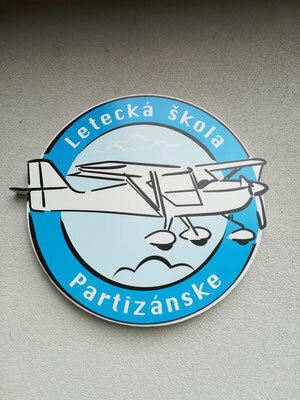 At the townhall, the Mayor explained the birth and evolution of the city of Prtizánske, founded by Bata 80 years ago. 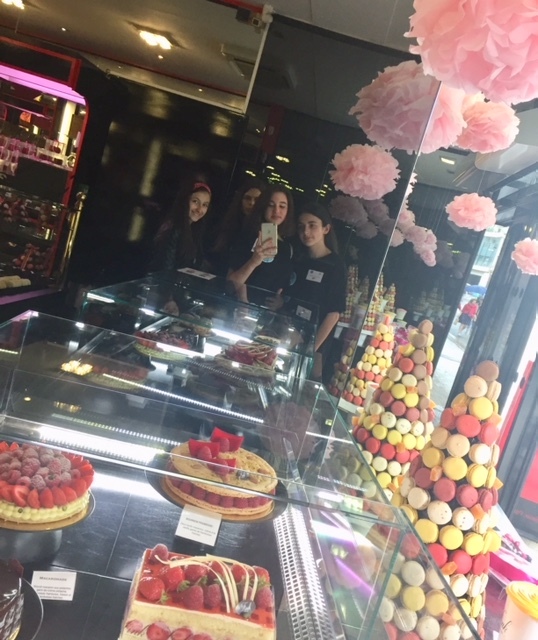 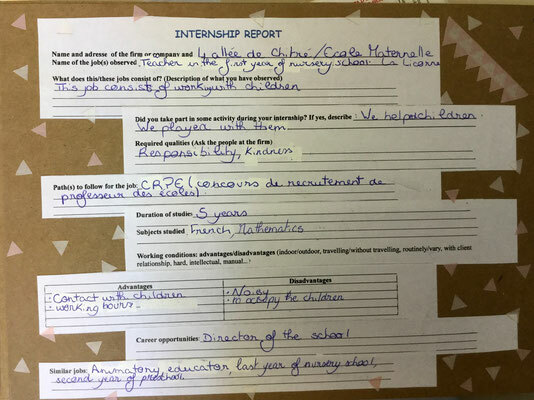 Pupils did 2 mornings of internships in international pairs, one Slovak and one French or Italian pupil, in several different firms and companies. 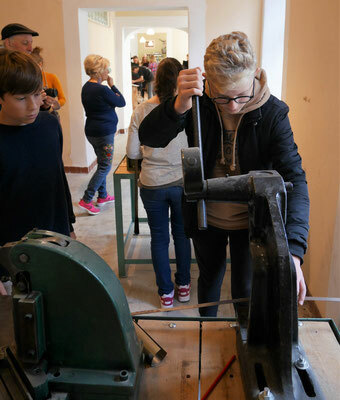 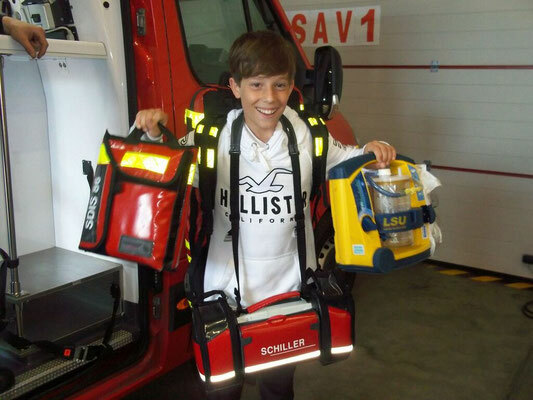 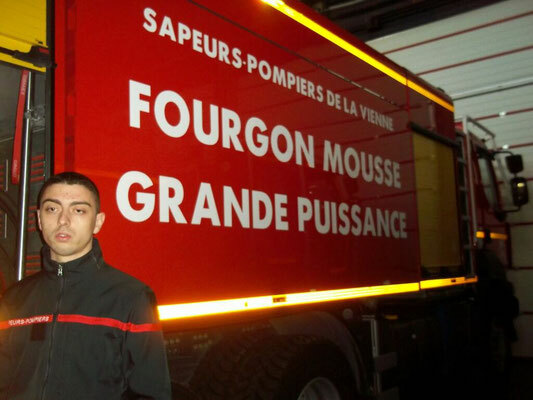 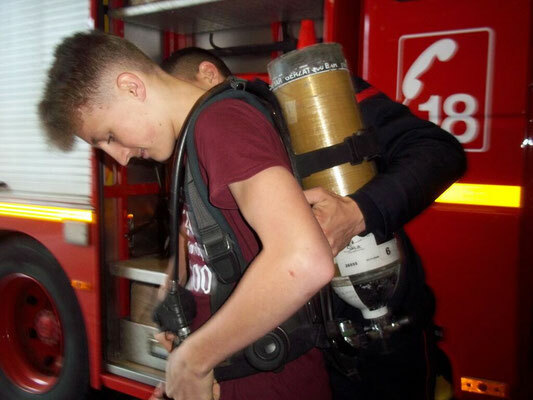 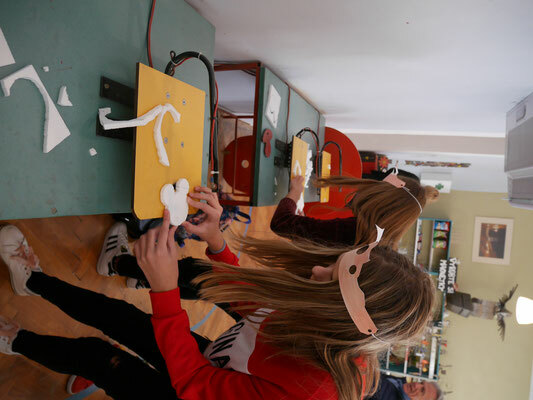 They also had practical workshops with 9 vocational schools, to discover several kinds of jobs. 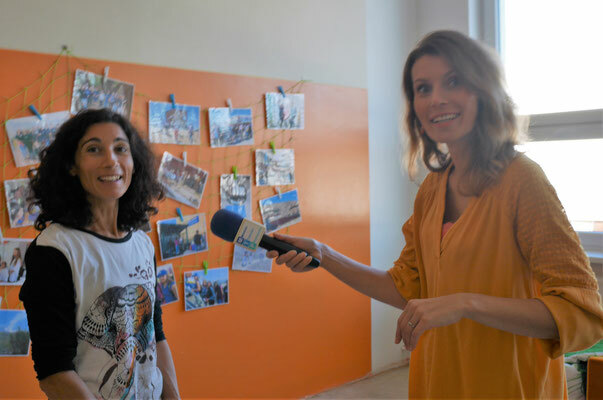 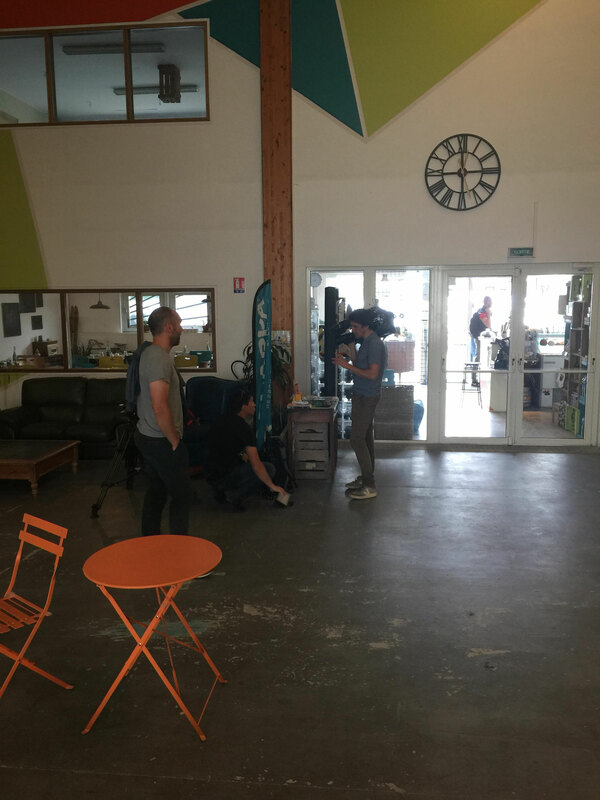 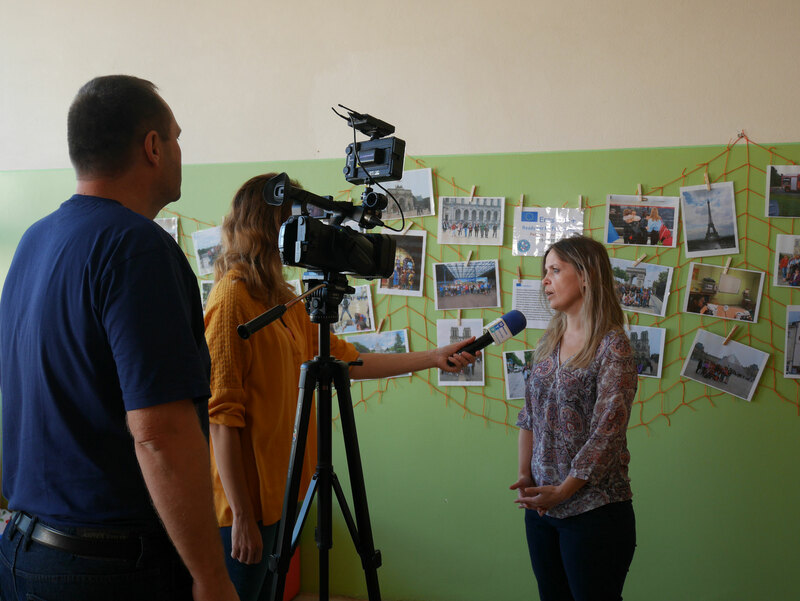 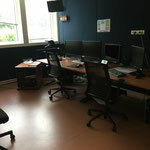 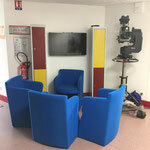 Coordinators were interviewed by local television in order to let people know about our project. 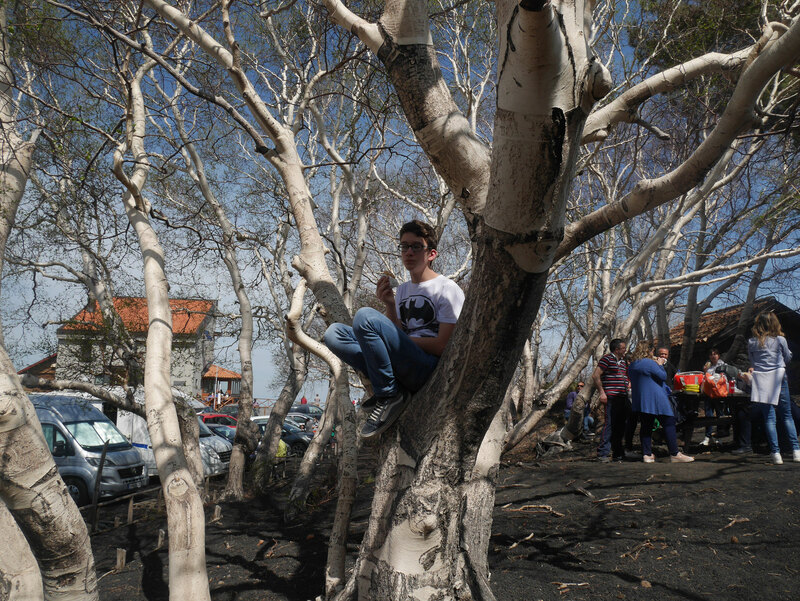 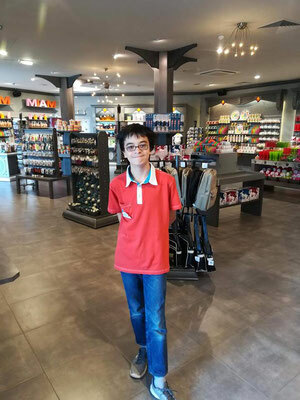 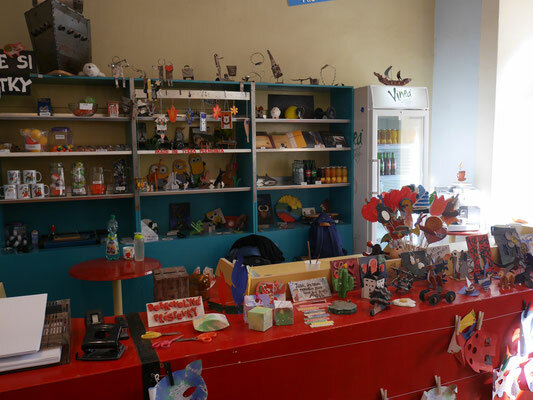 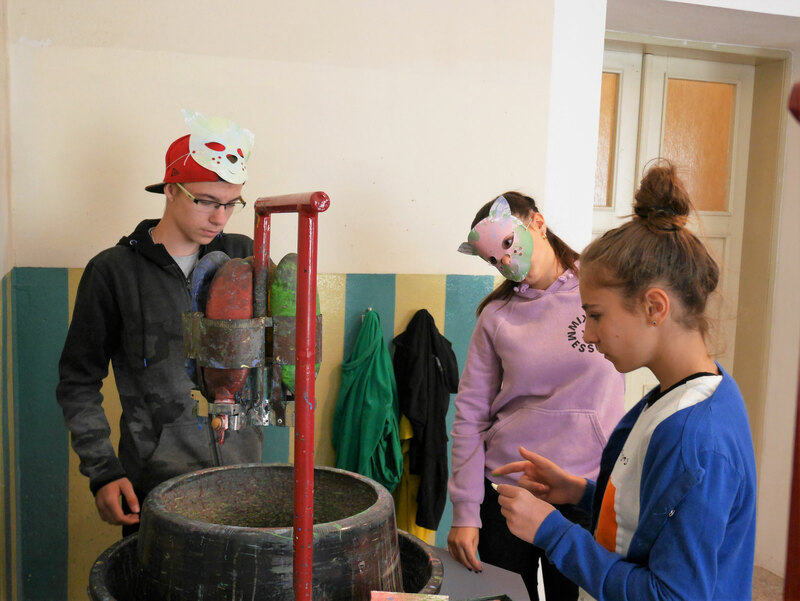 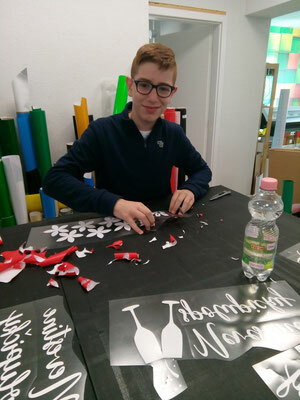 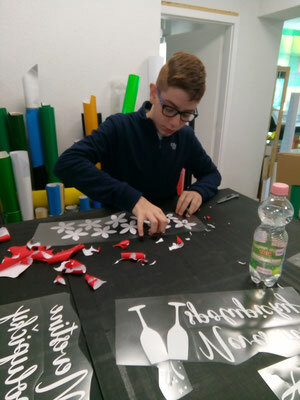 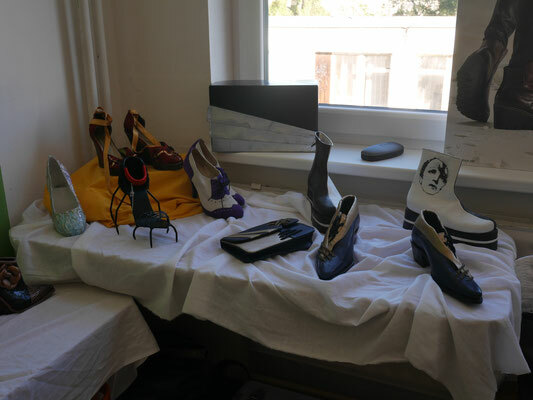 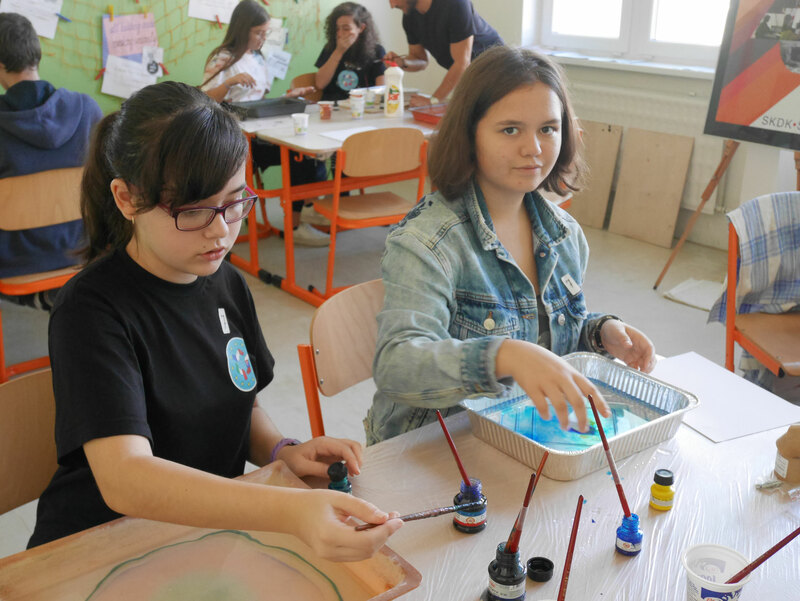 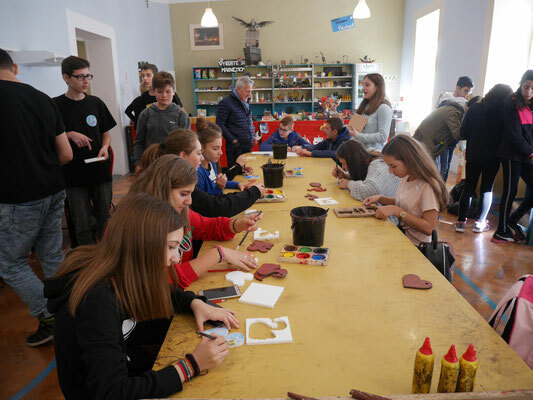 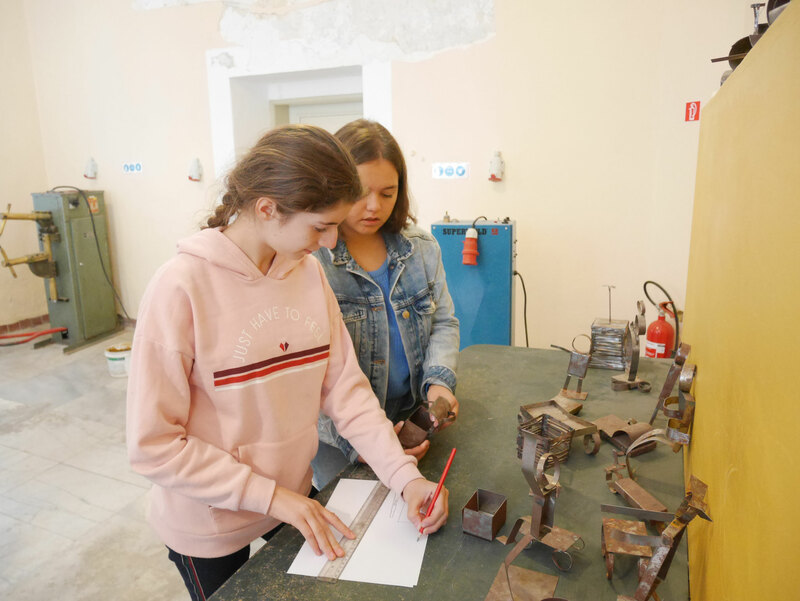 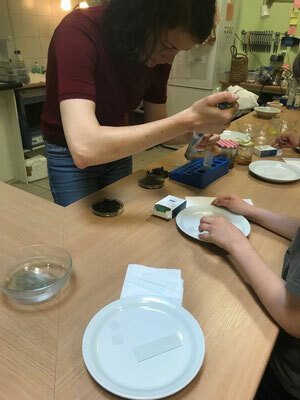 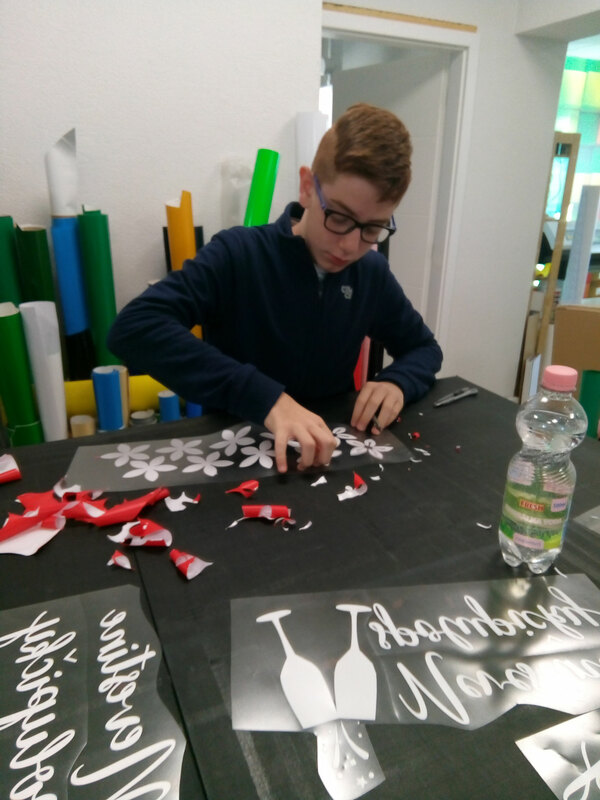 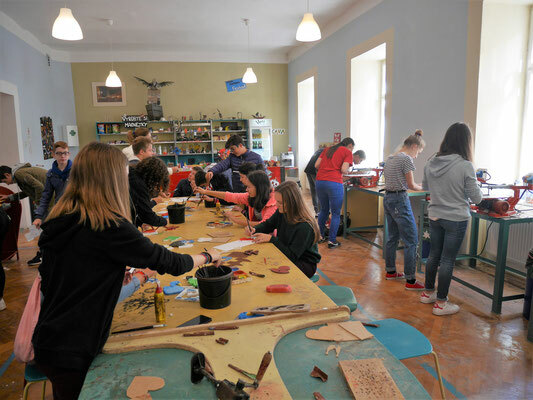 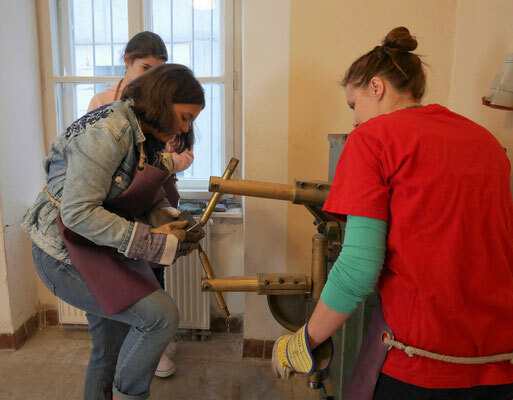 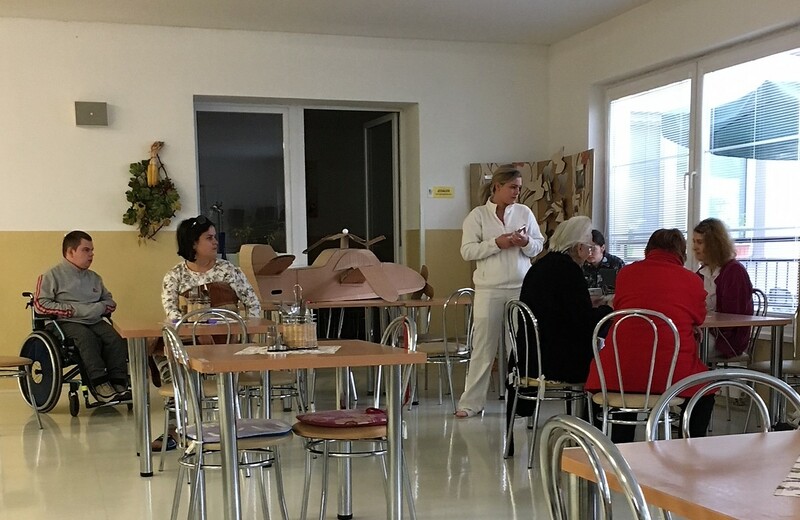 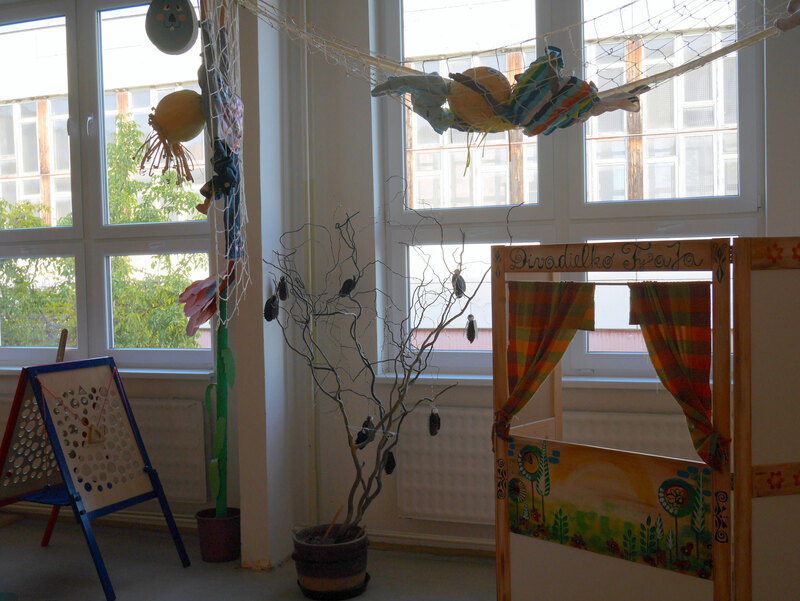 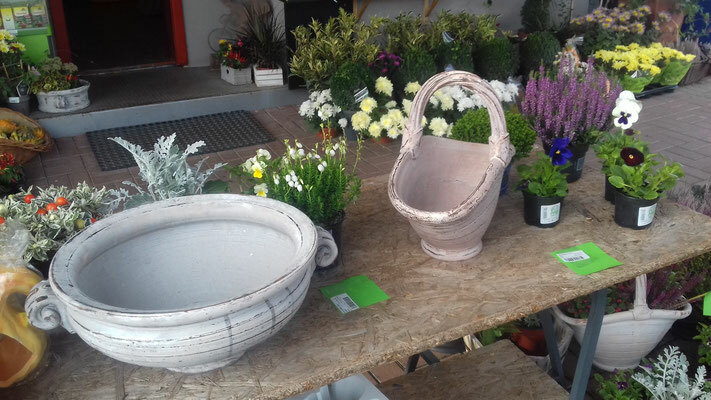 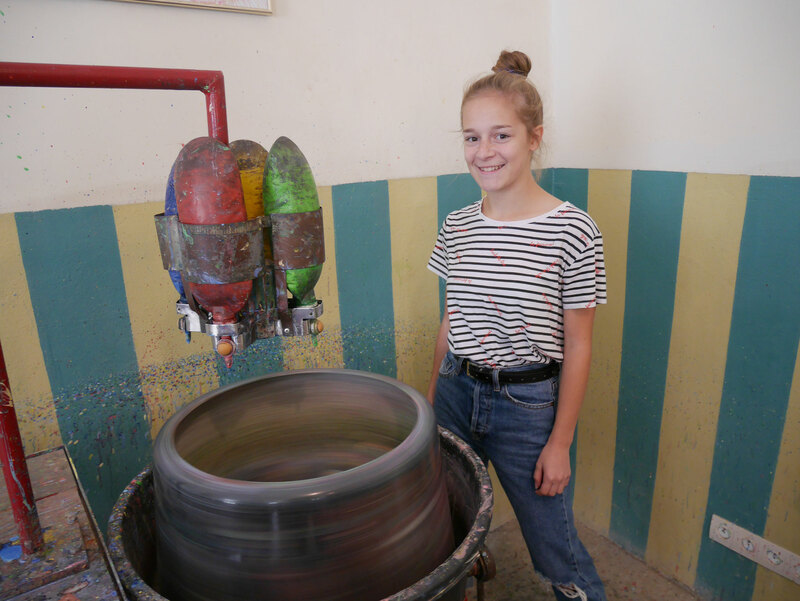 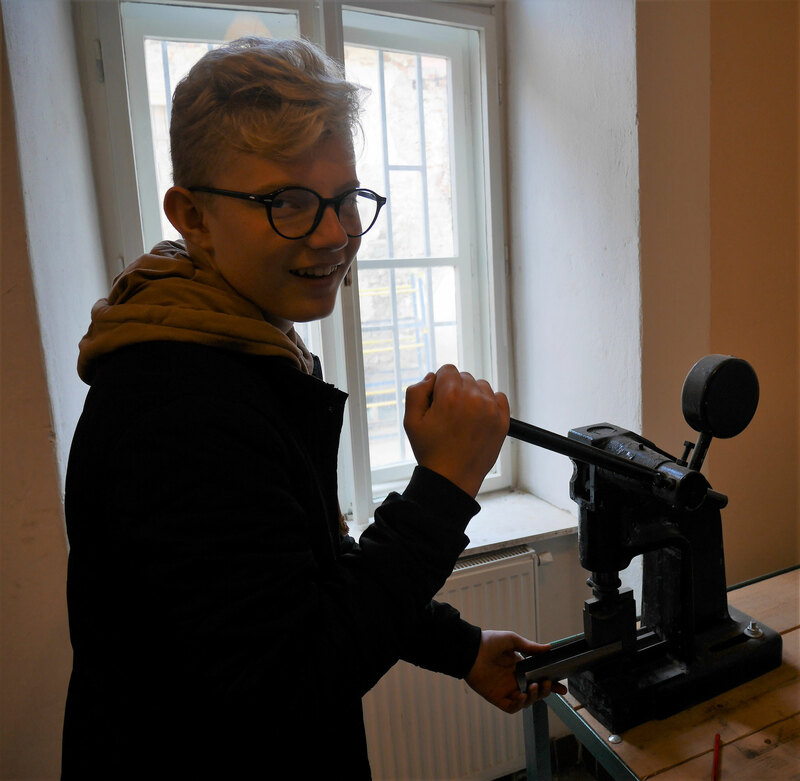 We also visited a city linked with crafts, one of the sector we are working on, and pupils took part there in some artistic workshops where they created objects with papers, wood, iron and polystyrene. 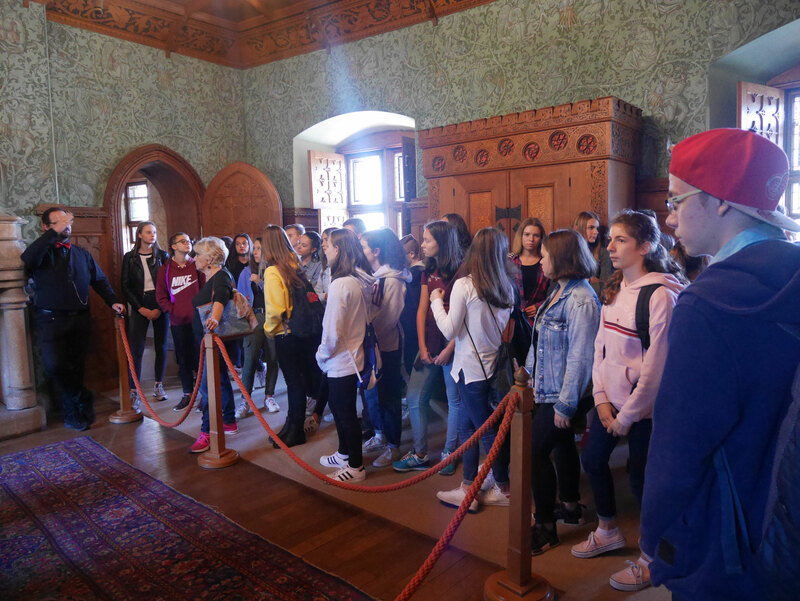 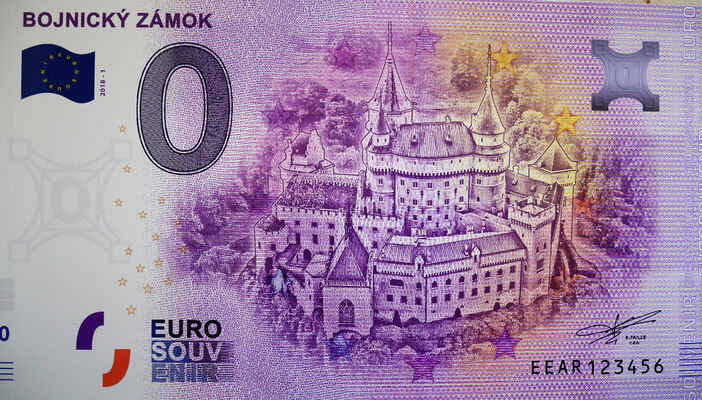 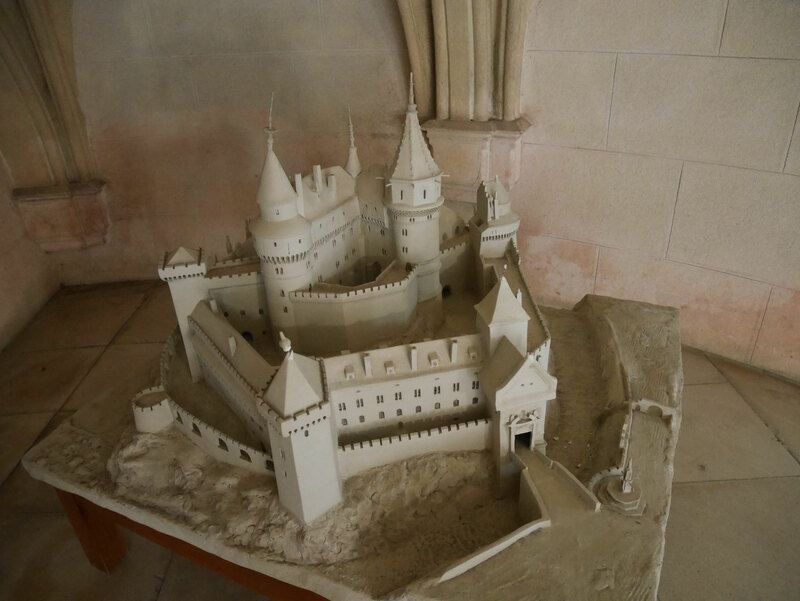 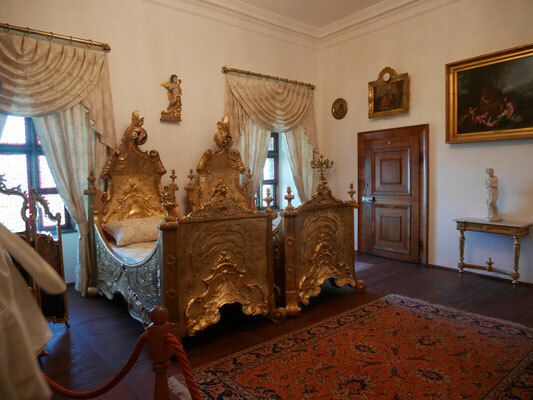 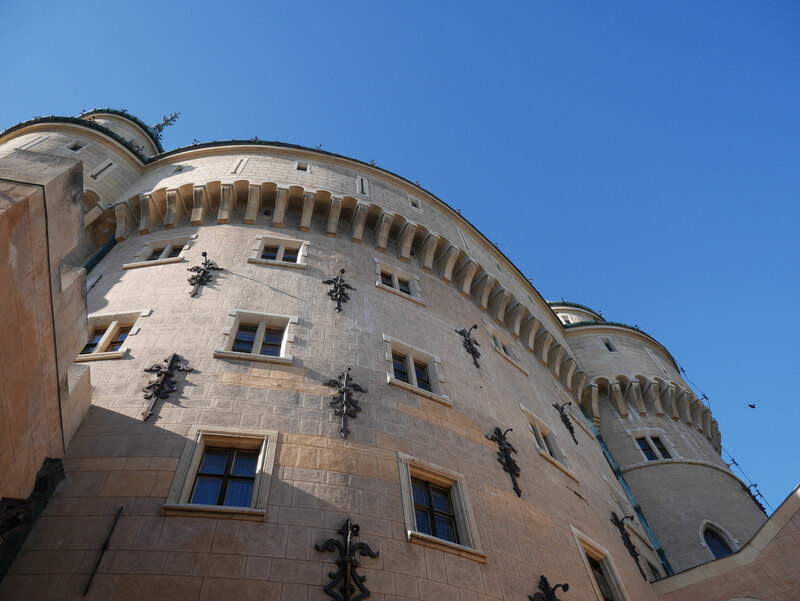 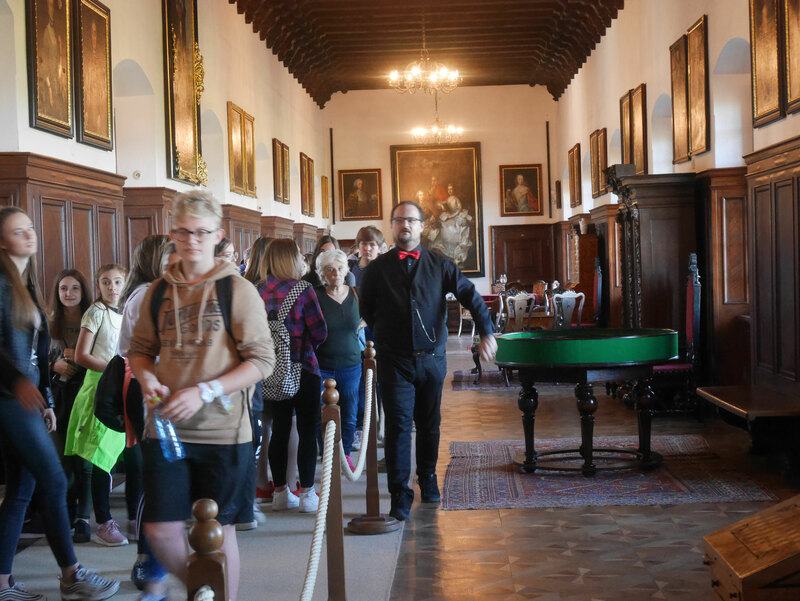 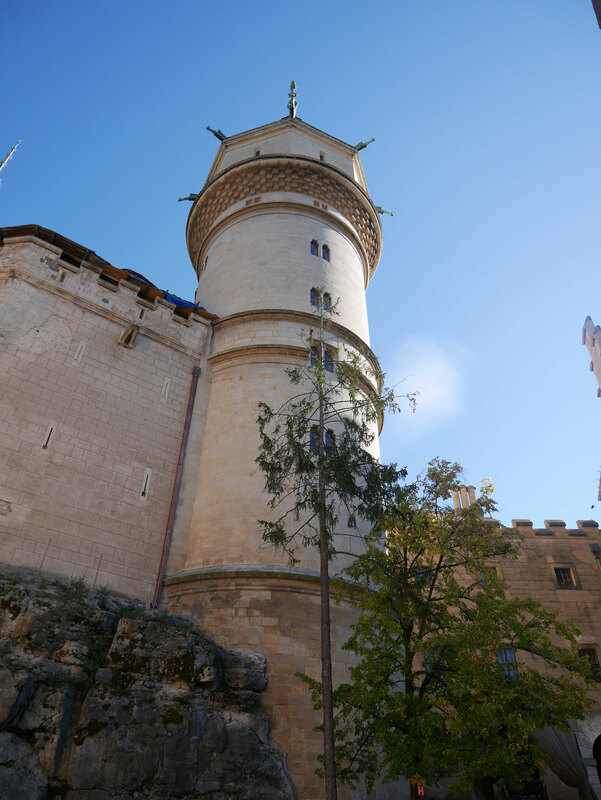 We had the occasion to visit Bojnice castle, one of the oldest and most important monument in Slovakia which used to belong to the wealthy Palfi family. 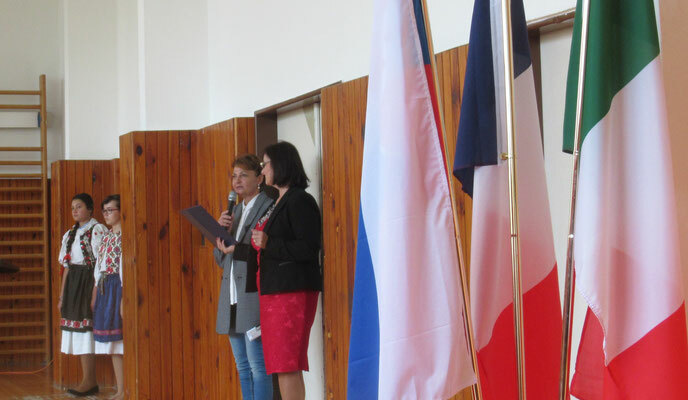 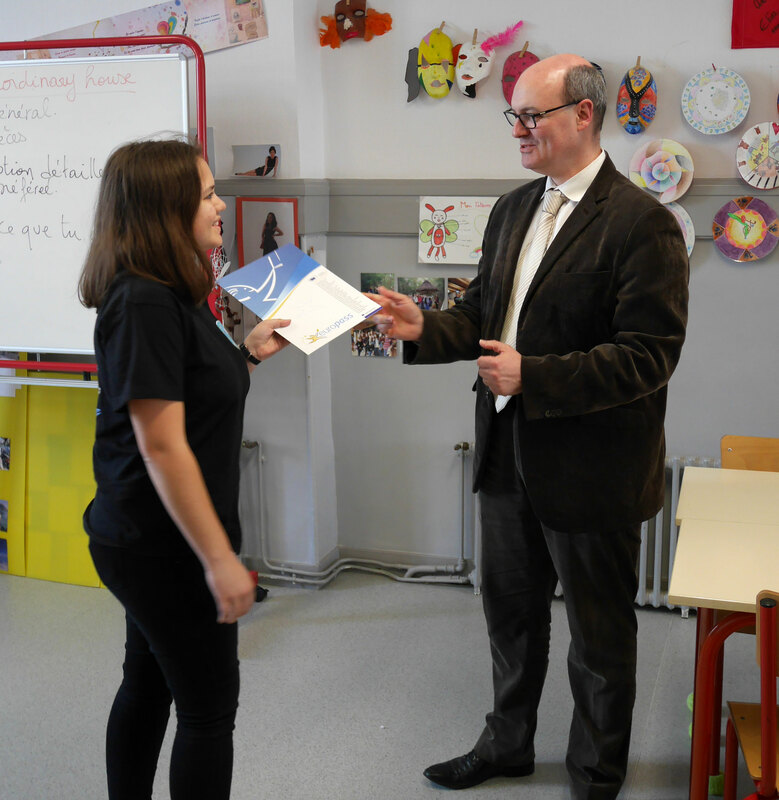 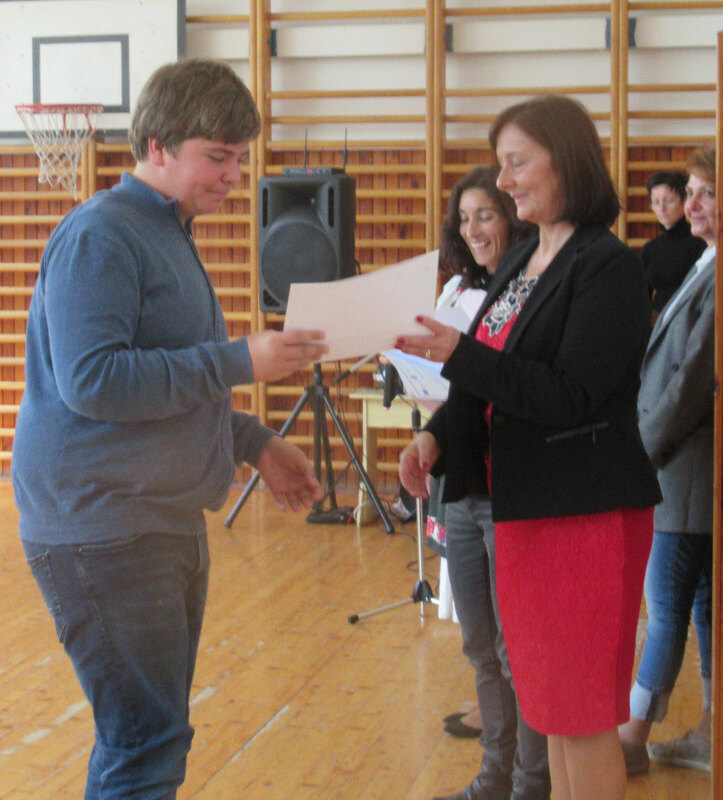 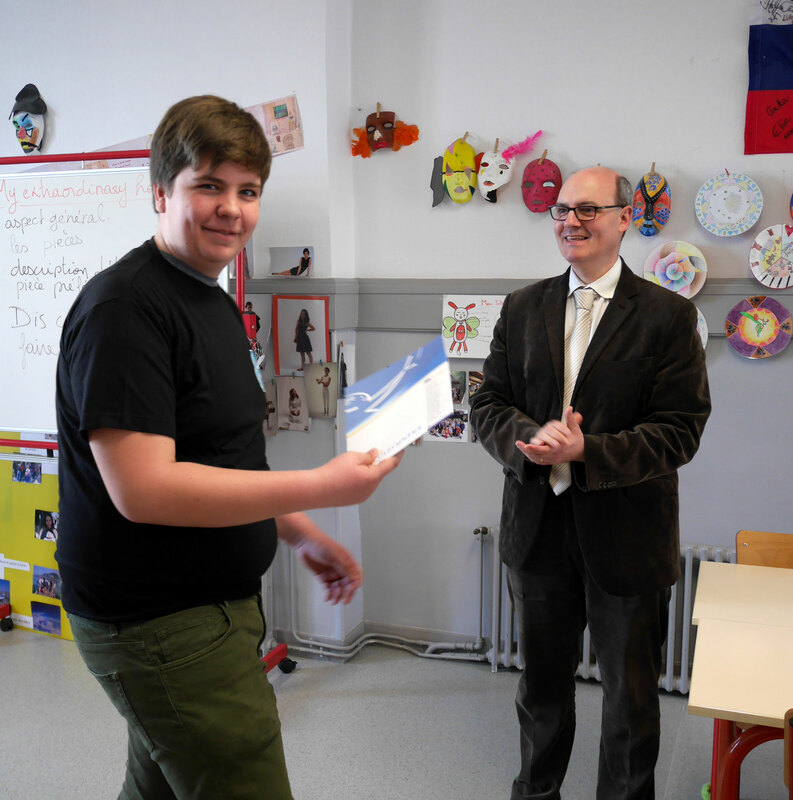 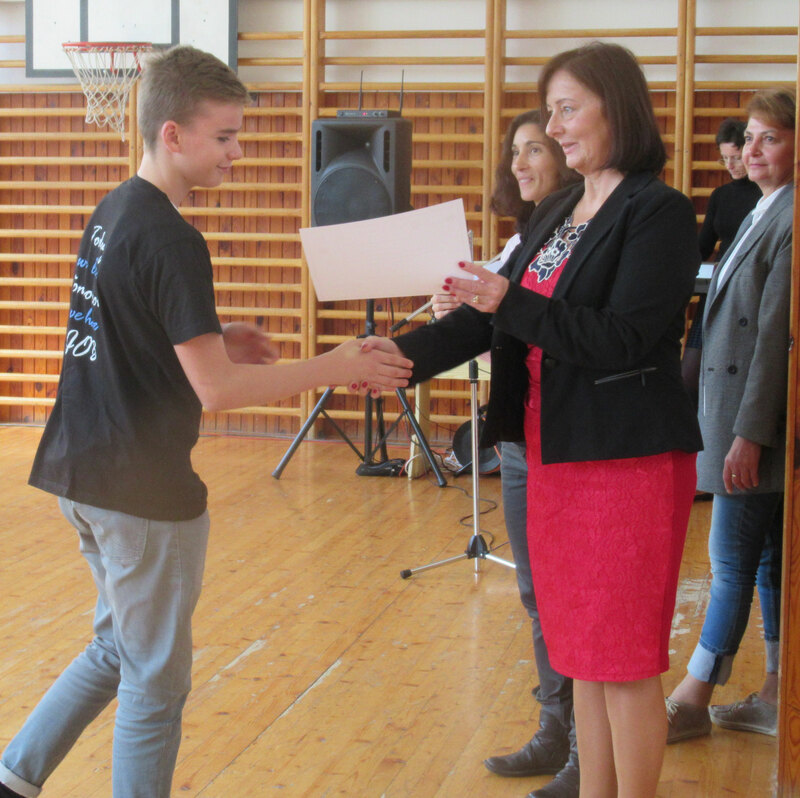 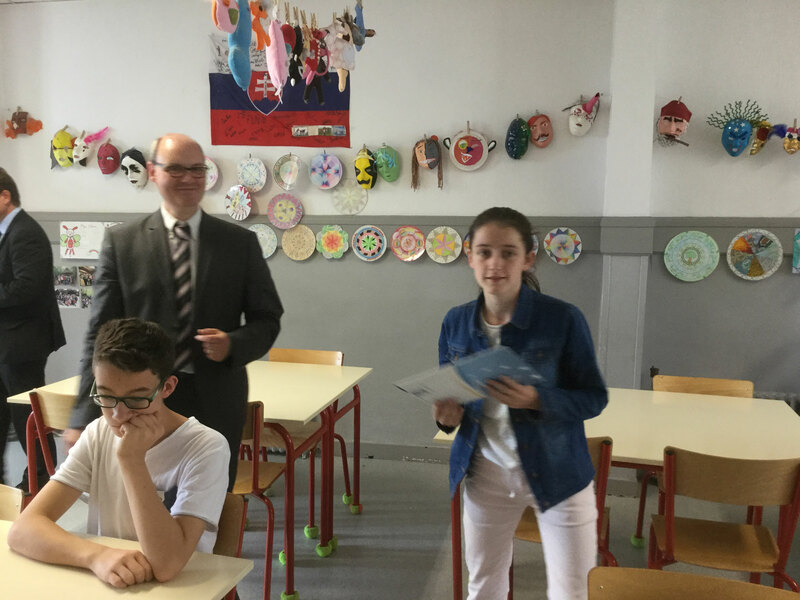 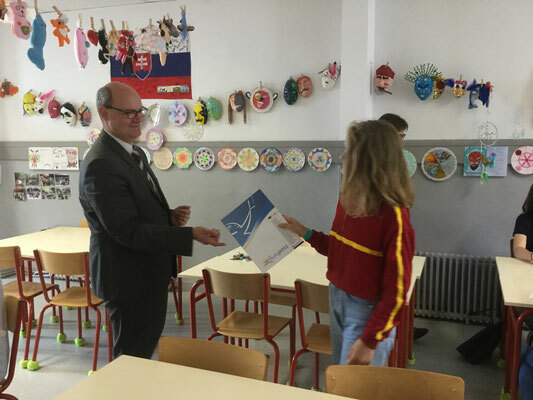 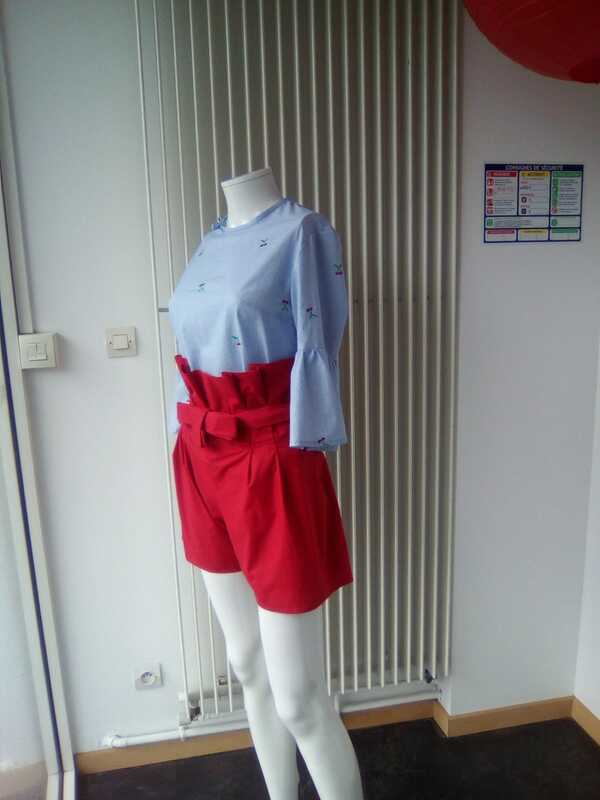 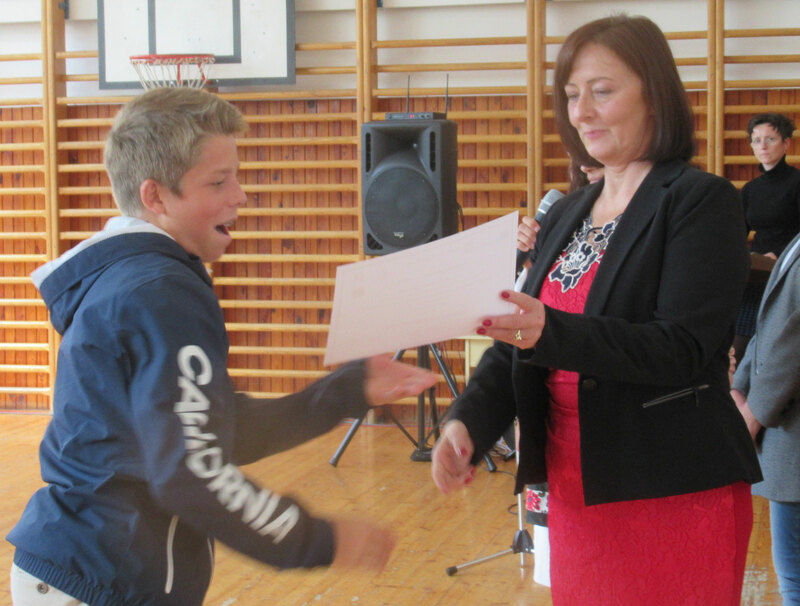 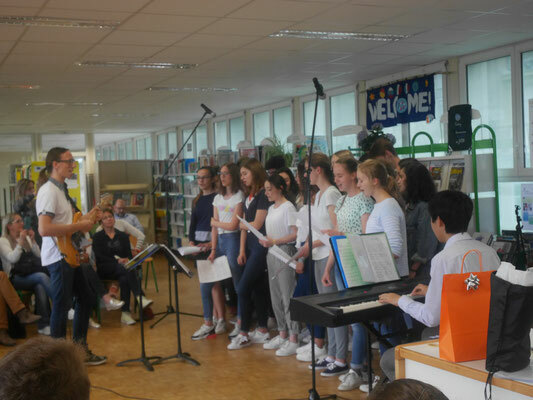 Pupils communicated a lot with their partners, improved their English, acquired new competences with the internships and workshops, leant about new jobs and even leant common Slovak, French and Italian expressions and phrases. 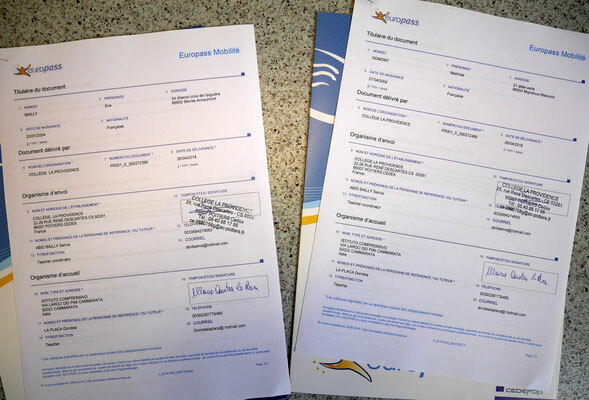 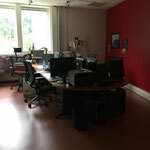 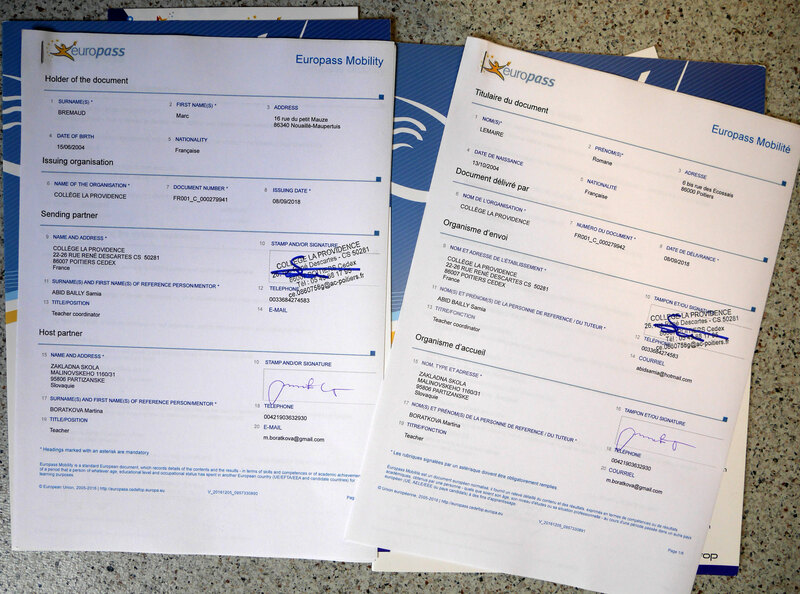 They obtained their Europass Mobilities. 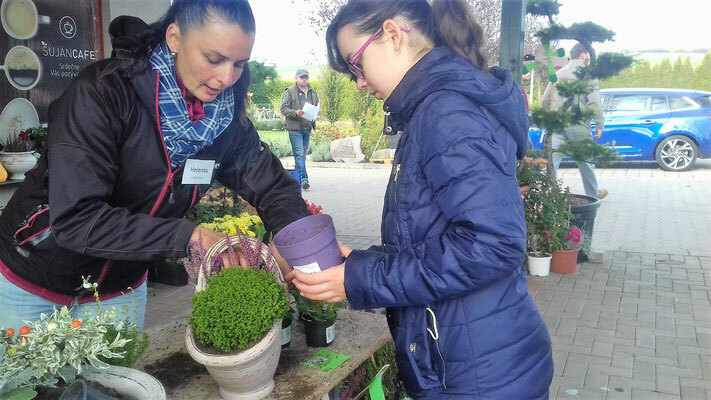 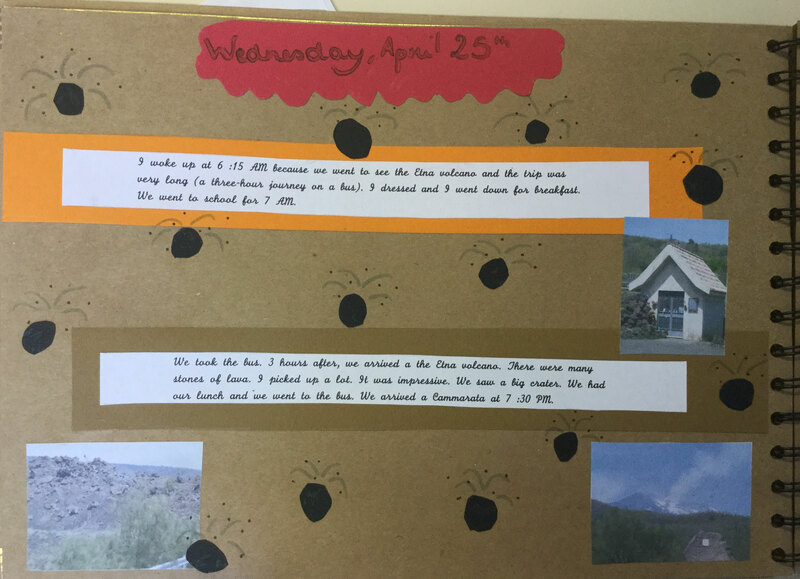 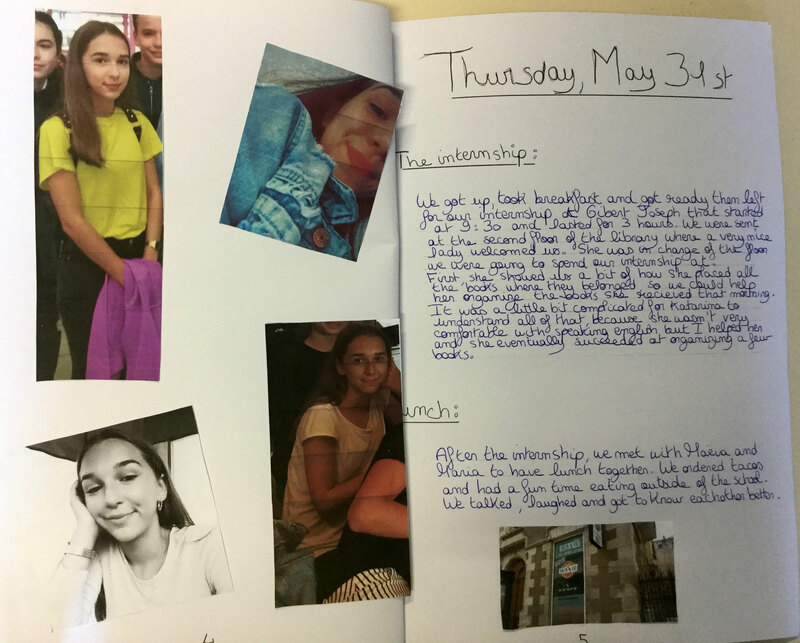 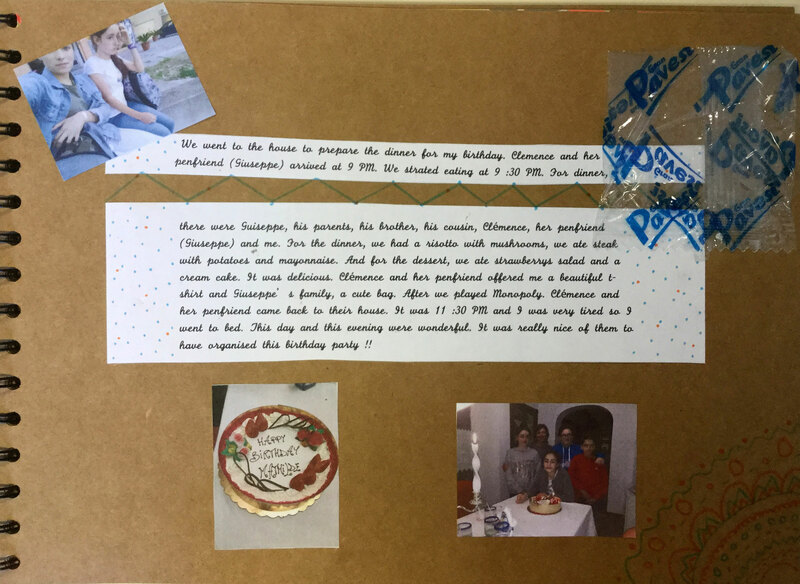 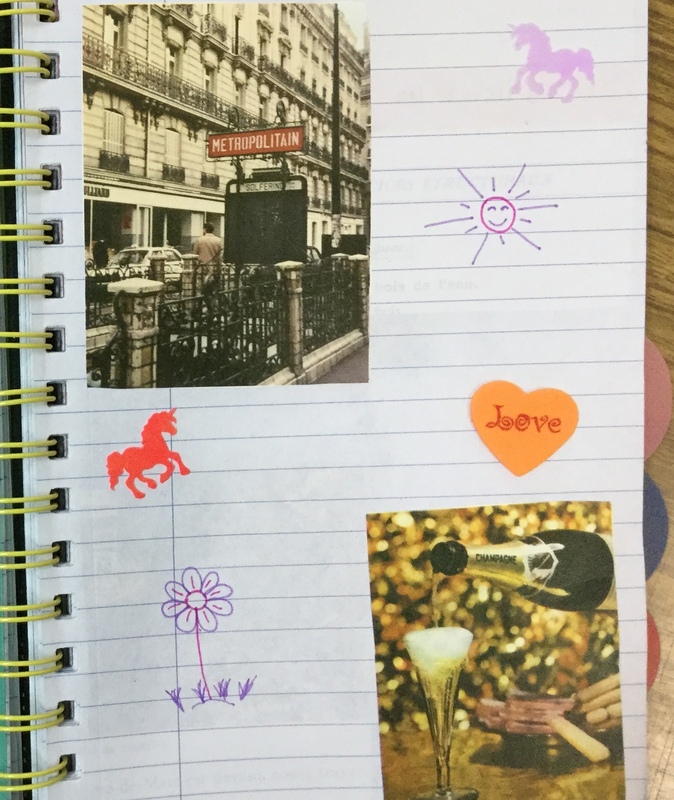 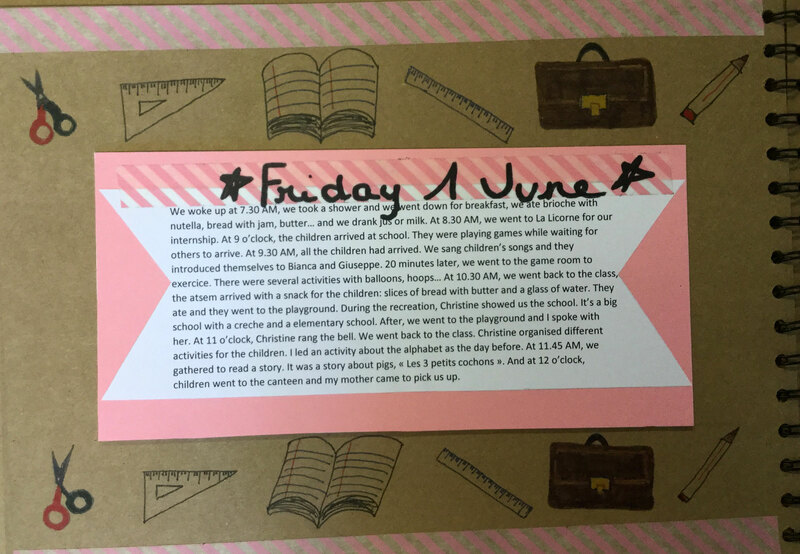 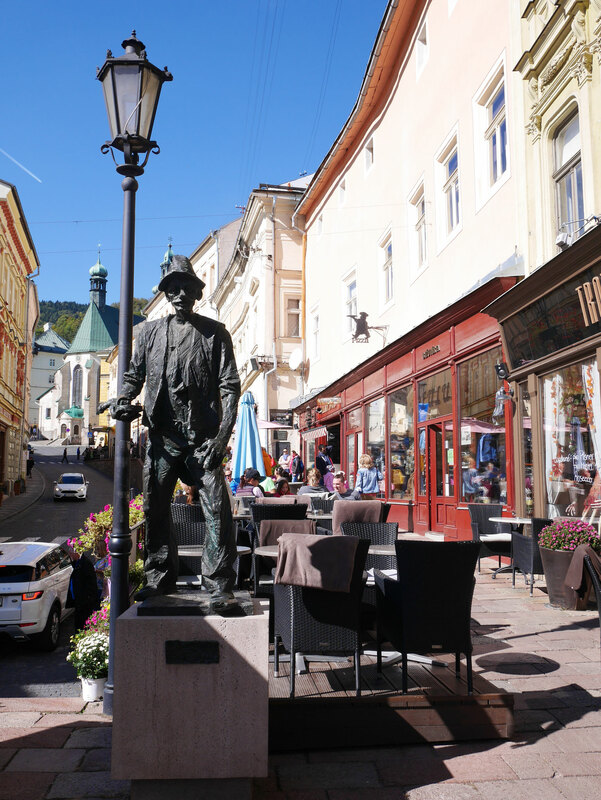 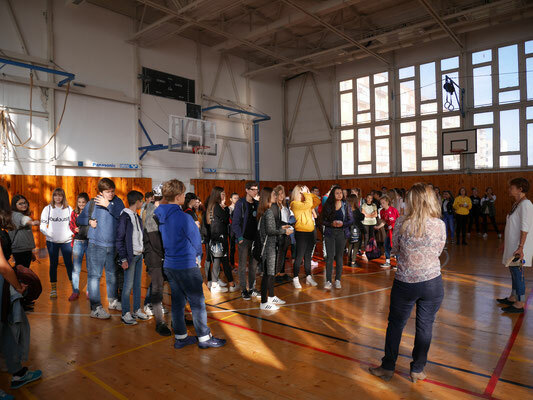 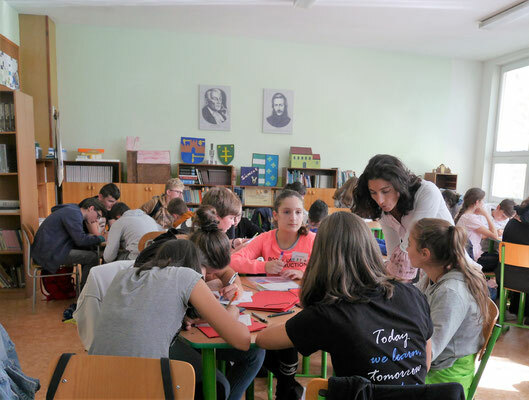 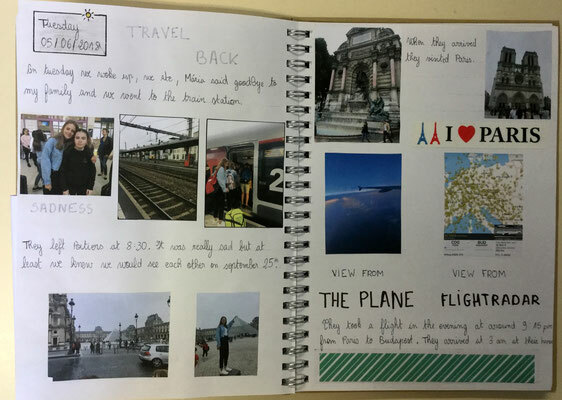 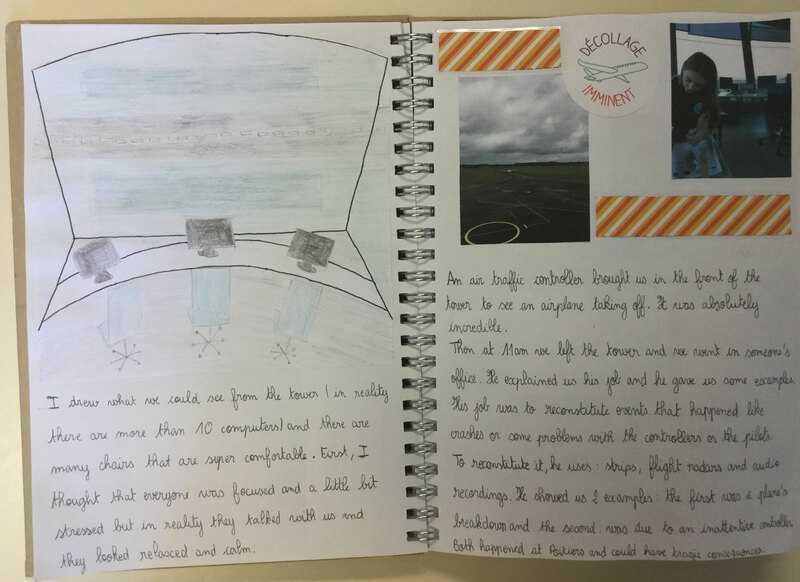 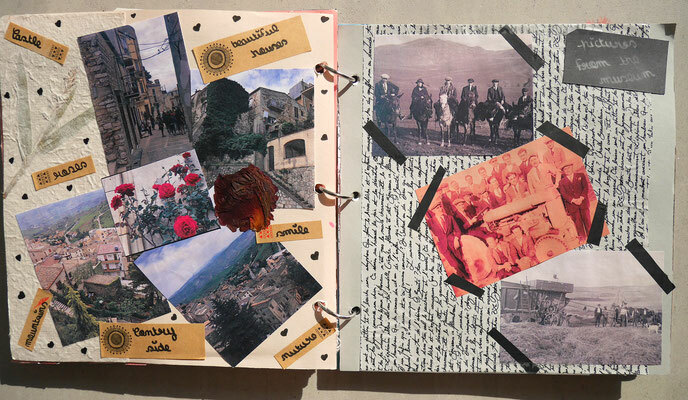 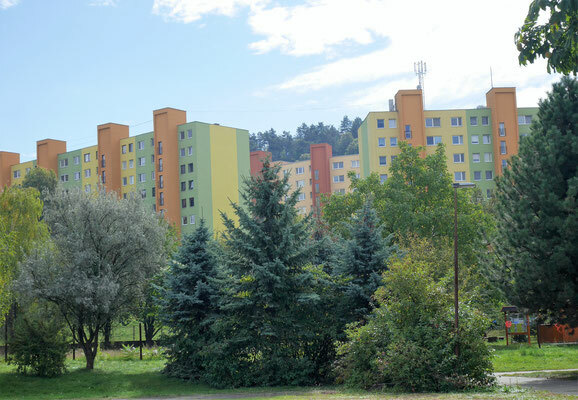 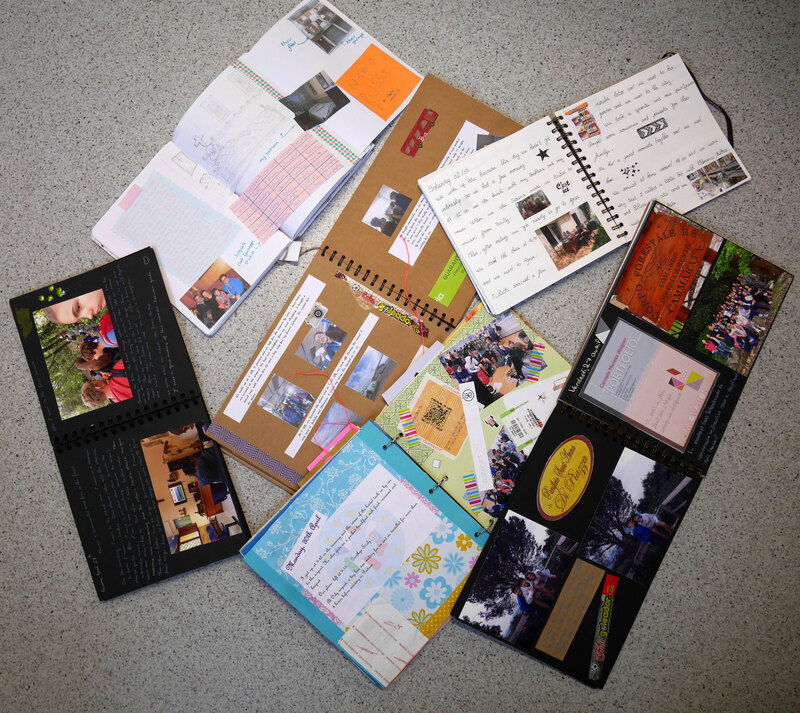 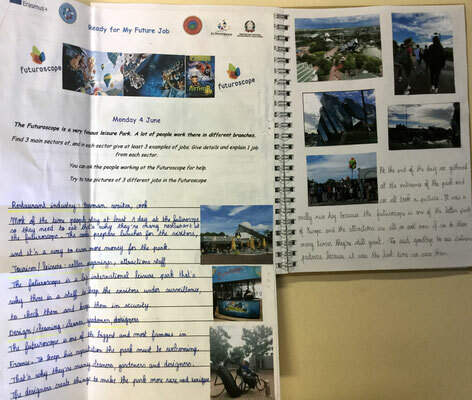 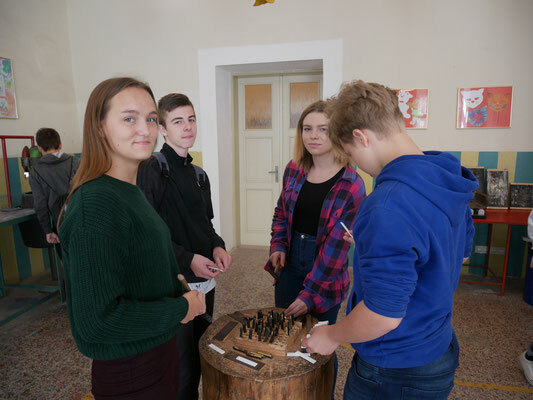 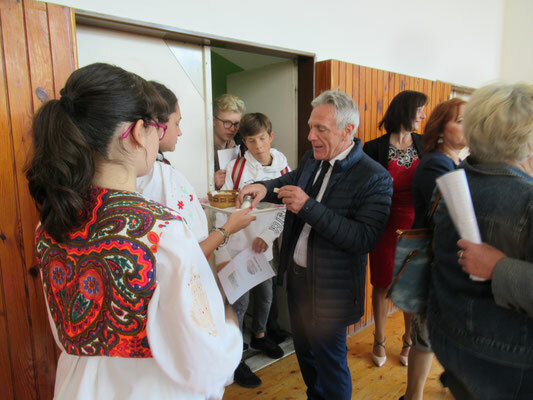 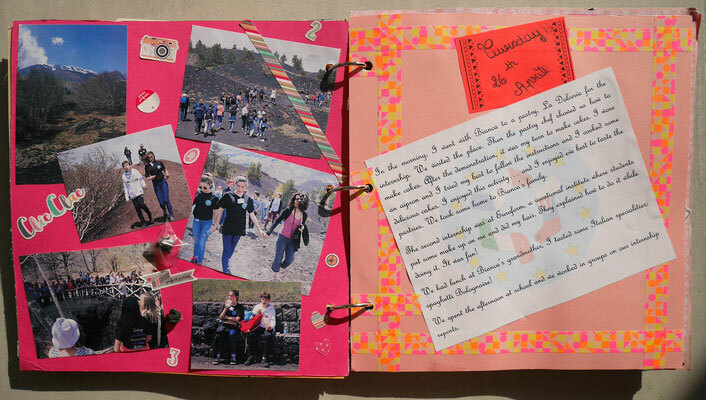 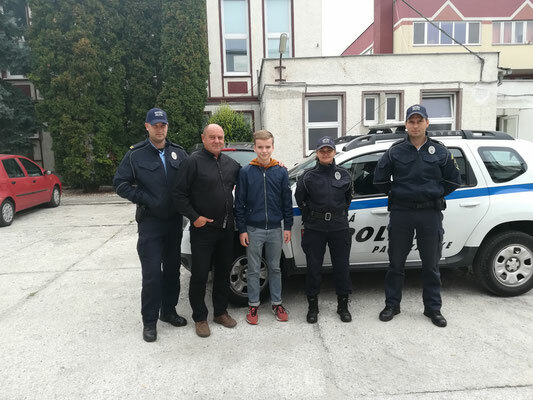 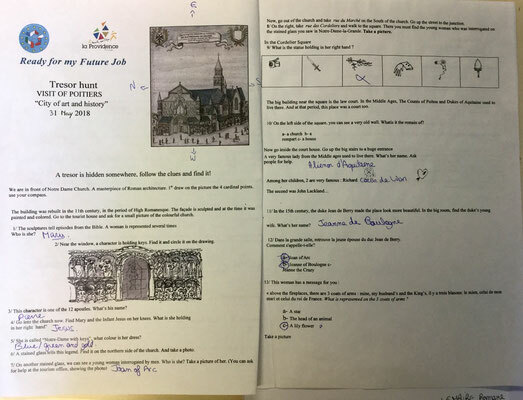 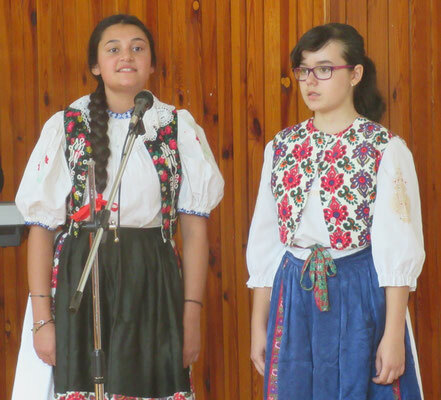 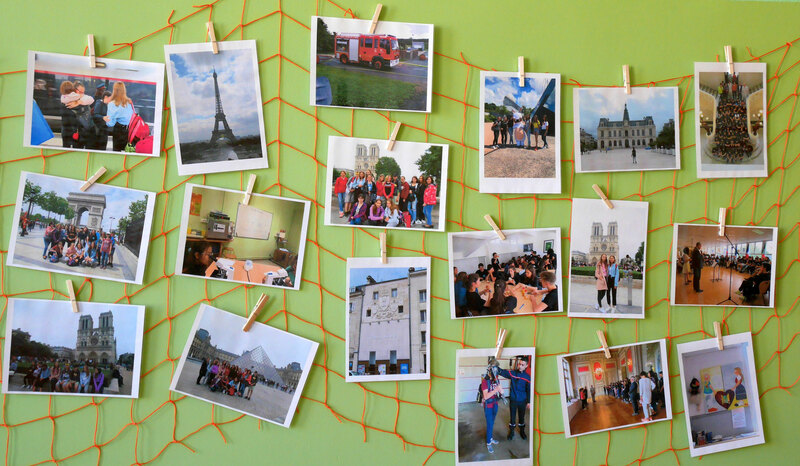 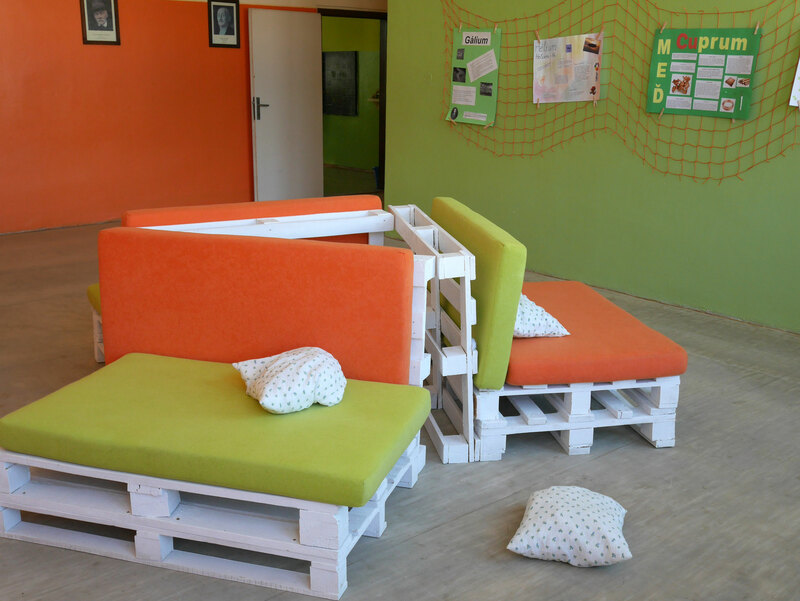 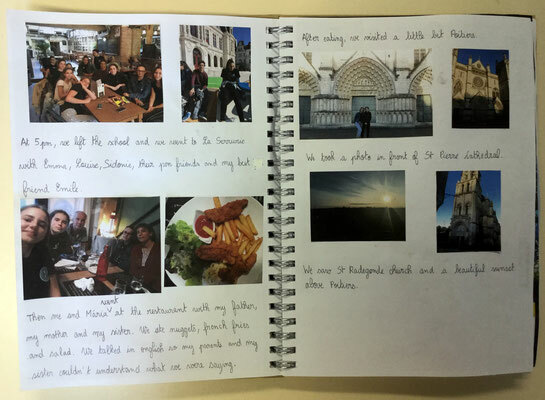 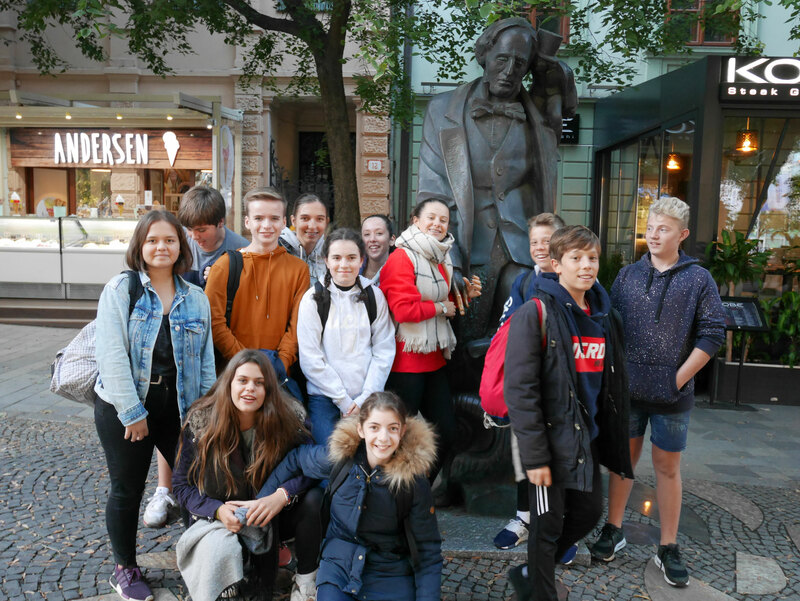 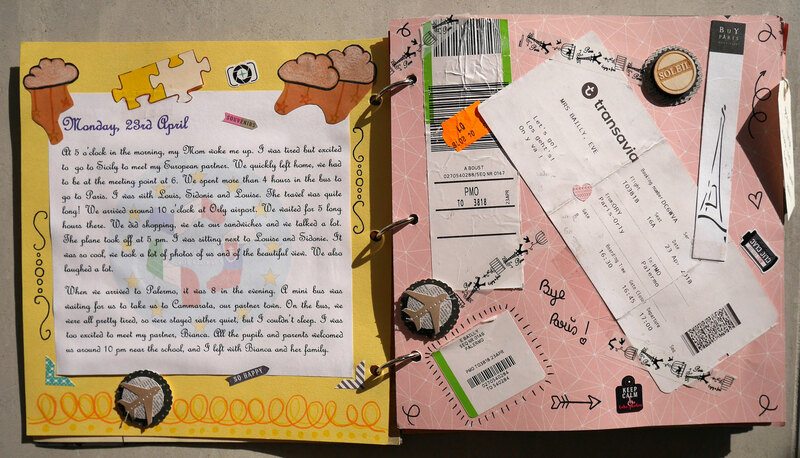 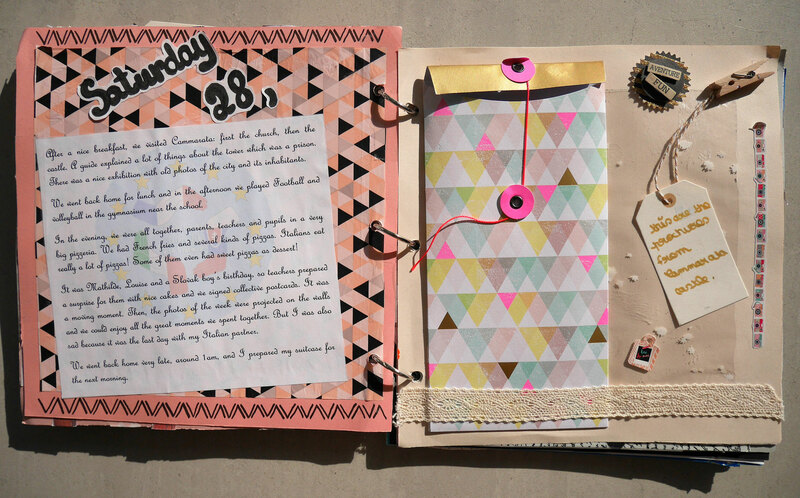 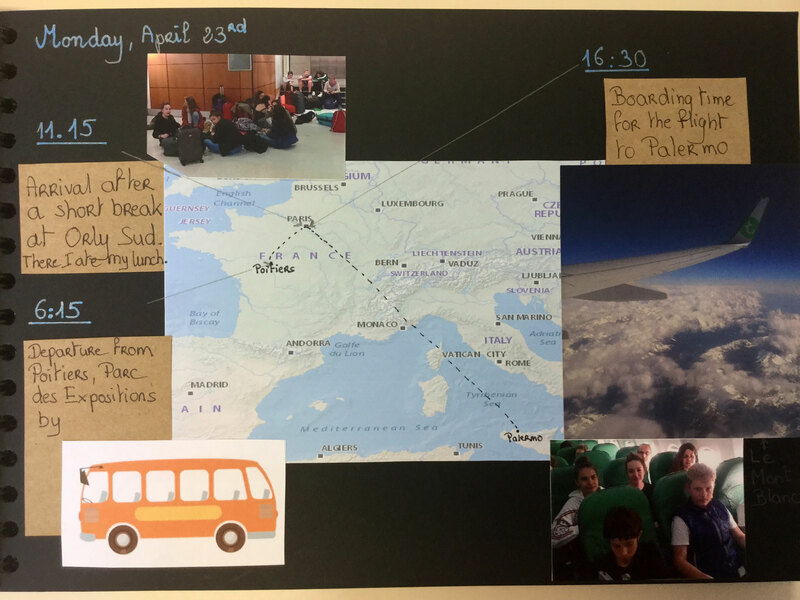 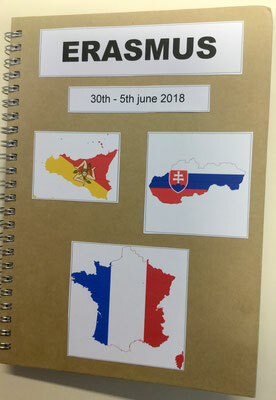 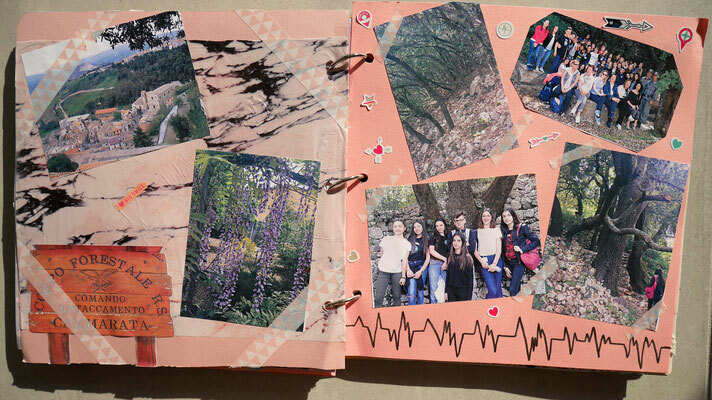 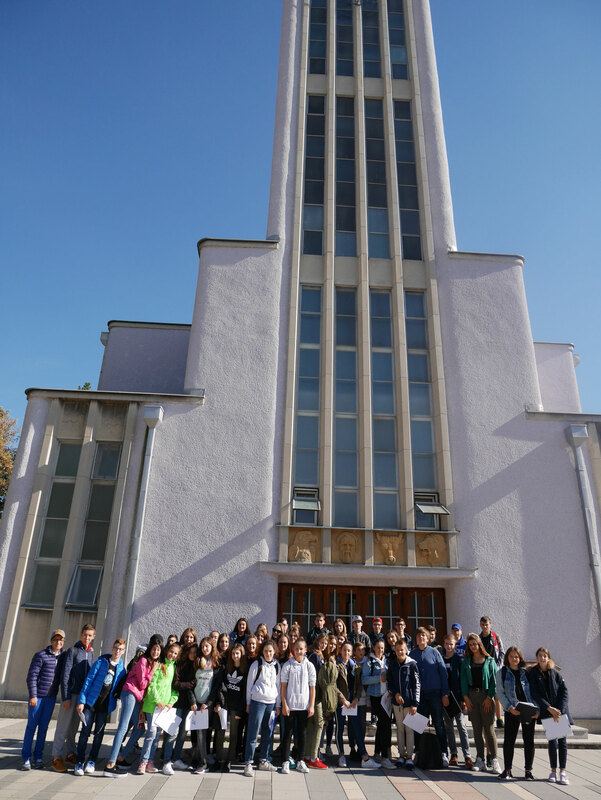 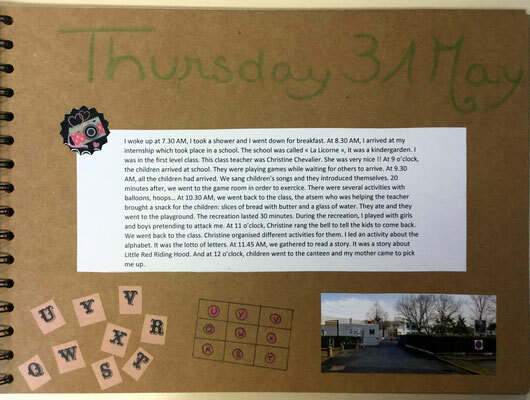 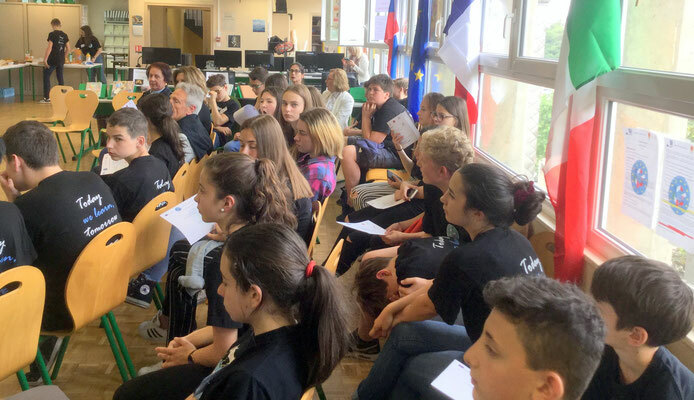 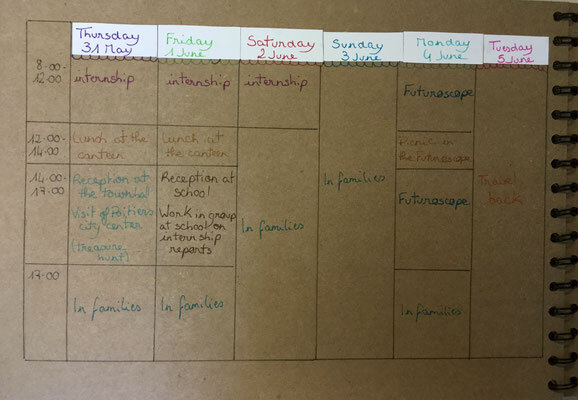 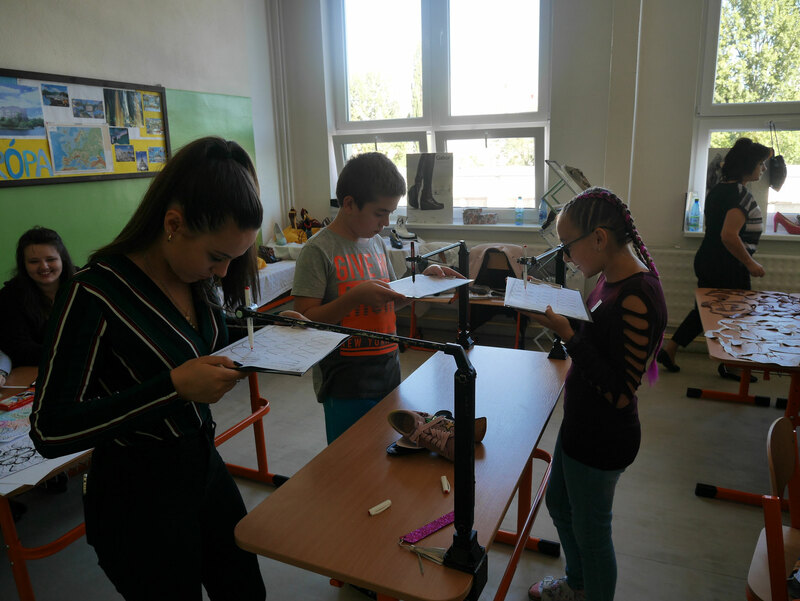 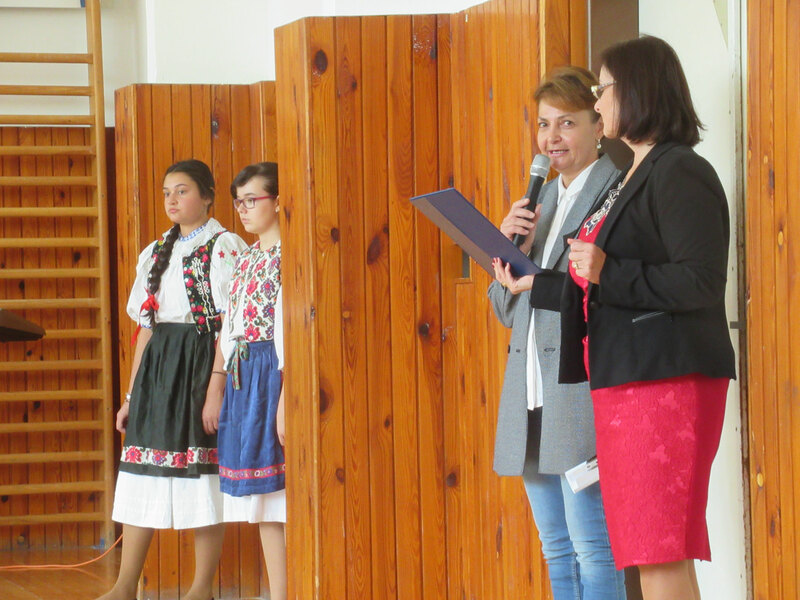 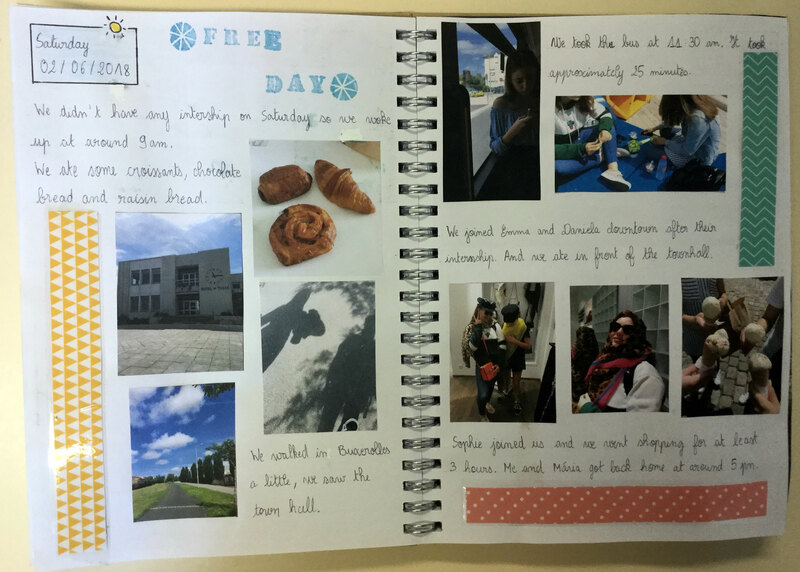 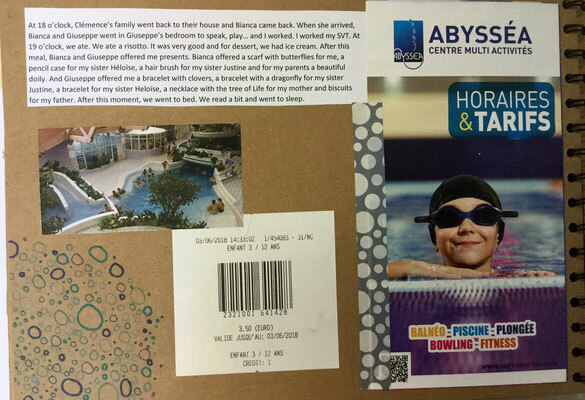 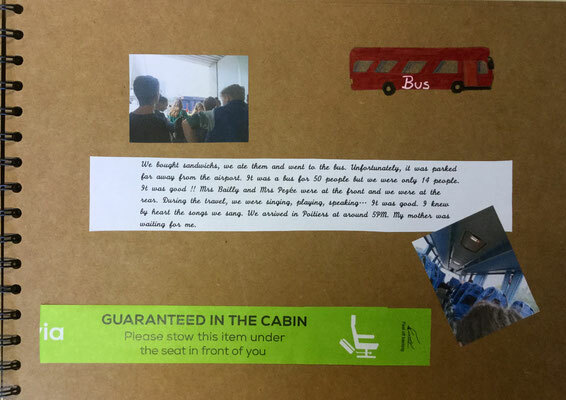 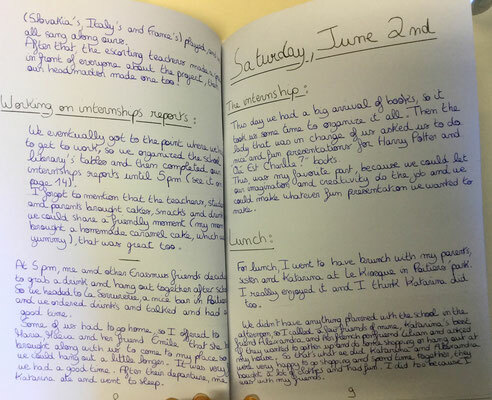 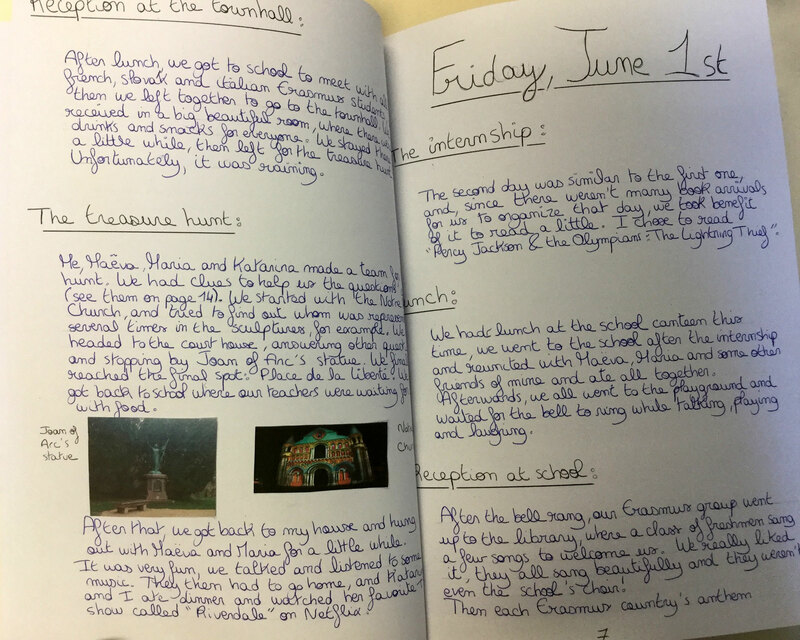 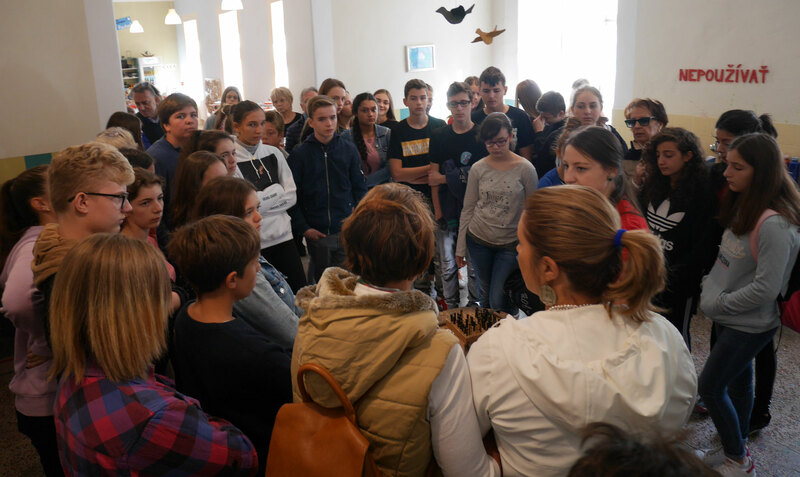 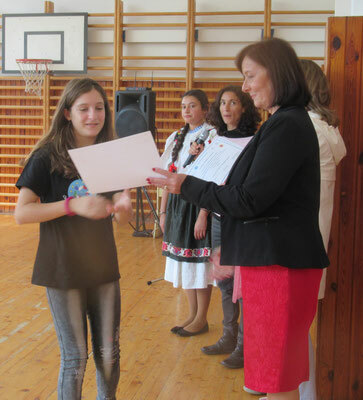 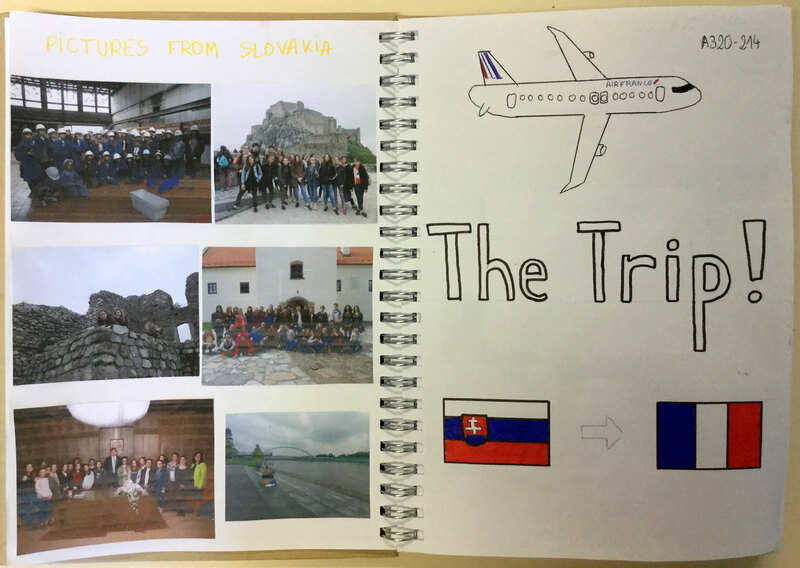 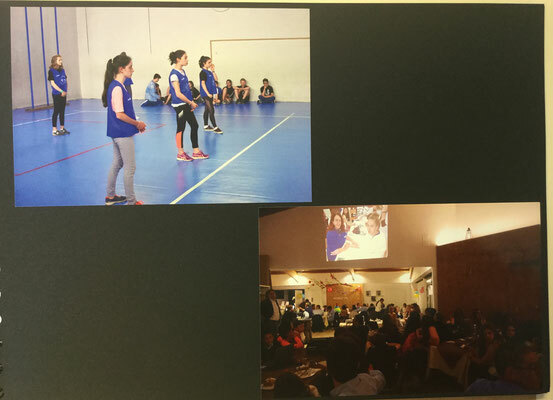 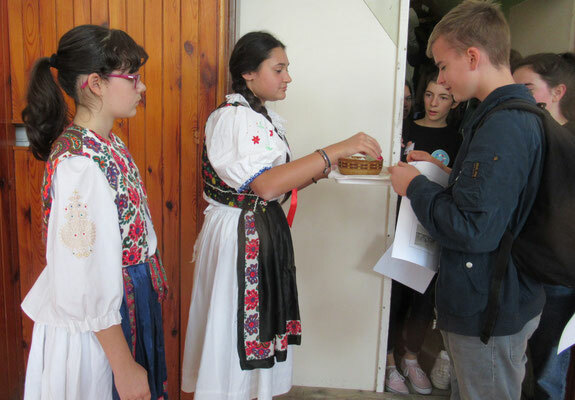 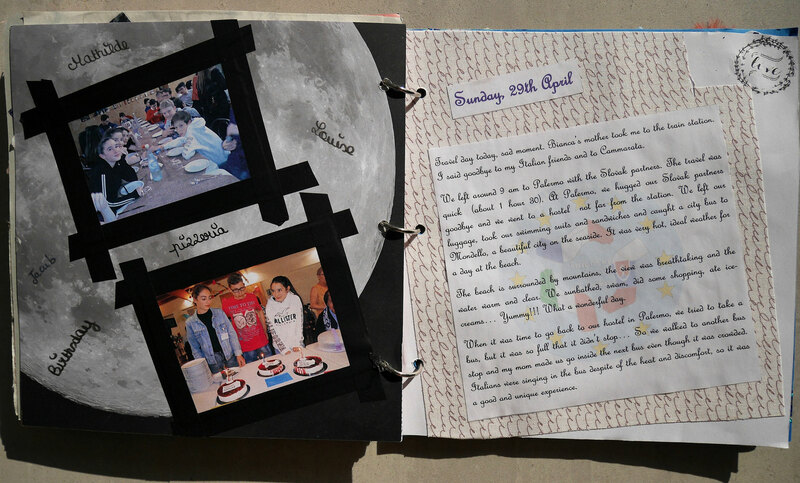 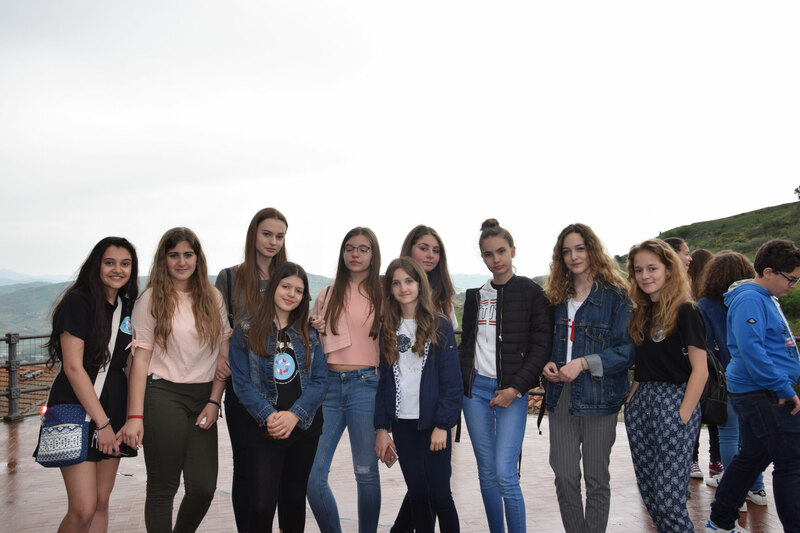 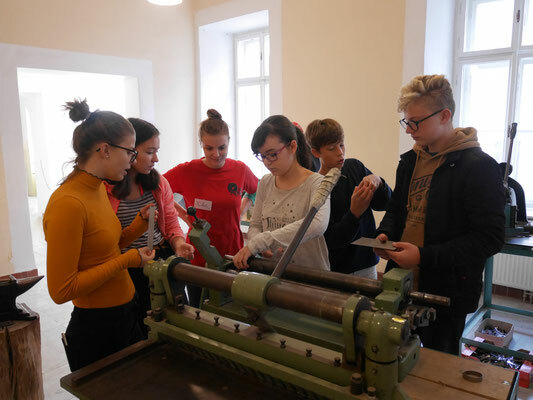 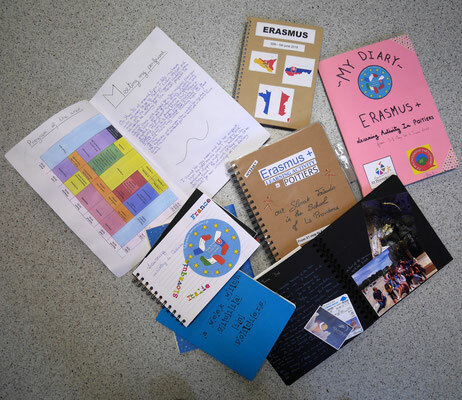 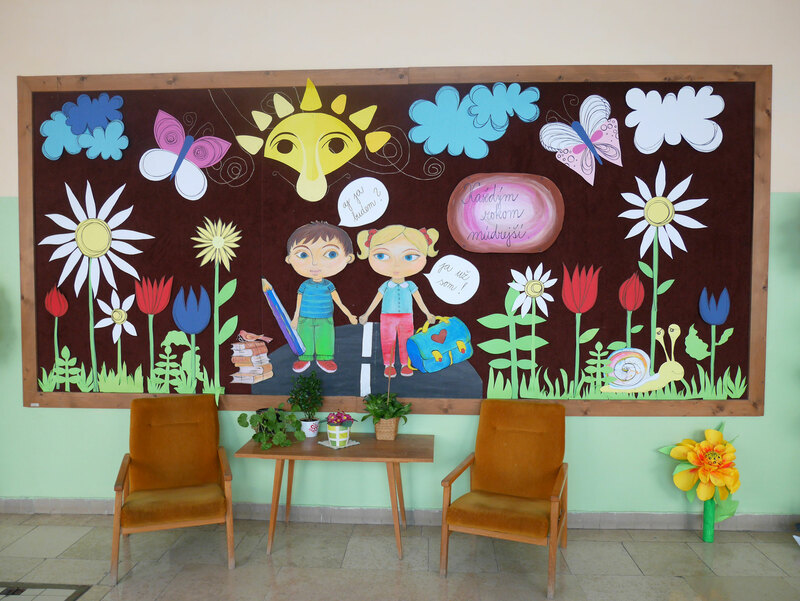 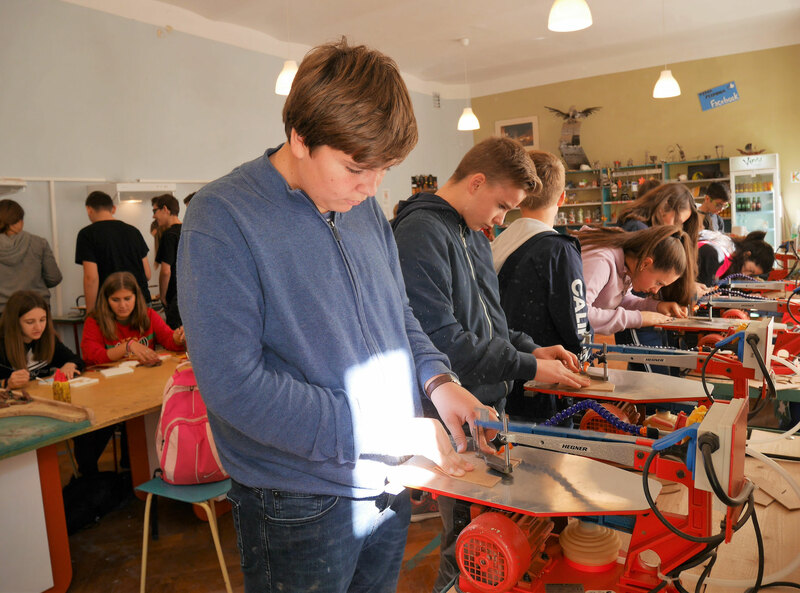 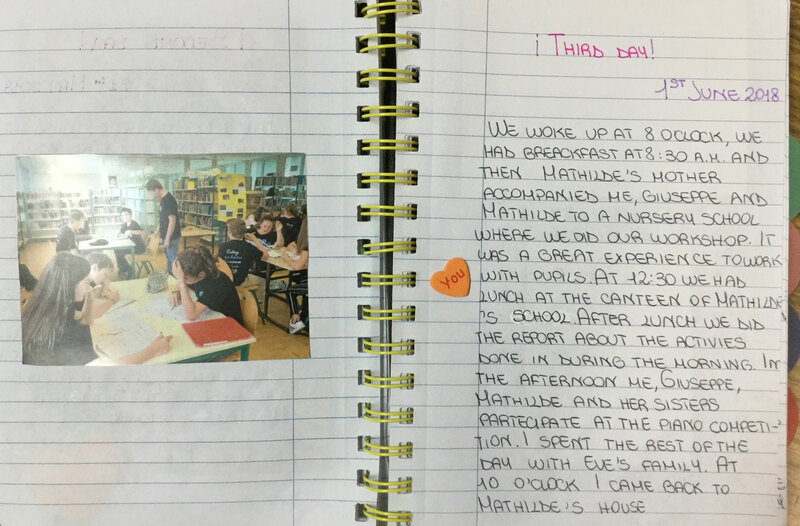 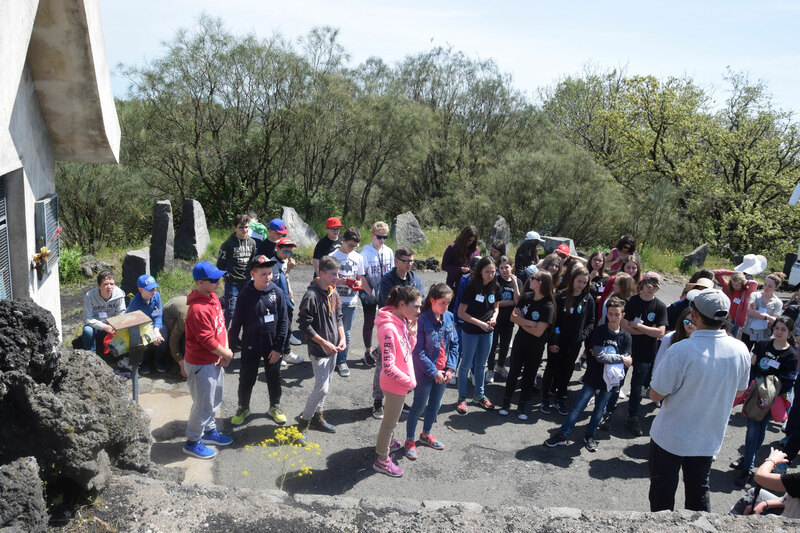 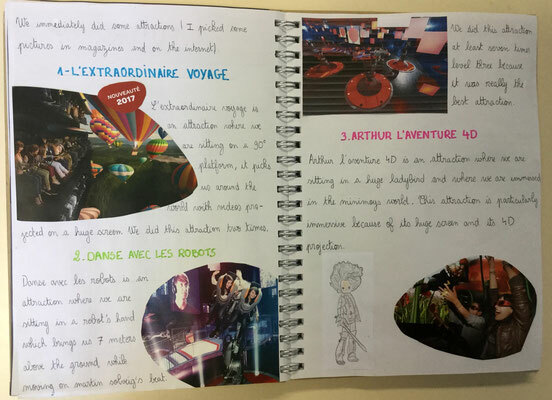 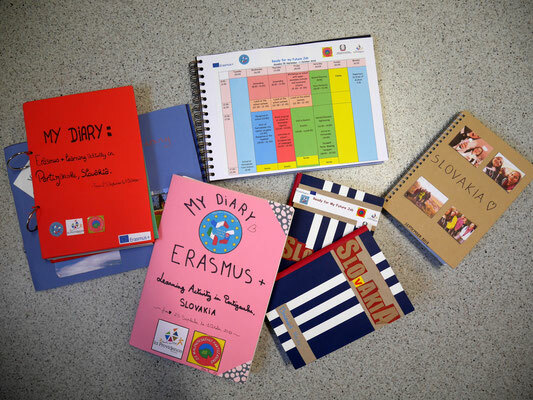 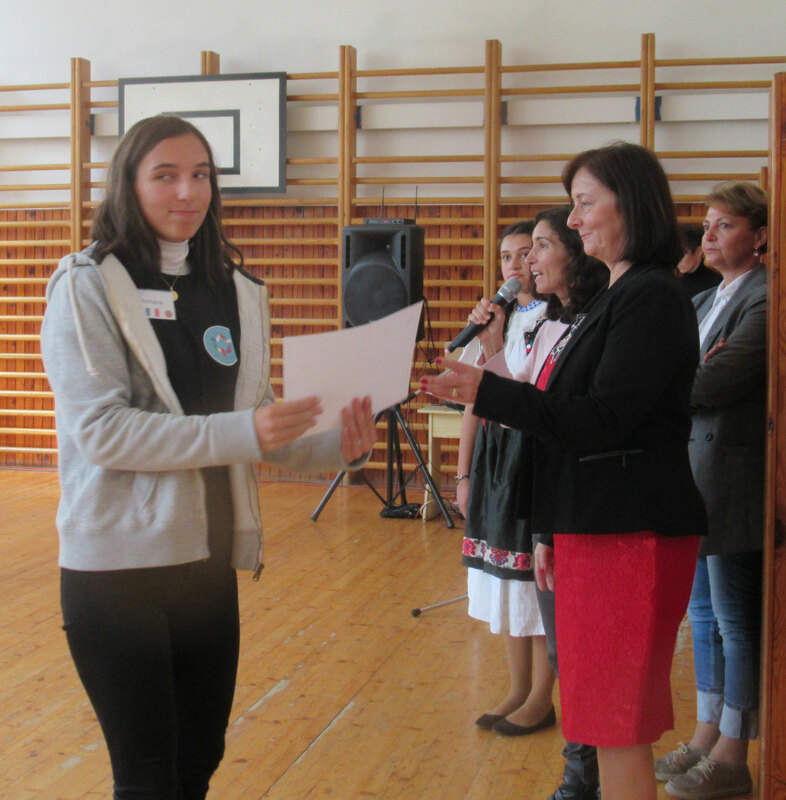 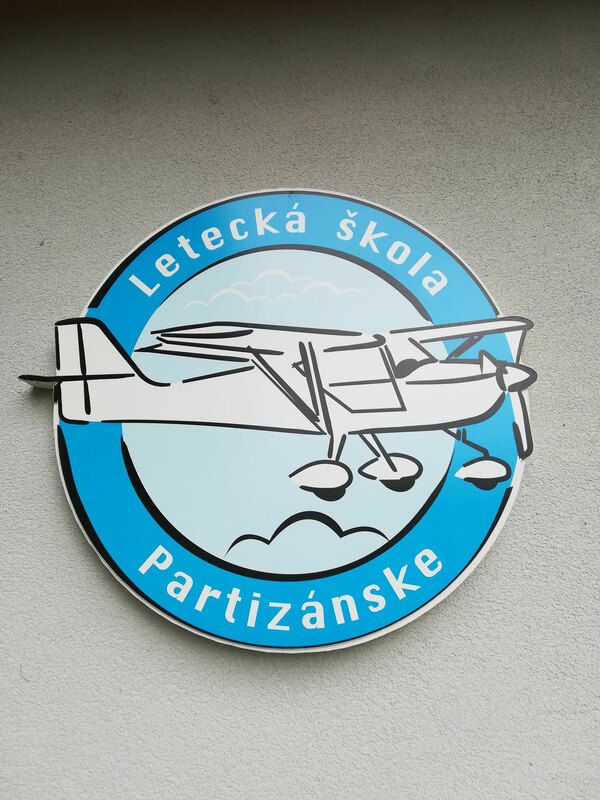 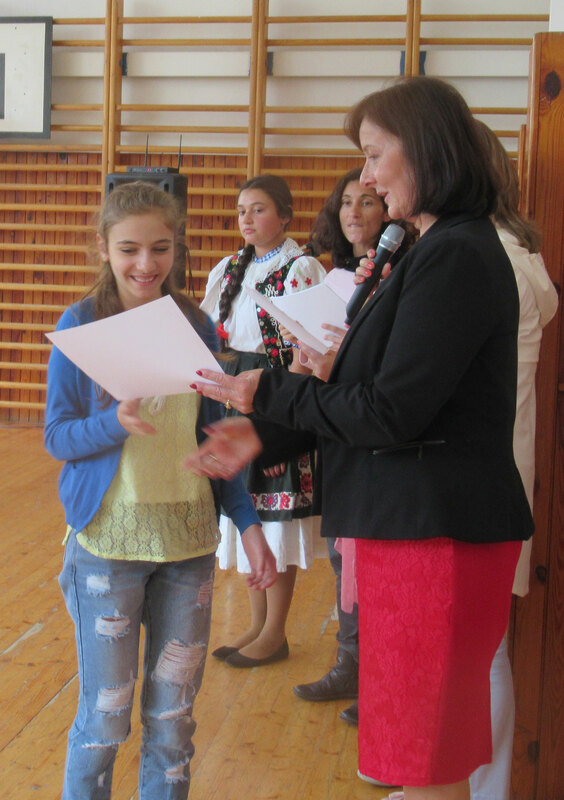 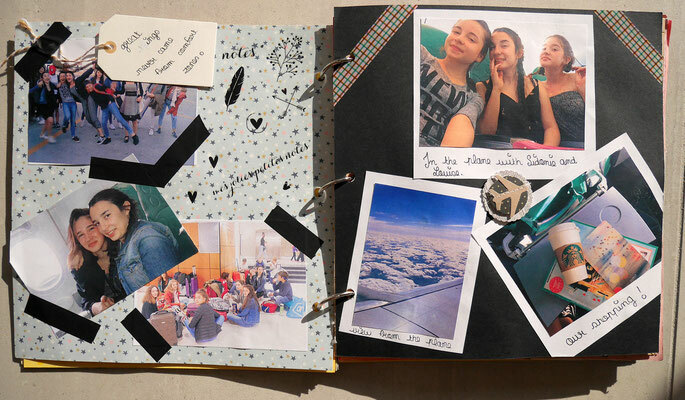 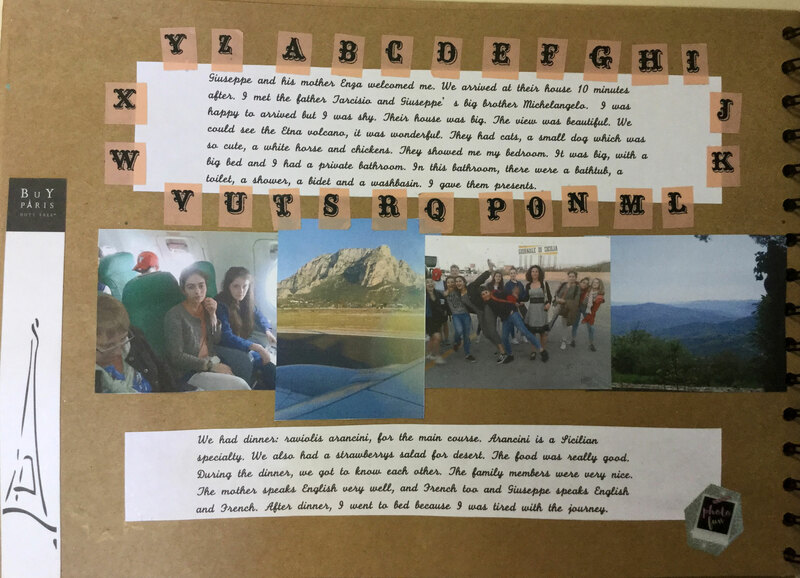 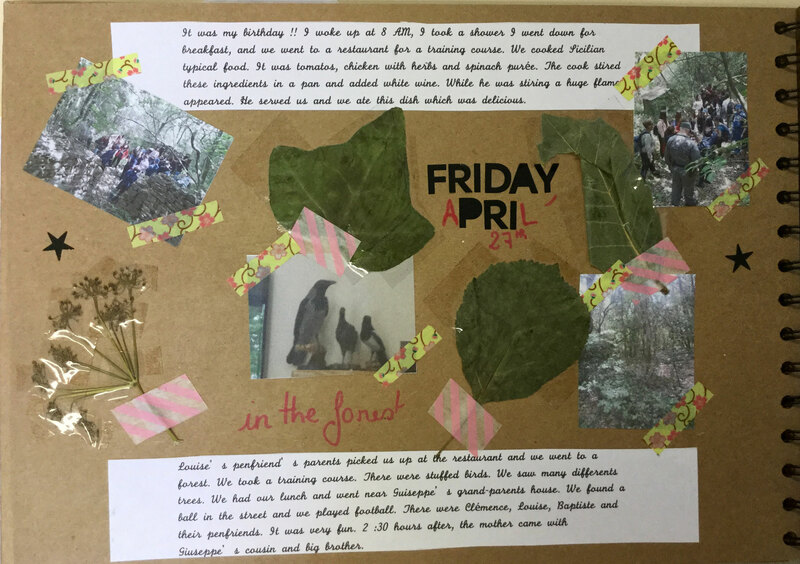 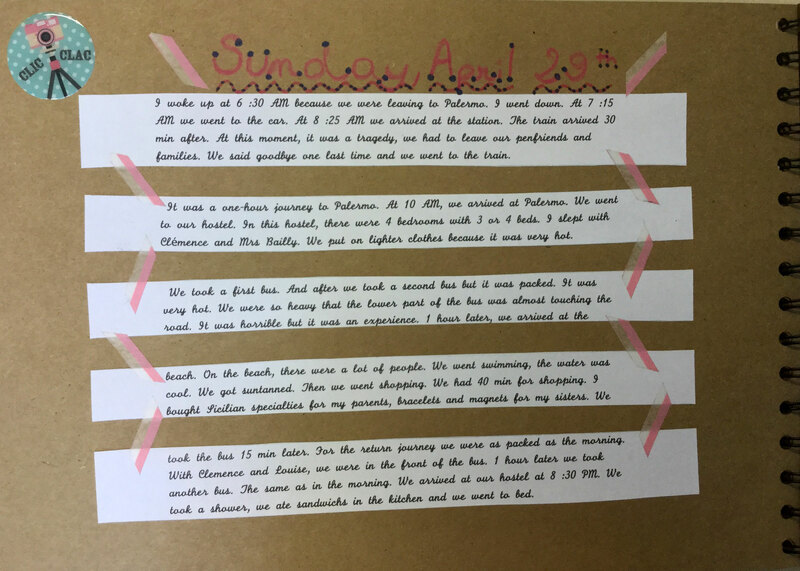 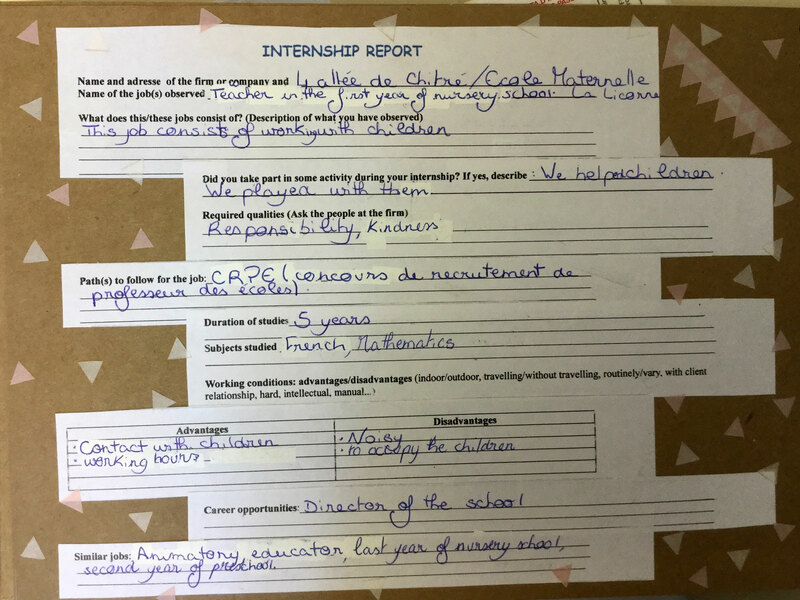 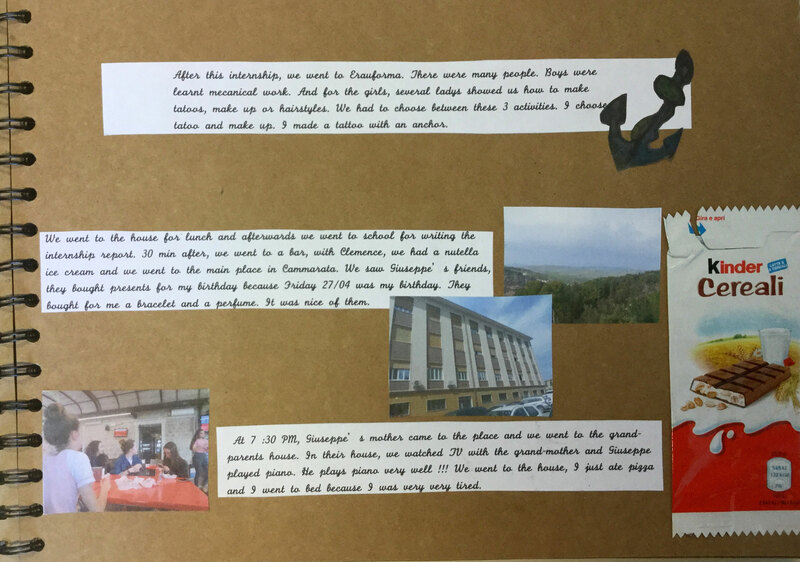 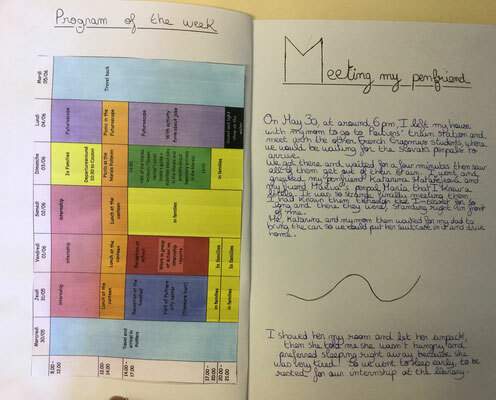 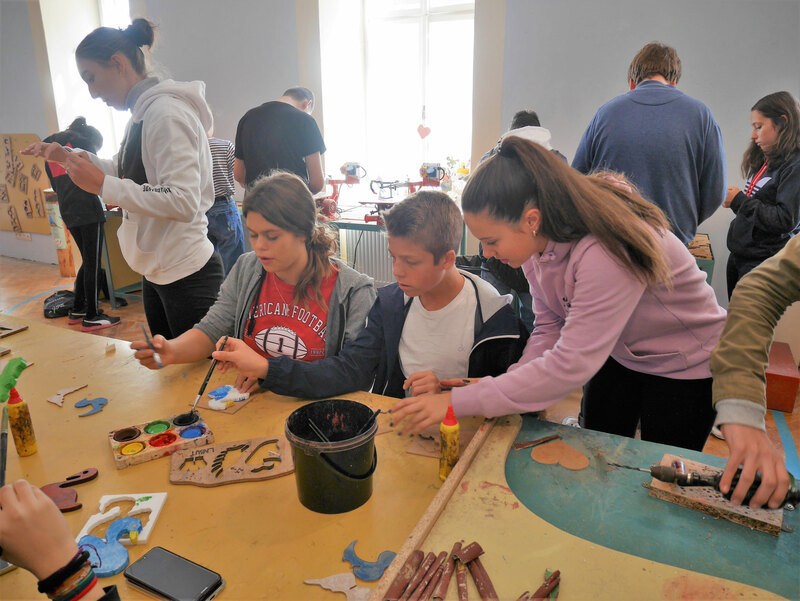 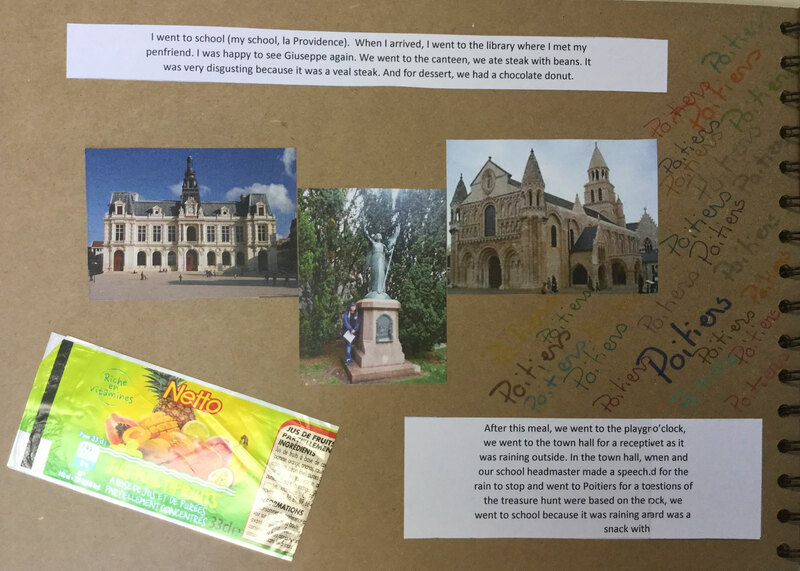 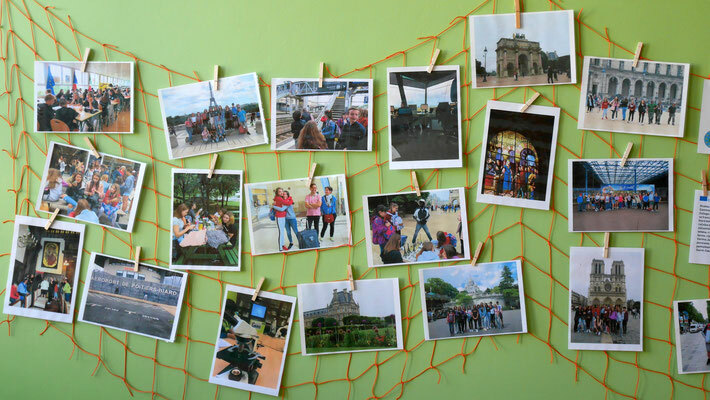 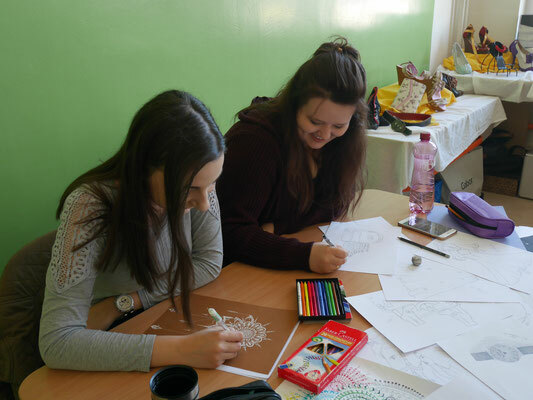 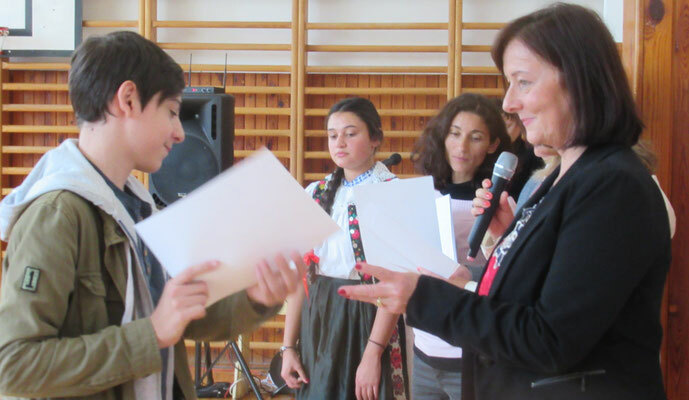 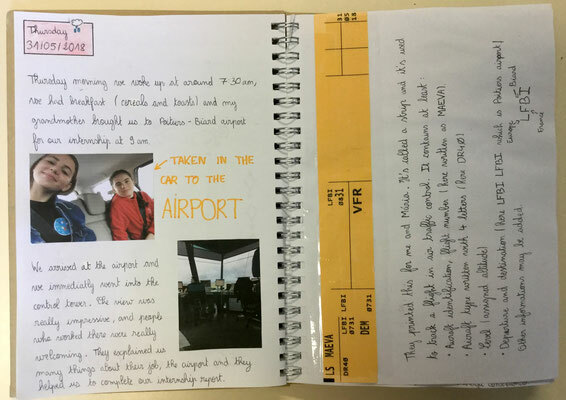 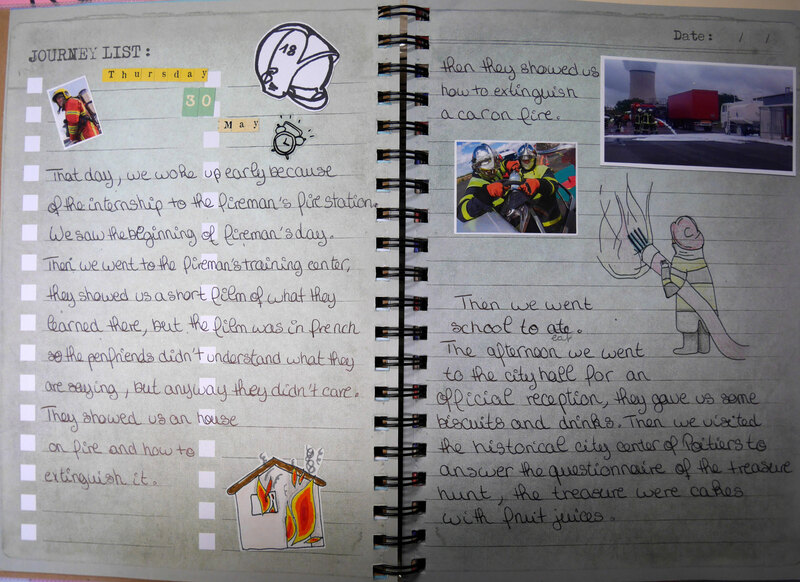 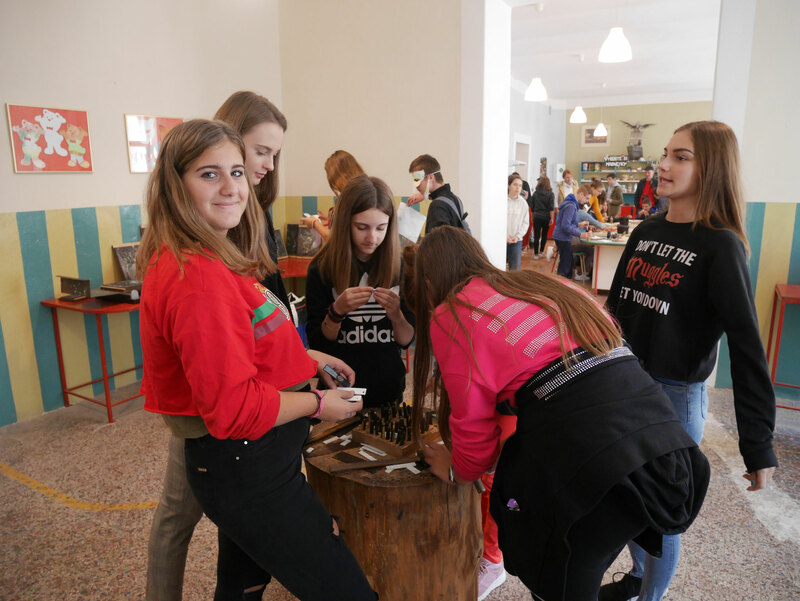 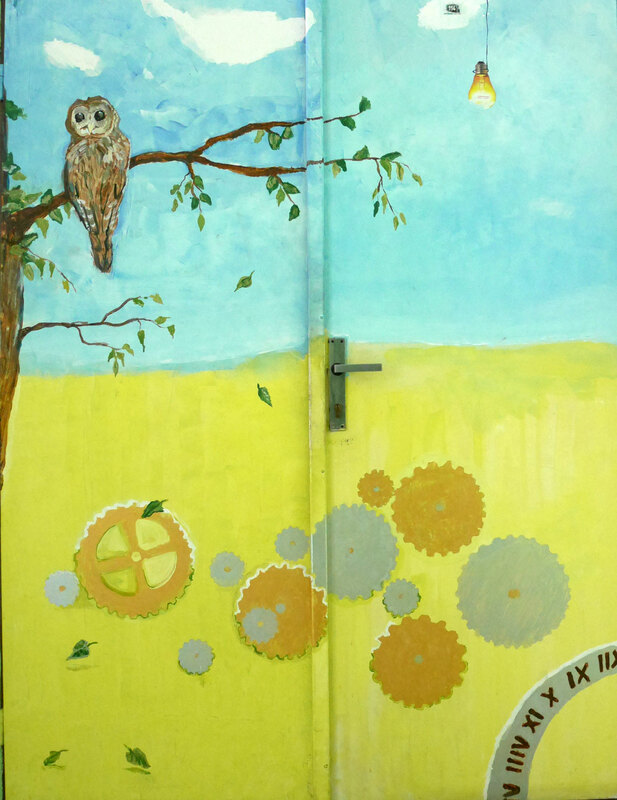 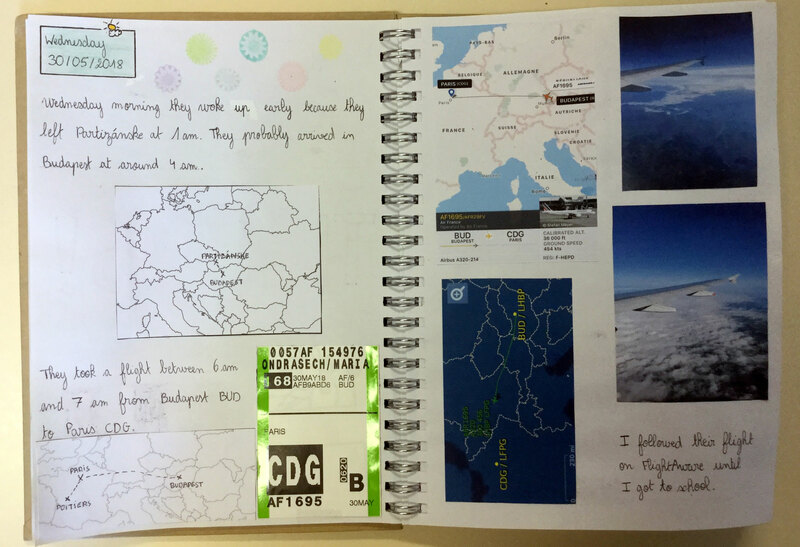 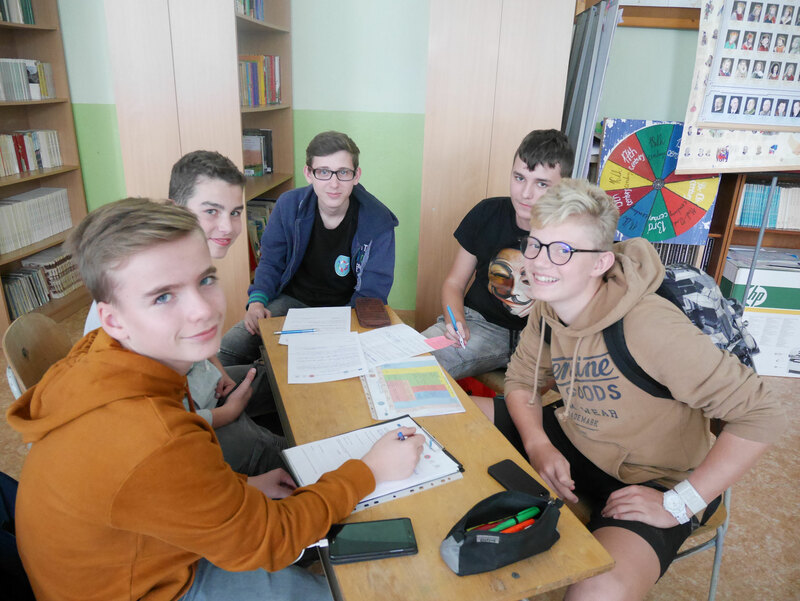 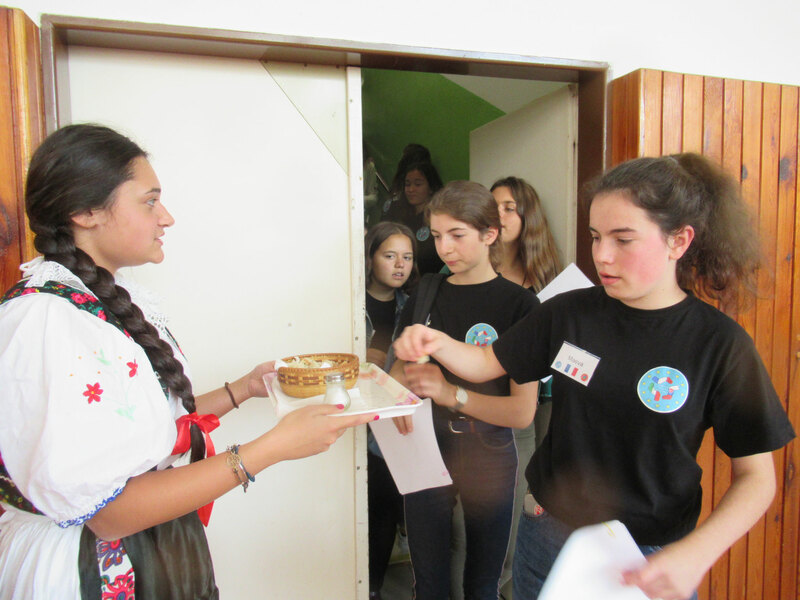 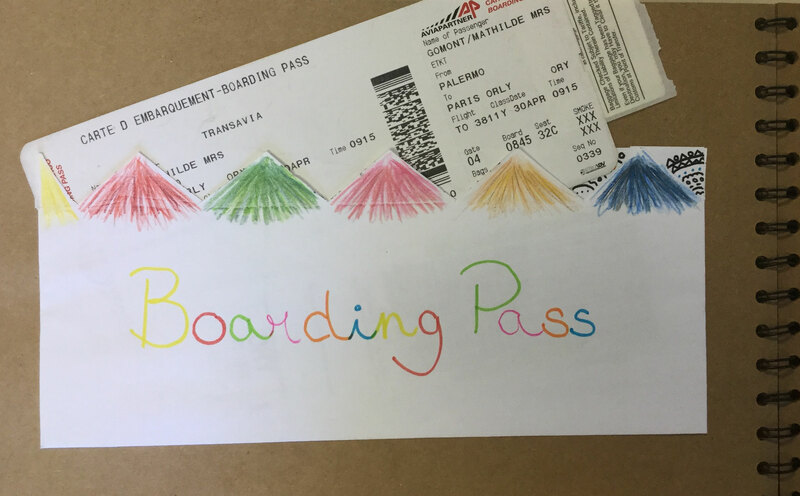 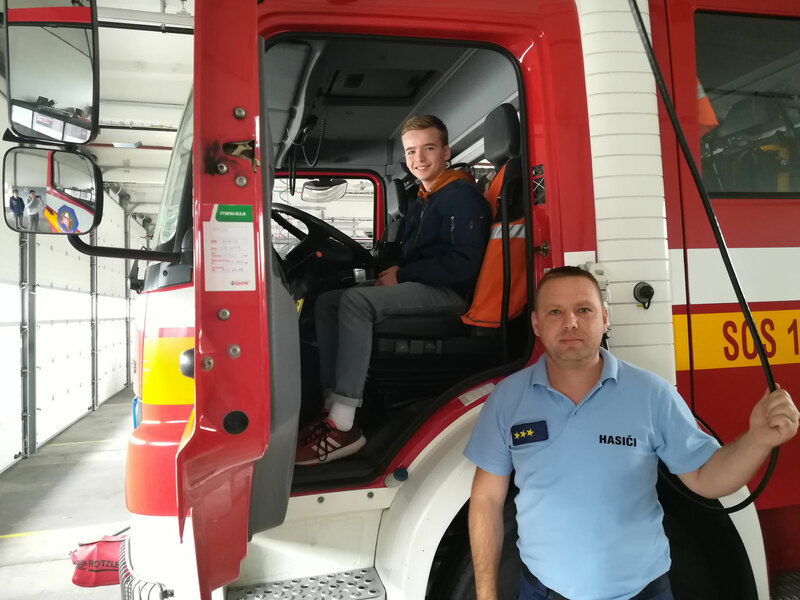 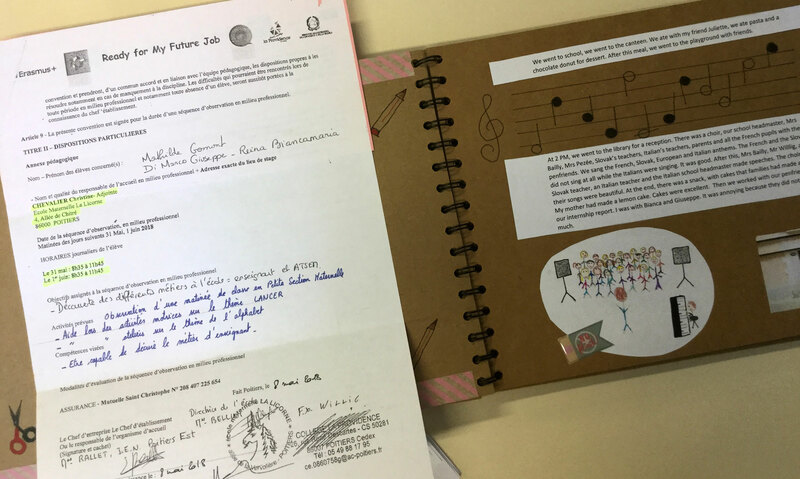 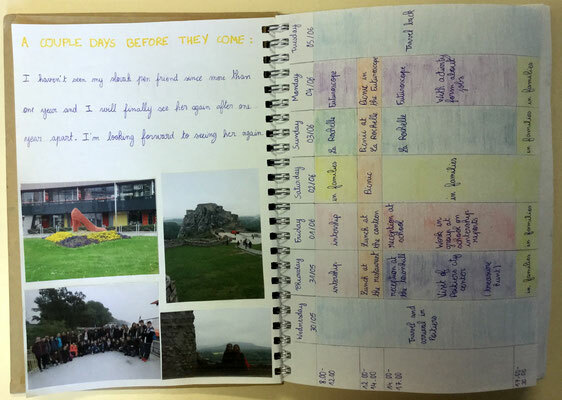 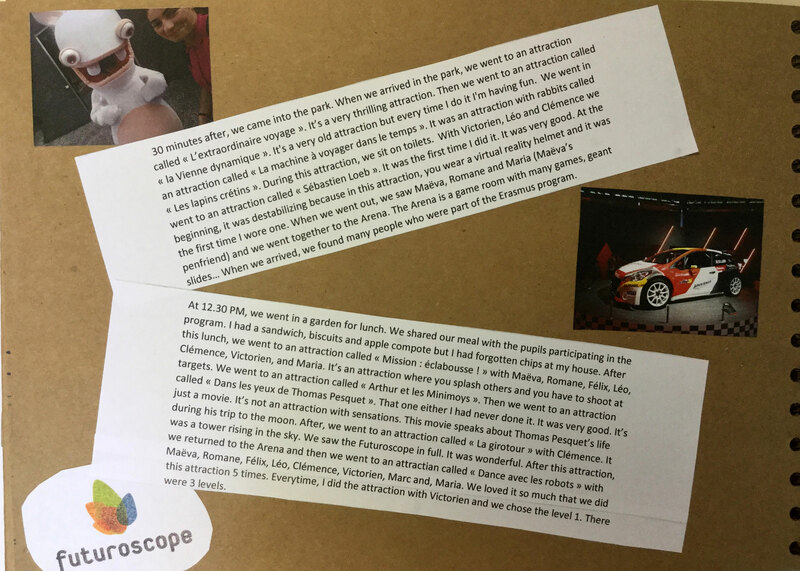 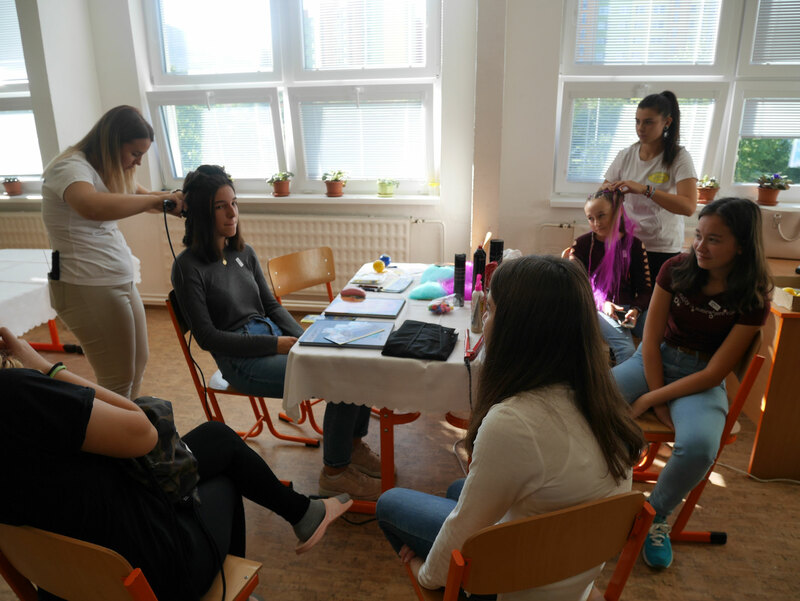 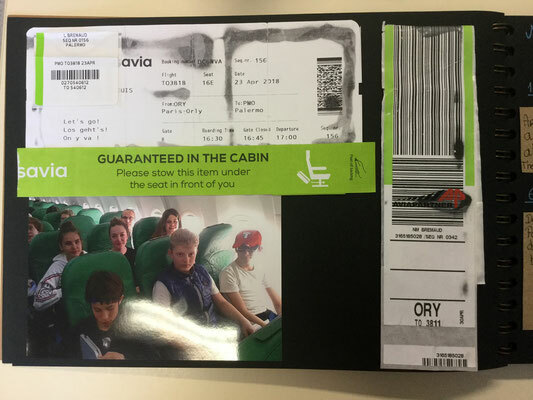 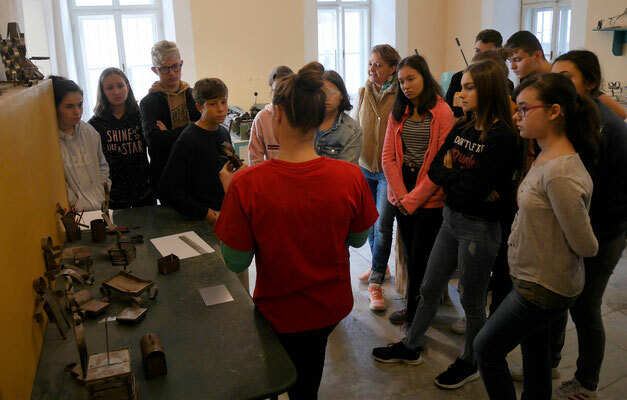 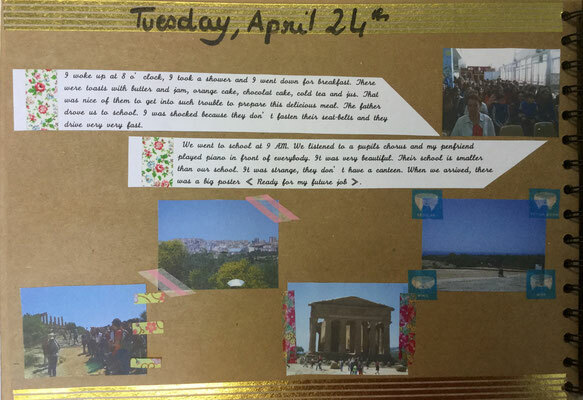 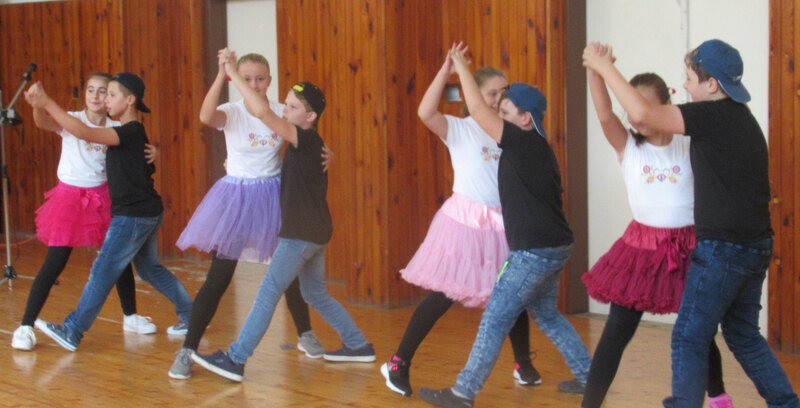 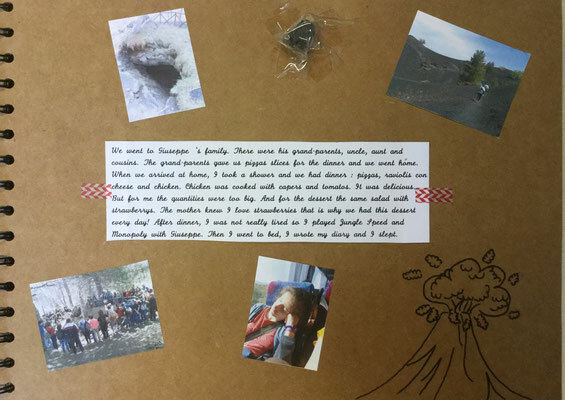 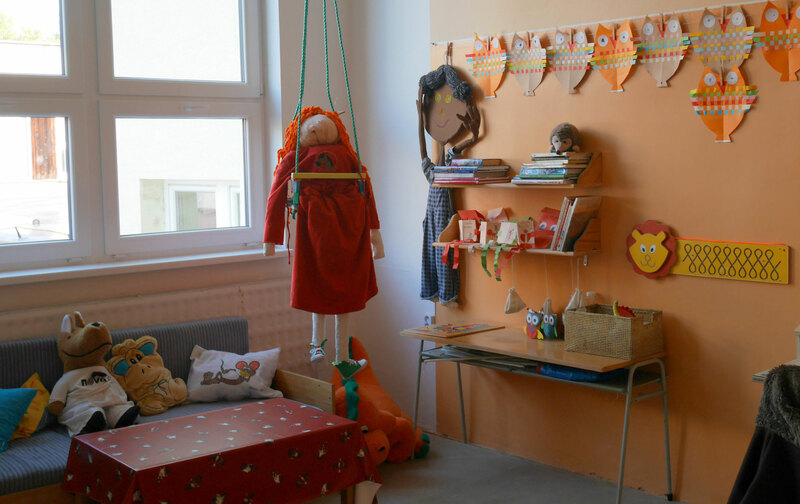 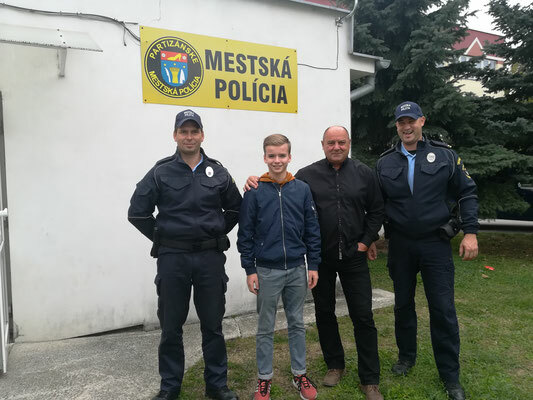 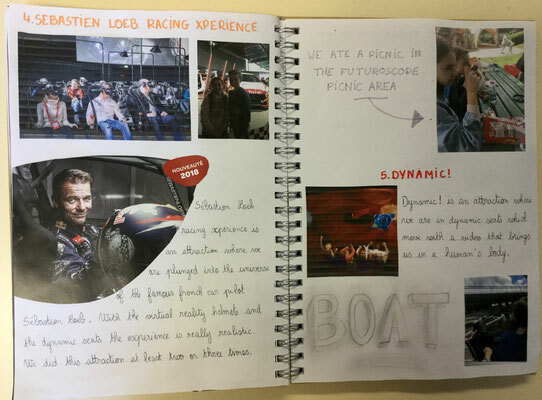 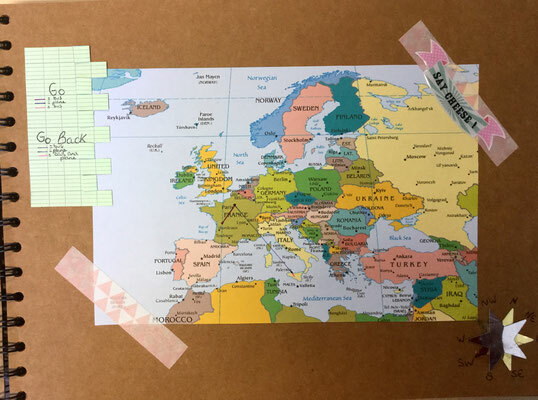 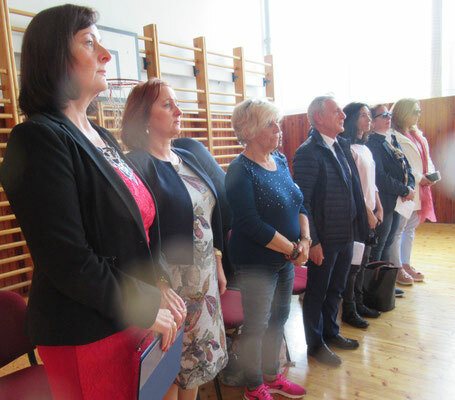 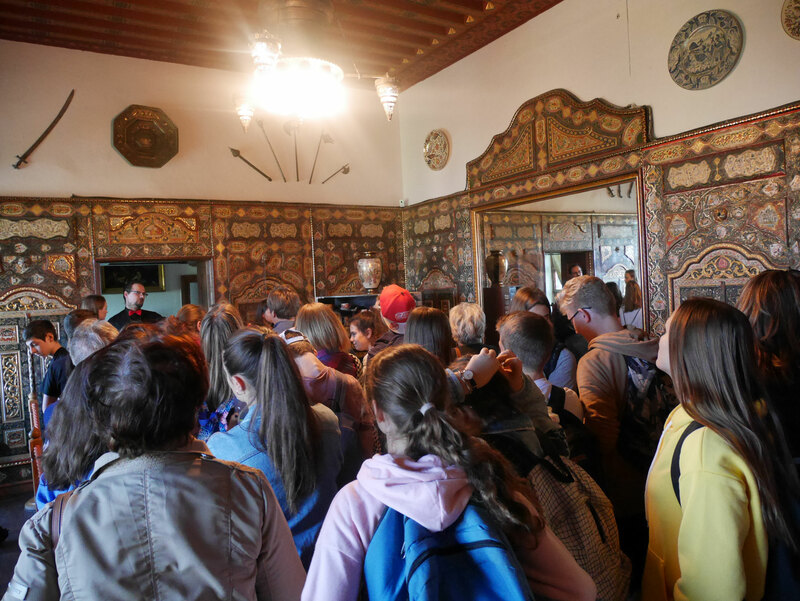 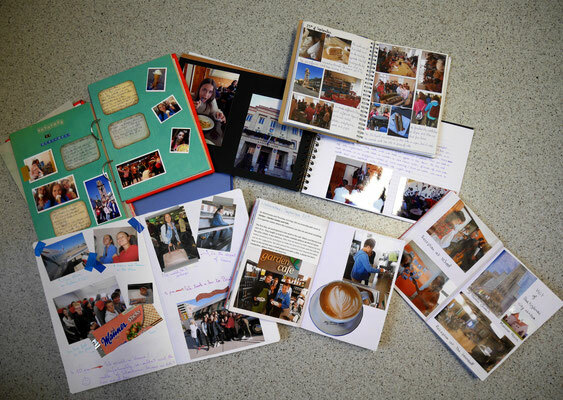 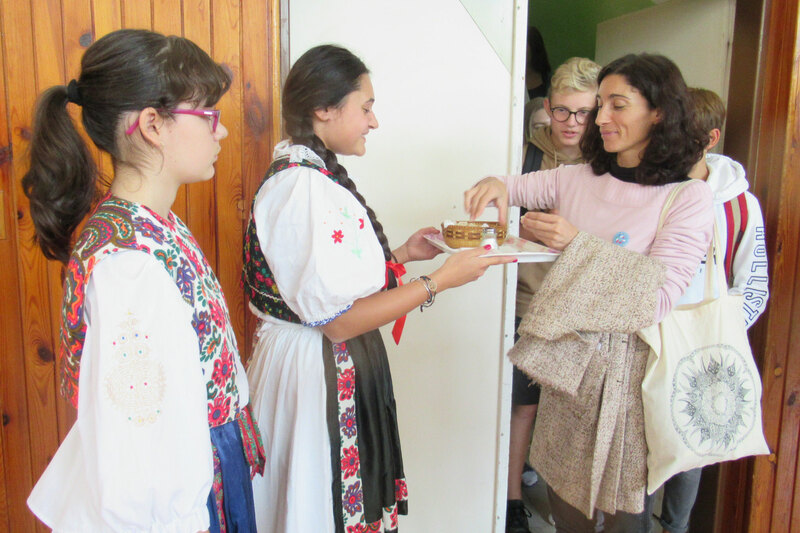 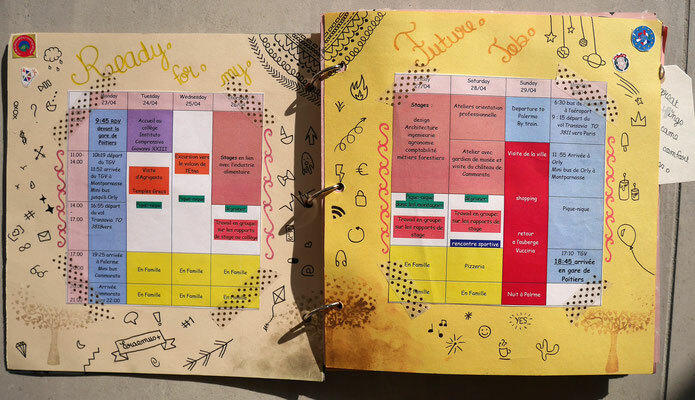 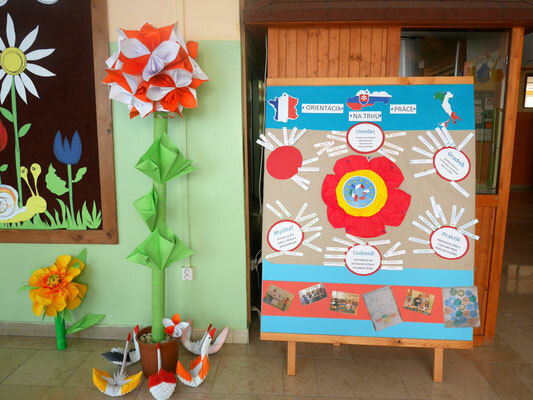 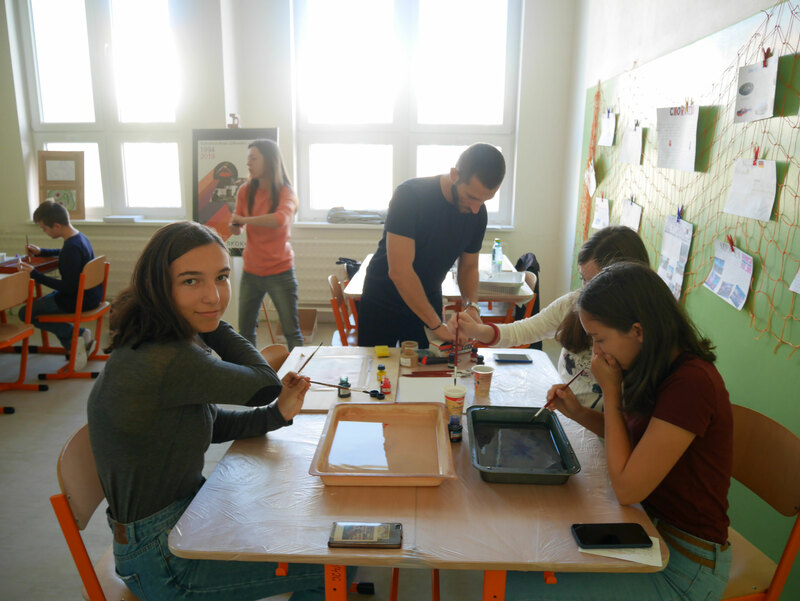 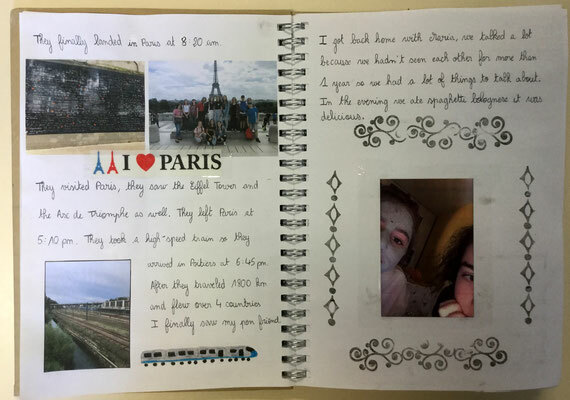 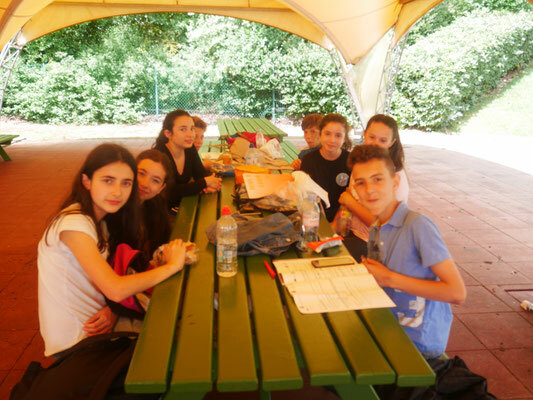 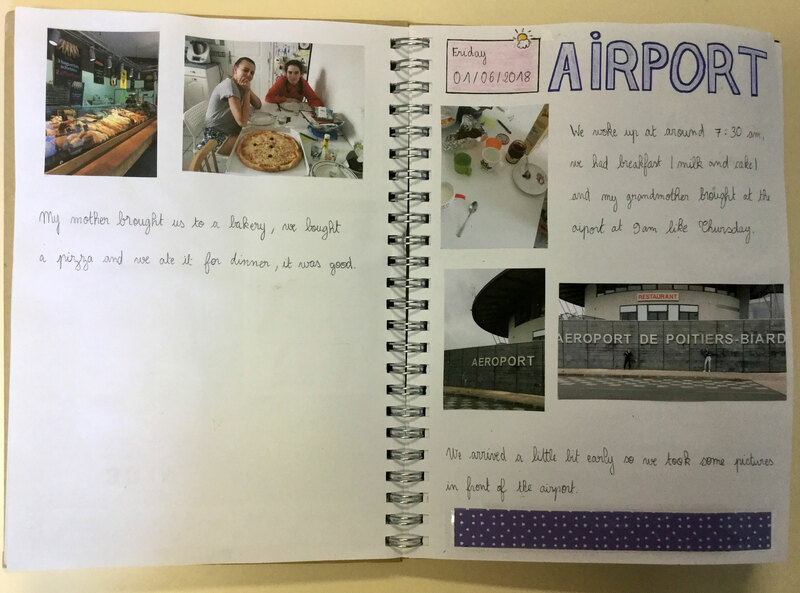 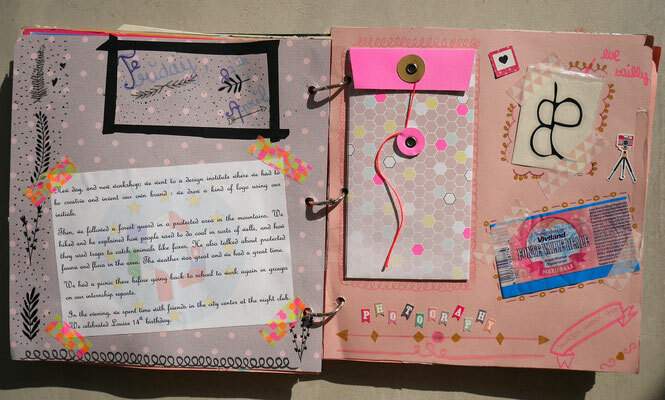 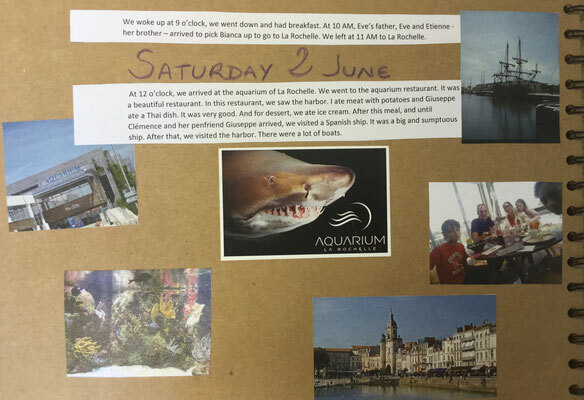 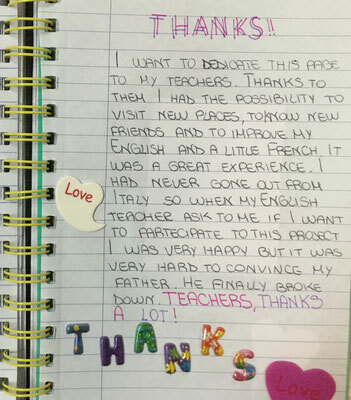 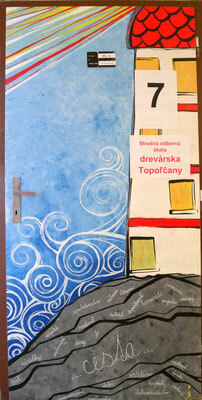 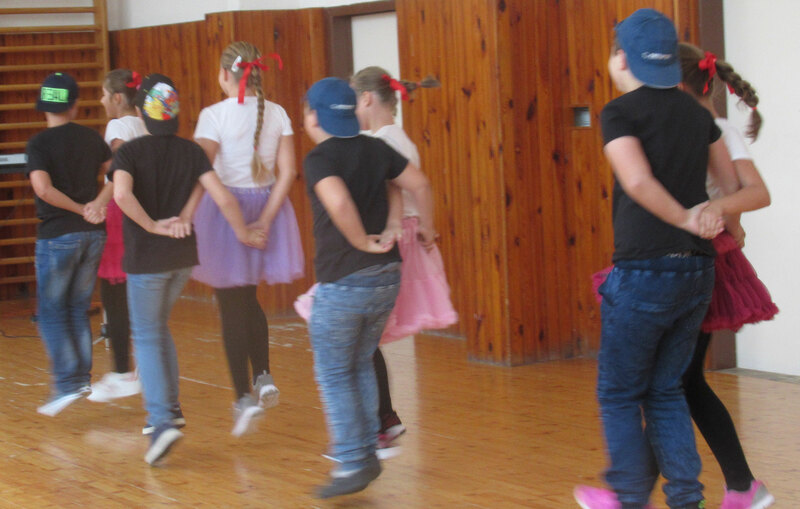 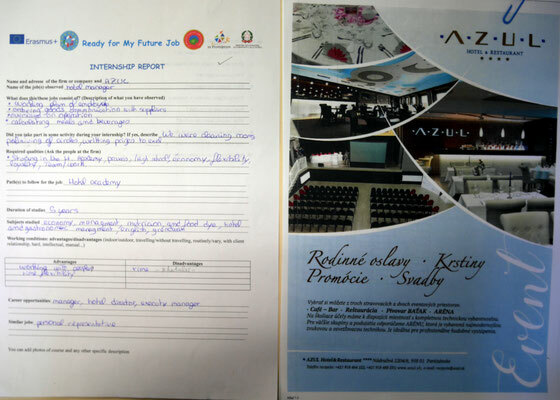 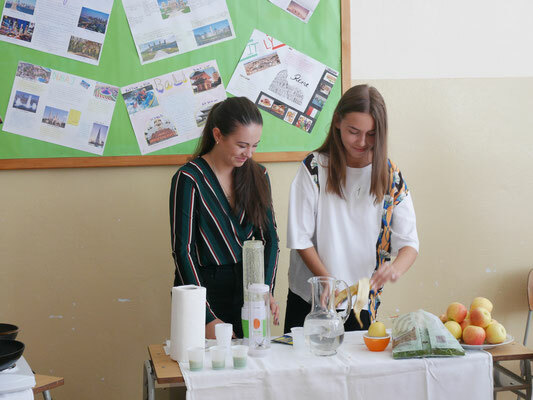 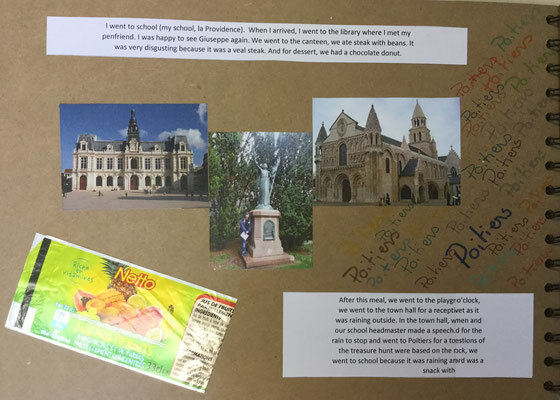 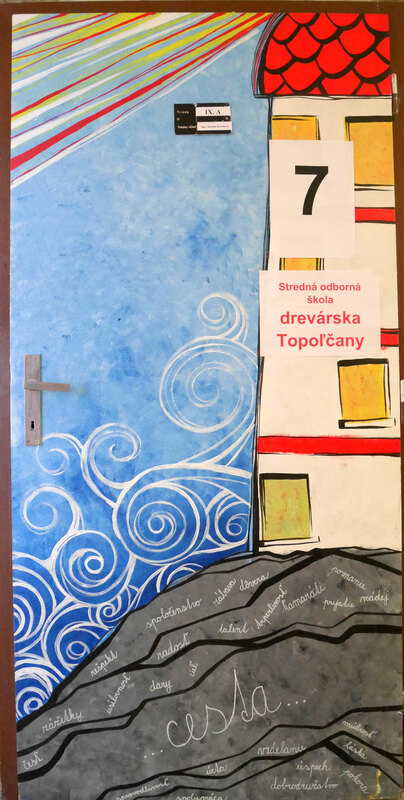 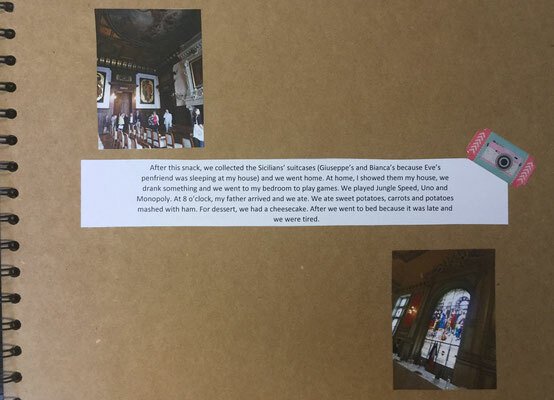 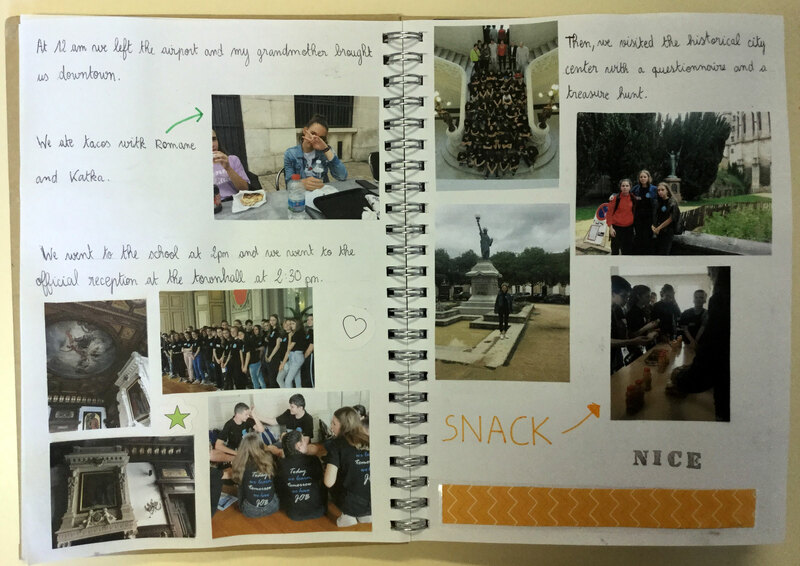 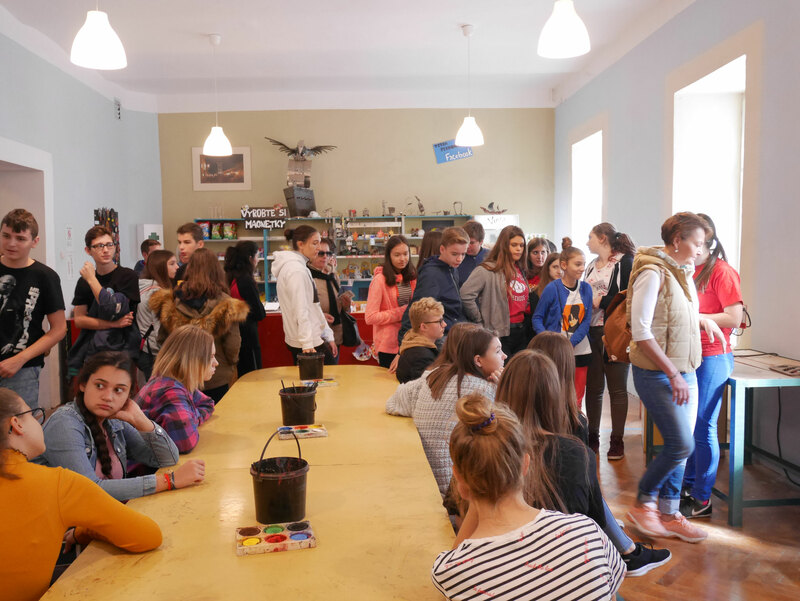 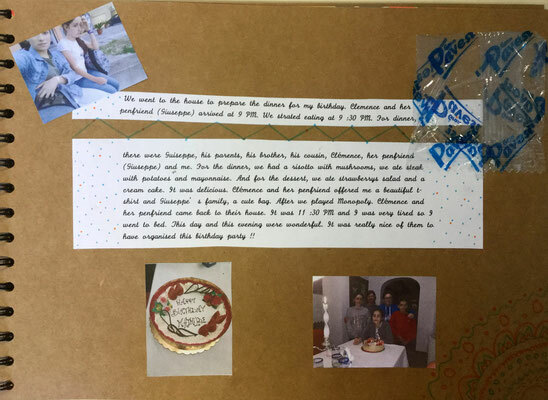 Pupils prepared travel diaries during the Teaching/Learning and Training Activity inPartizanske, Slovakia where they wrote about activities, internships, visits, experiences, host families, partners, feelings, impressions…. 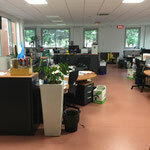 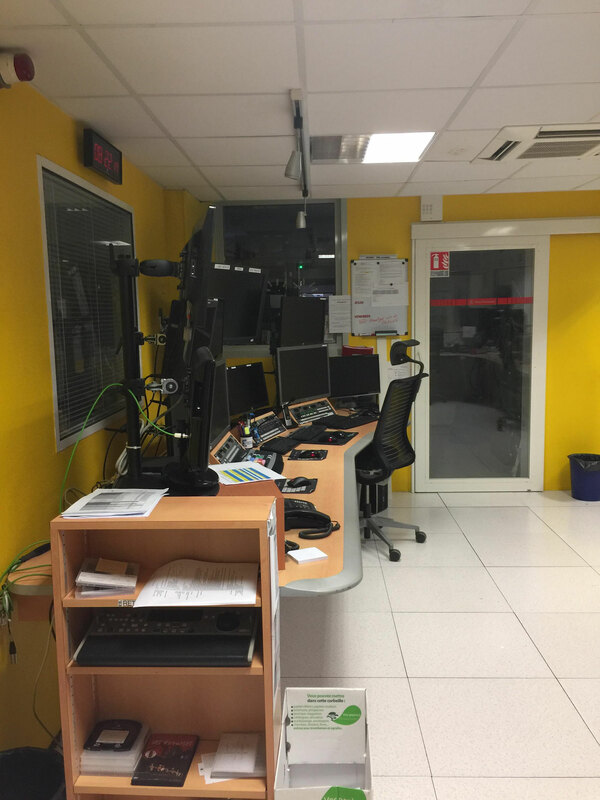 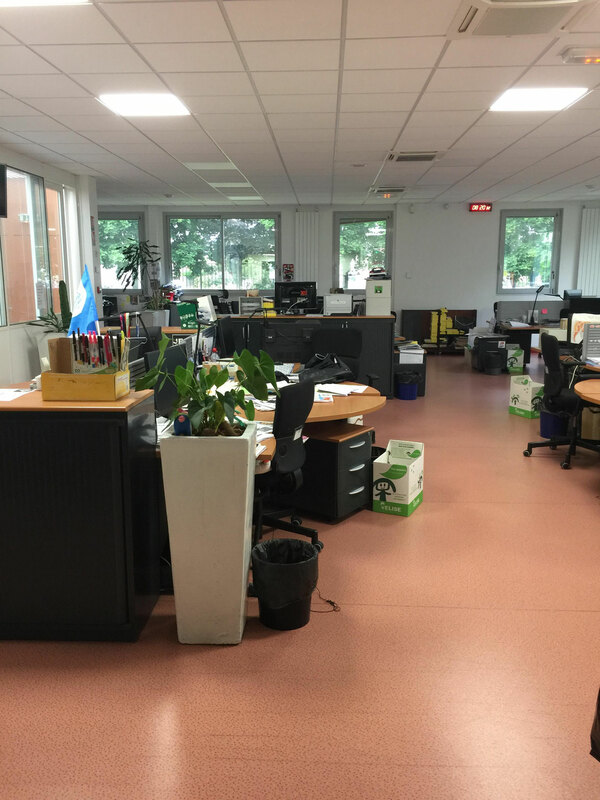 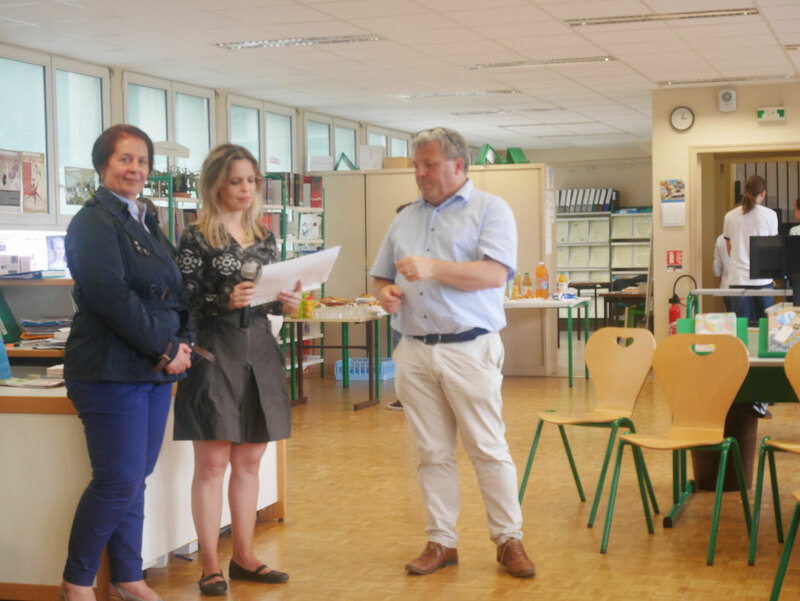 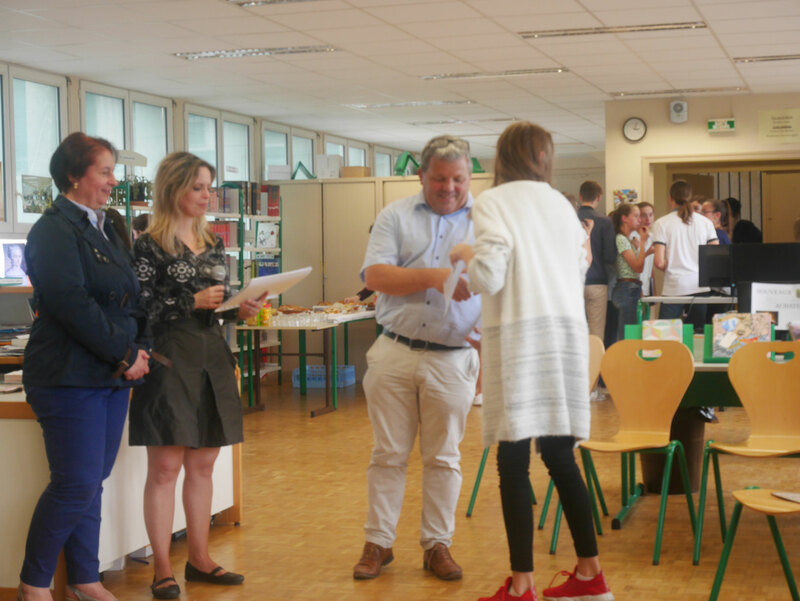 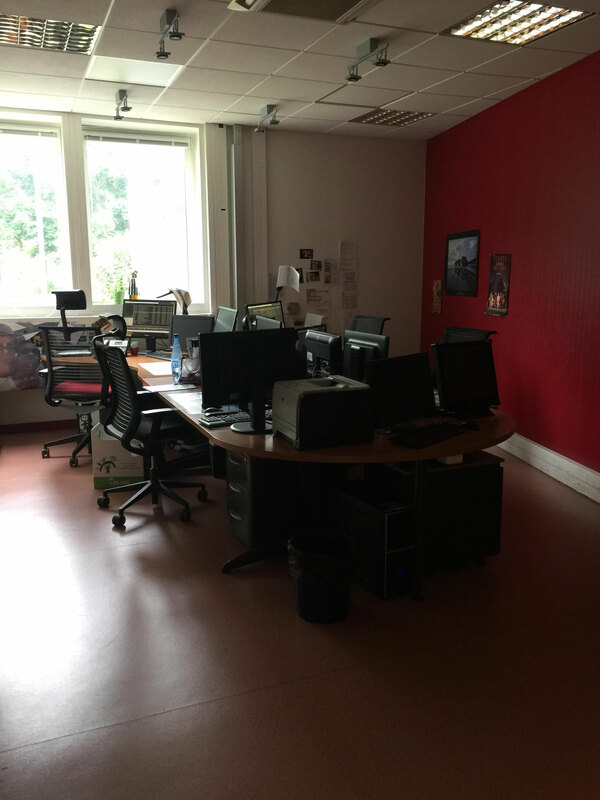 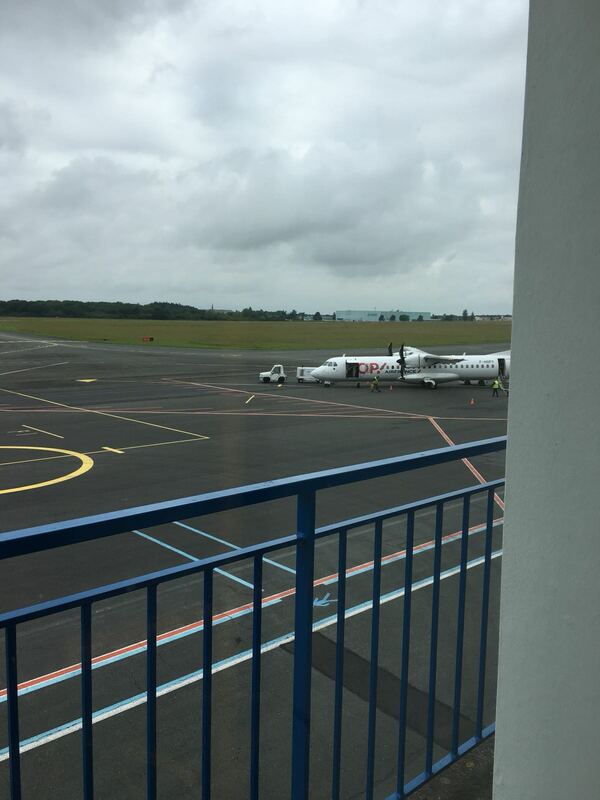 The reception week in Collège La Providence in Poitiers from 30 May to 5 June 2018, consisted of 3 mornings of internship for our Erasmus+ Pupils in international pairs, in 22 different firms. 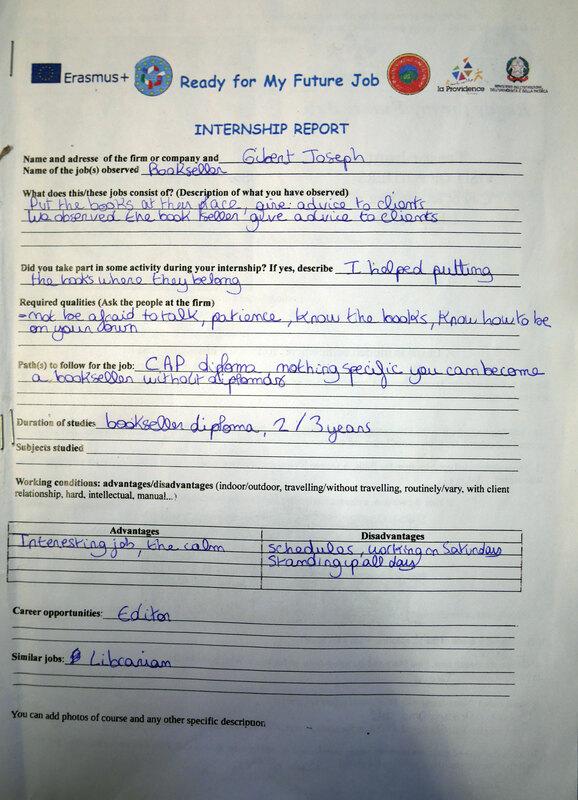 Then, they worked on their internship reports together. 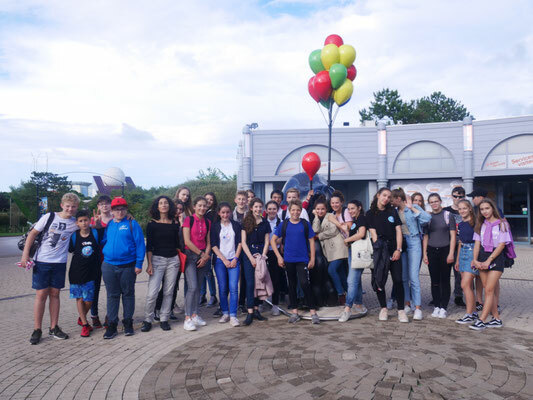 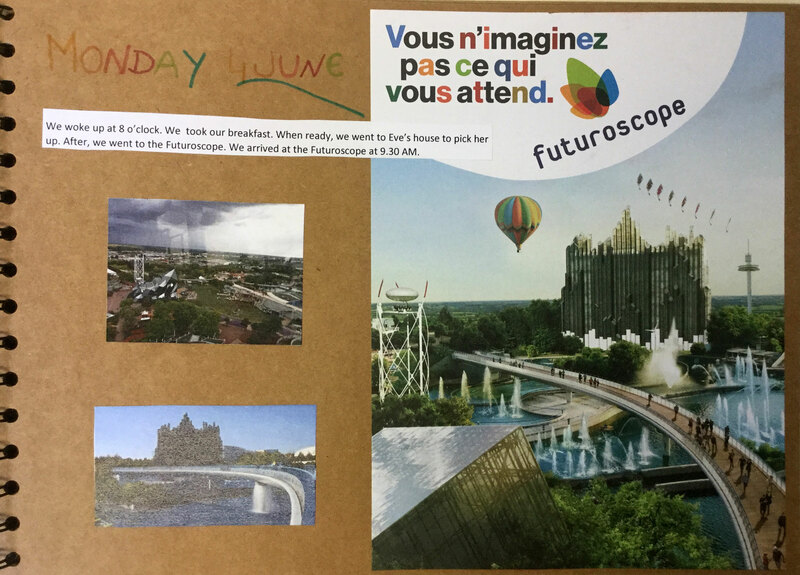 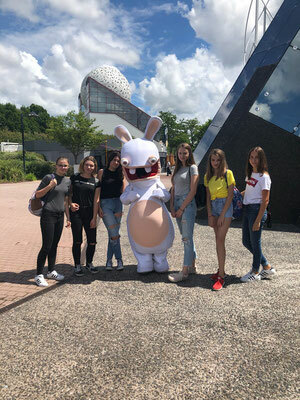 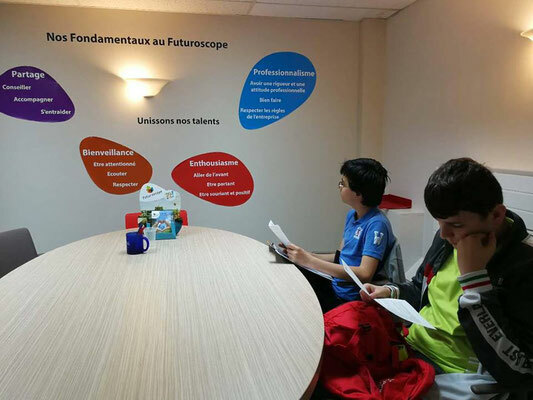 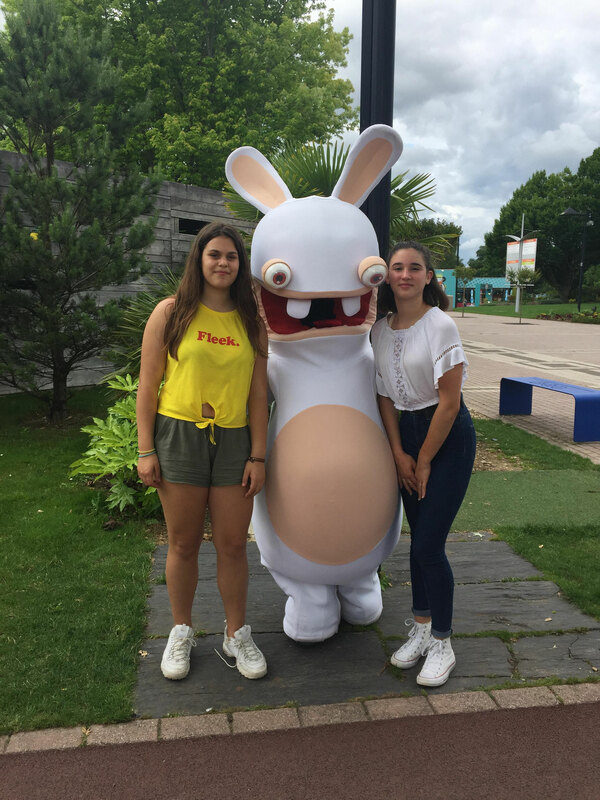 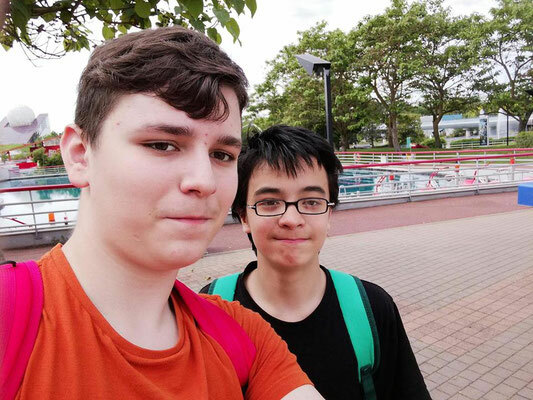 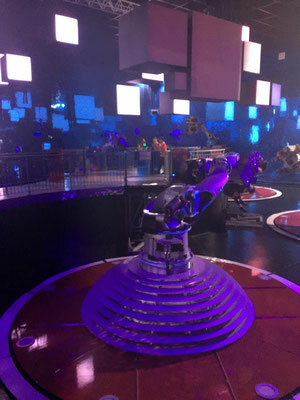 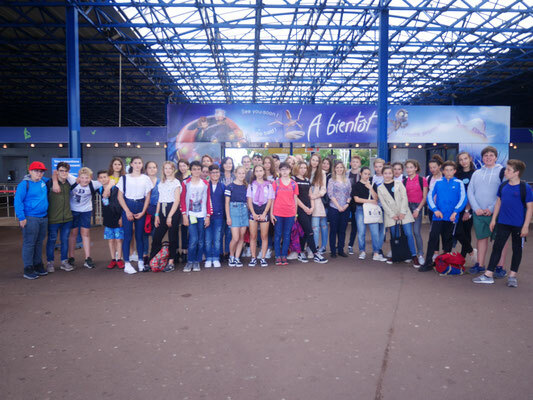 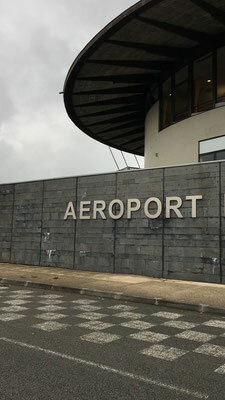 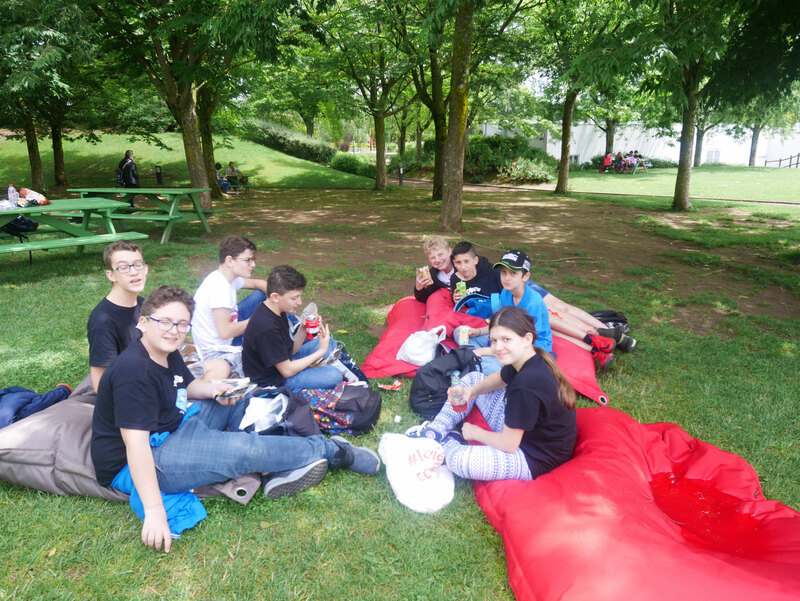 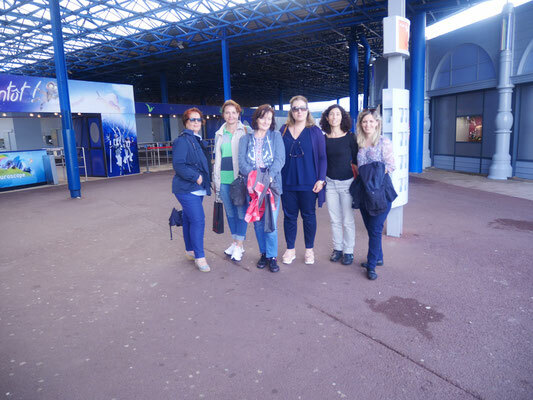 All the international group was also welcomed at the townhall and in the school, and spent a day at the Futuroscope, our famous leisure park, where they had to find 3 main sectors of, activity and in each sector examples of jobs by interviewing employees there. 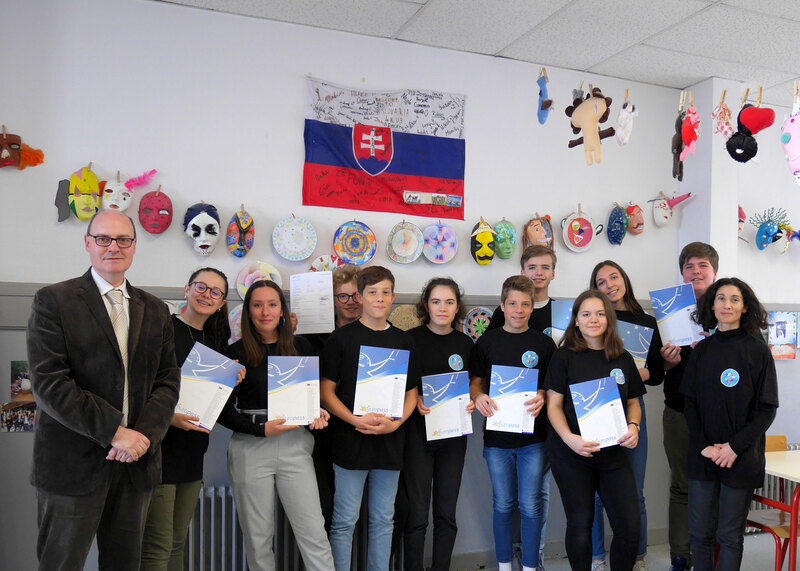 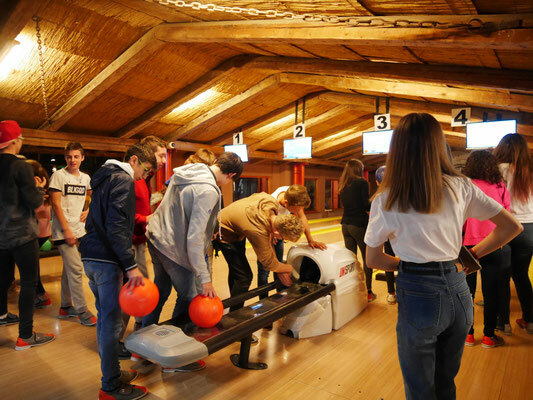 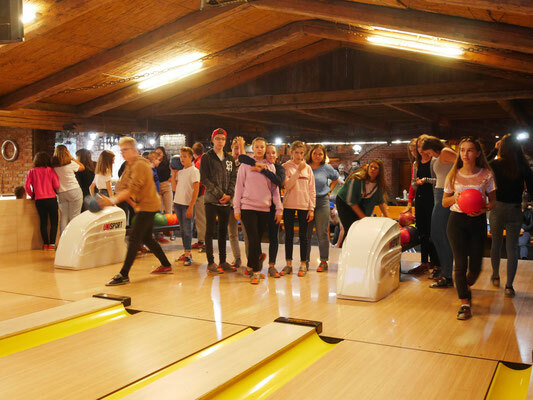 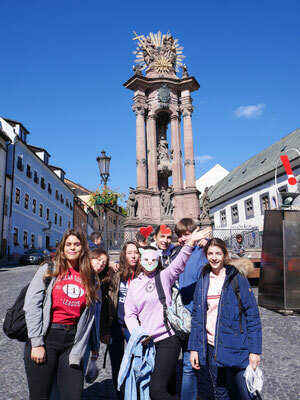 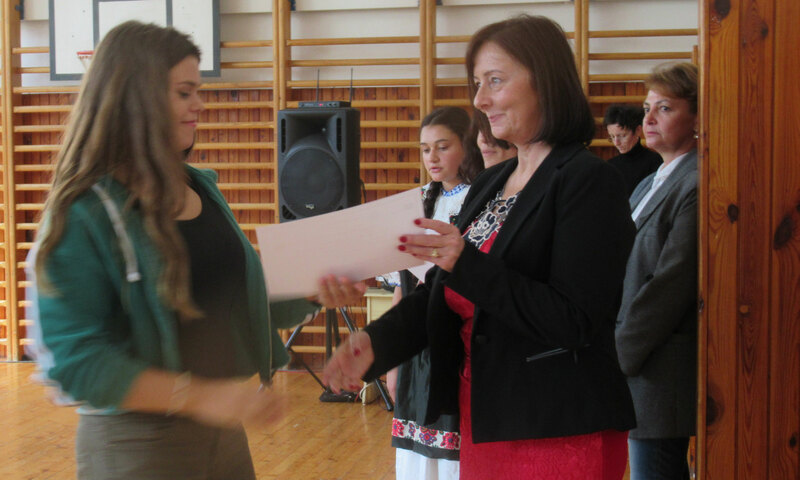 They all spent time in families and enjoyed activities with their partners while improving their English and communication skills: They also acquired new competences with the internships and common work on reports, they leant about new jobs and even leant common Slovak, French and Italian expressions and phrases. Now they are looking forward to meet their partners again in Partizanske, Slovakia, next september. 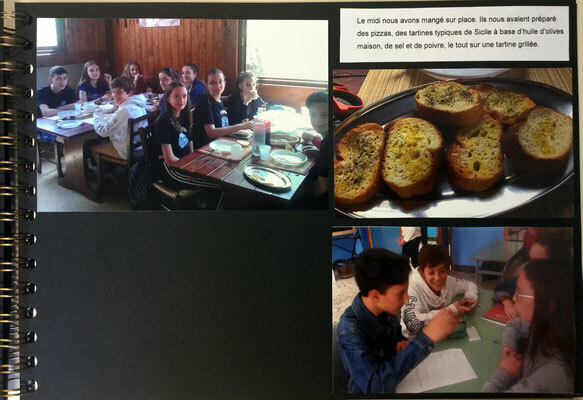 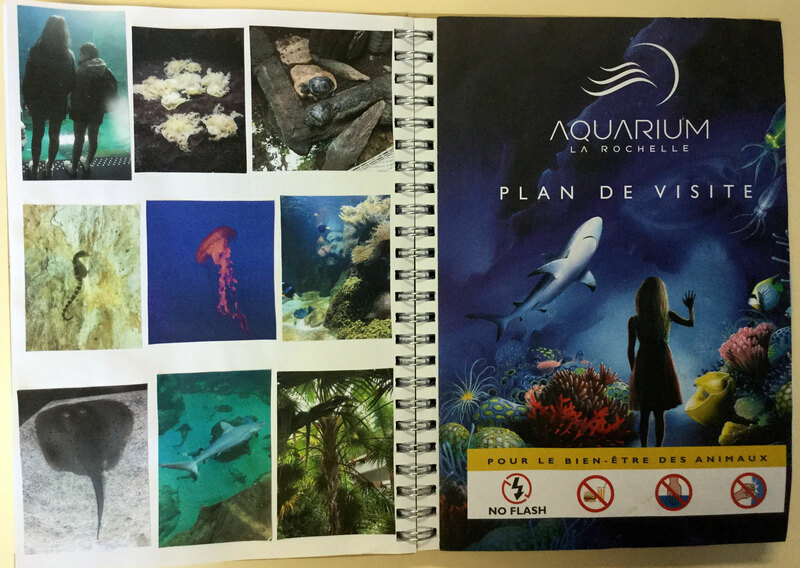 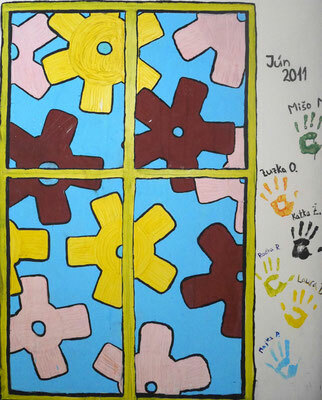 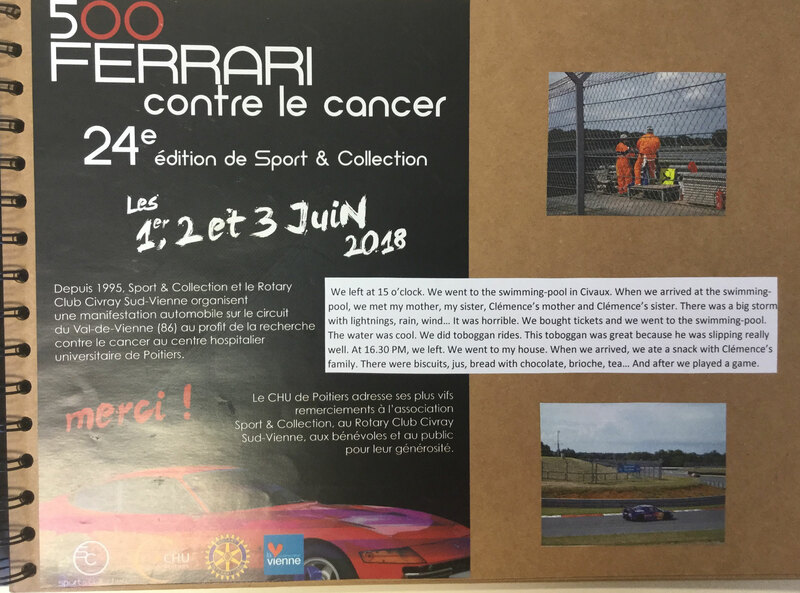 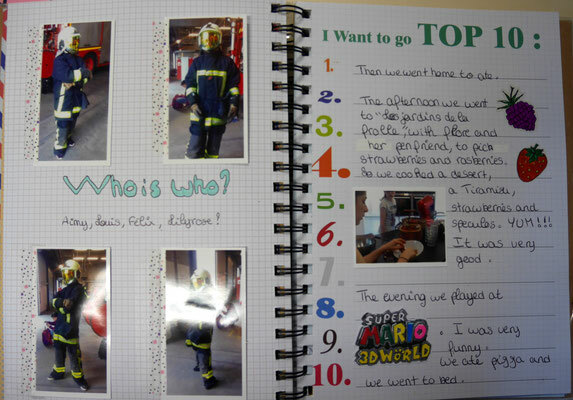 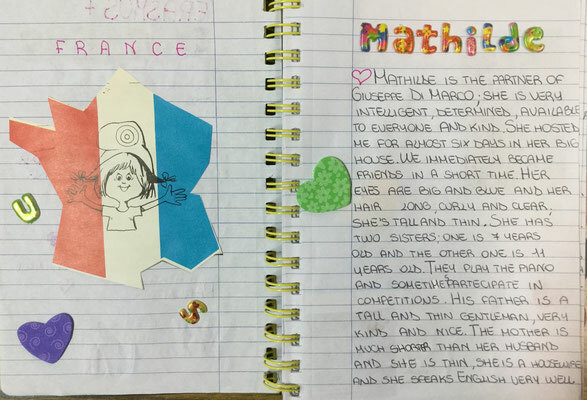 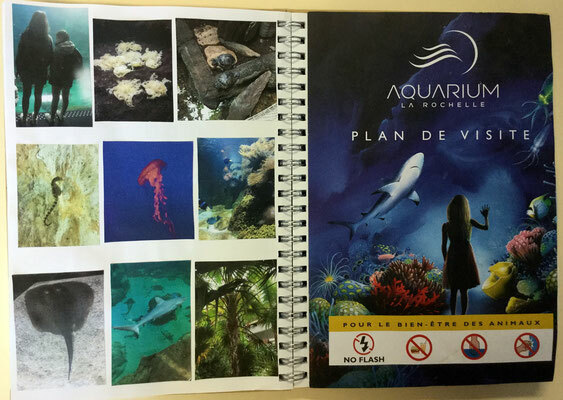 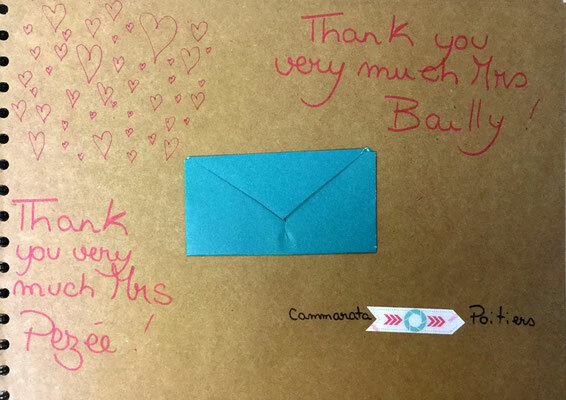 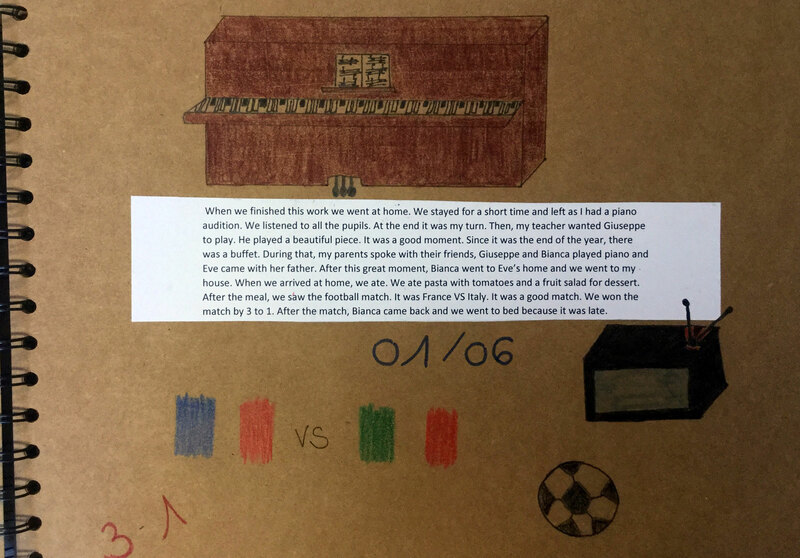 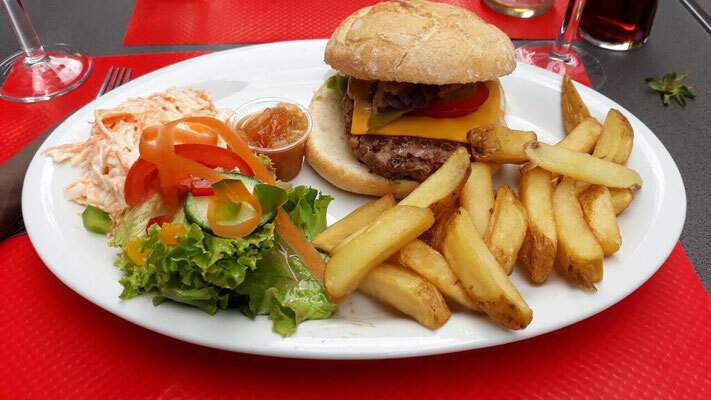 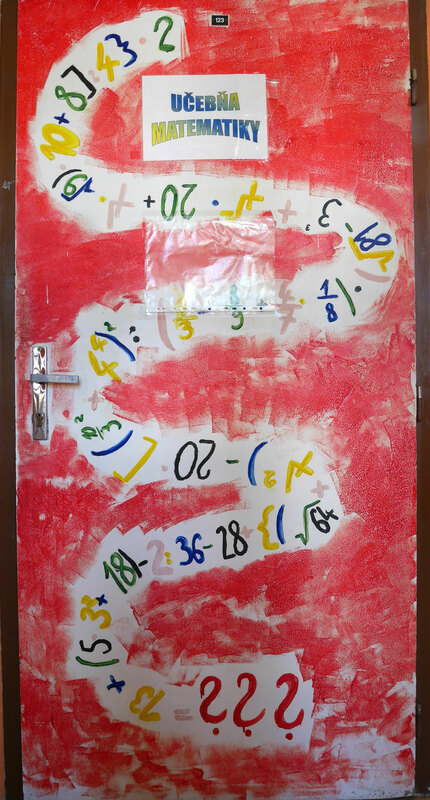 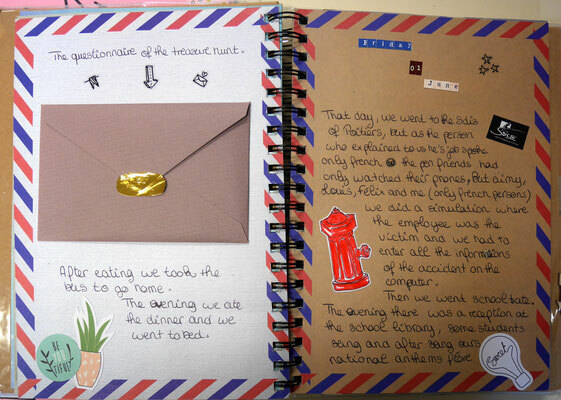 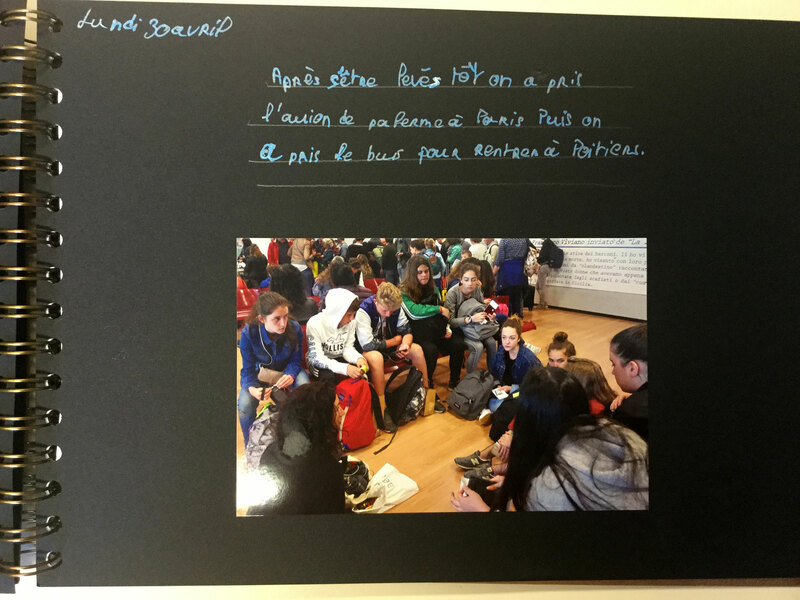 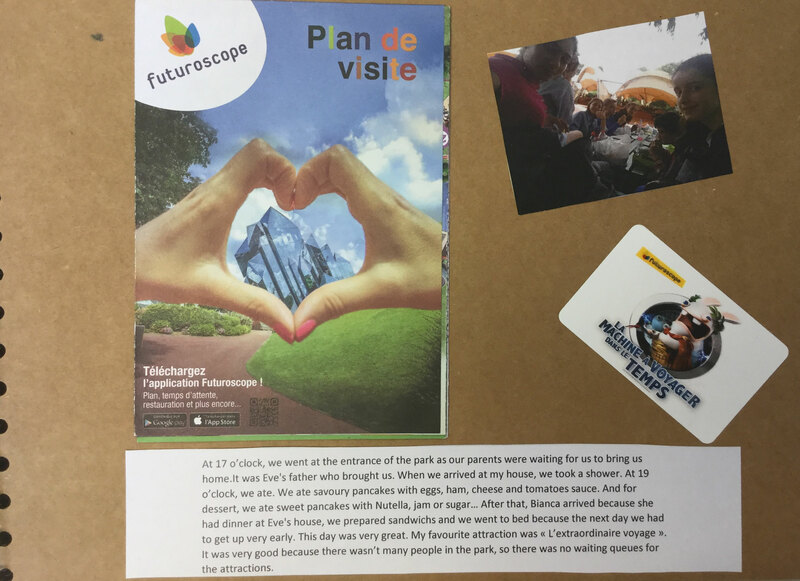 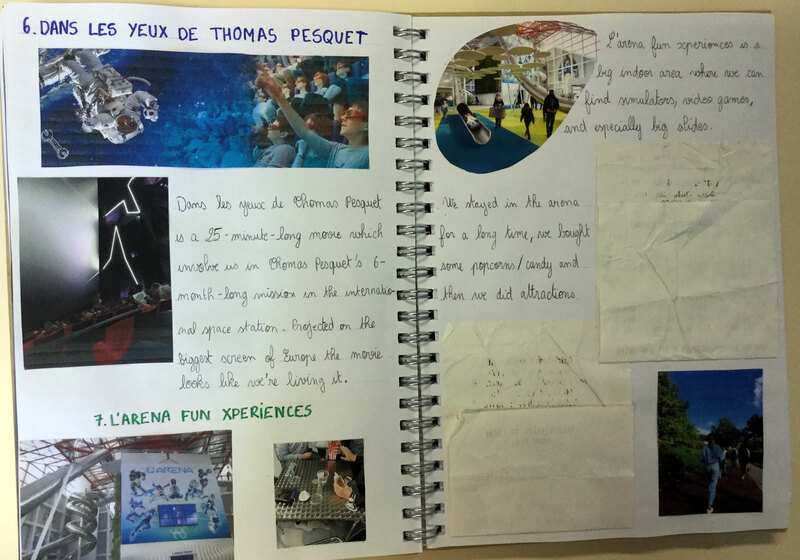 This is an example of the booklet given to all the pupils during the reception week in Poitiers. 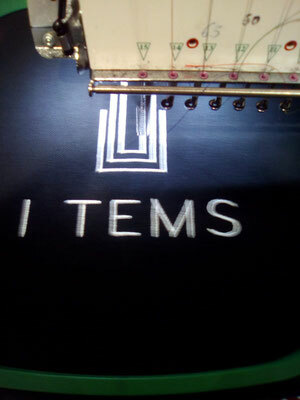 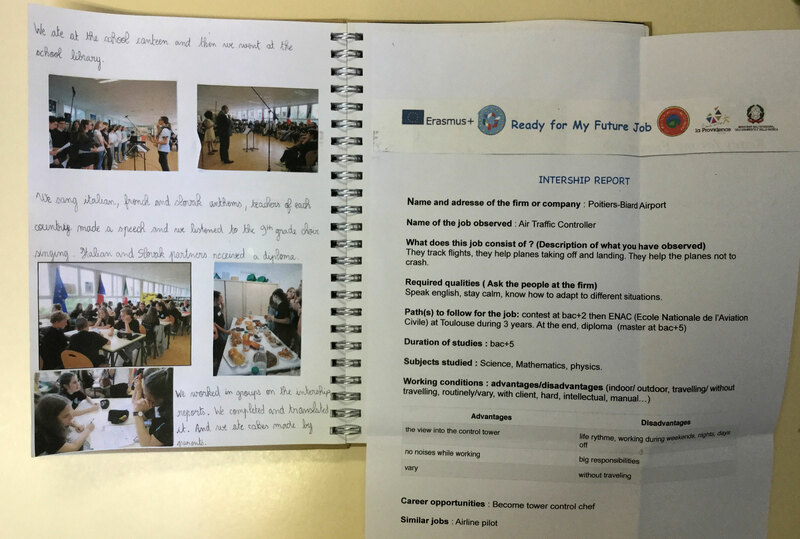 It contains the timetable, the instructions, the activities planned, the papers to fill in during some activities, the instructions to do the internship report and the evaluation paper. 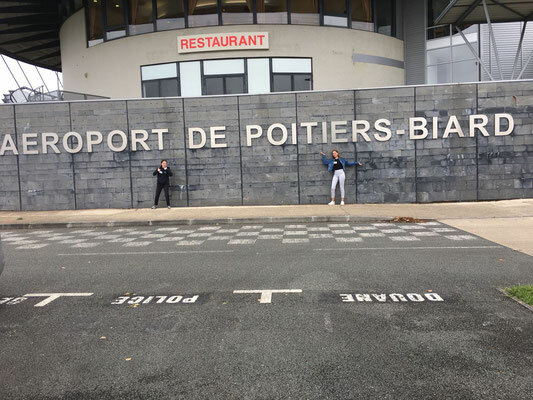 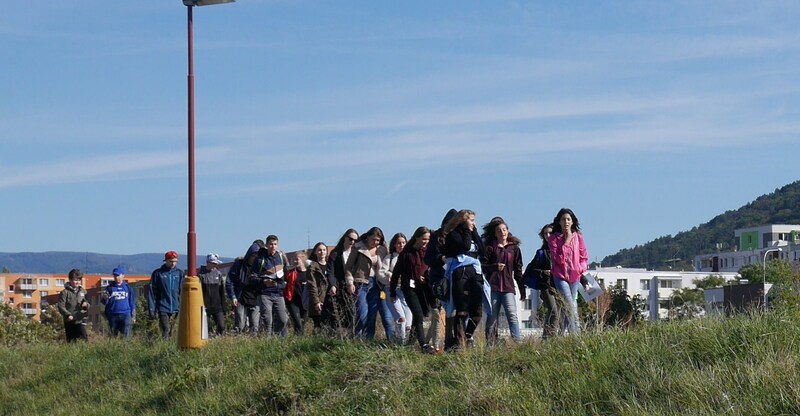 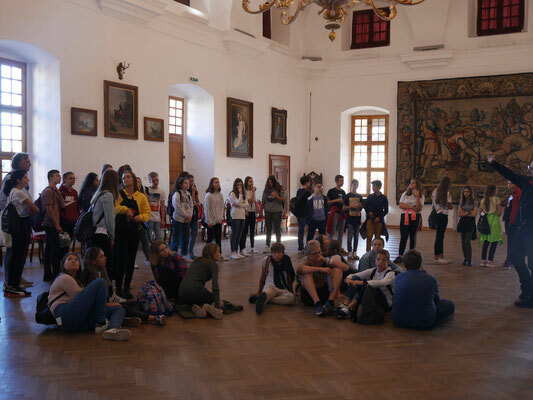 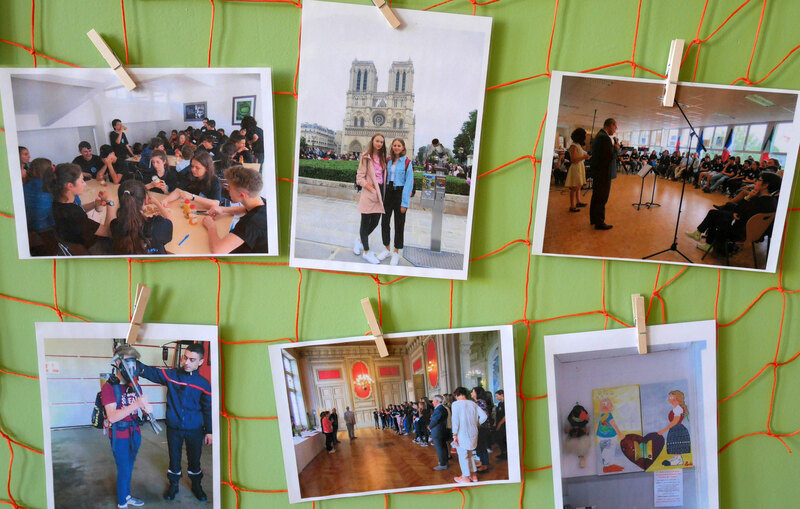 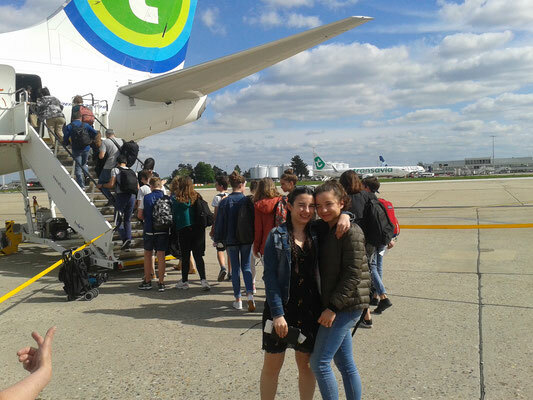 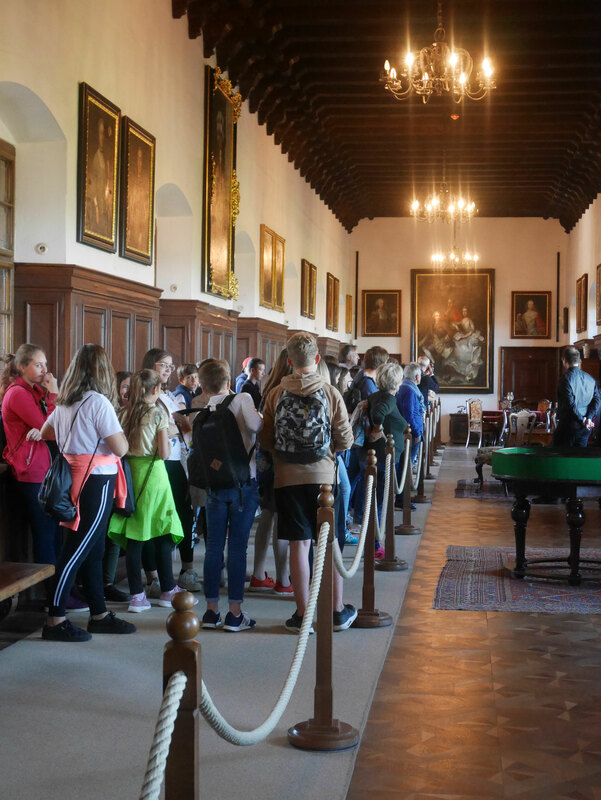 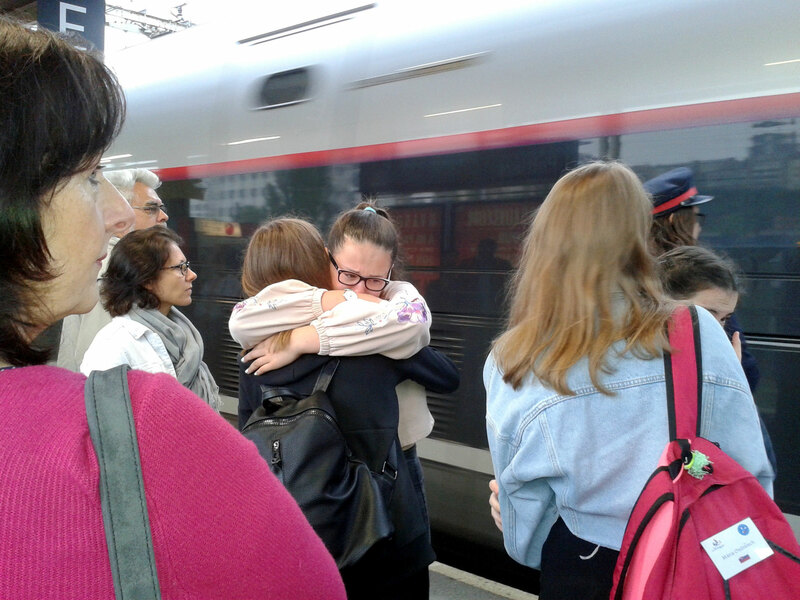 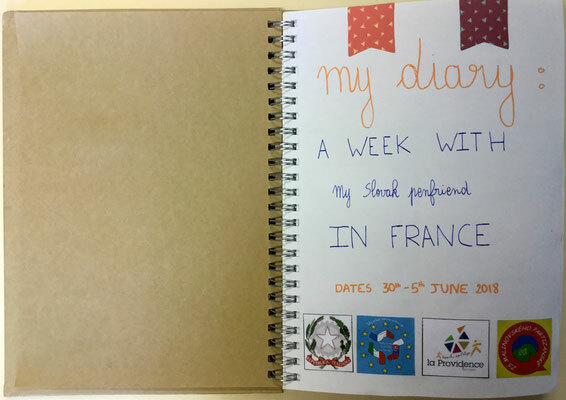 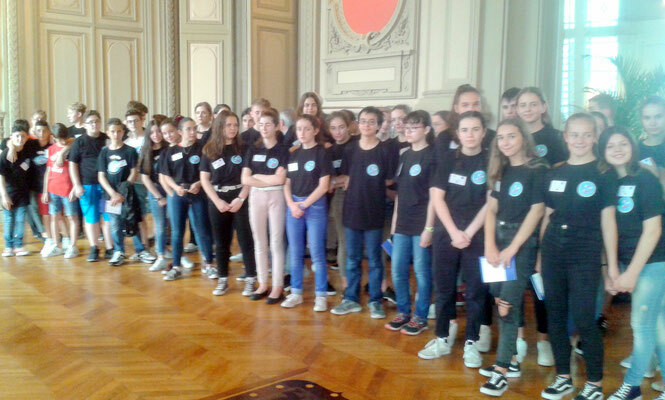 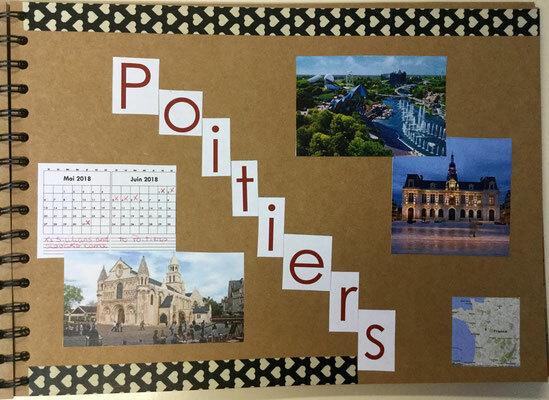 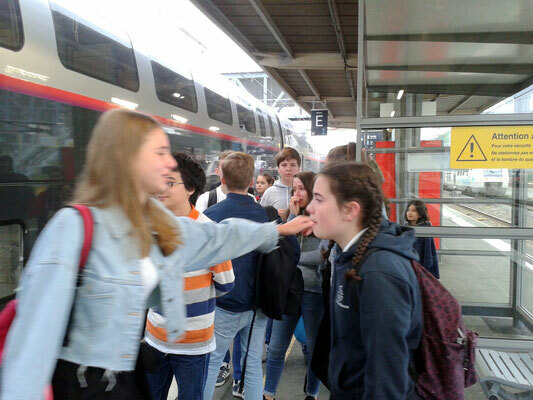 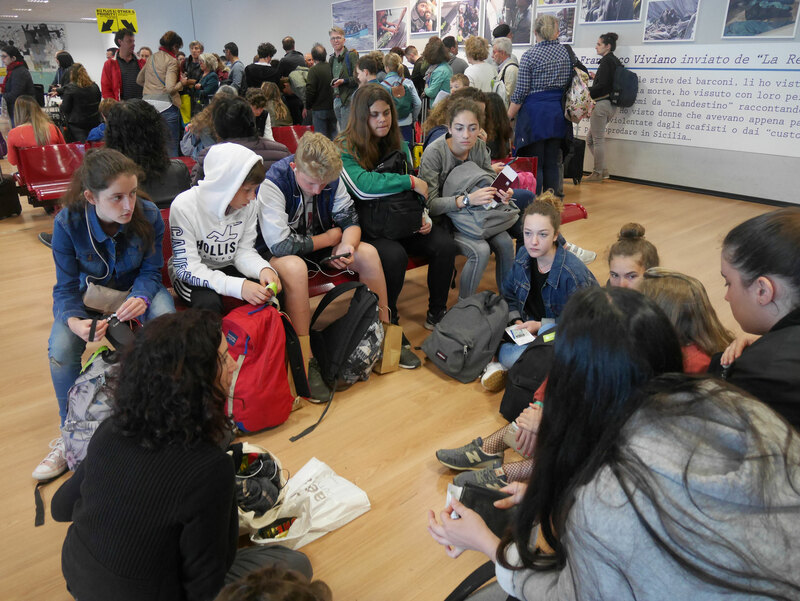 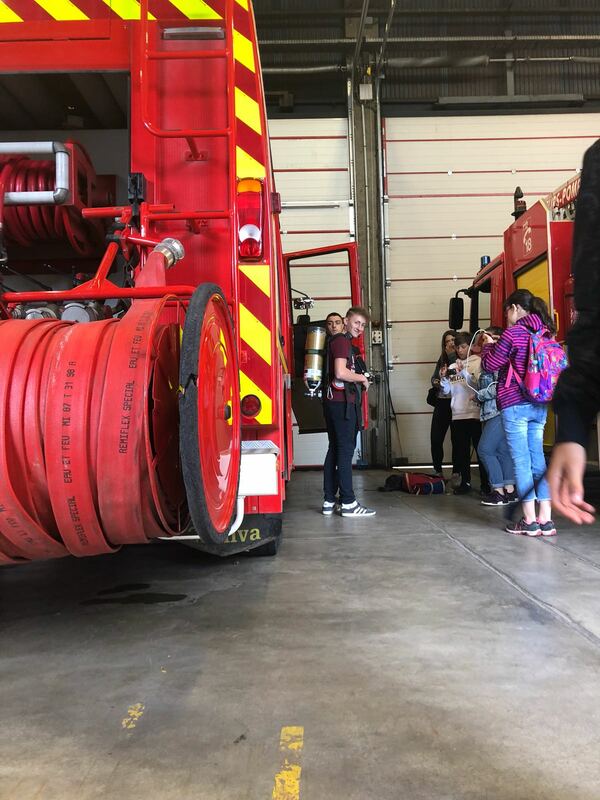 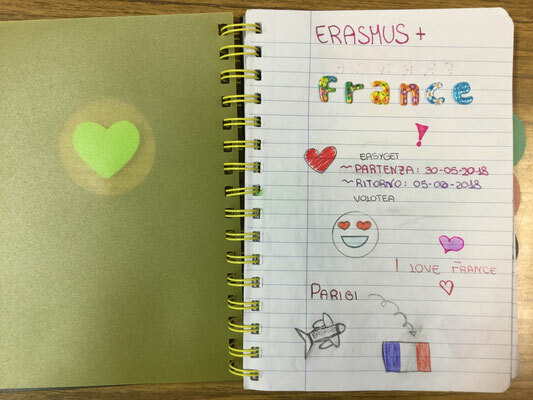 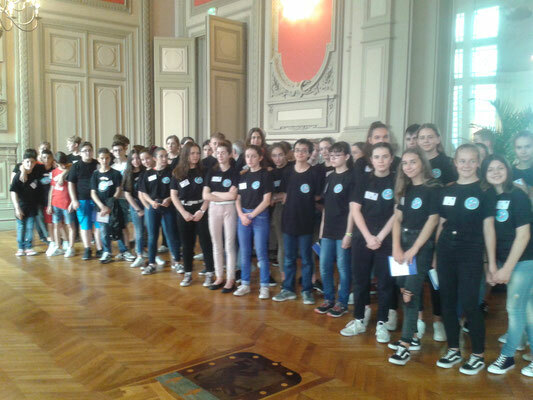 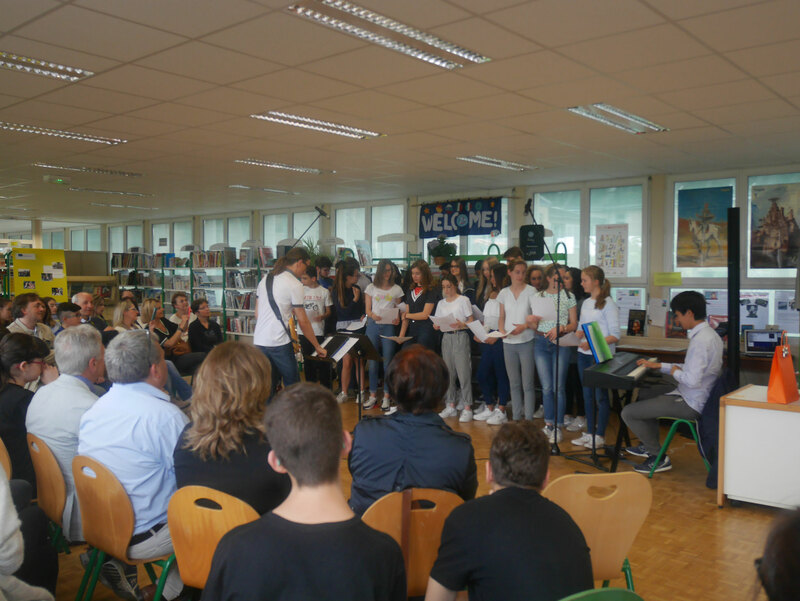 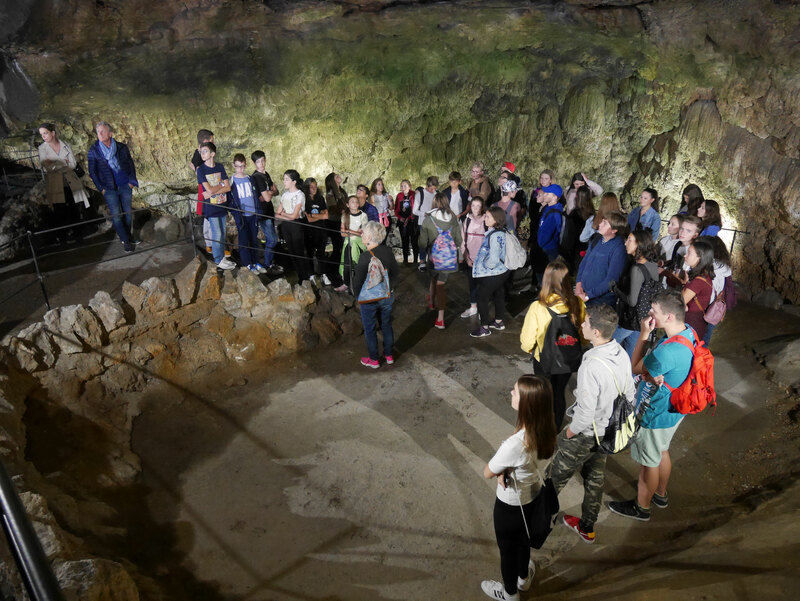 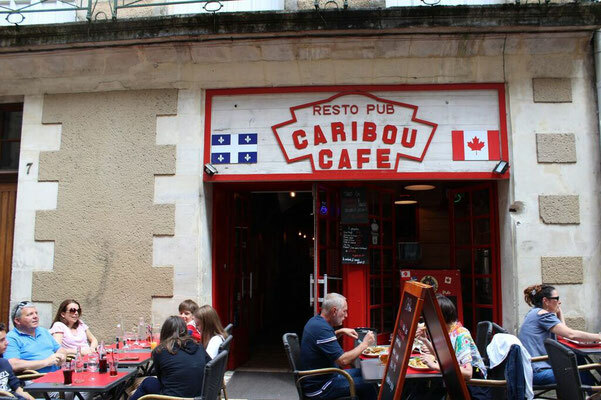 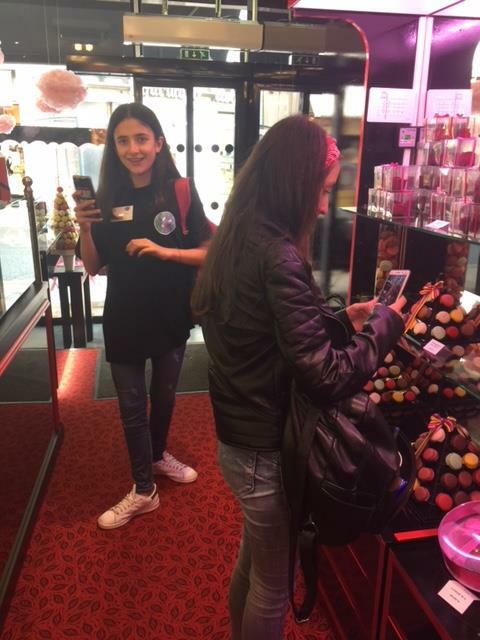 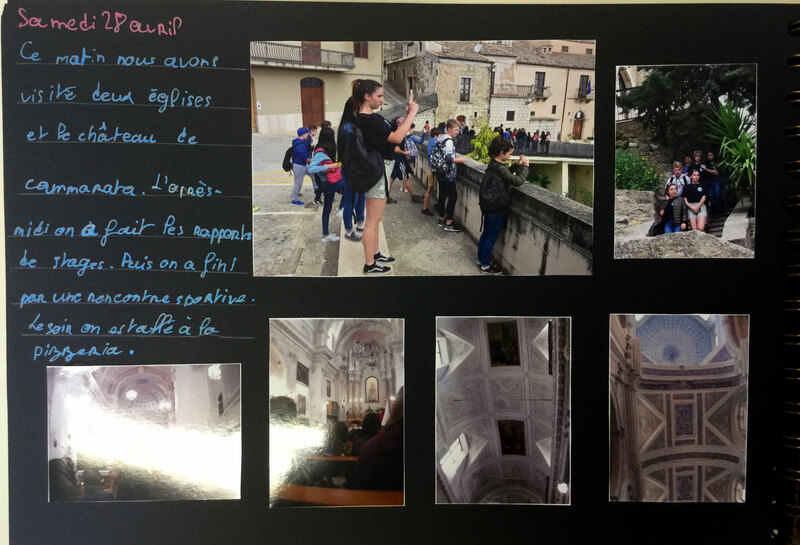 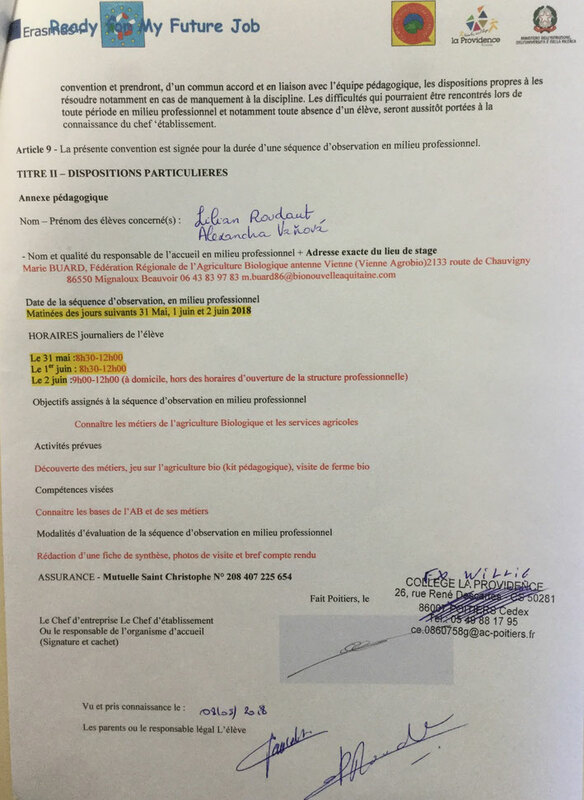 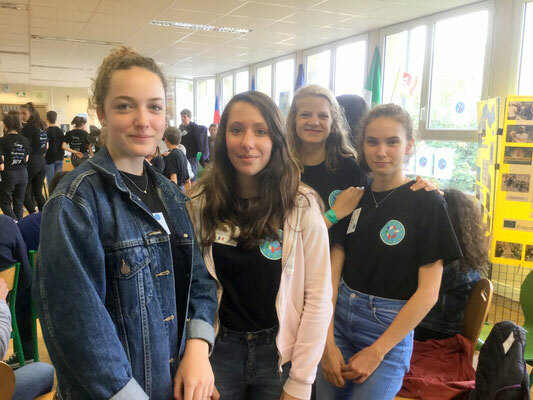 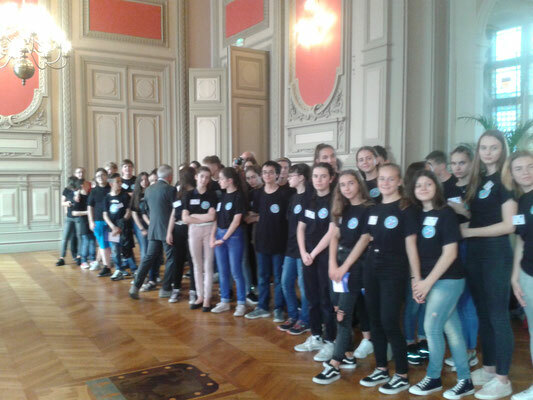 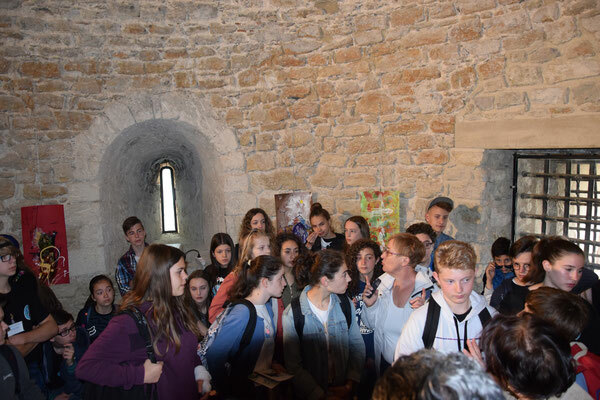 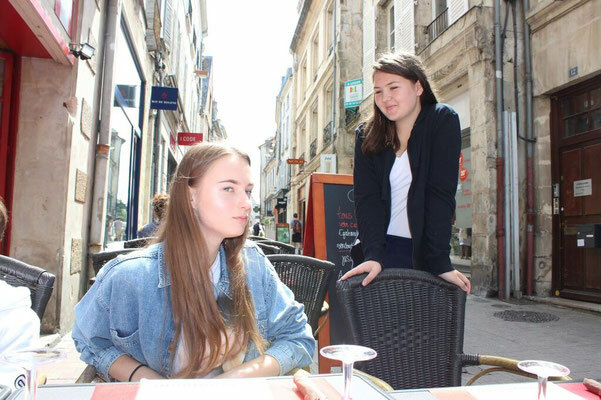 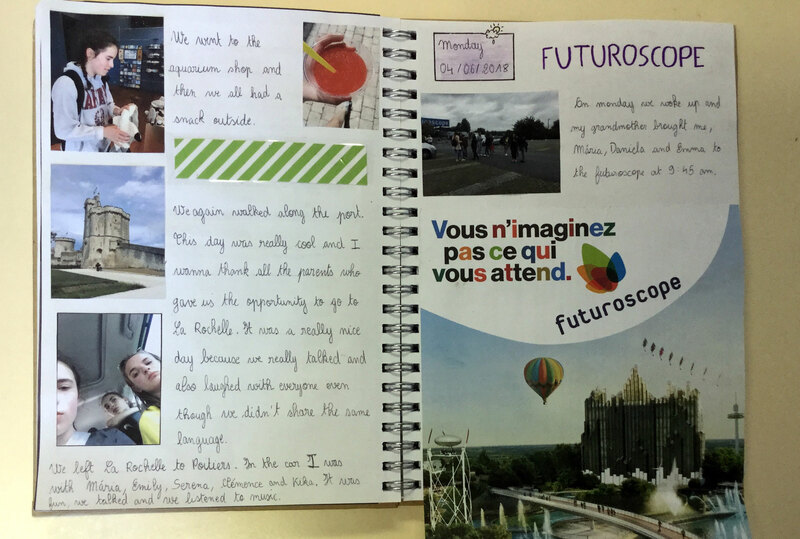 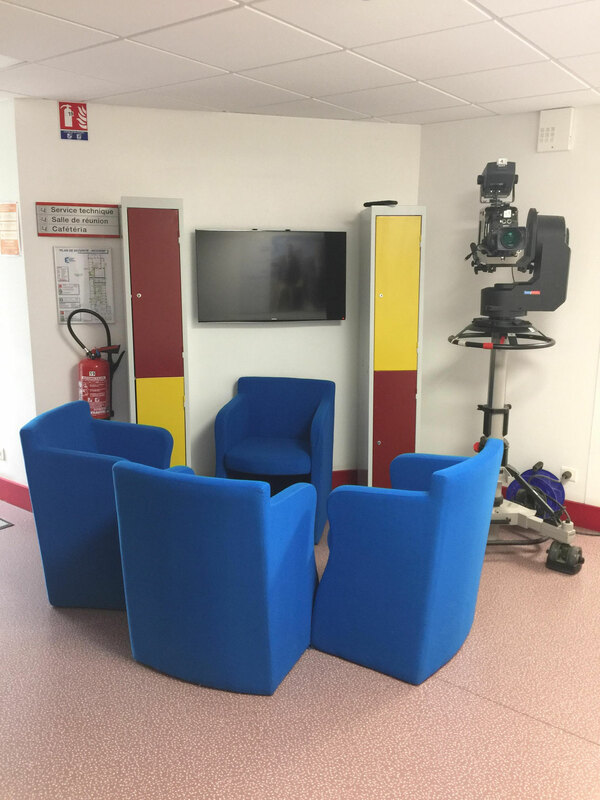 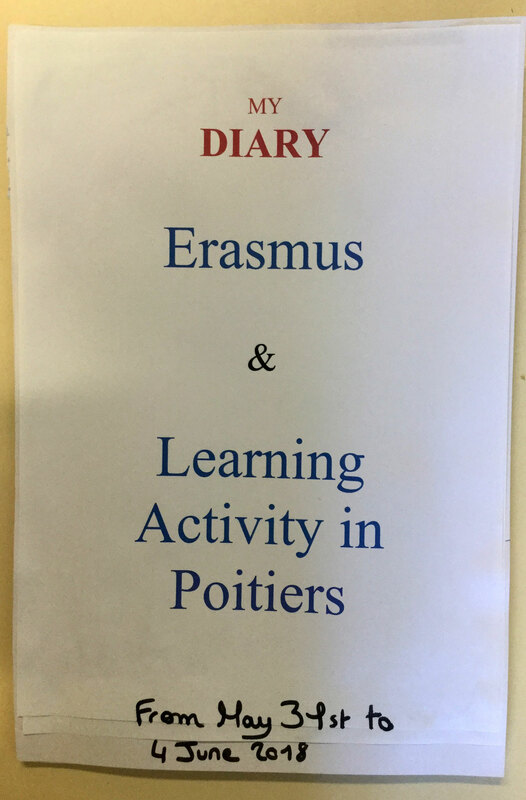 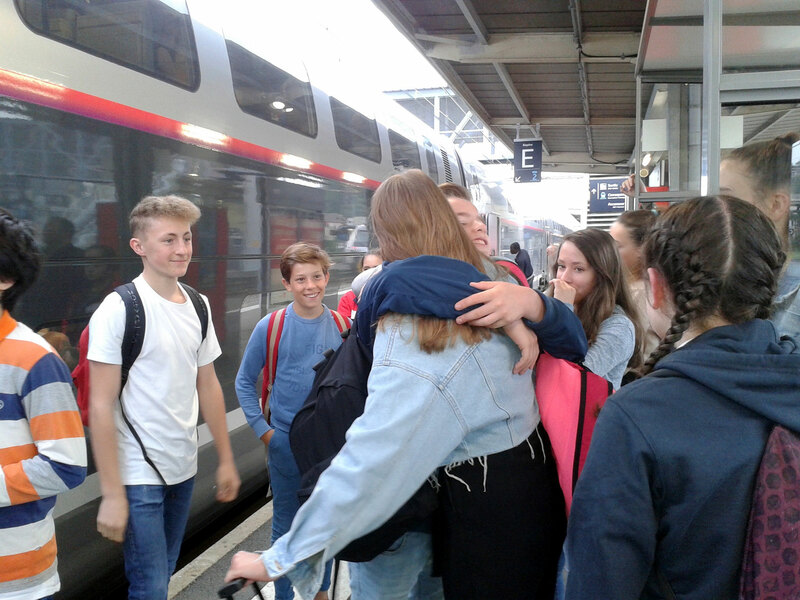 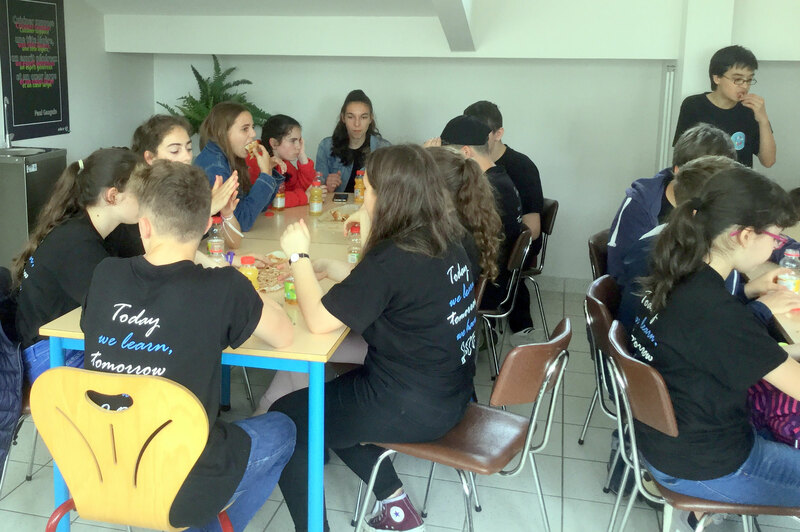 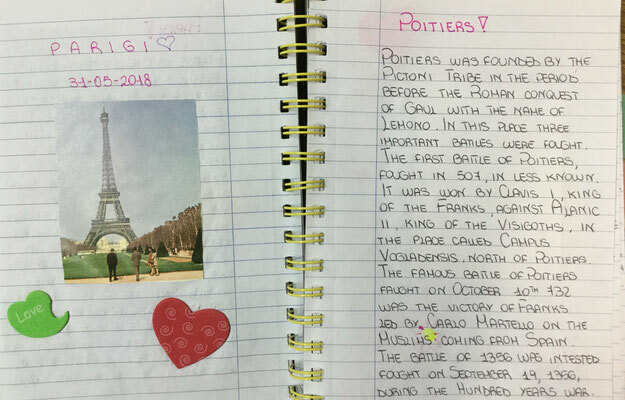 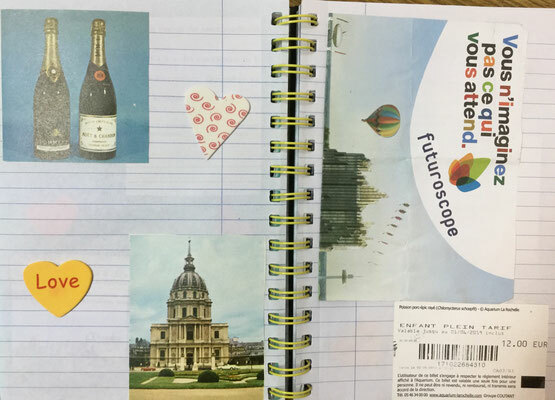 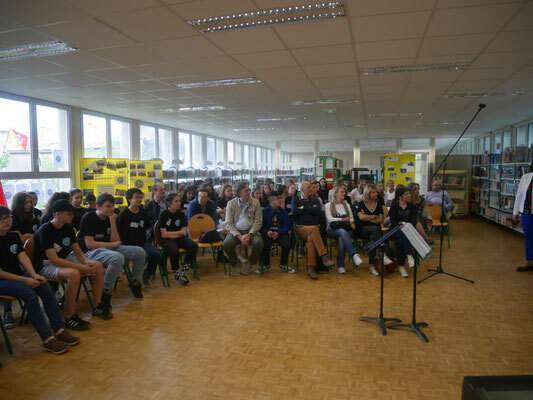 After the reception in Poitiers, Erasmus+ pupils described their activities, visits, group work and internships with their European partners in diaries. 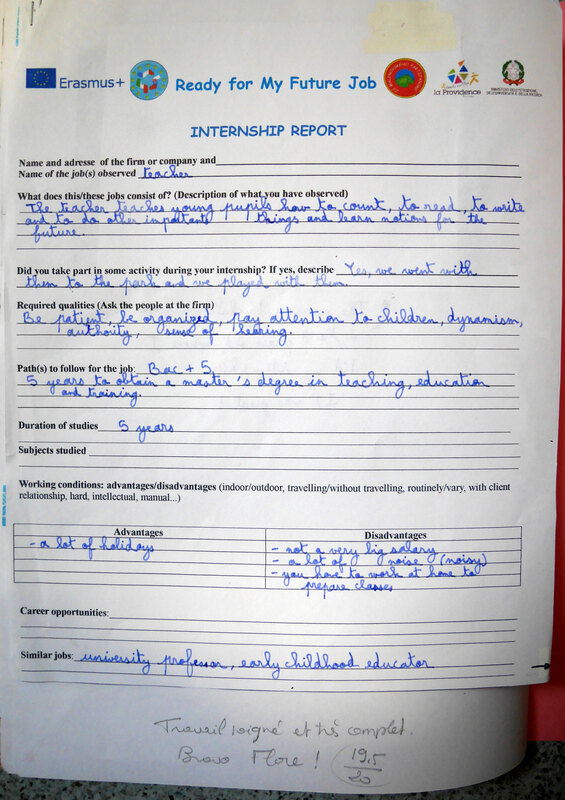 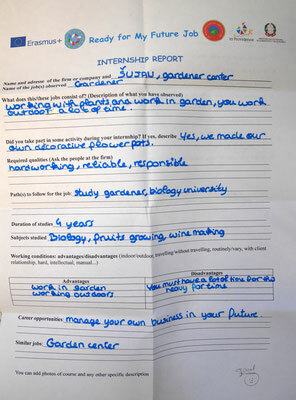 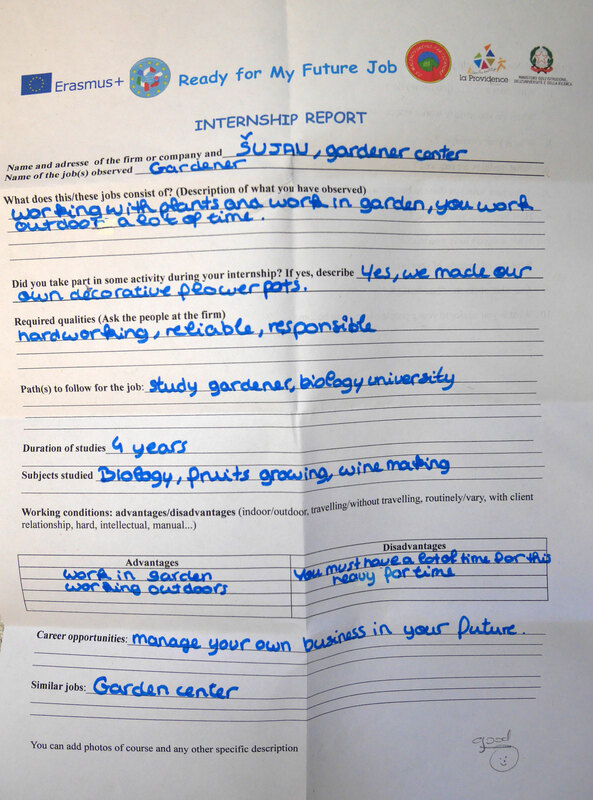 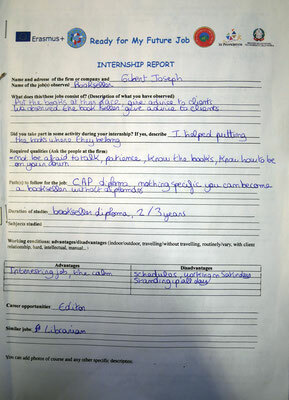 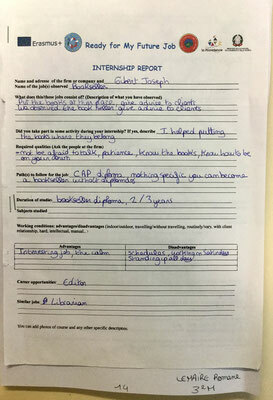 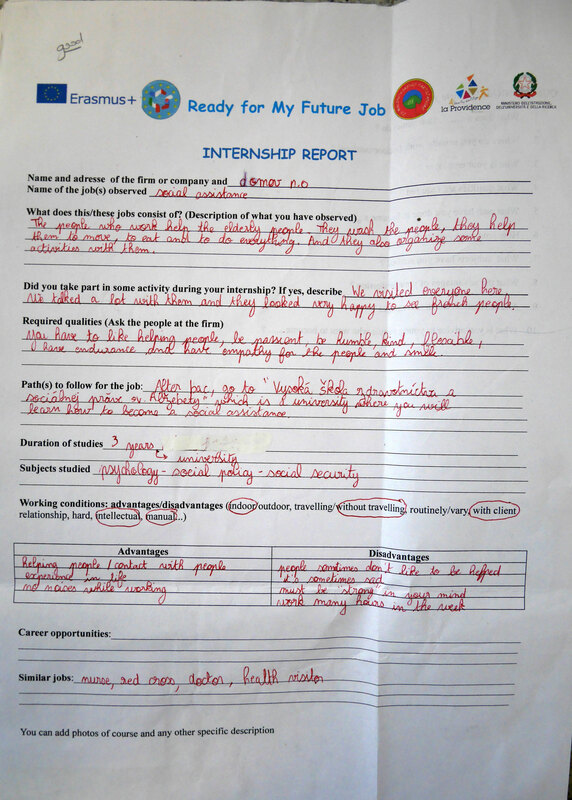 They also filled in the papers we gave them and the internship reports. 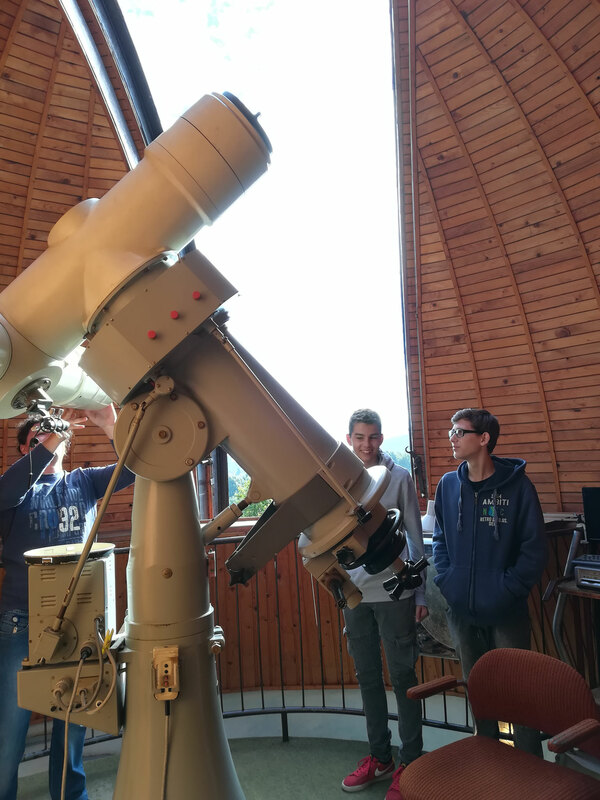 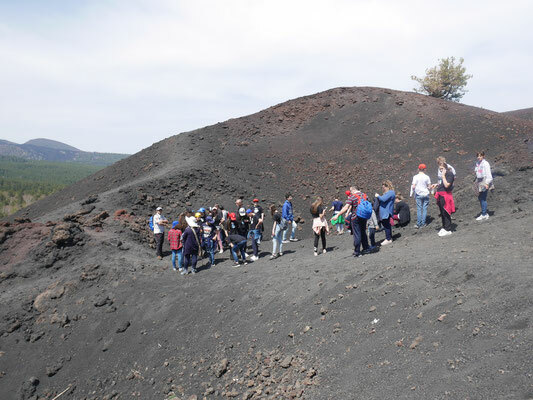 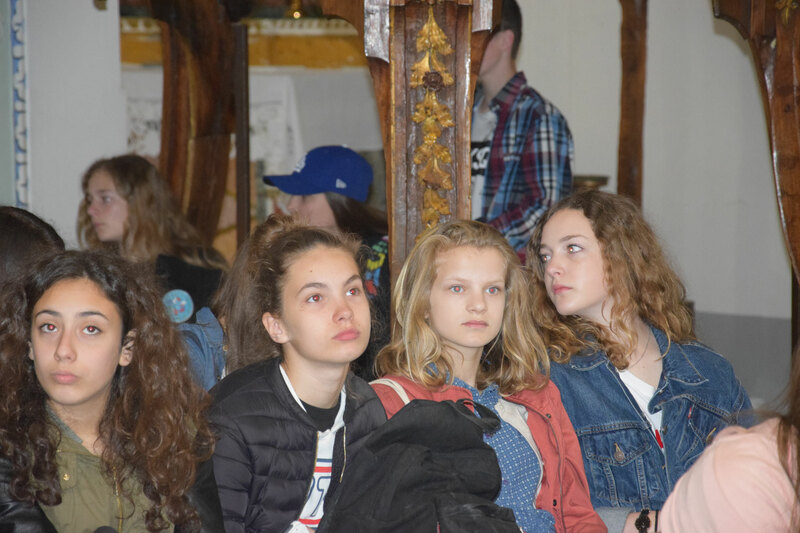 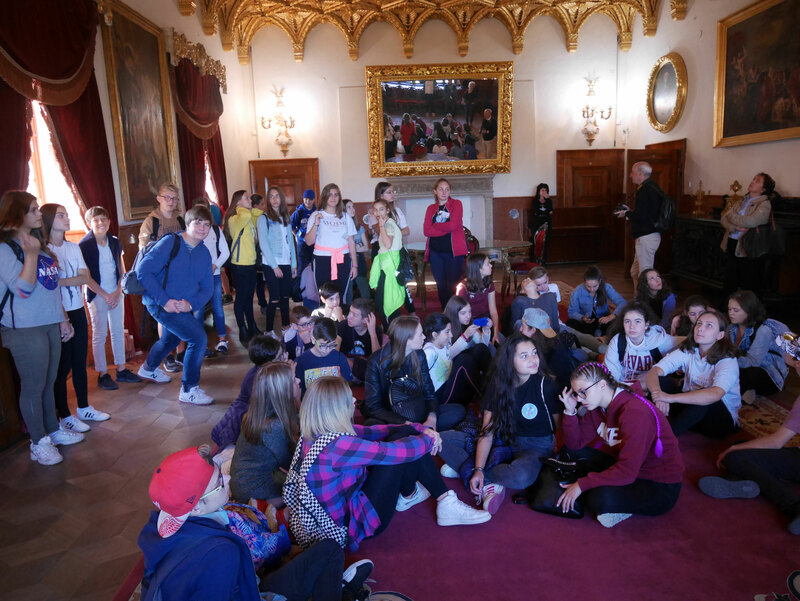 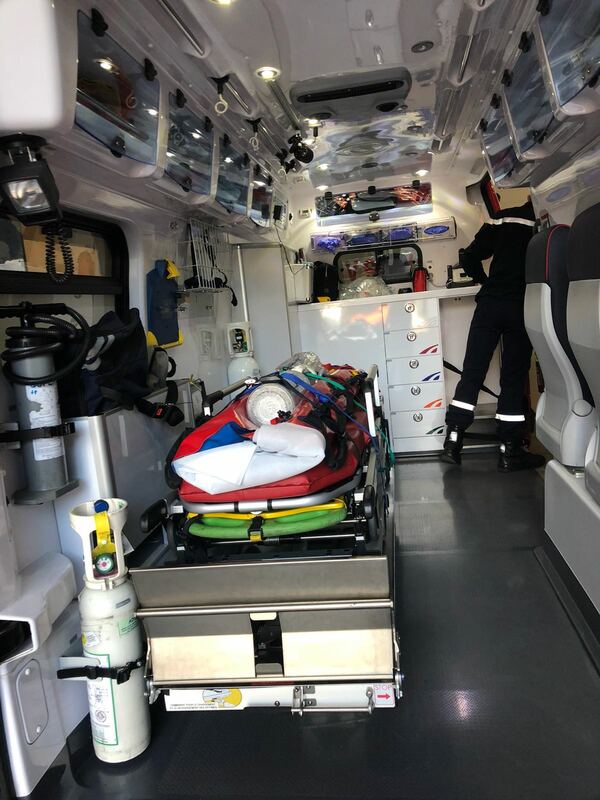 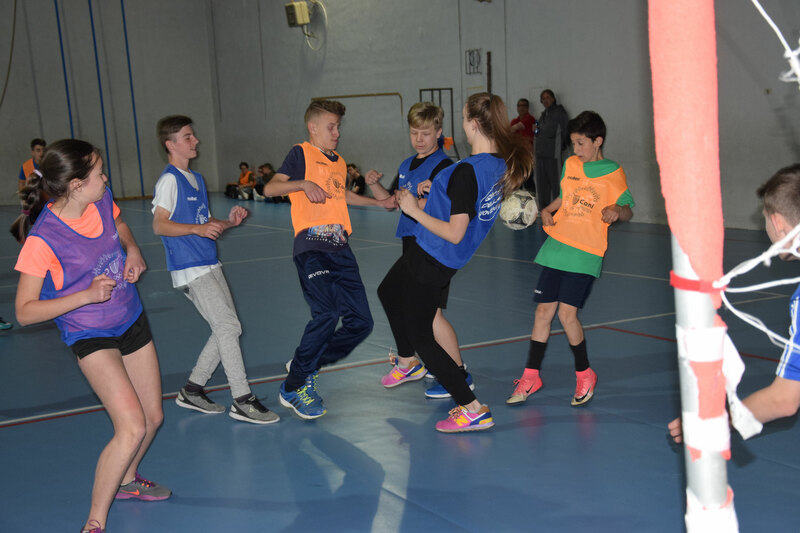 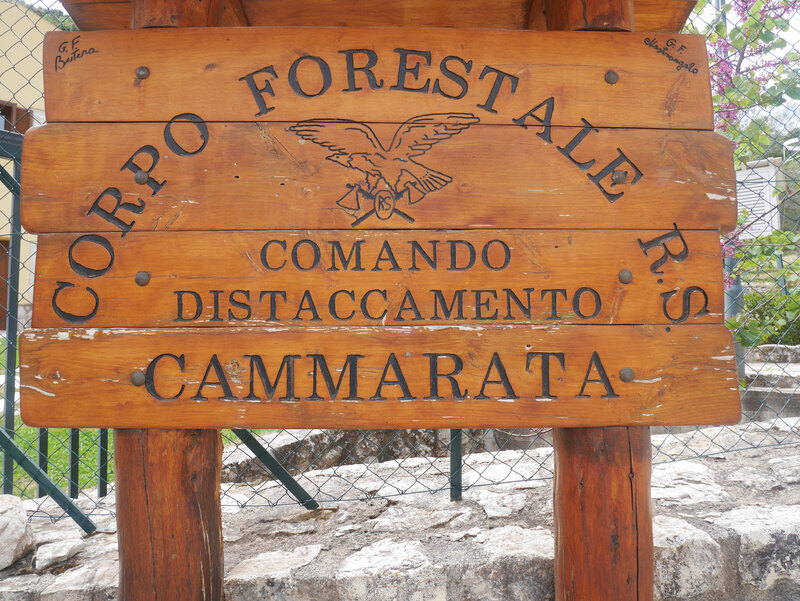 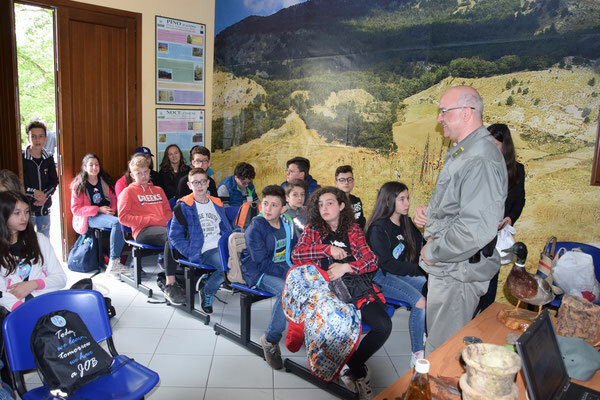 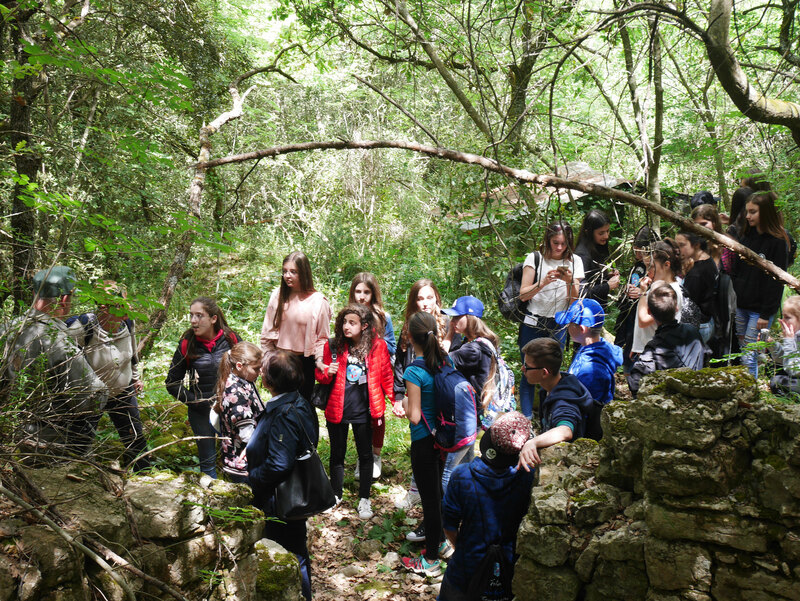 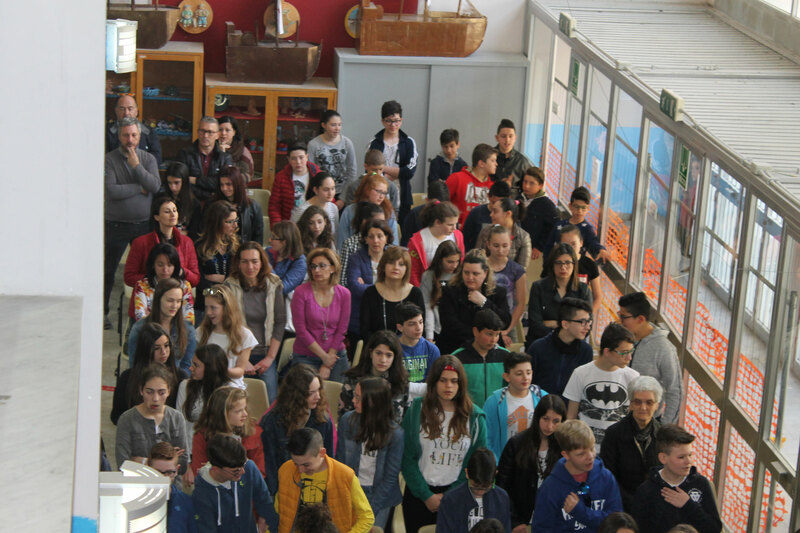 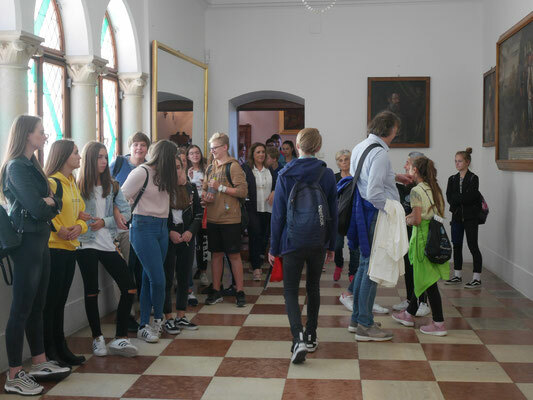 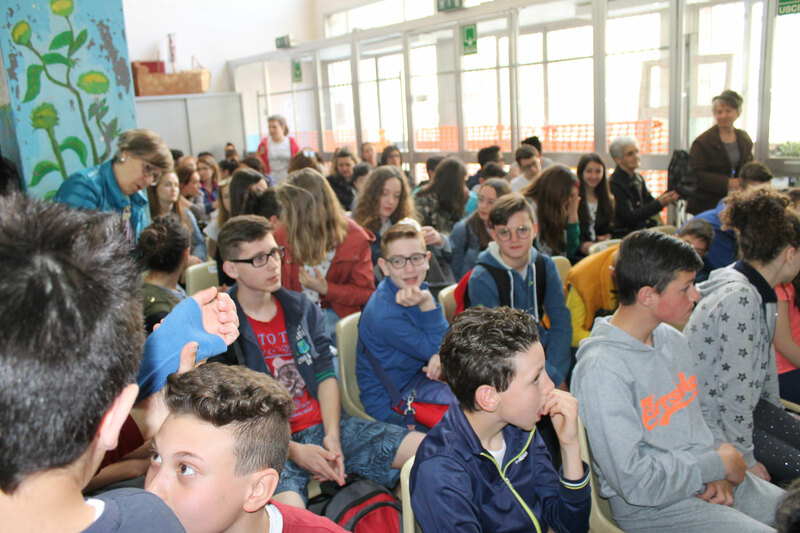 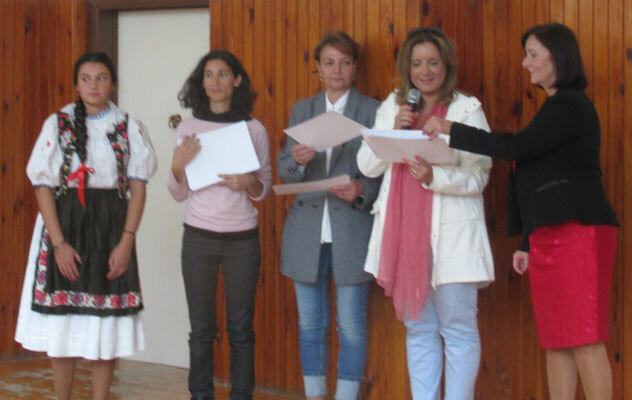 From 23 to 30 April 2018 Pupils from the 3 countries met in Cammarata. 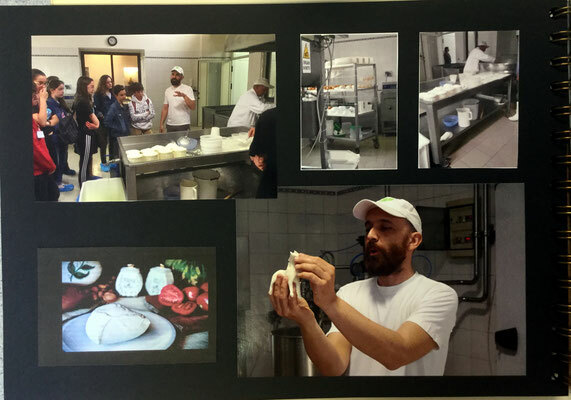 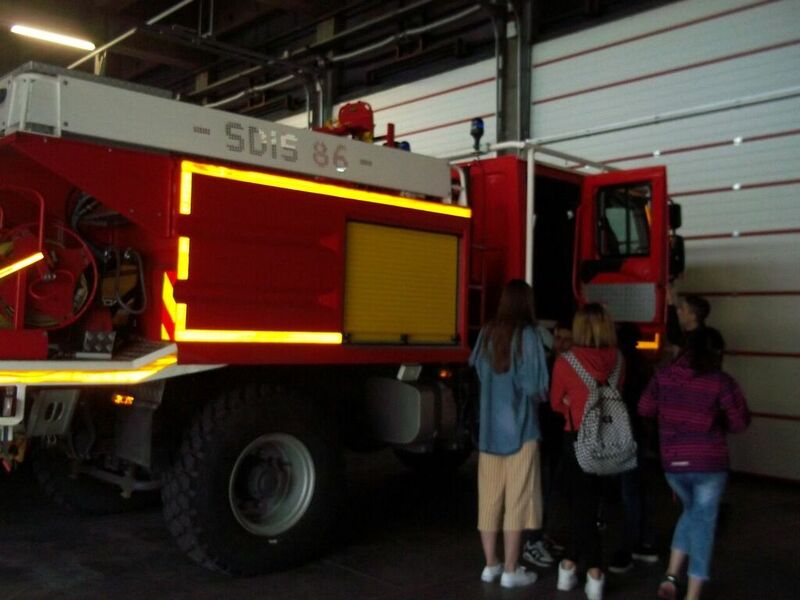 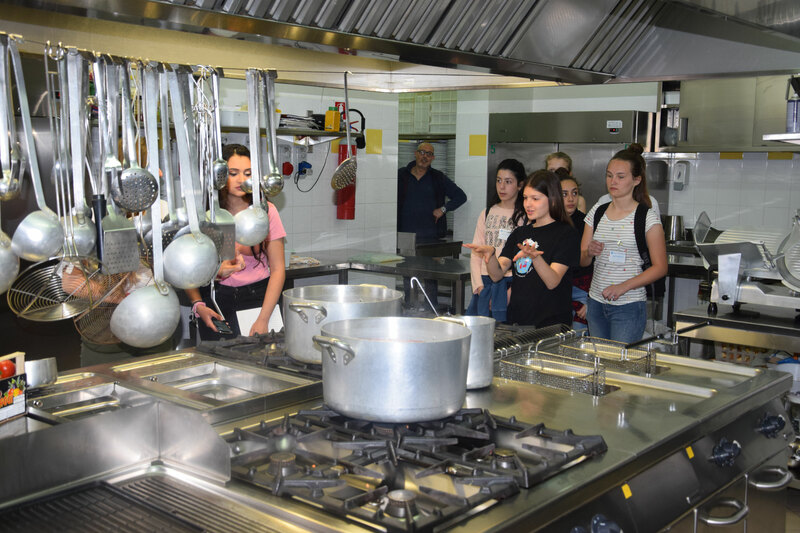 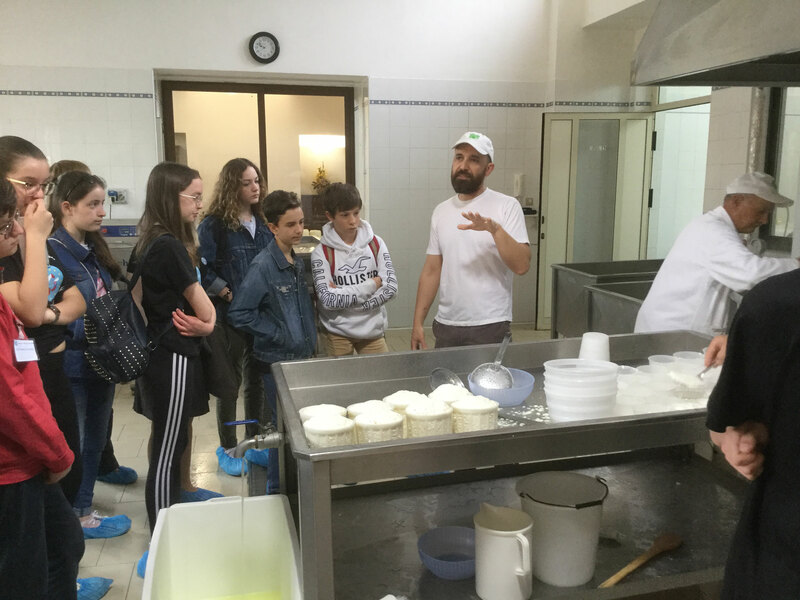 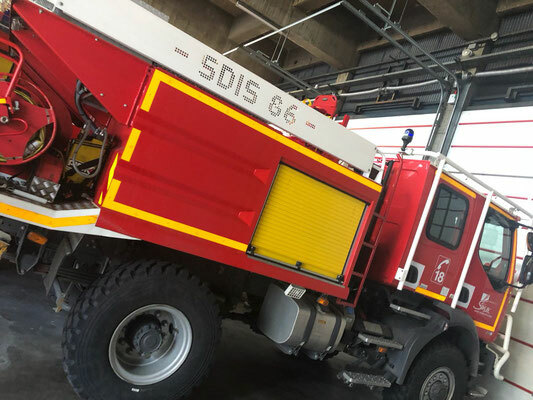 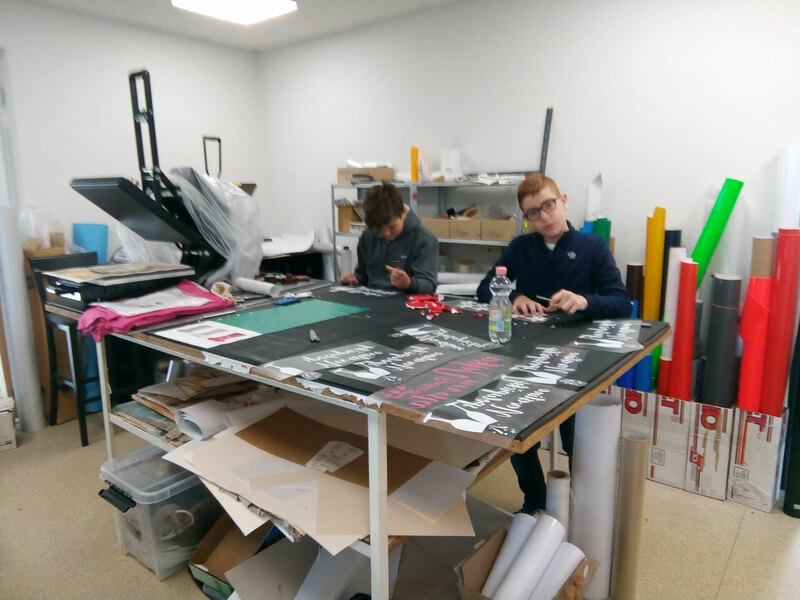 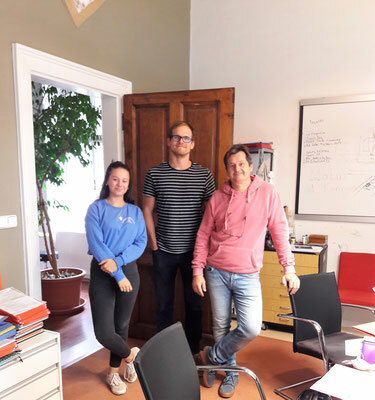 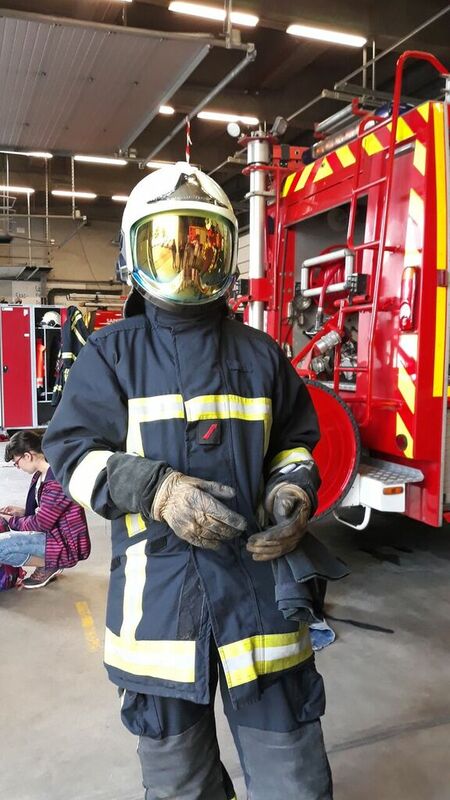 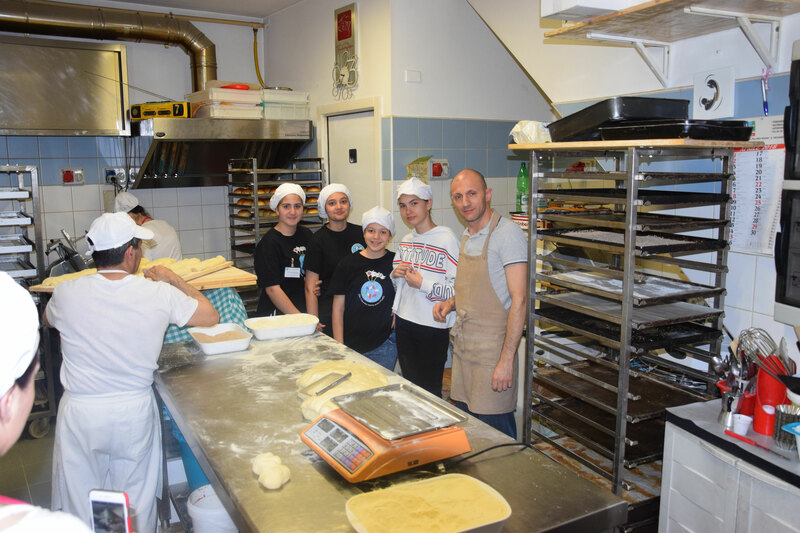 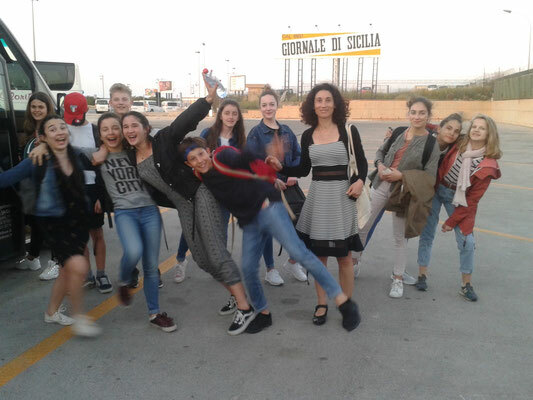 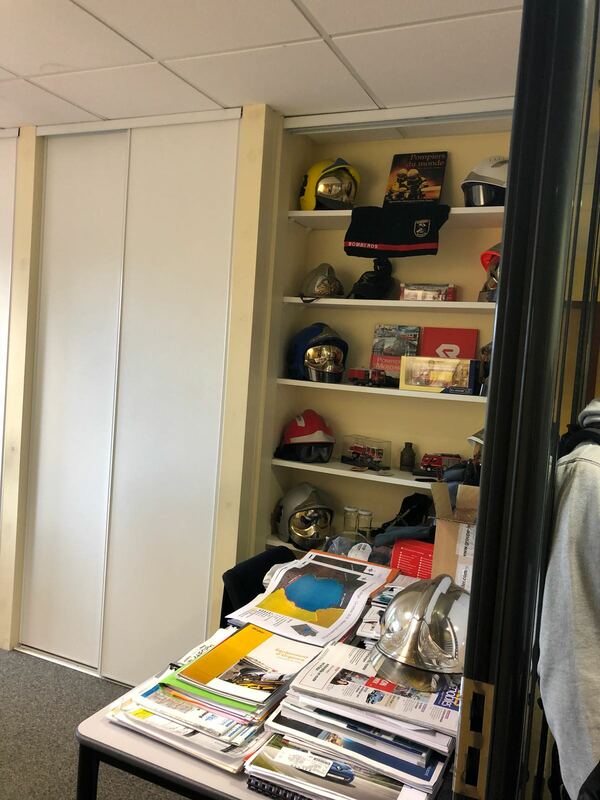 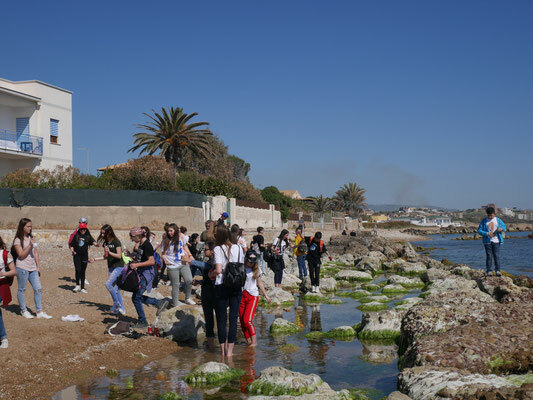 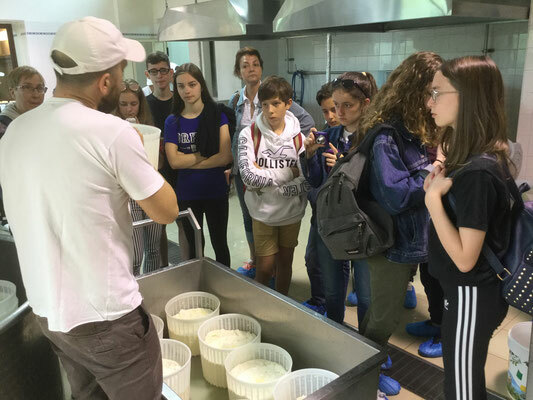 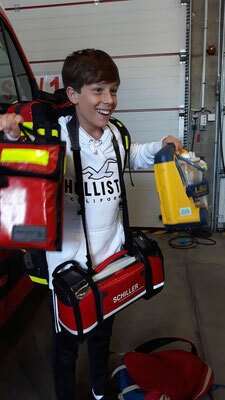 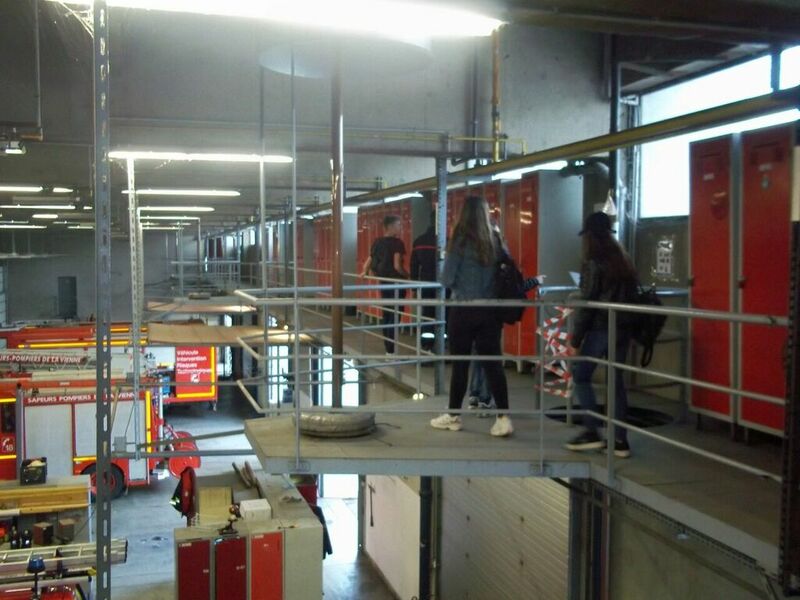 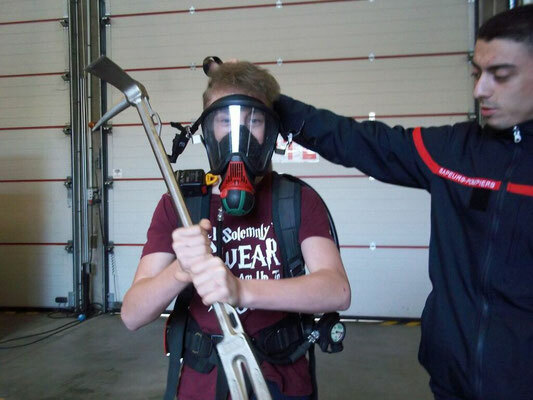 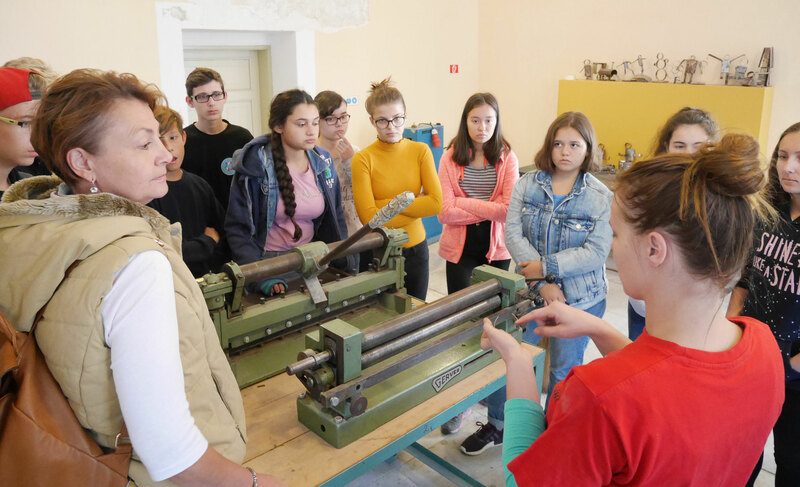 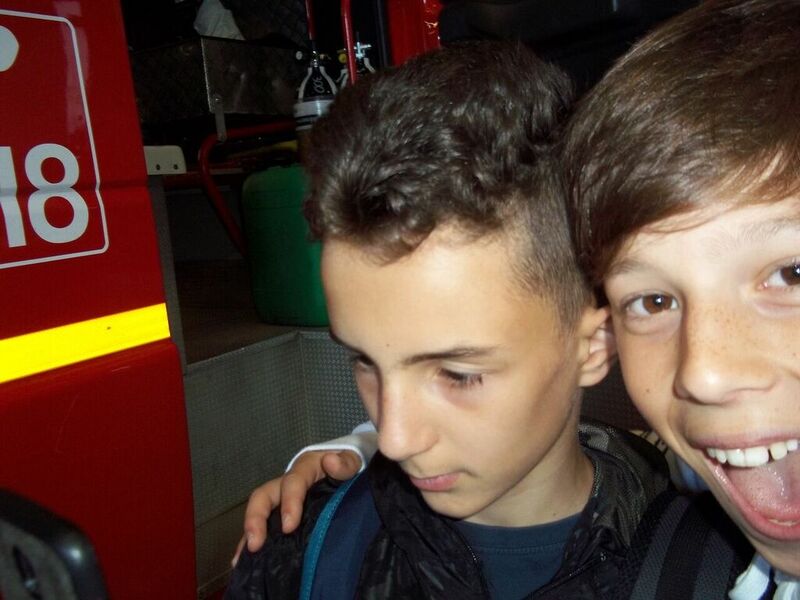 after a warm welcome at school, French and Slovak pupils along with their Sicilian partners took part in different workshop and experienced some training periods in several companies. 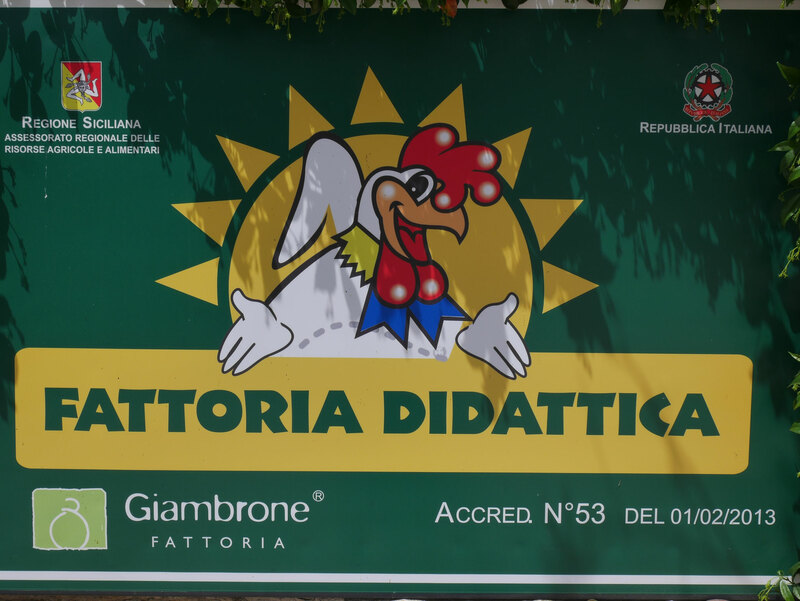 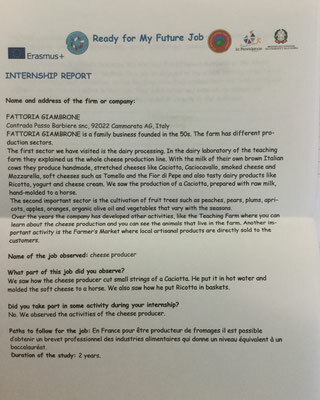 A rich experience for all of them: they discovered many jobs and how a Sicilian firm/companies worked. 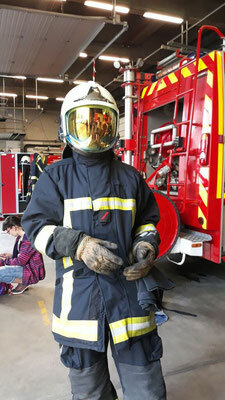 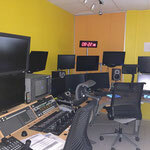 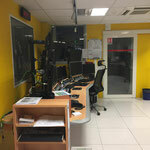 and were involved in the real working world. 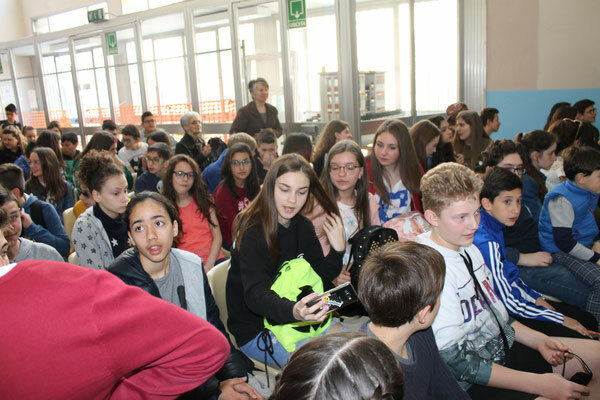 They also got aware of the importance of English as a common communication tool in Europe. 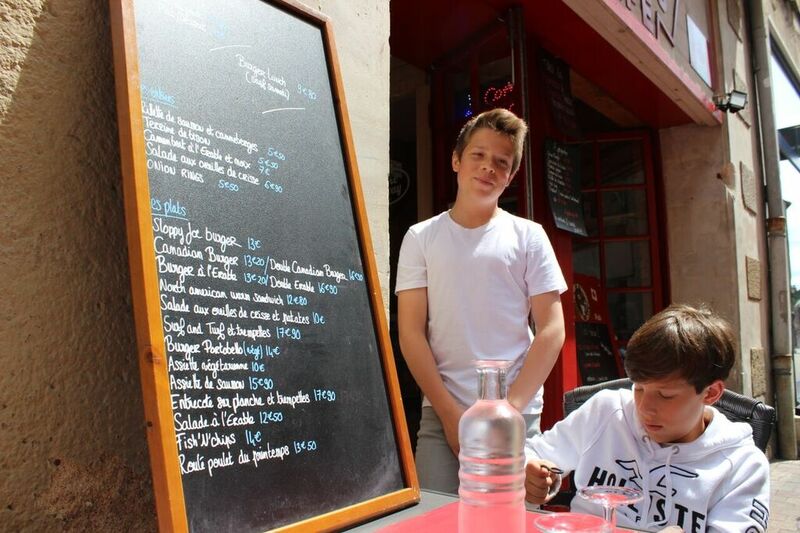 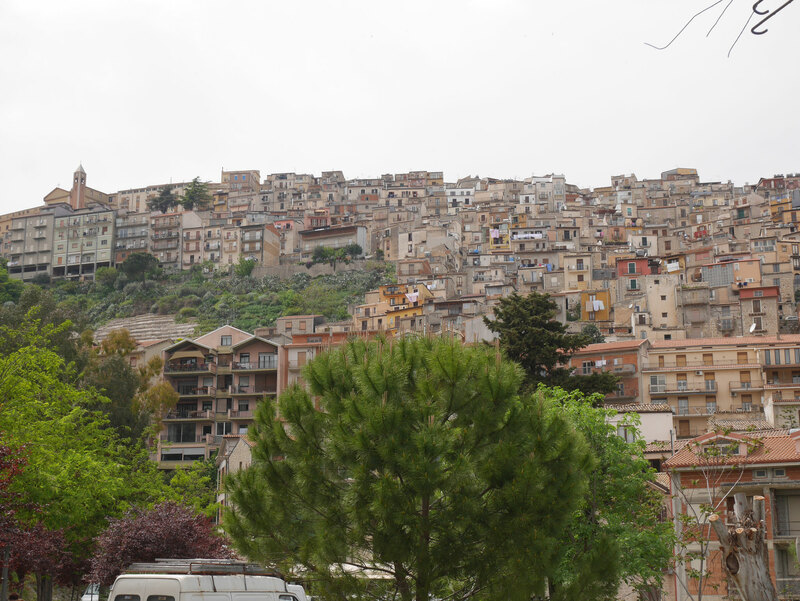 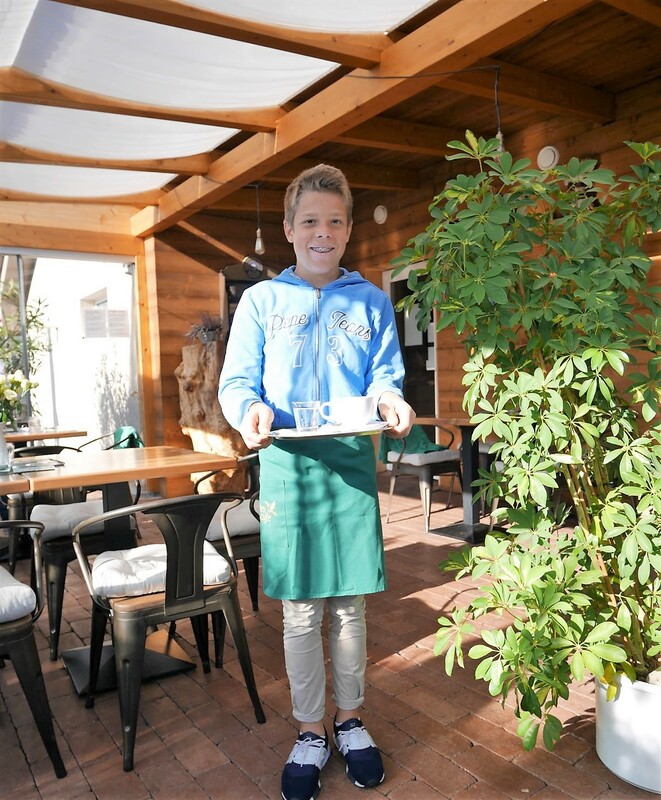 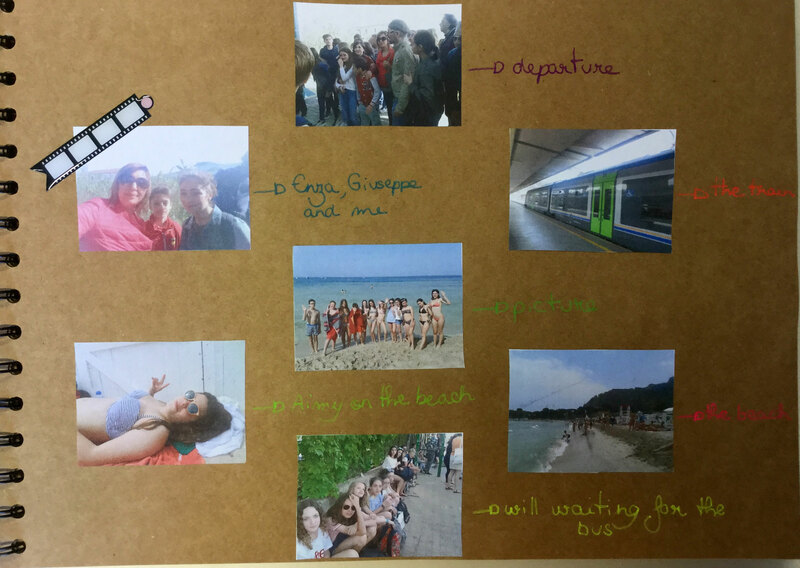 They learnt some sentences in Italian and discovered another culture and way of living. 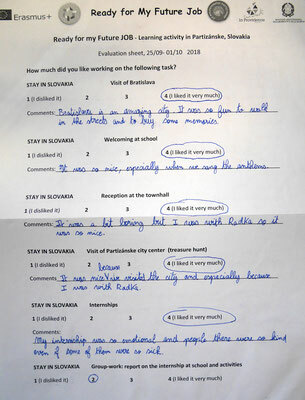 This really broadened their mind. 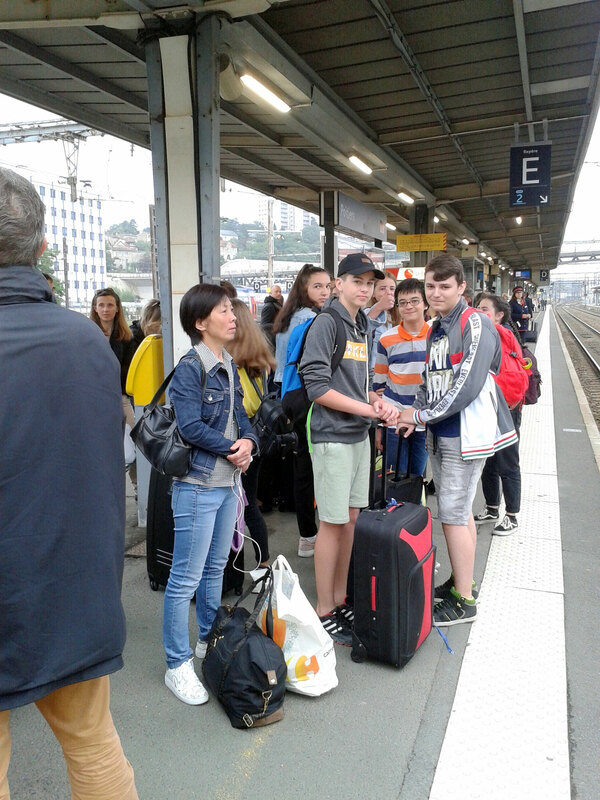 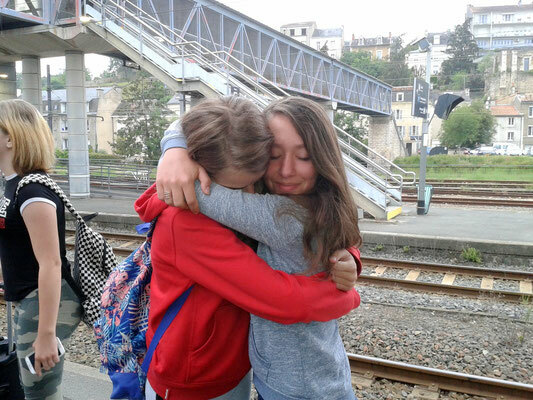 NOW THEY ARE LOOKING FORWARD TO MEET AGAIN IN FRANCE AND SLOVAKIA. Istituto “Giovanni XXIII” Cammarata welcomes European partners engaged in Erasmus +”Ready for my future job project”. 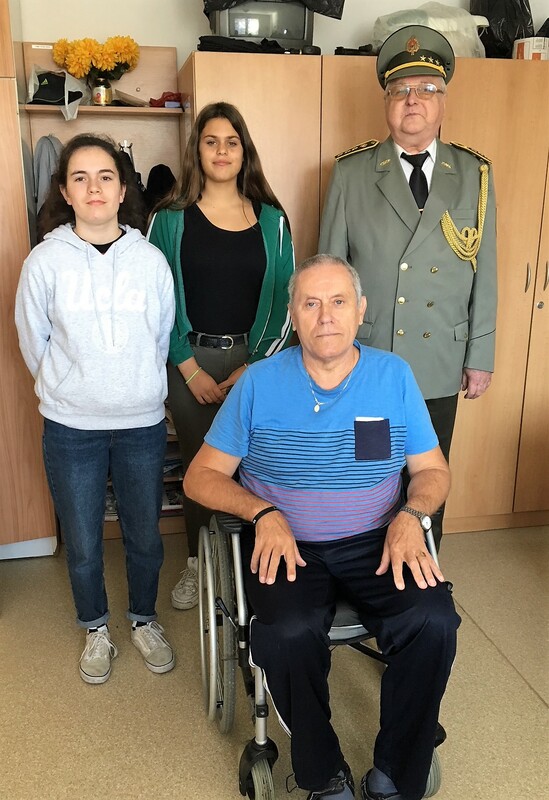 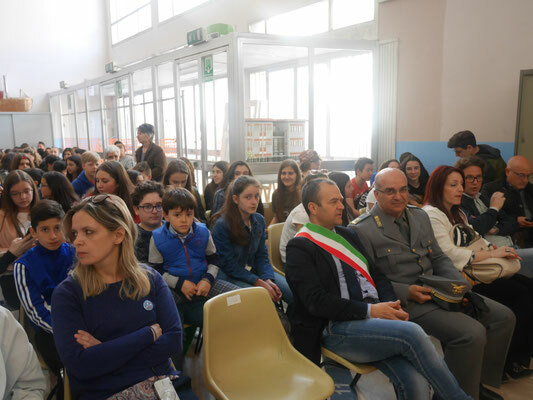 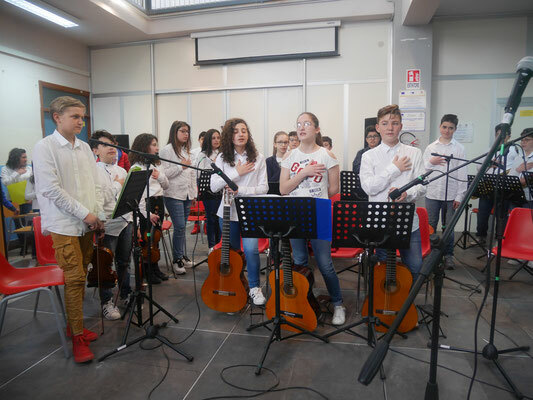 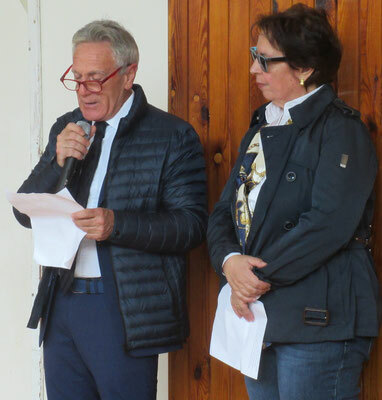 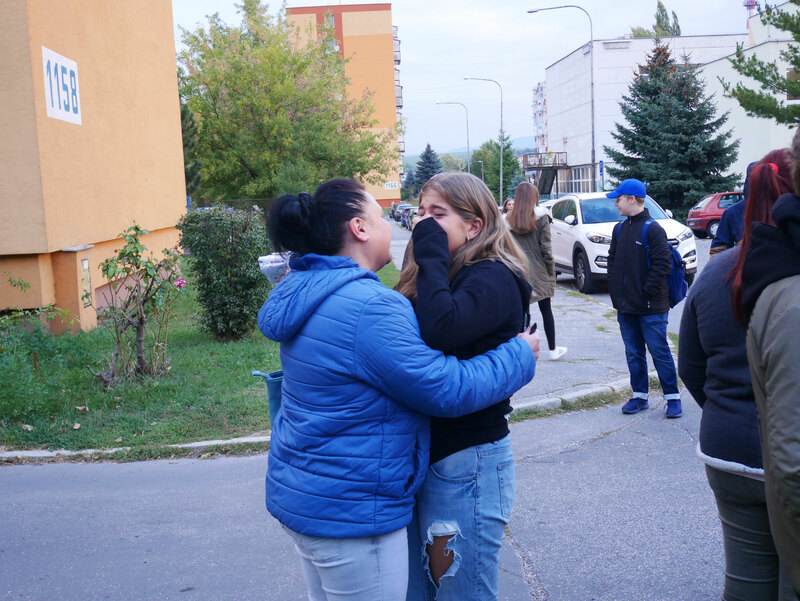 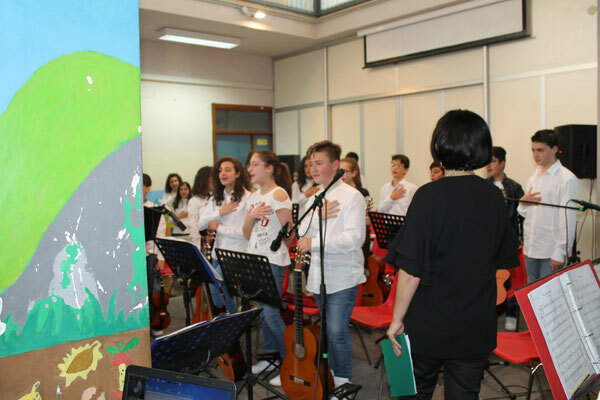 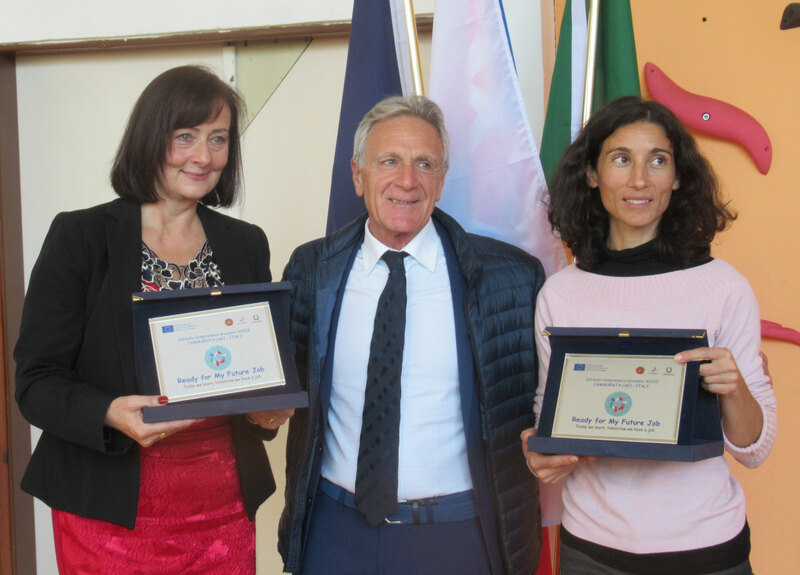 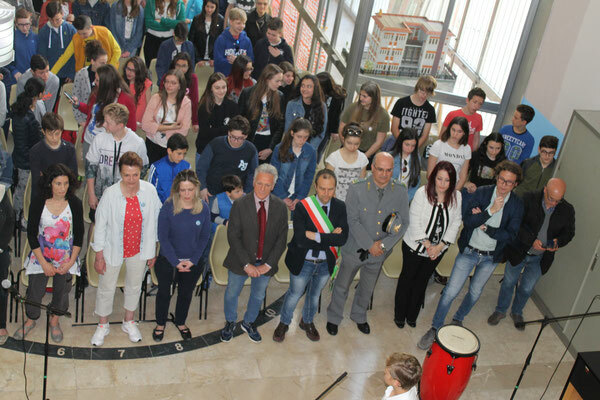 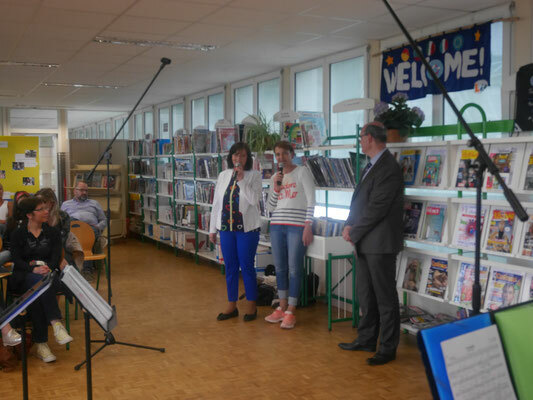 The headteacher Salvatore Lo Presti and the teachers Maria Dorotea La Placa and Nazarena Tuzzolino expressed all the other teachers, students and parents’ feelings about this very important experience for our school and our small town. 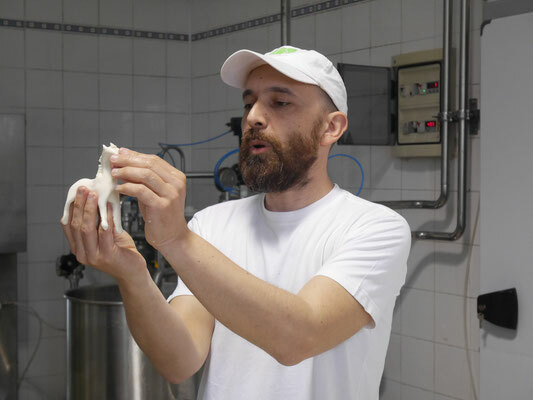 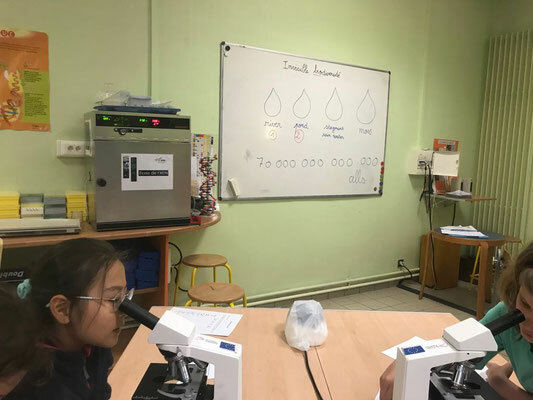 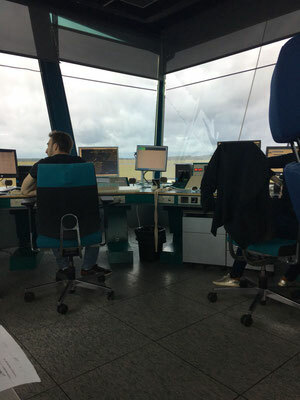 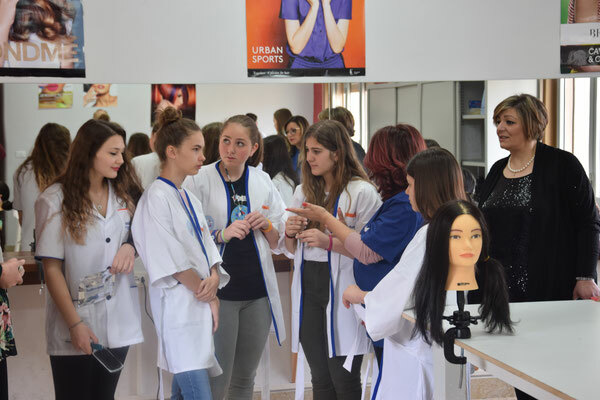 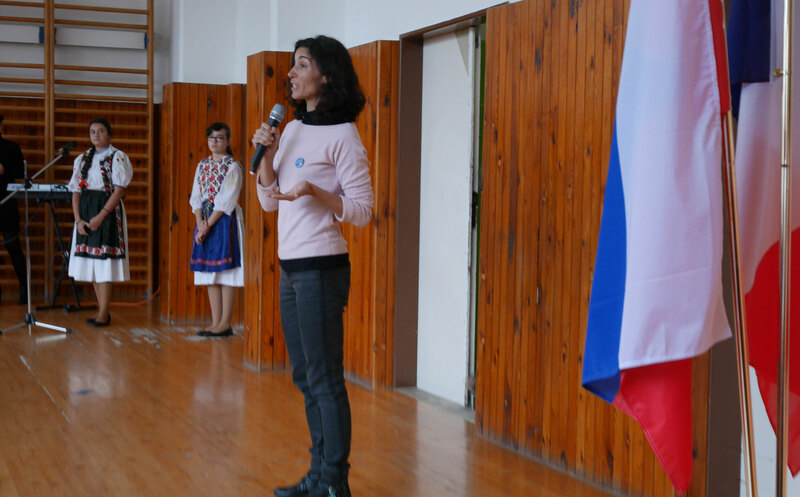 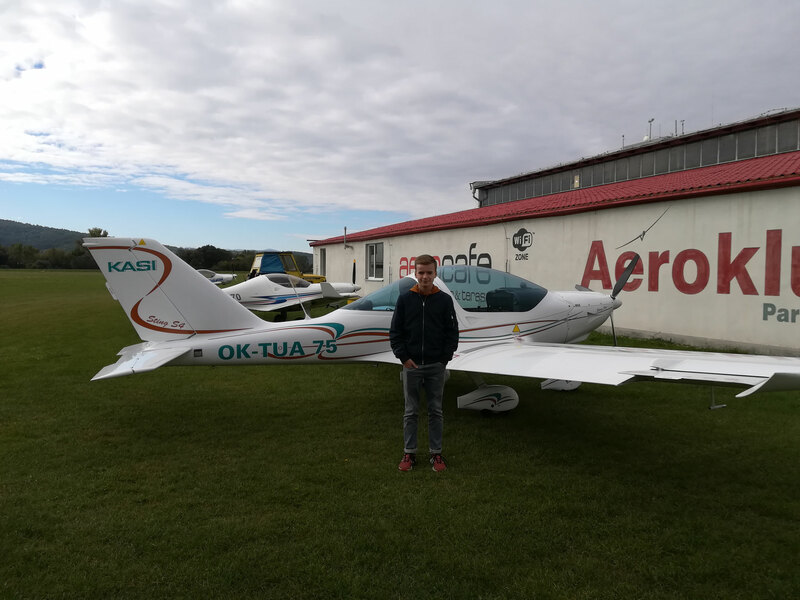 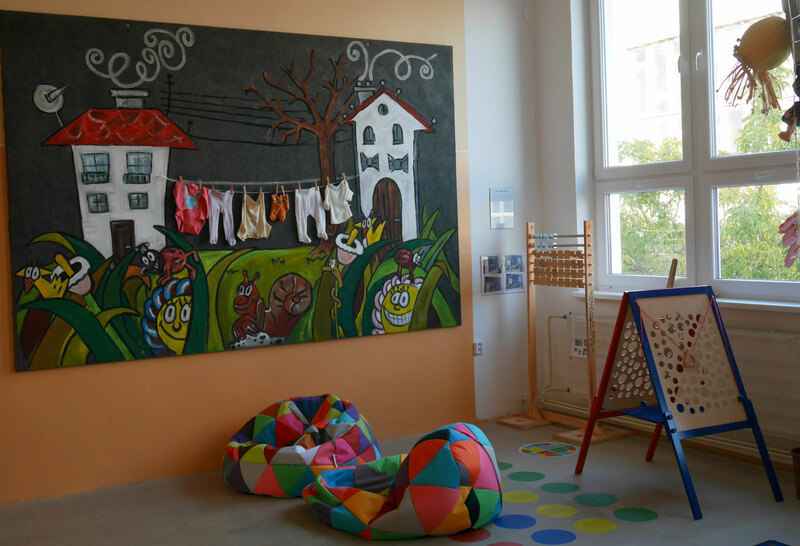 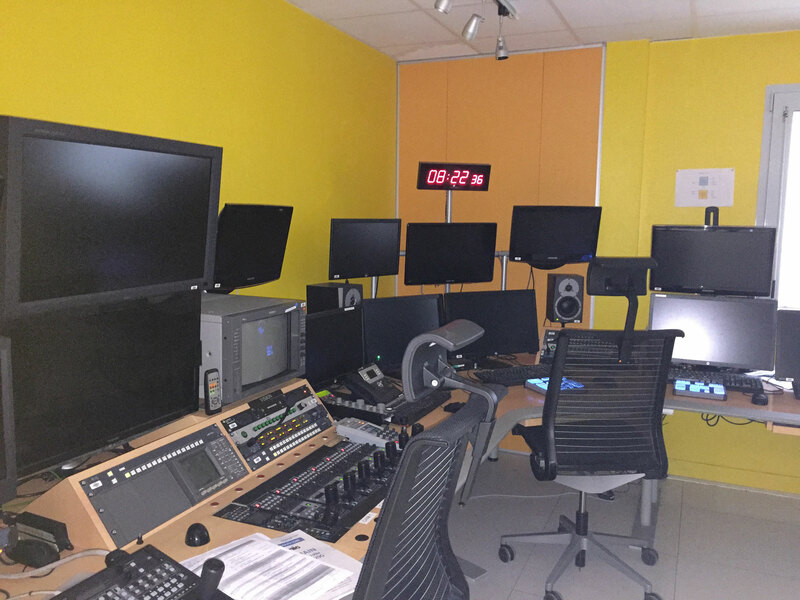 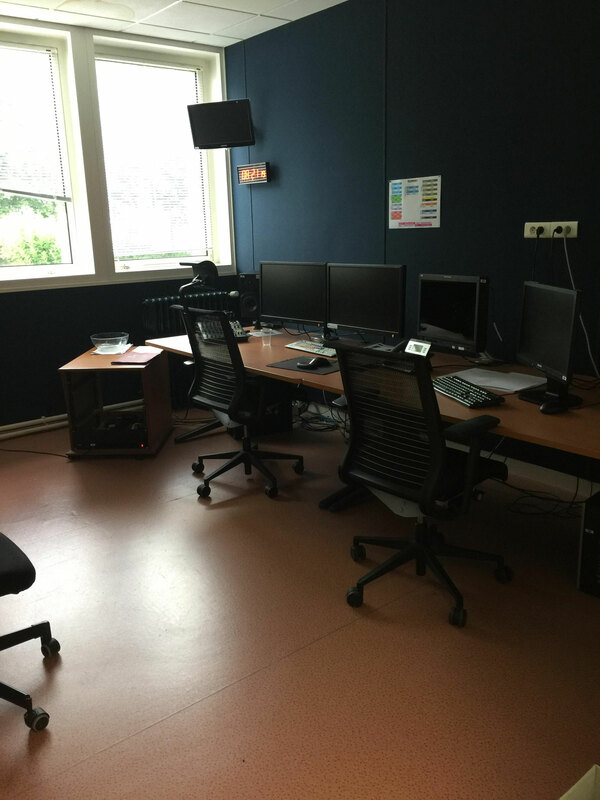 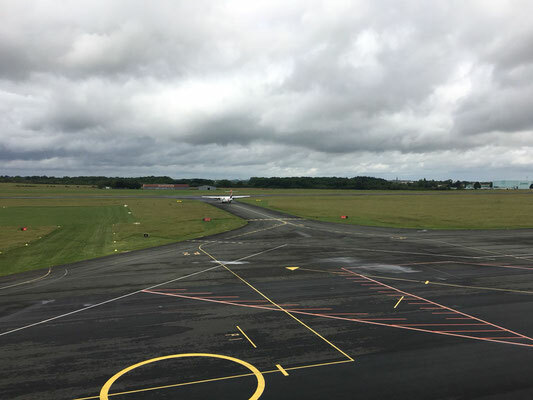 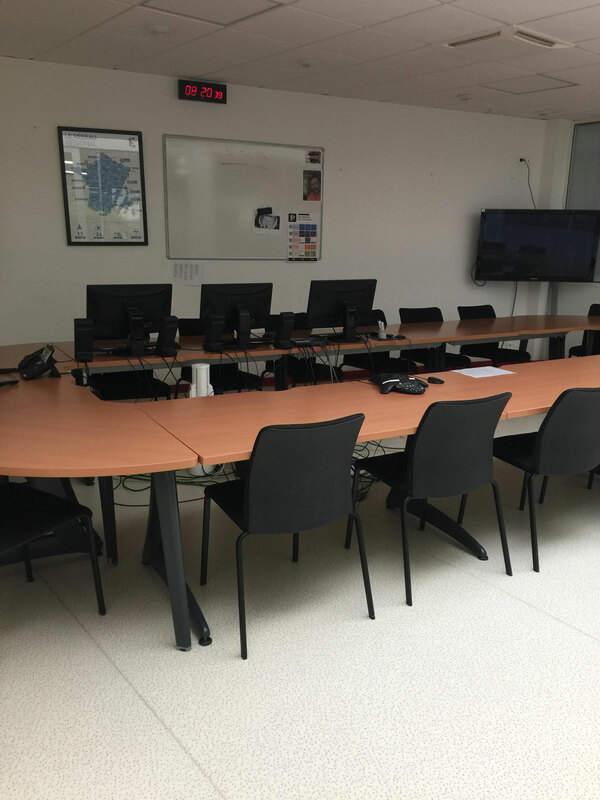 Some aspects were pointed out as very relevant in the two-year involvement in the project: “Thanks to the European Union’s objective aiming at opening the doors to multiply opportunities, we are offered different ways of learning. 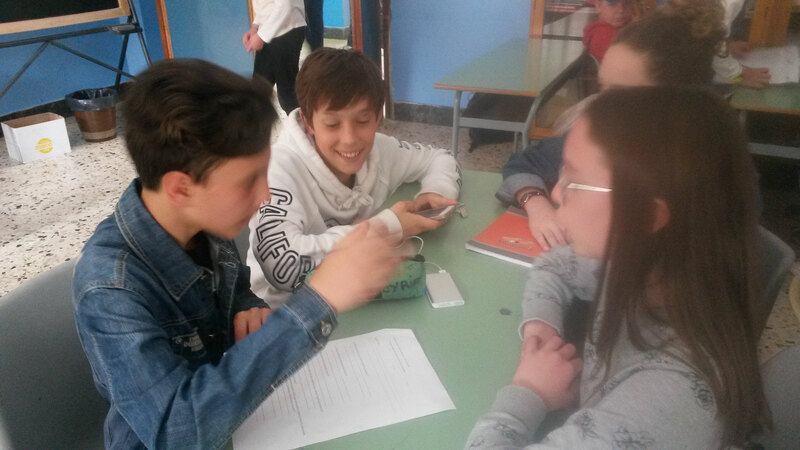 The participation in this exchange program in three countries to orientate our pupils in the choice of their own path of study and future work will give our students the possibility of improving linguistic and social skills, global awareness, citizenship and many other competences. 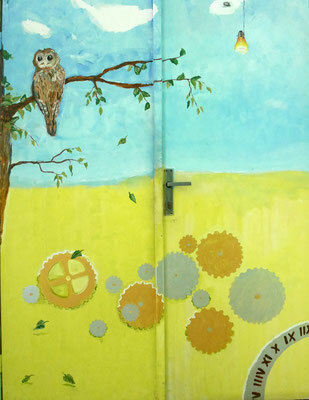 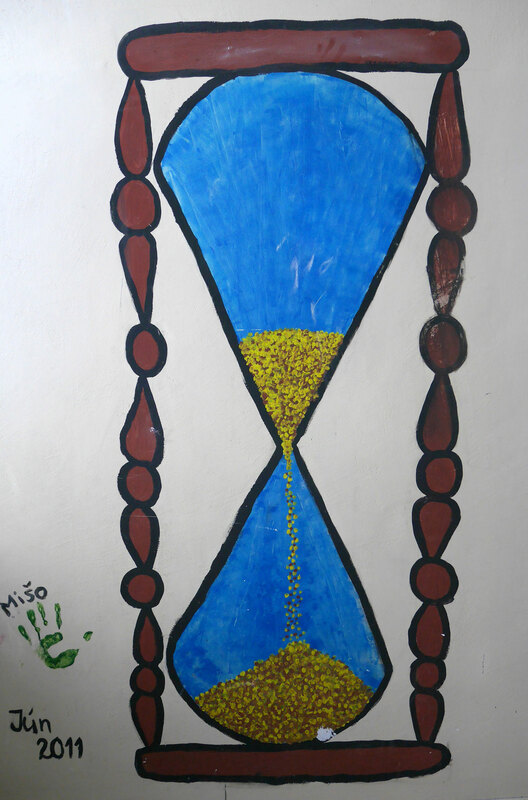 Moreover, the three schools will improve their policies by learning one another while students and teachers will collaborate across borders and all this to create the best learning environments for all and to offer meaningful learning experiences.”… “ We all strongly believe that our project is a unique opportunity for us to widen our social and cultural horizons. 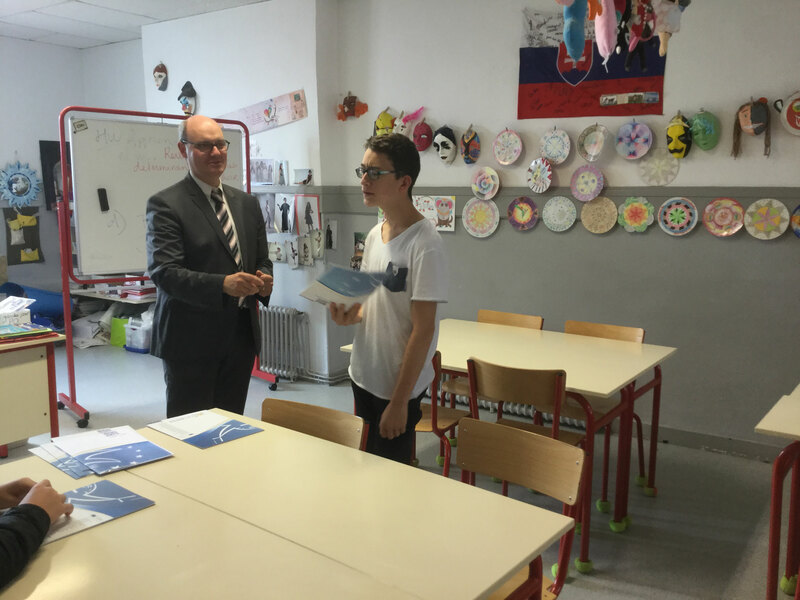 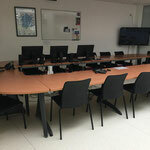 It will let us learn a great deal about French and Slovakian cultures, and learn a lot from one another. 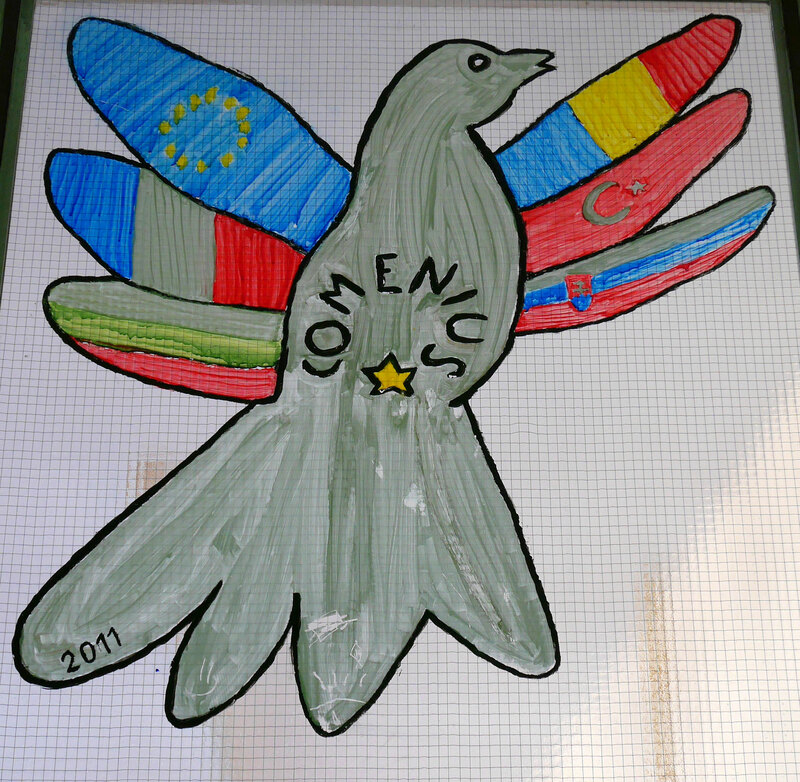 It will teach us how to live in harmony with others in the world expressing our own opinion and respecting the opinions of others, accepting differences and sharing the values of peace, liberty and equality.” ..” The learning process at the basis of the project in itself will also help our students develop the 21st Century Skills such as communication and collaboration, that is interacting and working together effectively with others towards a goal, respecting cultural differences, responding open-mindedly to different ideas and values. 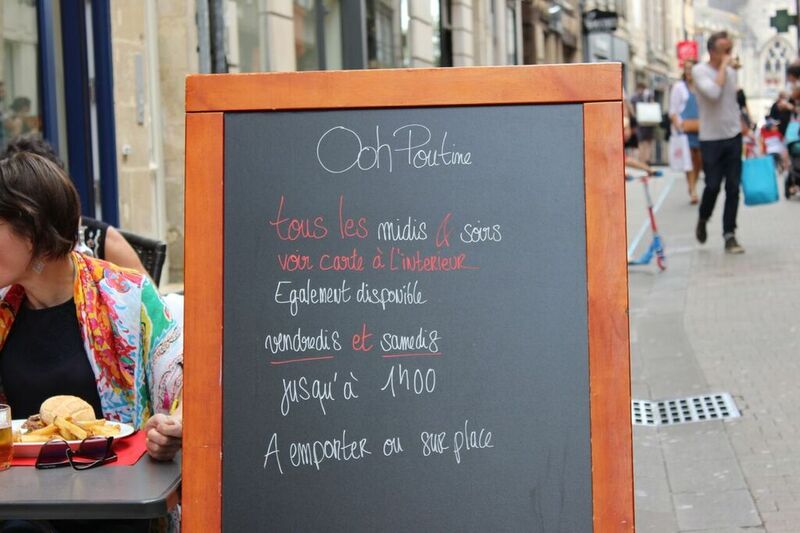 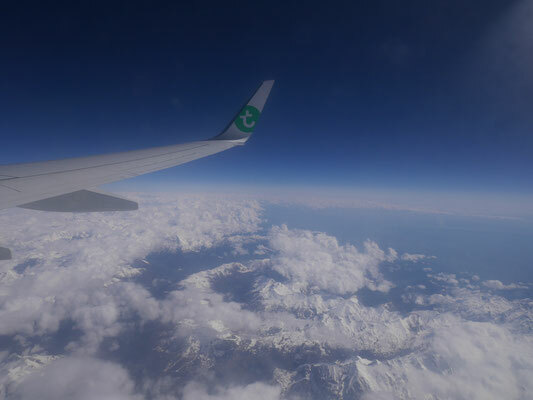 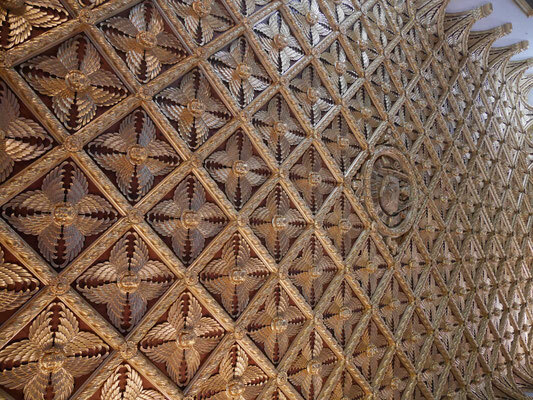 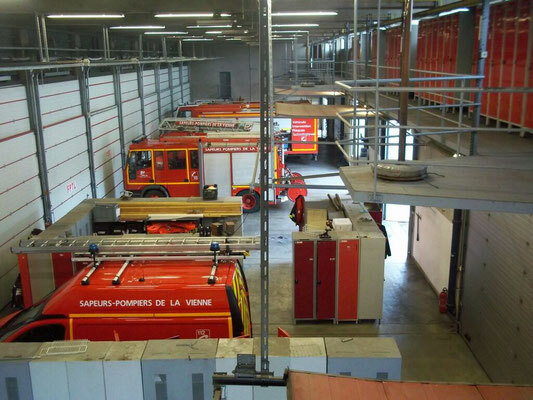 Our nationalities are different and we speak different languages, but we share the same roof, Europe, our continent! 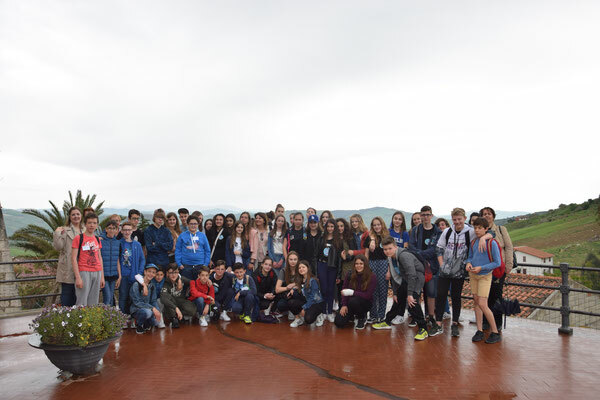 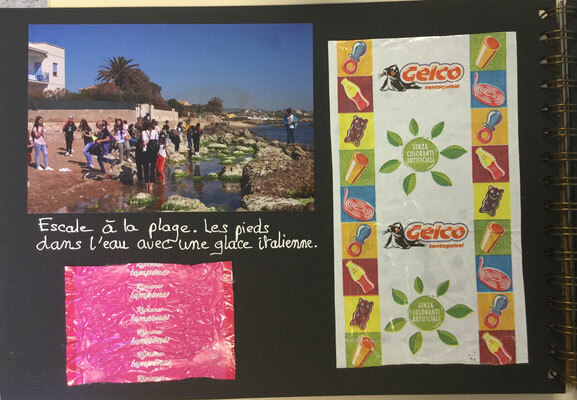 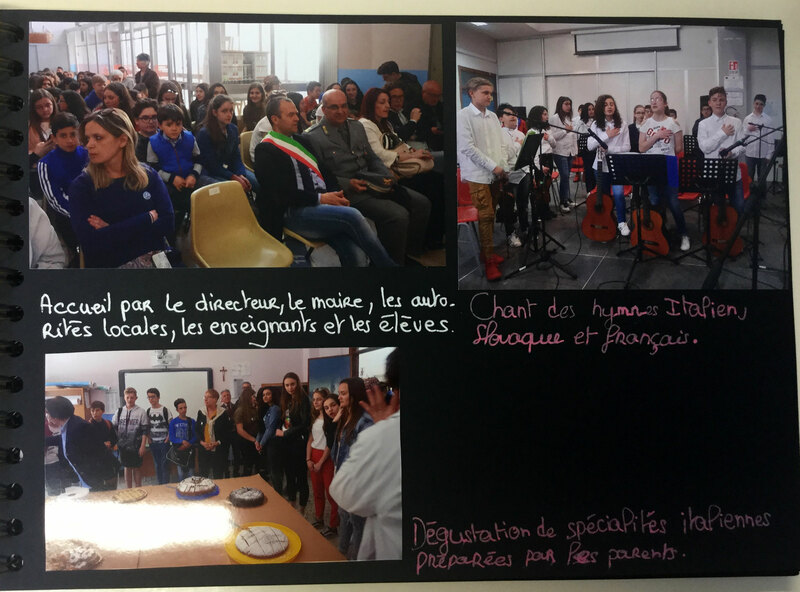 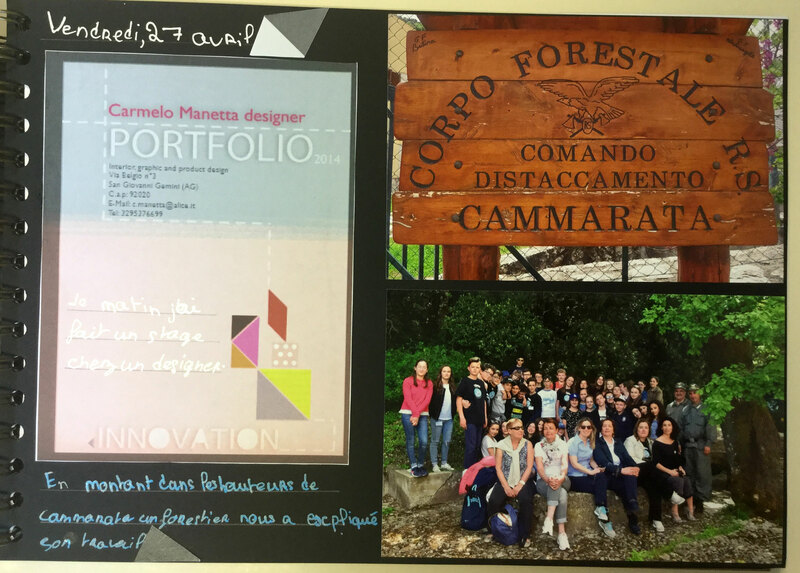 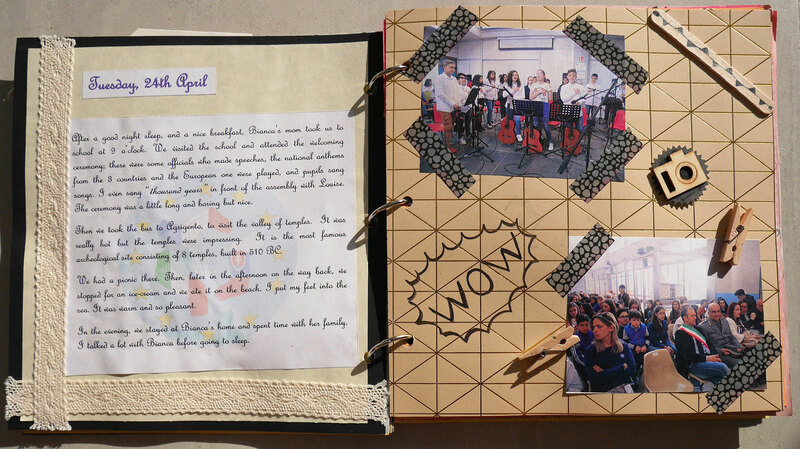 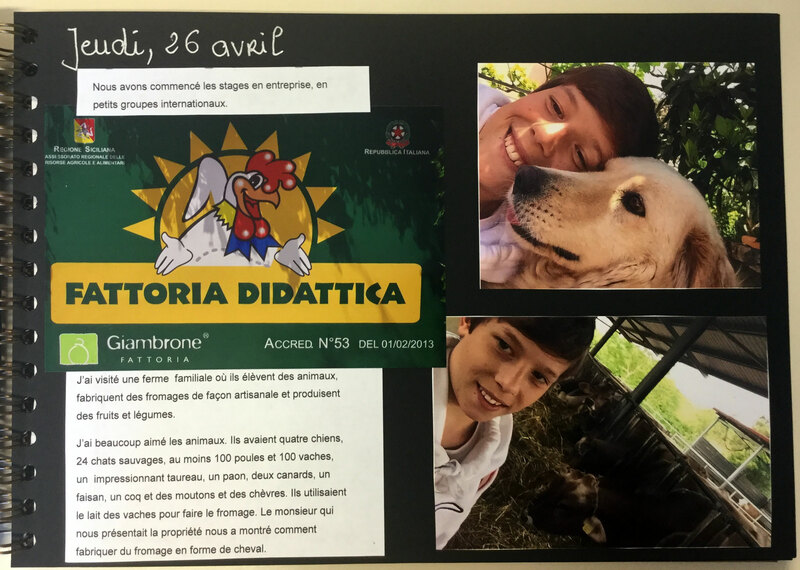 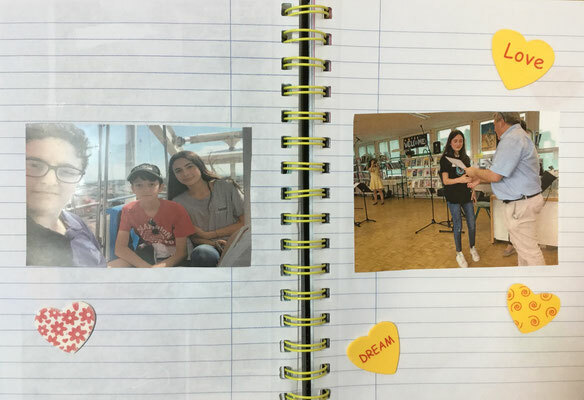 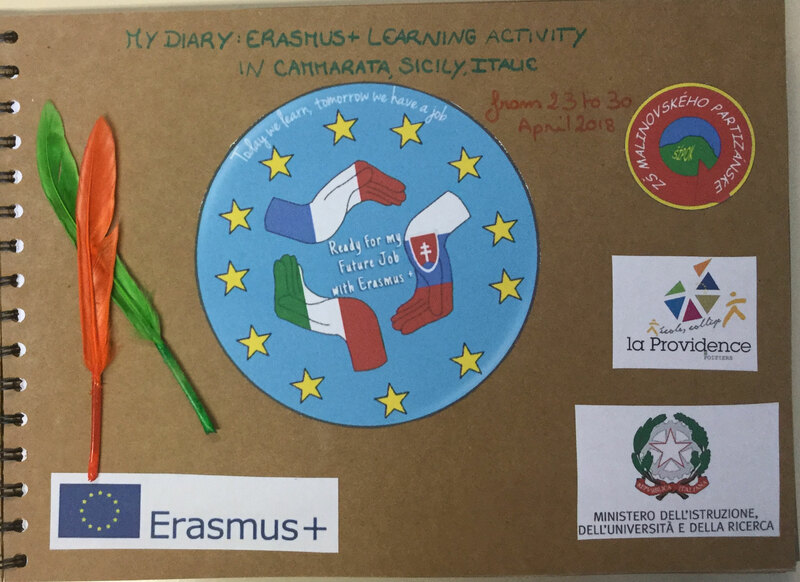 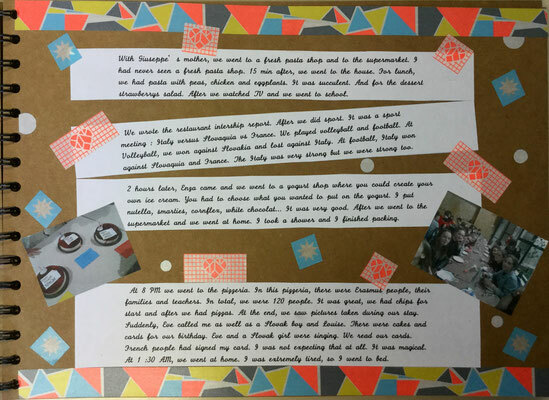 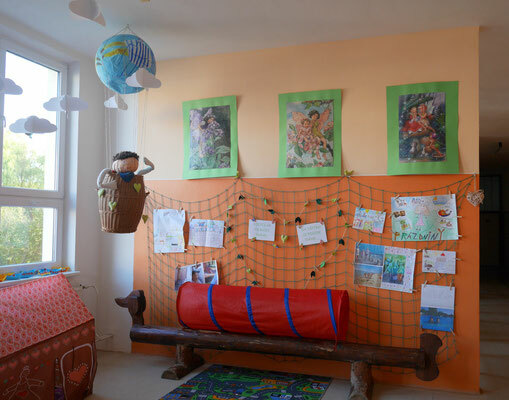 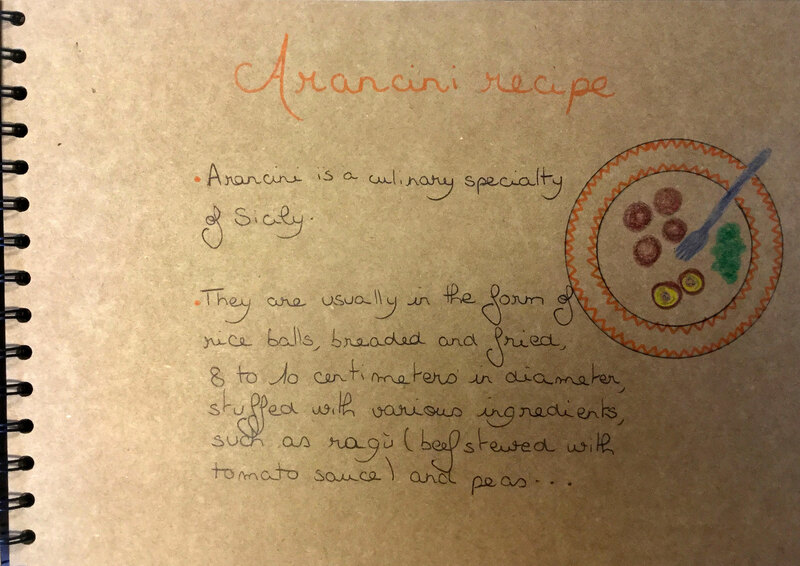 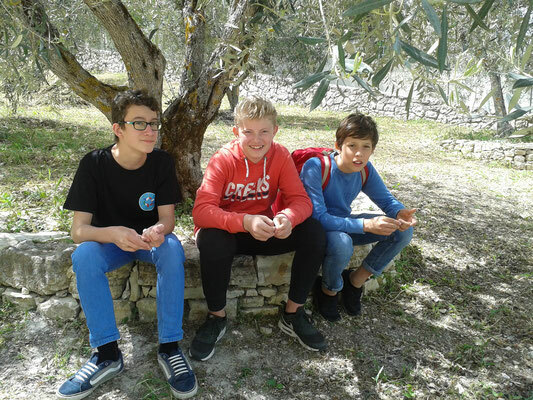 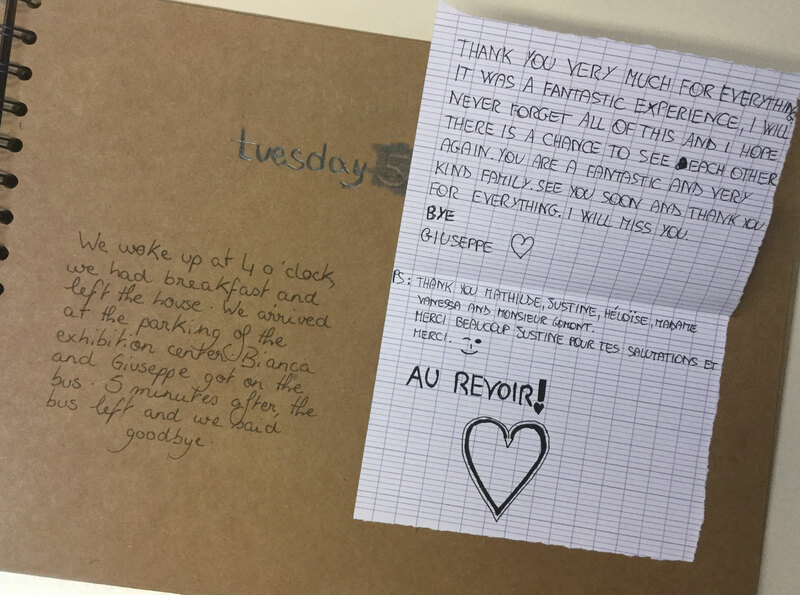 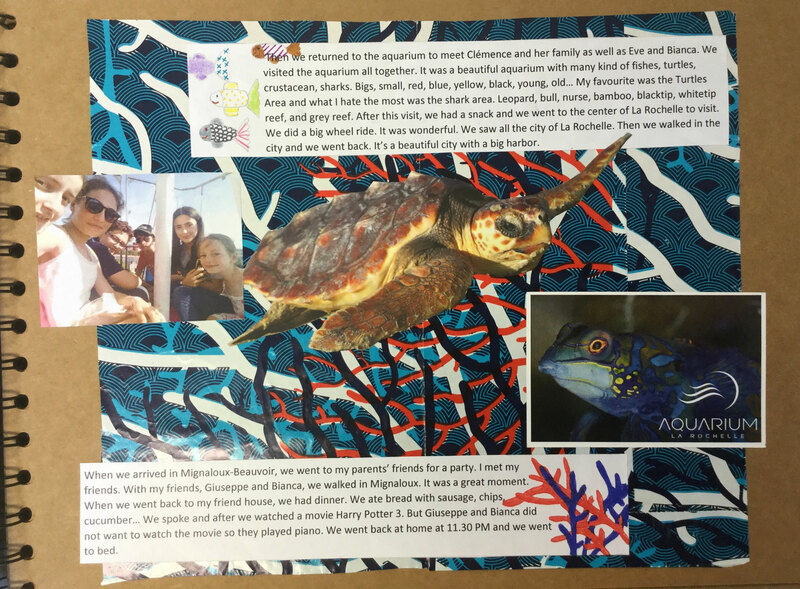 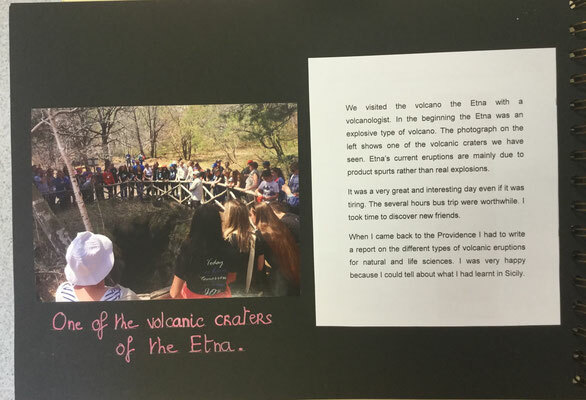 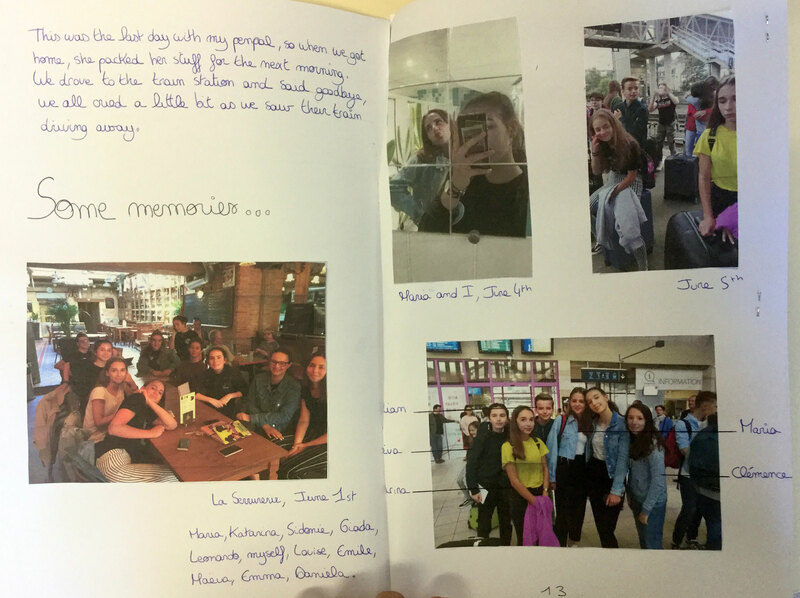 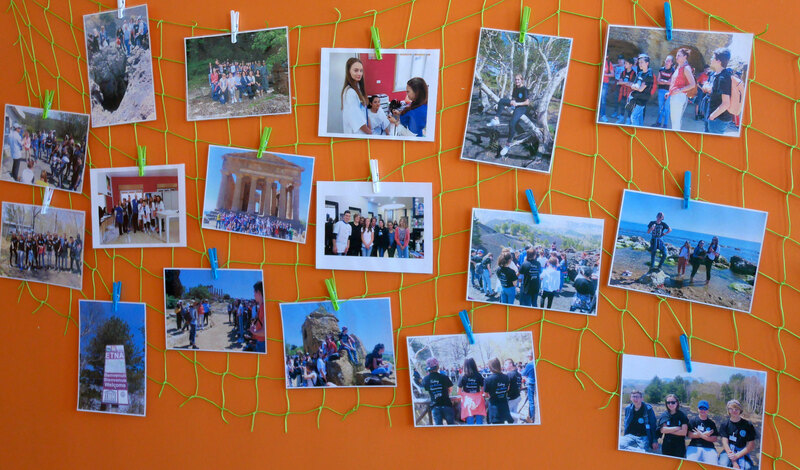 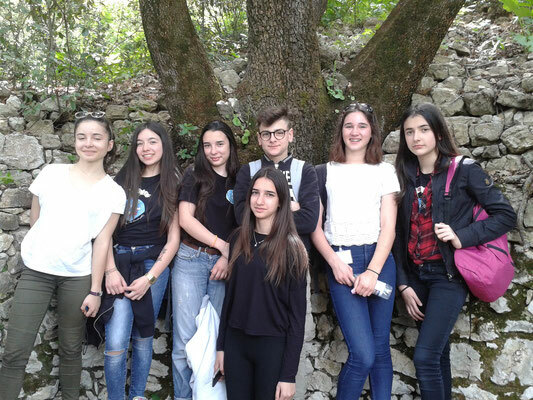 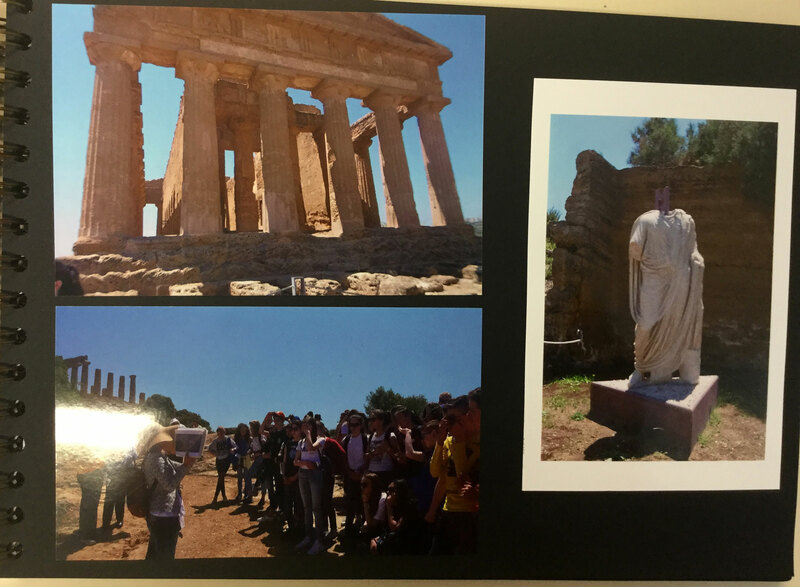 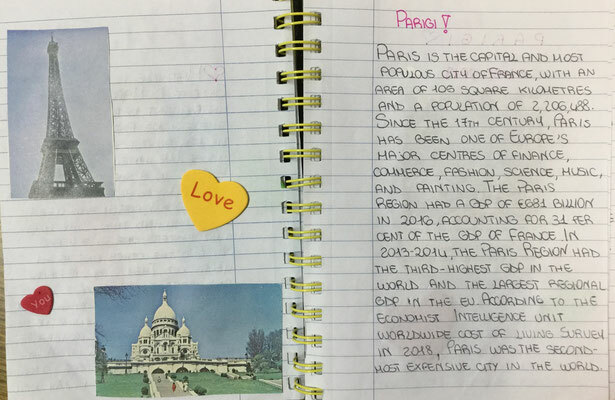 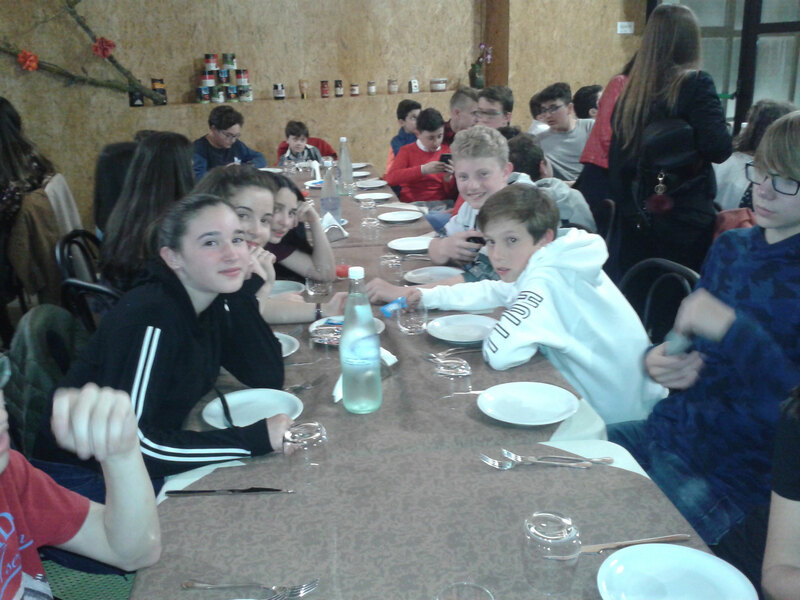 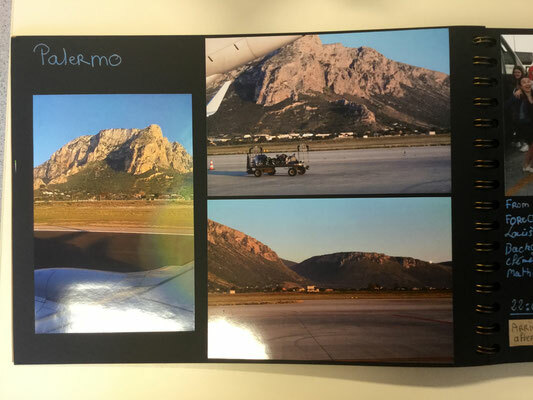 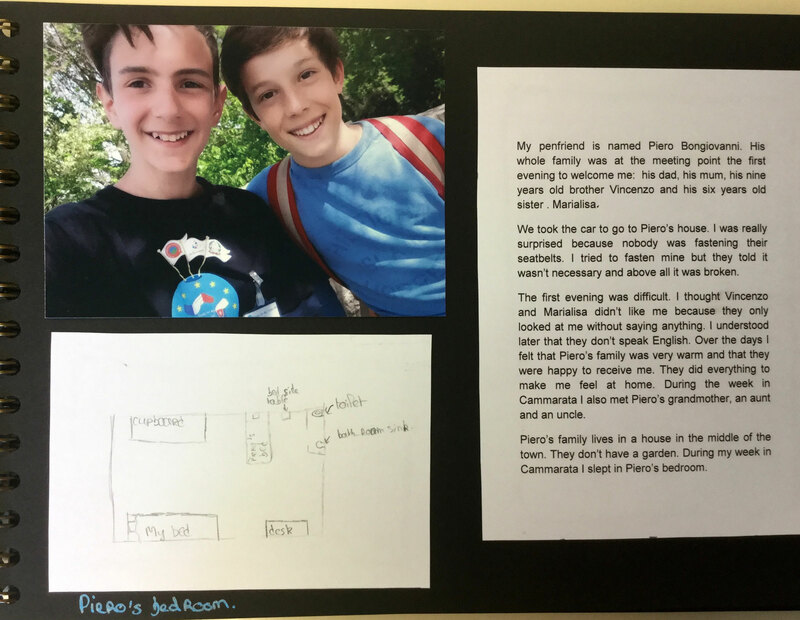 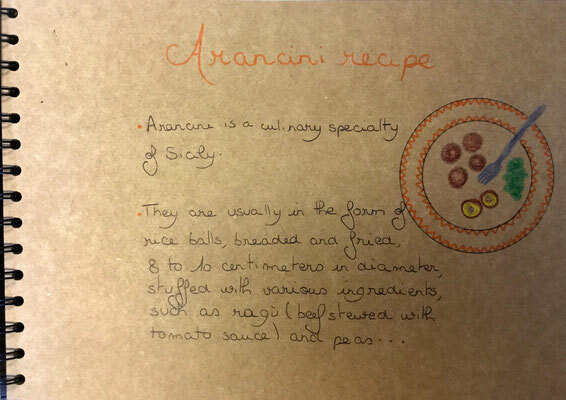 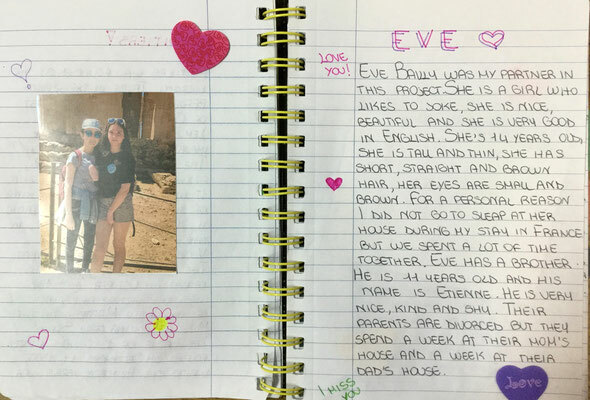 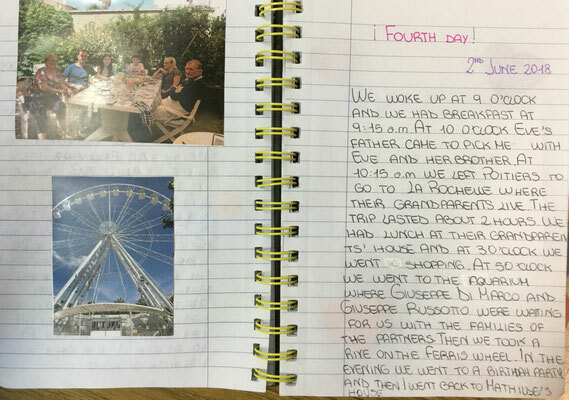 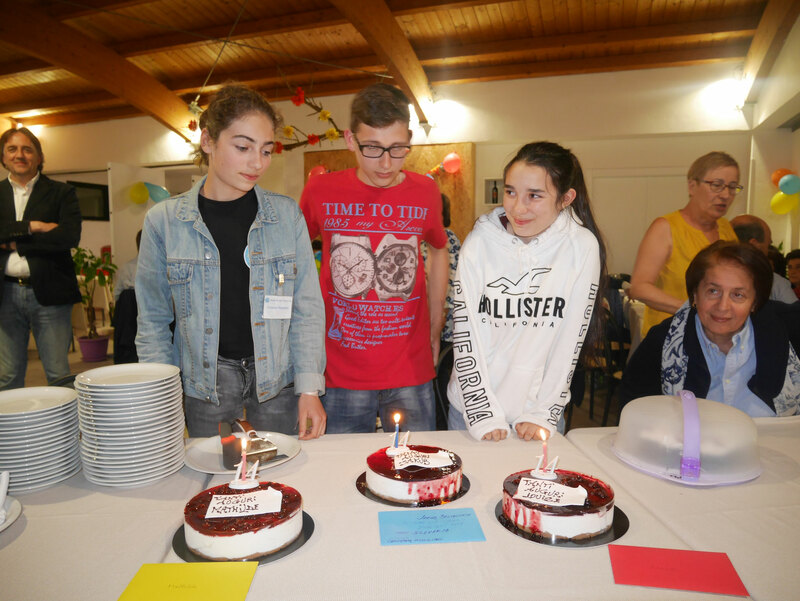 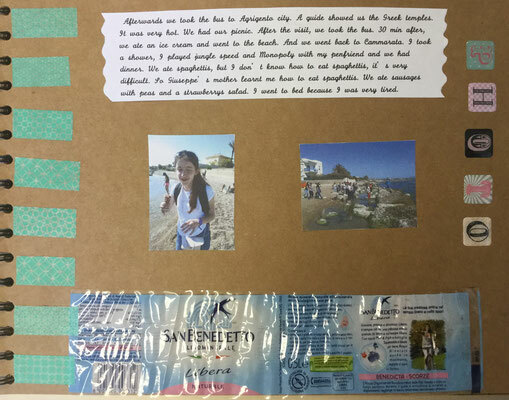 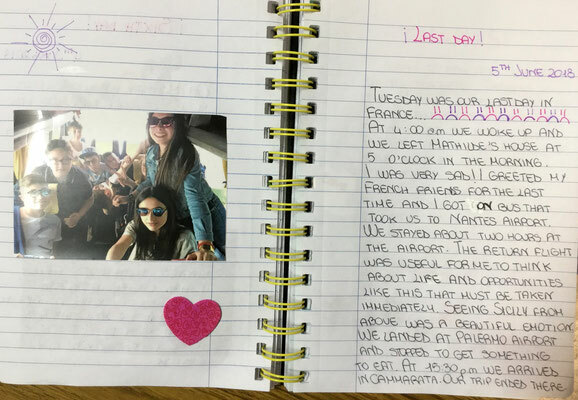 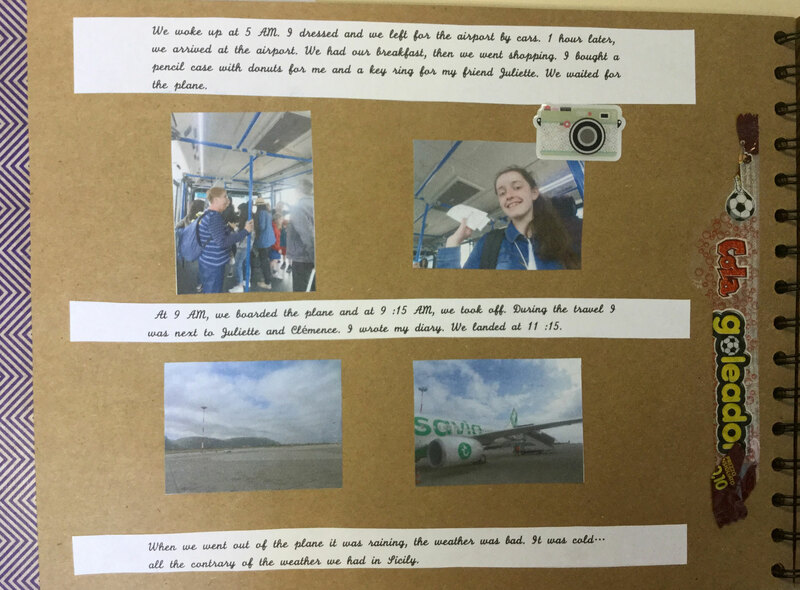 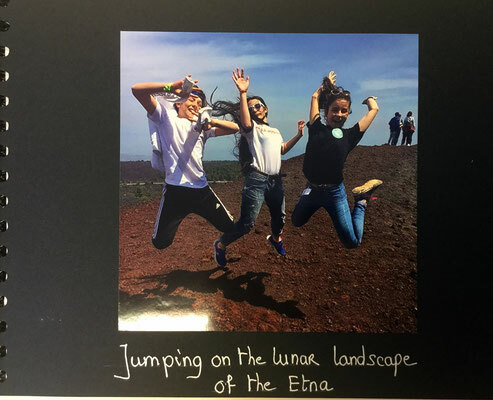 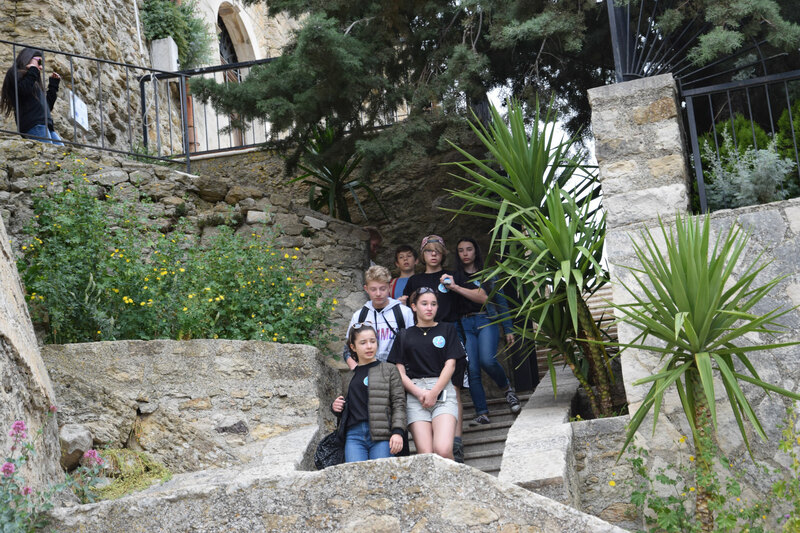 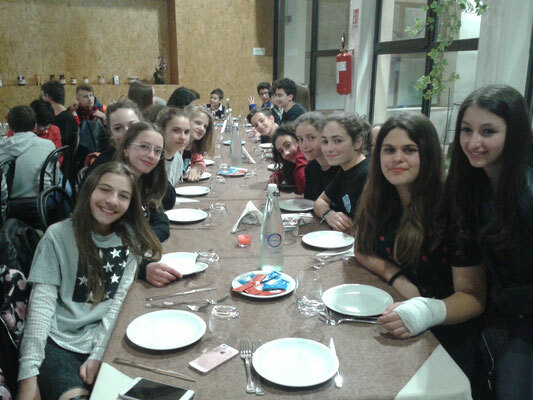 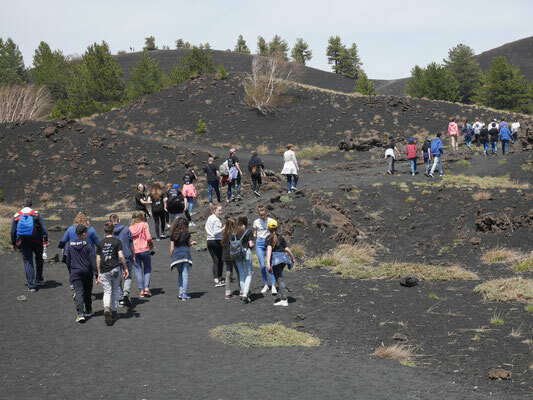 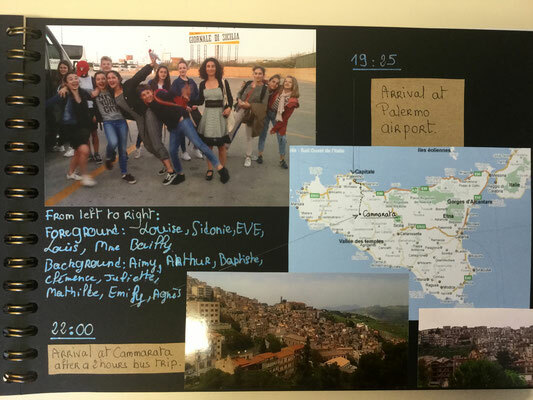 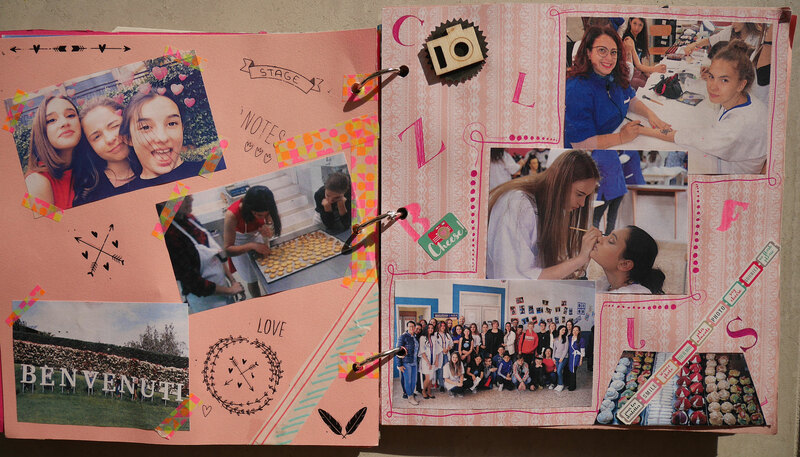 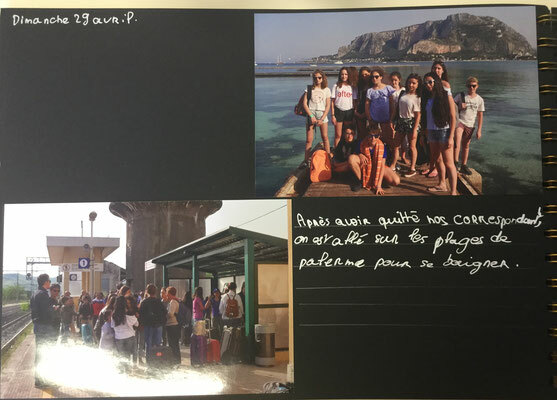 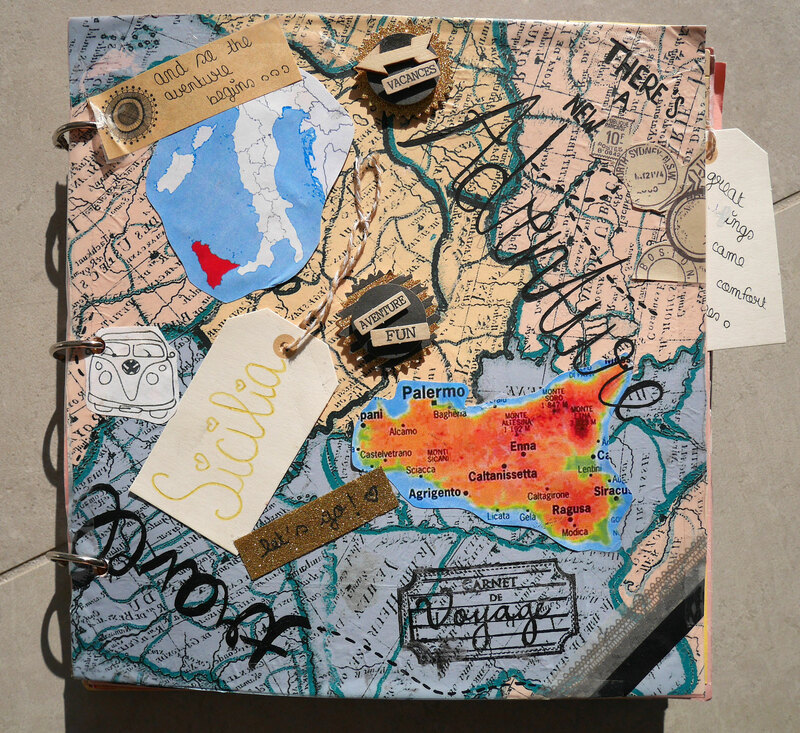 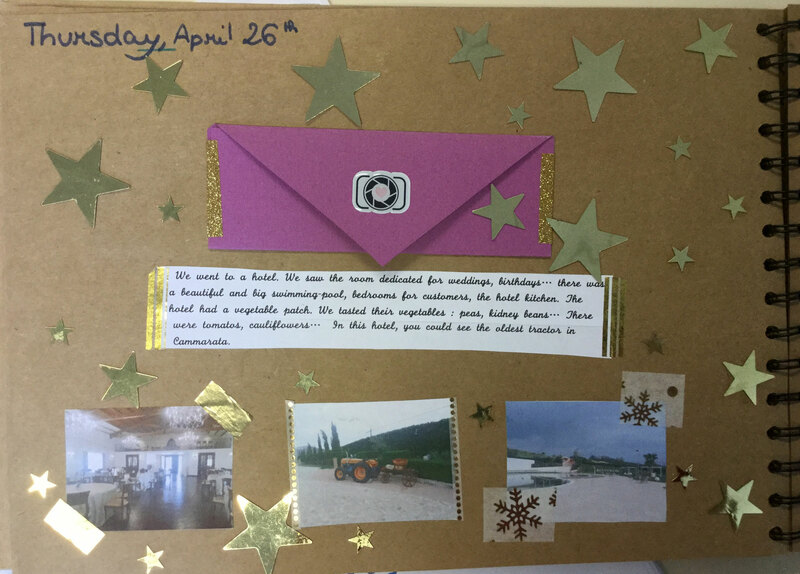 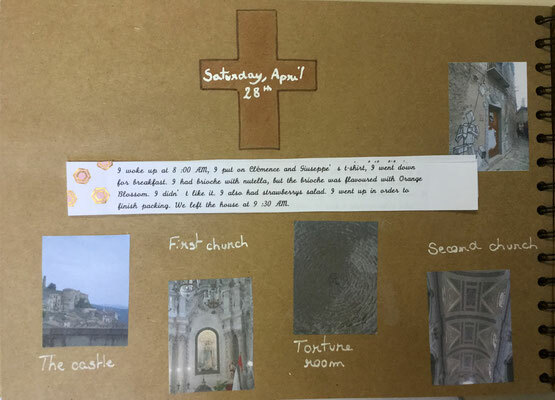 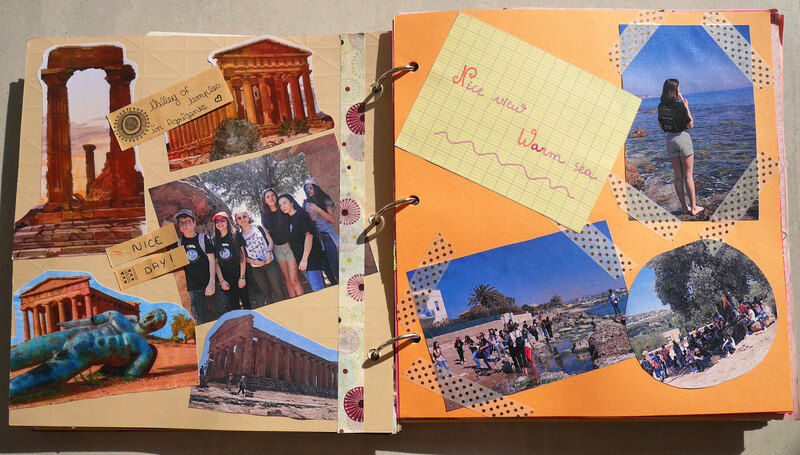 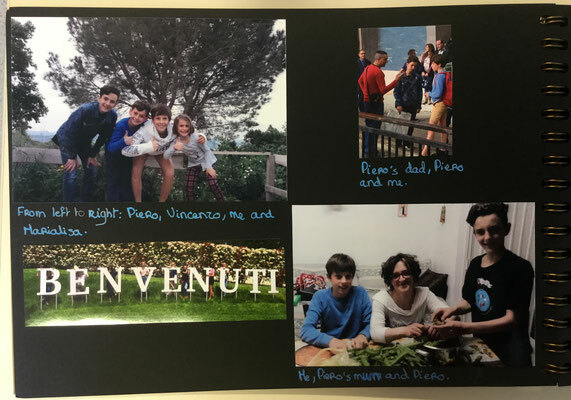 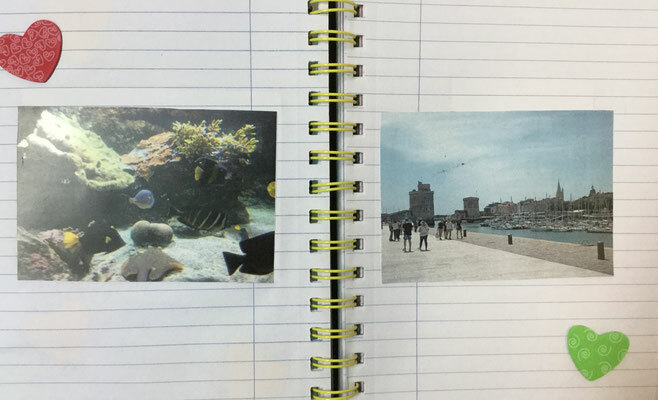 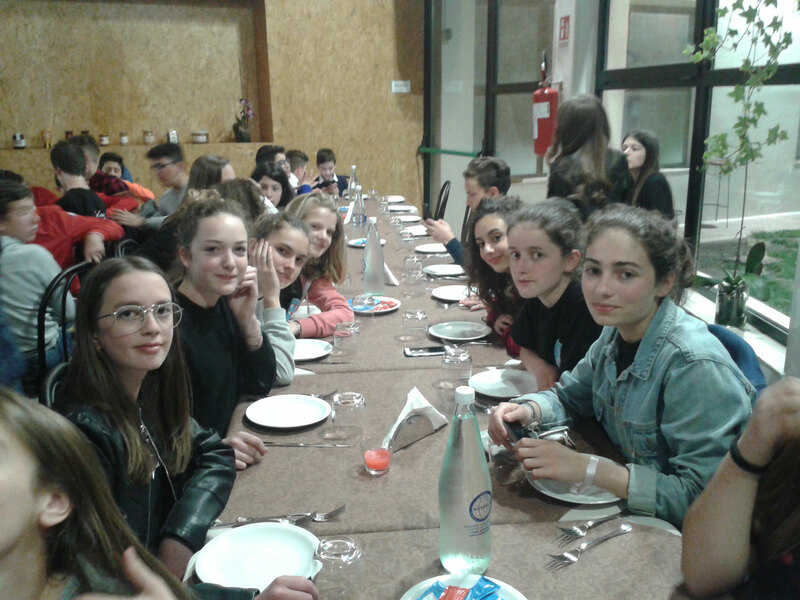 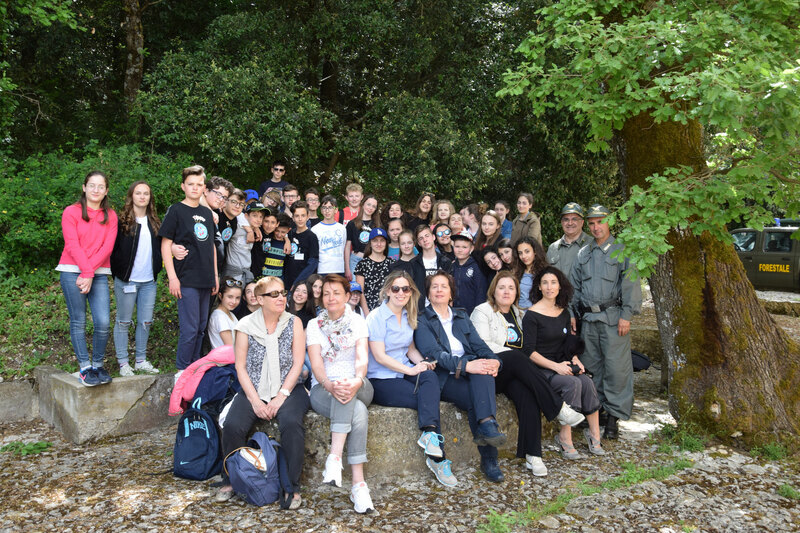 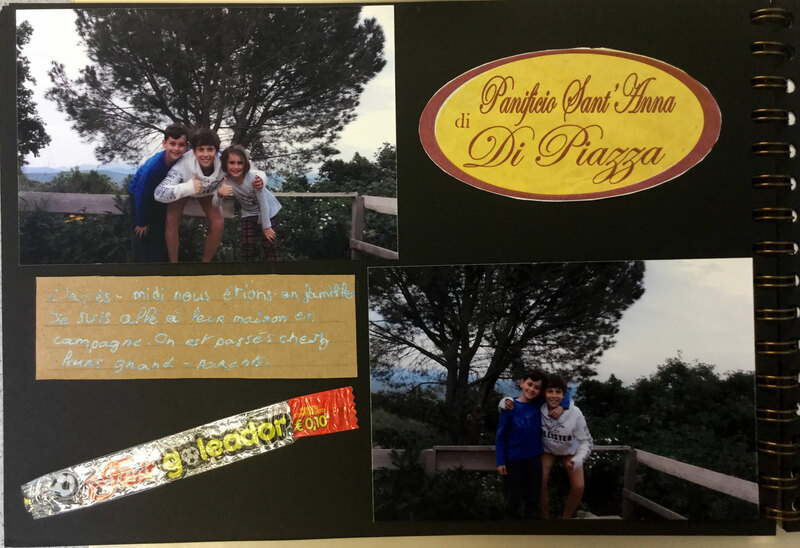 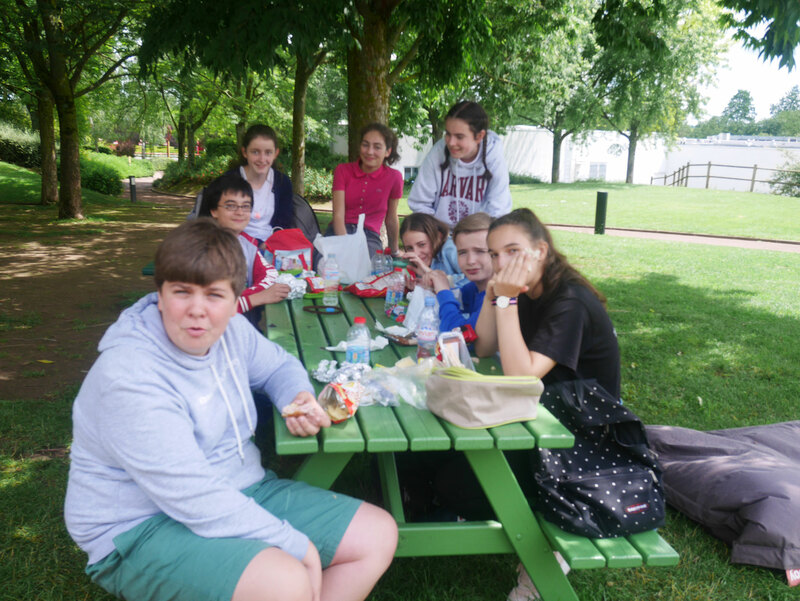 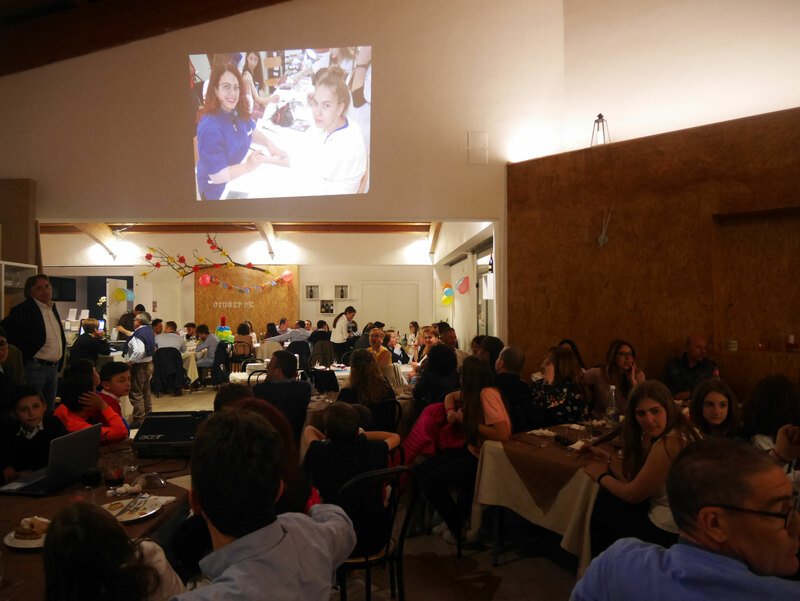 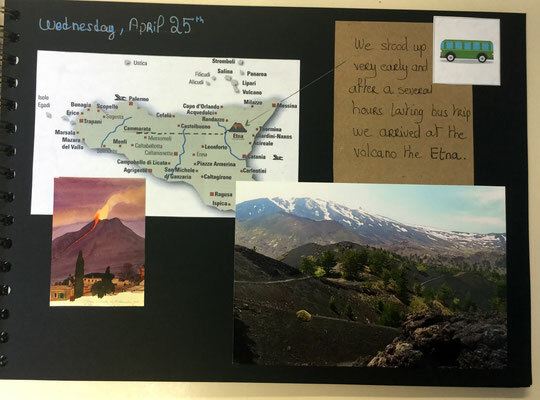 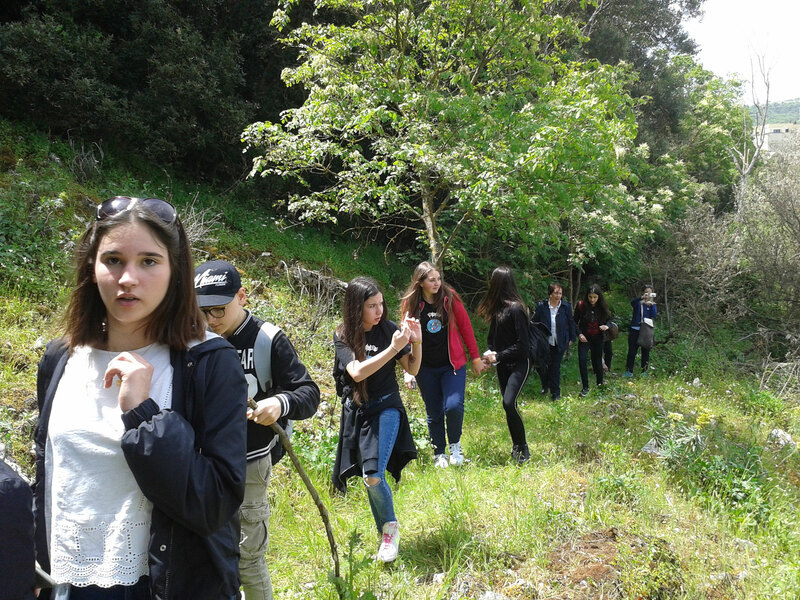 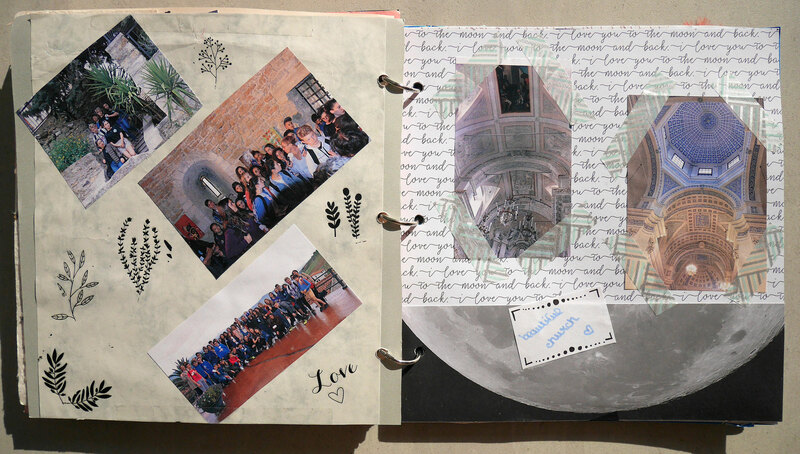 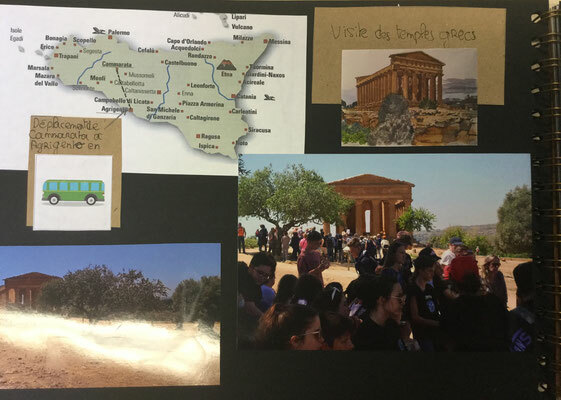 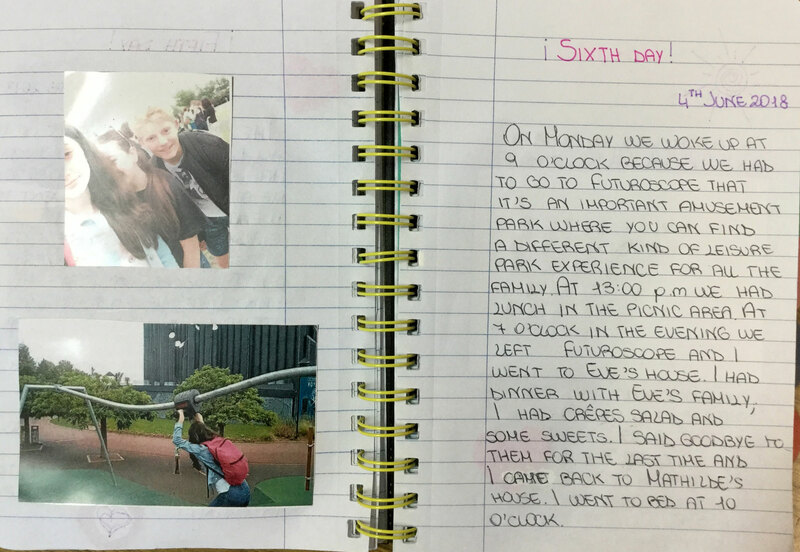 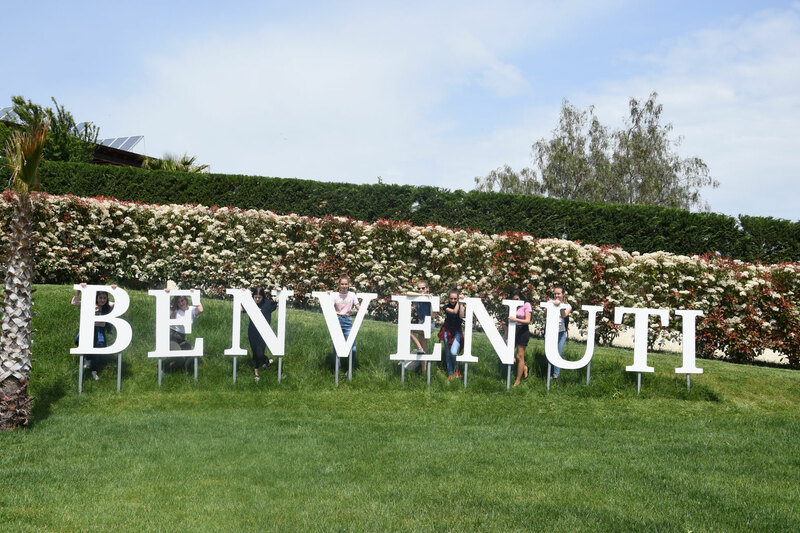 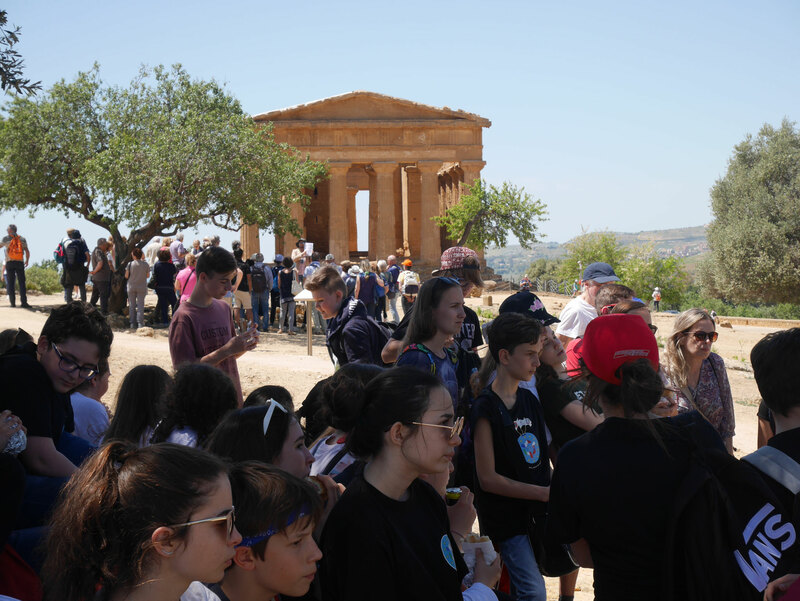 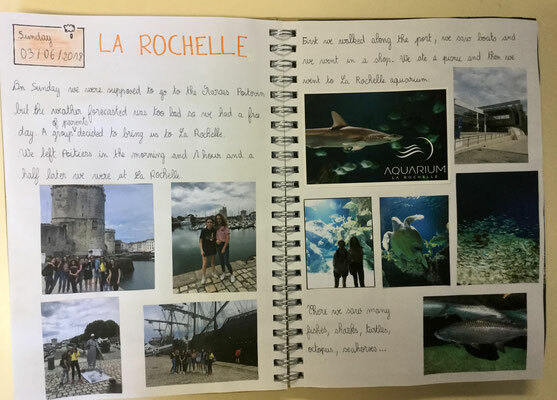 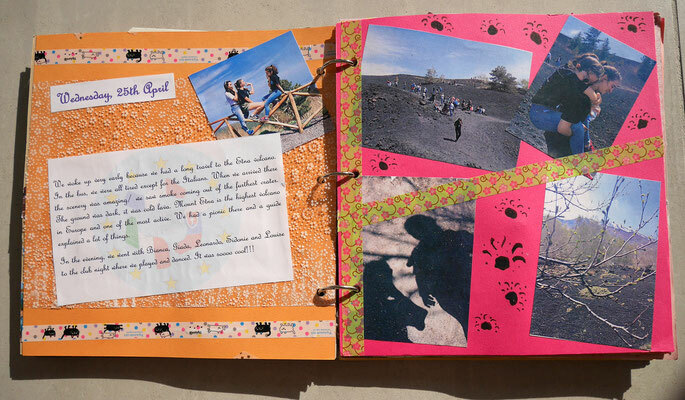 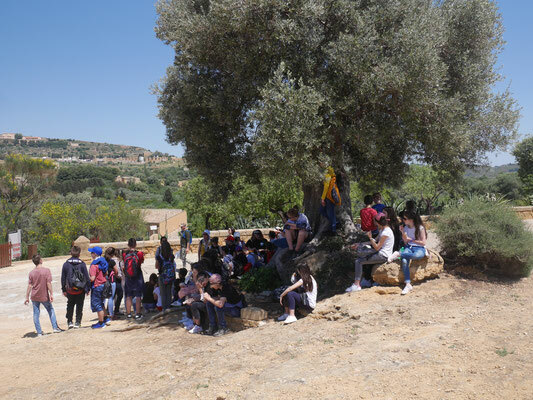 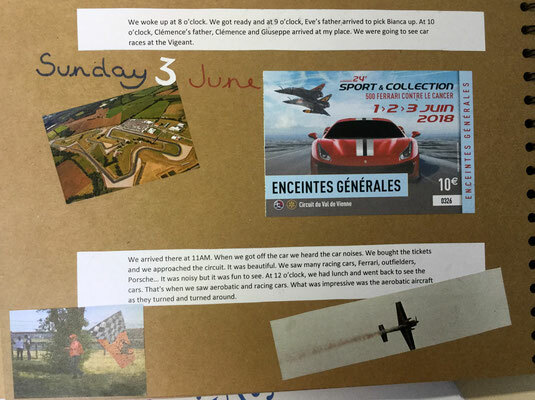 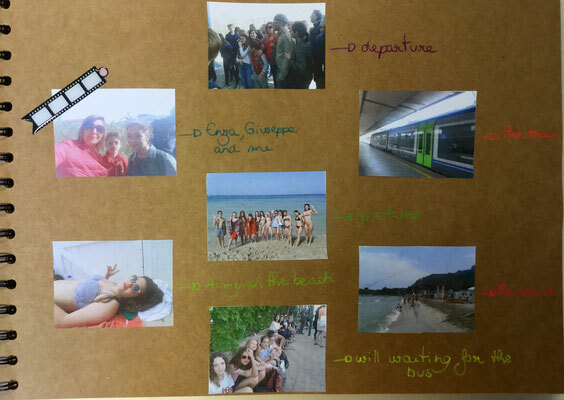 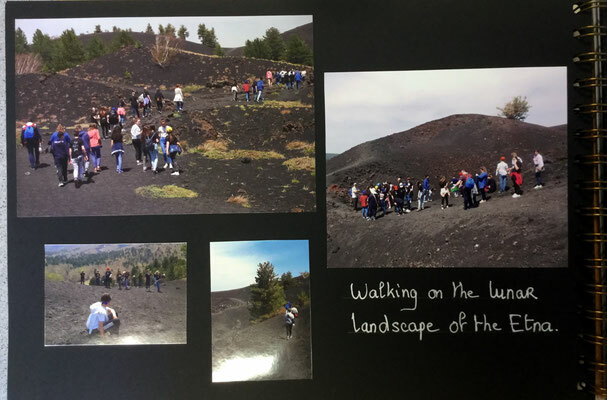 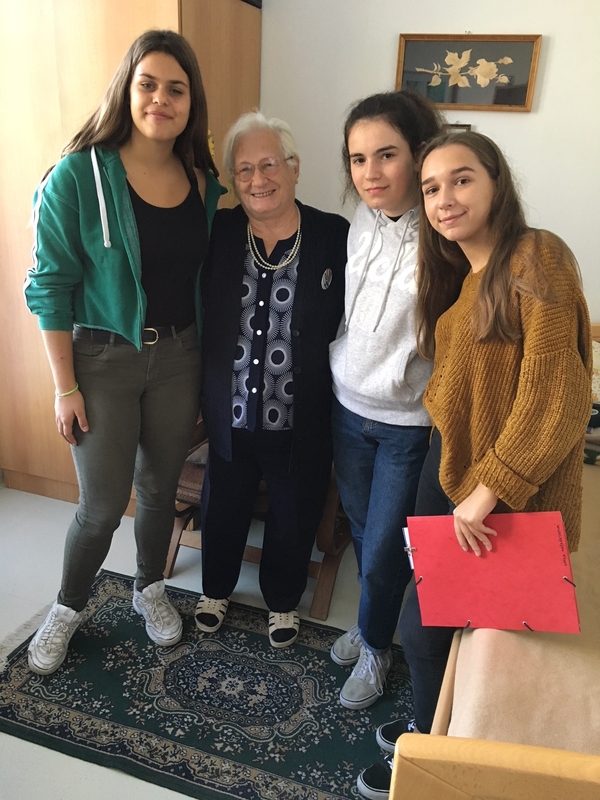 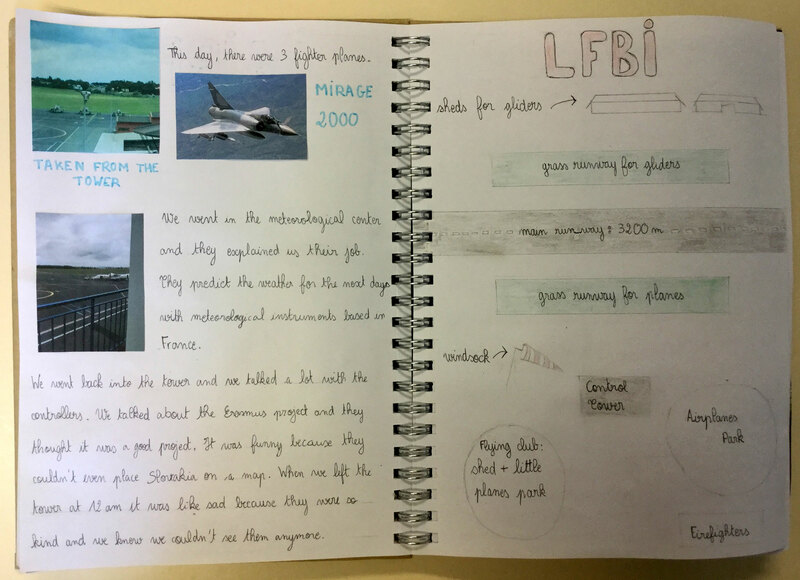 Pupils prepared travel diaries during the Teaching/Learning and Training Activity in Cammarata, where they wrote about activities, internships, visits, experiences, host families, partners, feelings, impressions…. 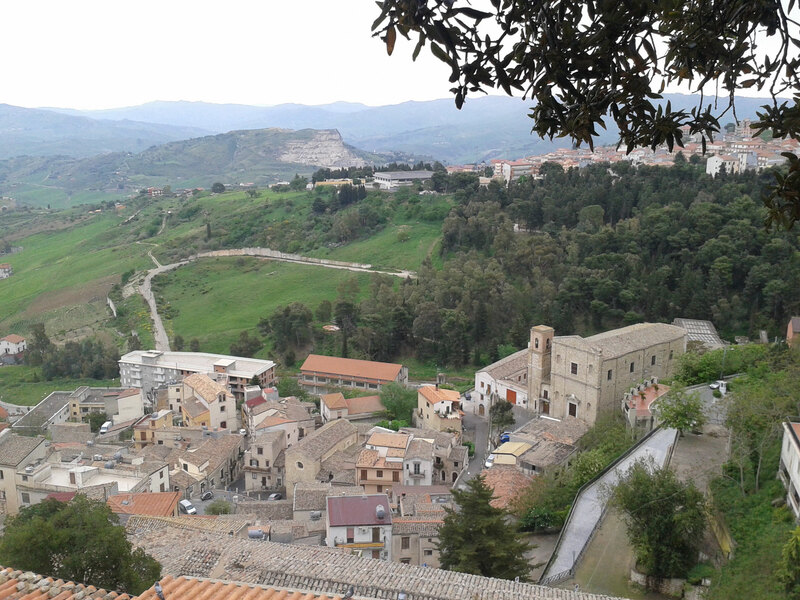 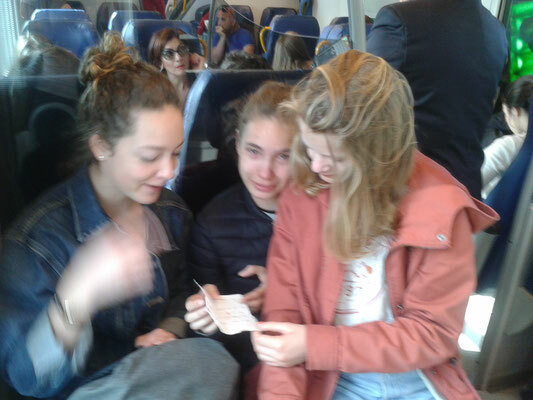 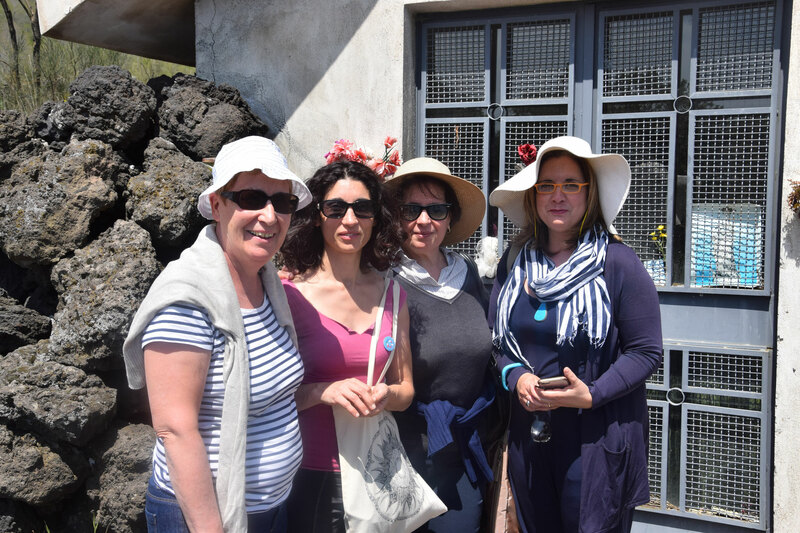 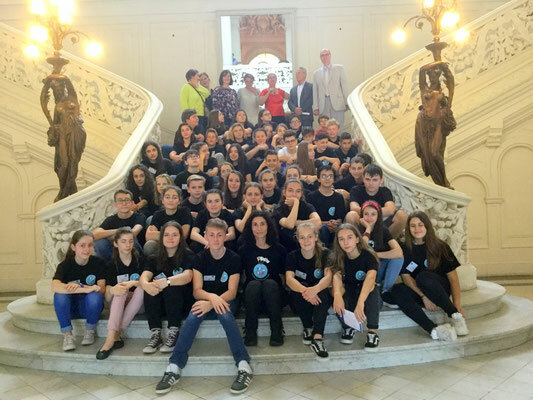 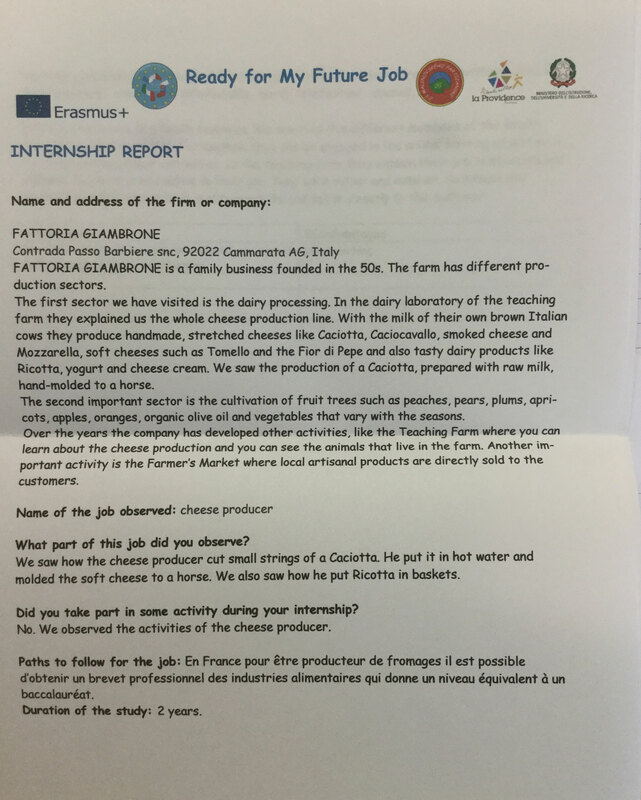 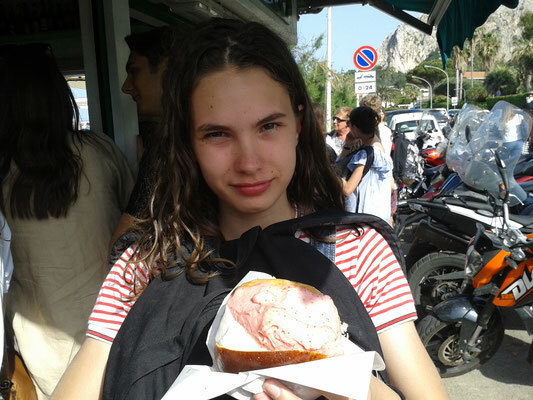 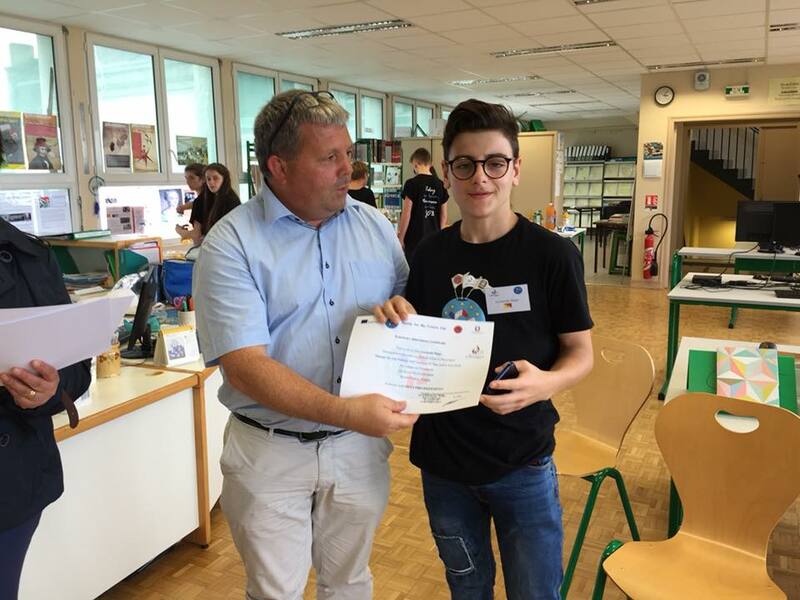 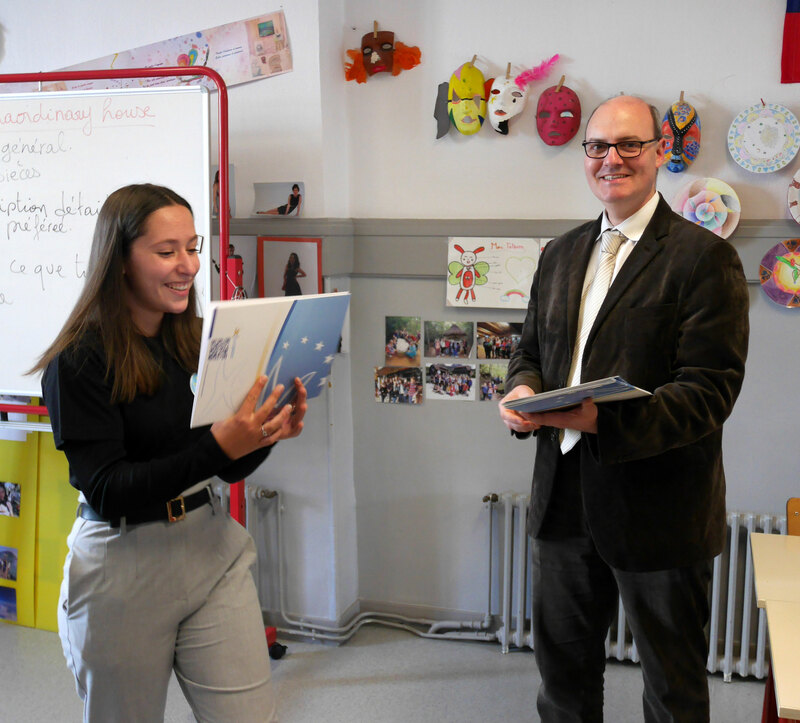 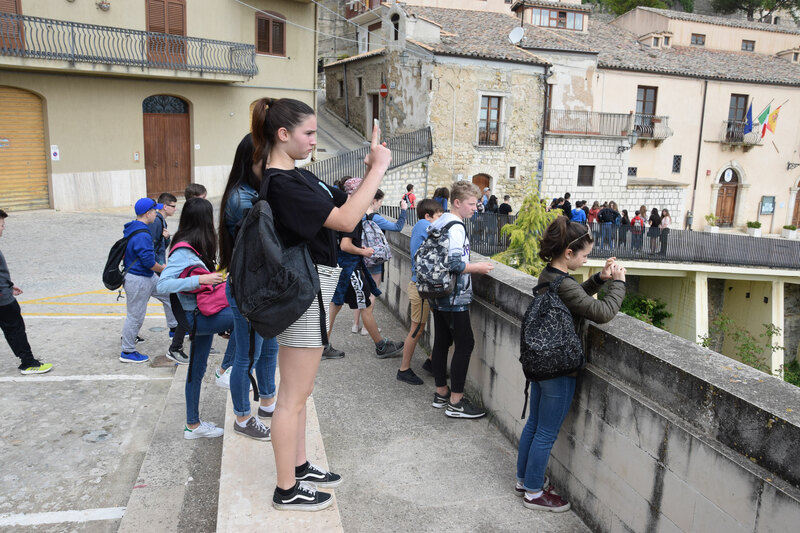 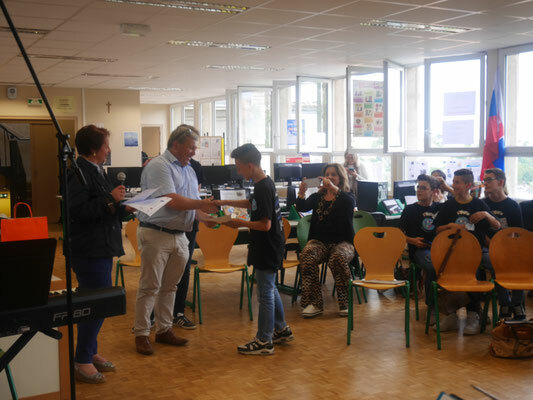 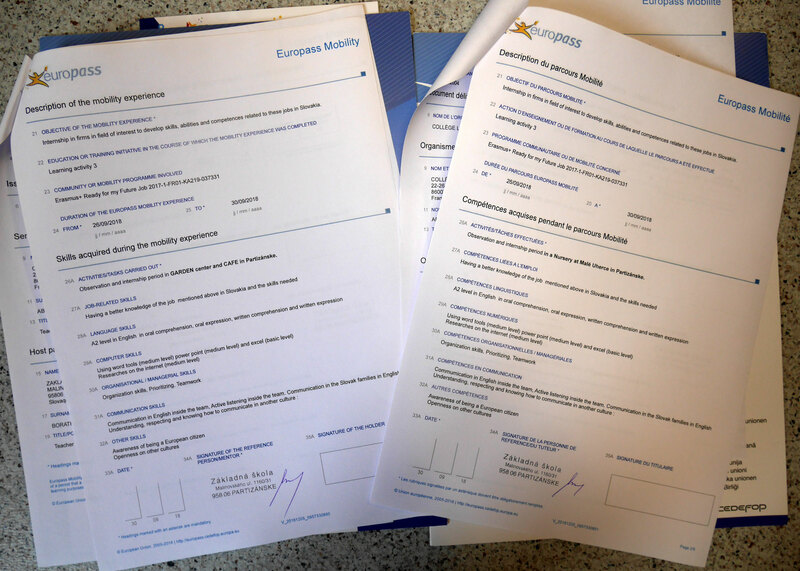 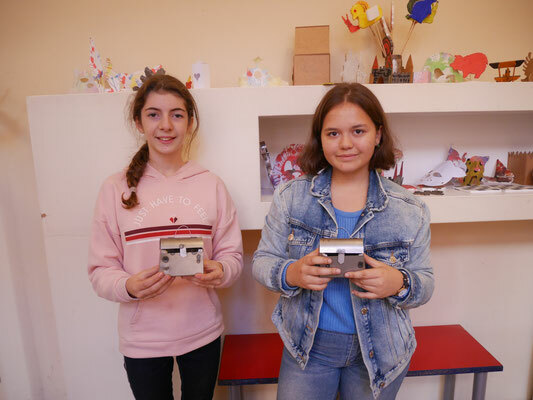 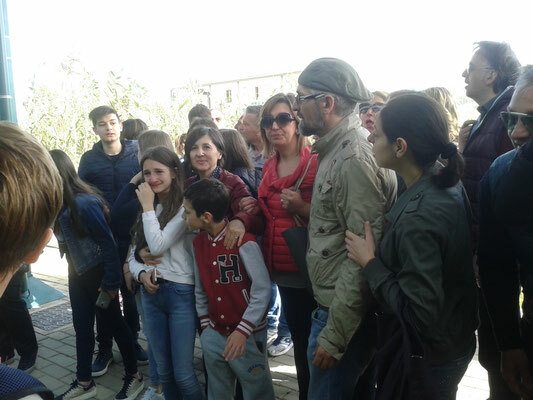 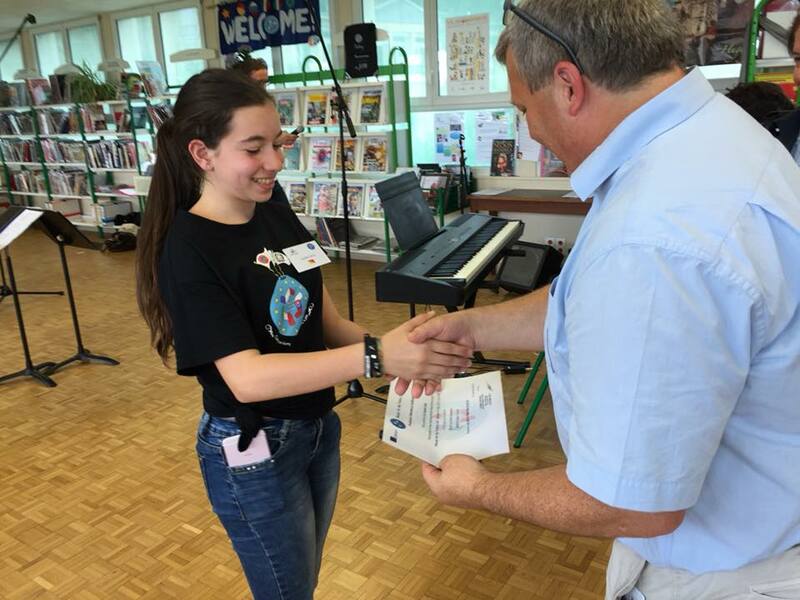 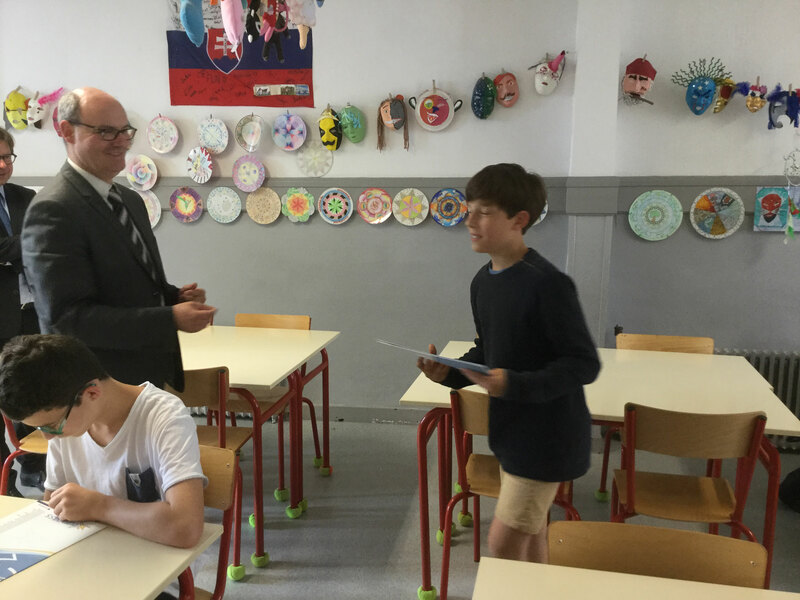 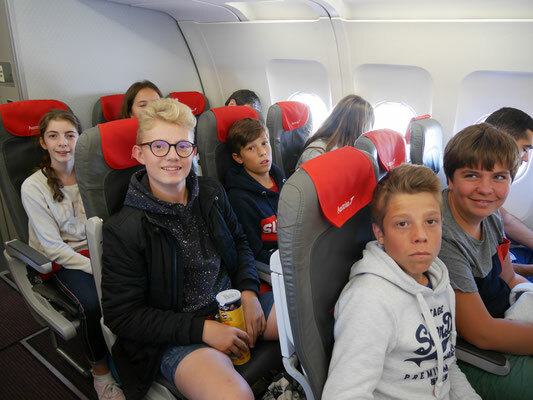 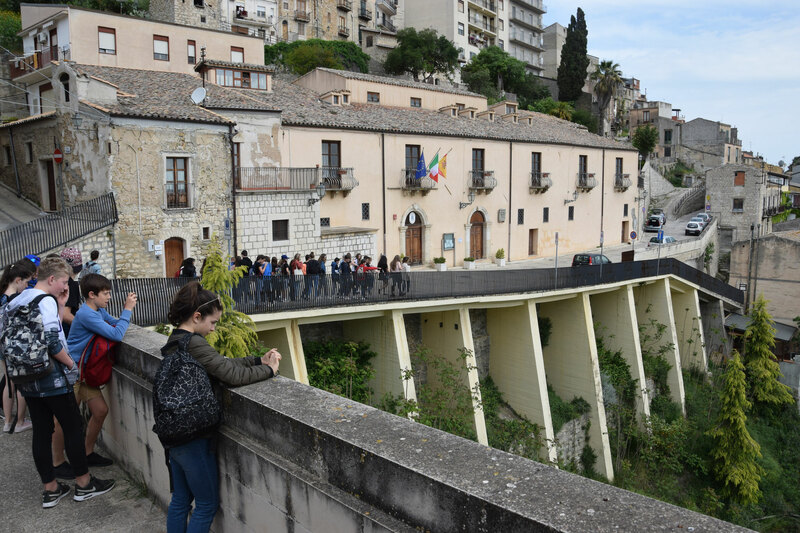 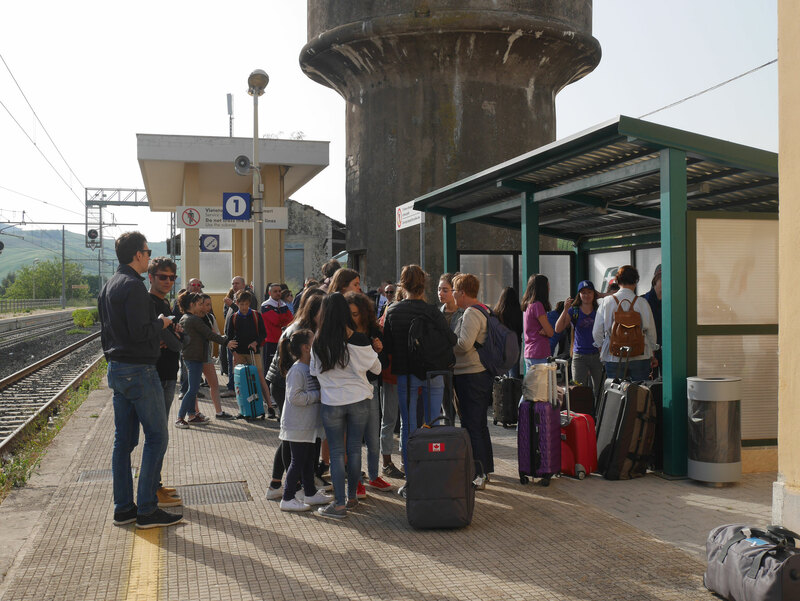 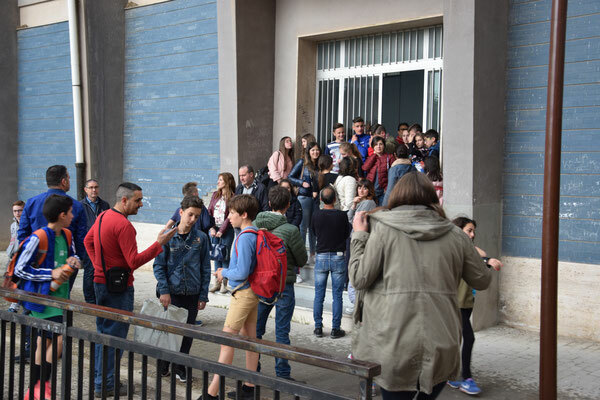 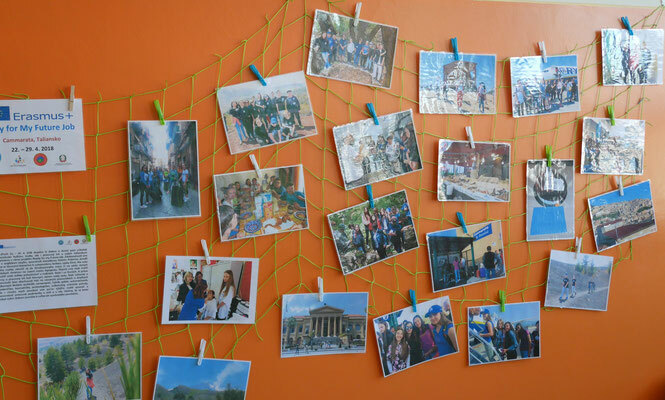 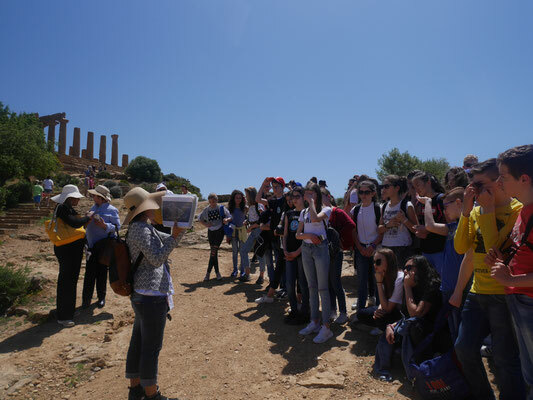 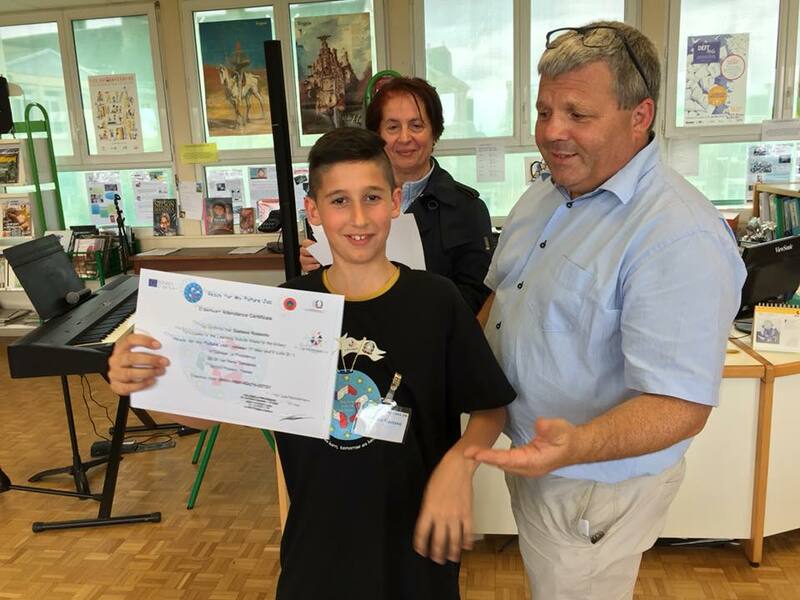 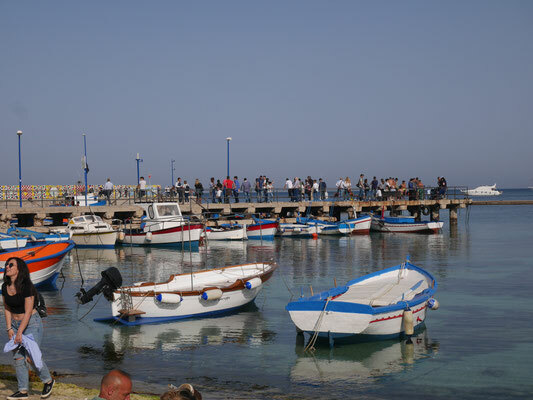 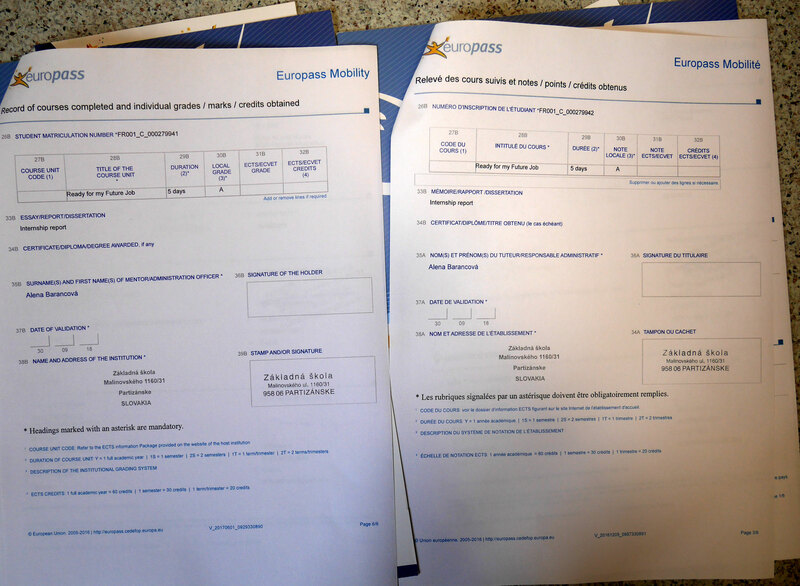 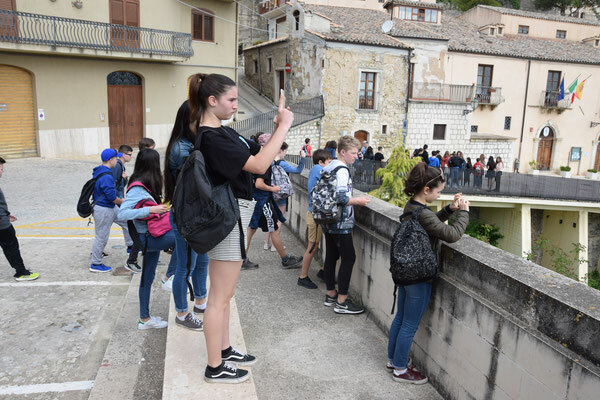 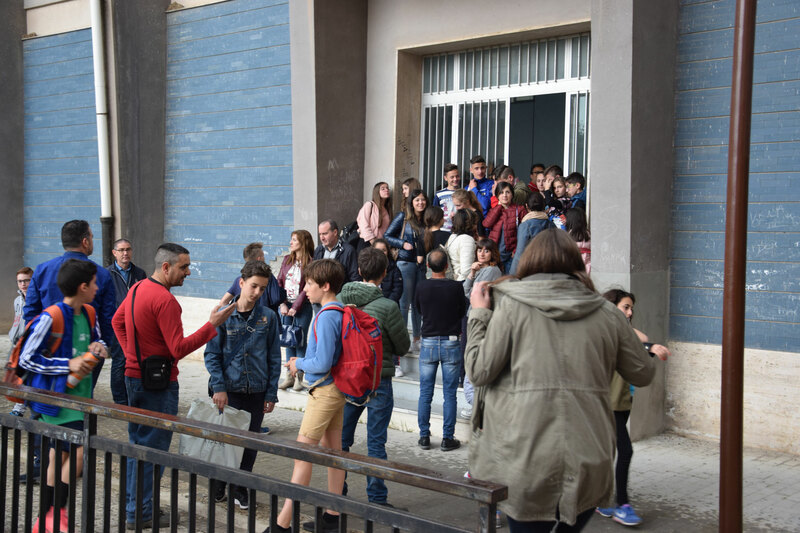 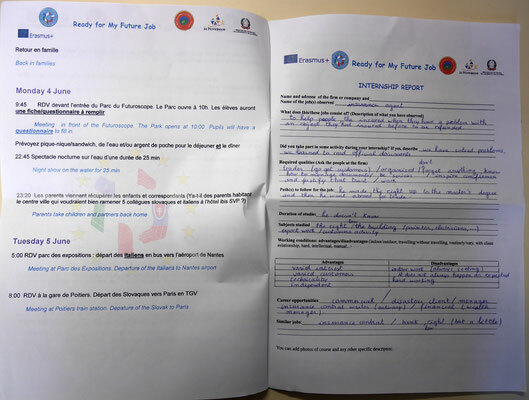 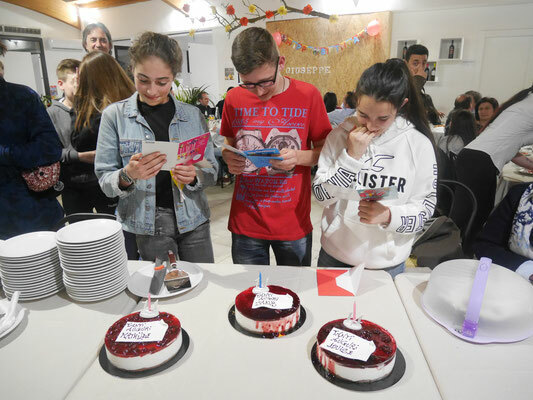 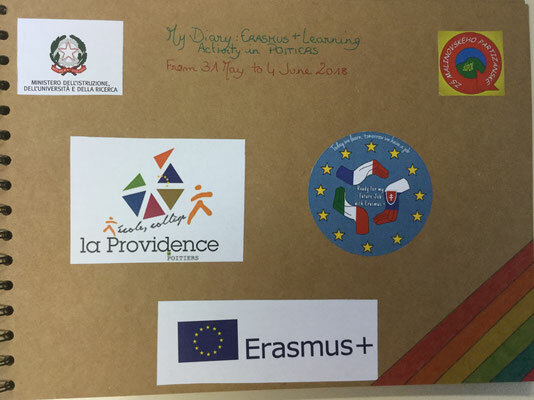 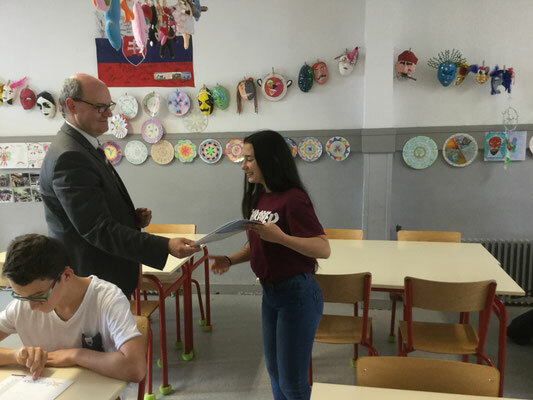 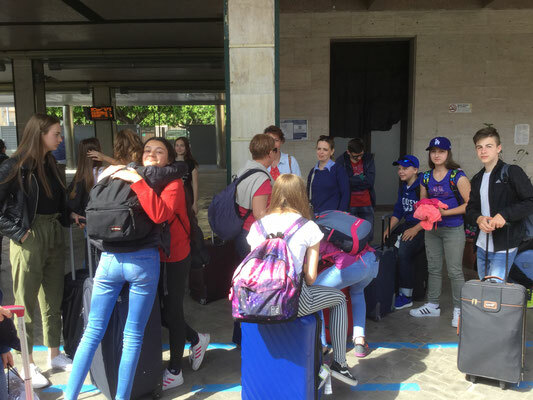 At the end of June, the director of La Providence School gave Erasmus+ pupils their official Europass Mobilities they had previously obtained in Sicily after their internships there. 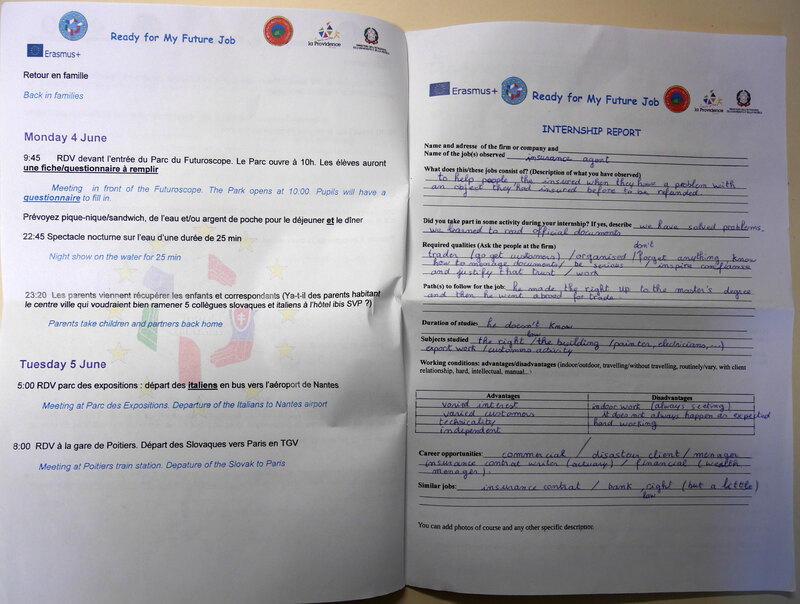 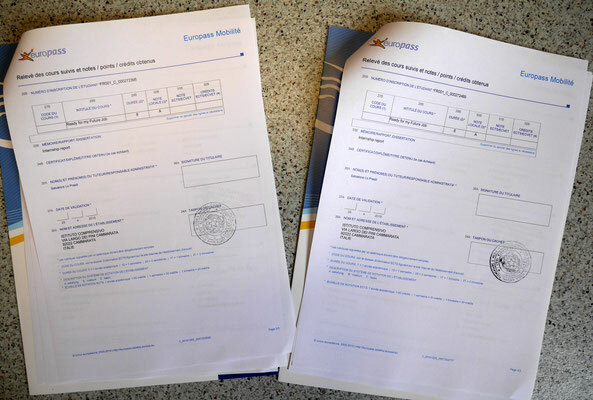 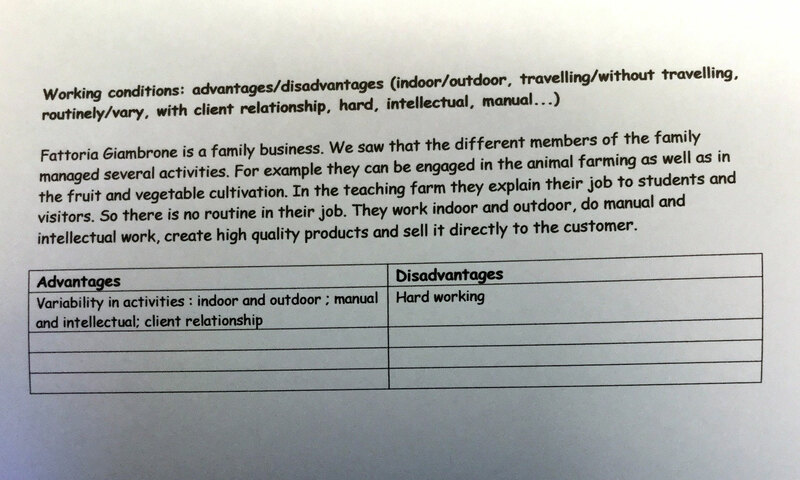 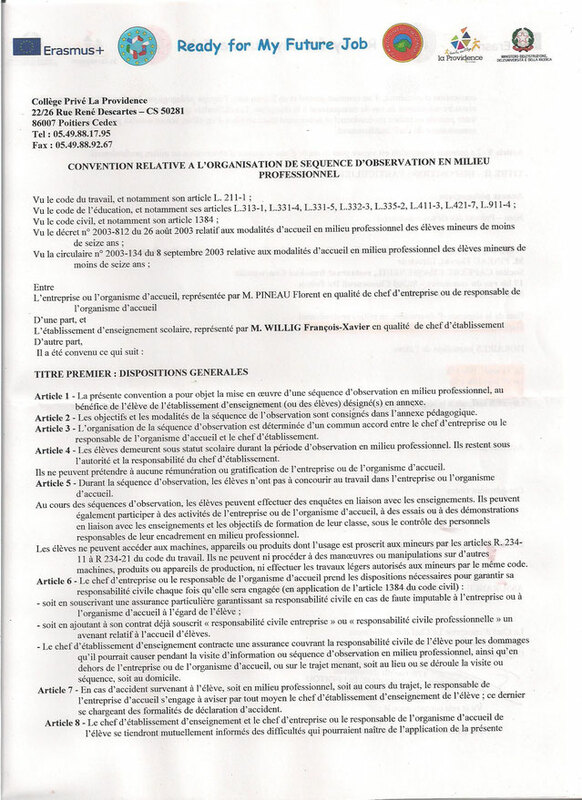 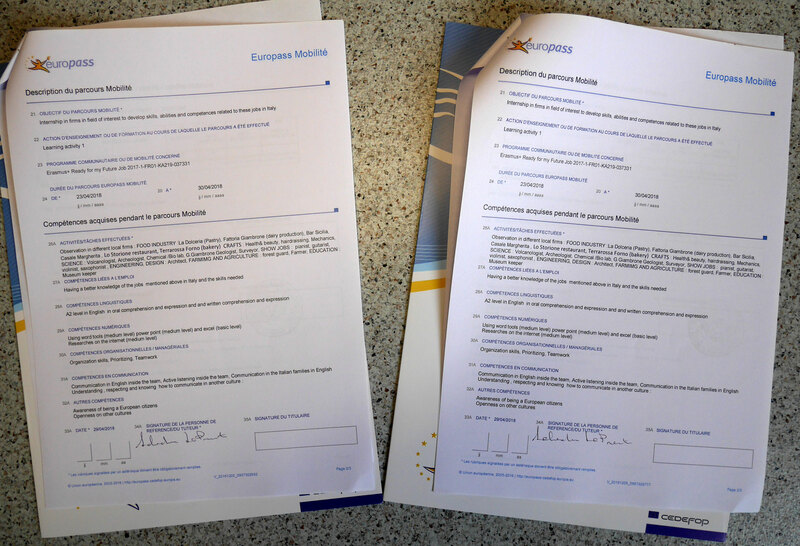 It is an official document that records knowledge and skills acquired by pupils in another European country.